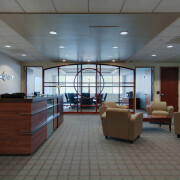 Welcome to the Vantage Portfolio. 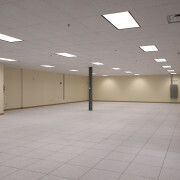 Click on a portfolio item to view more details. 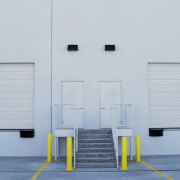 Sort the Portfolio below by project type. 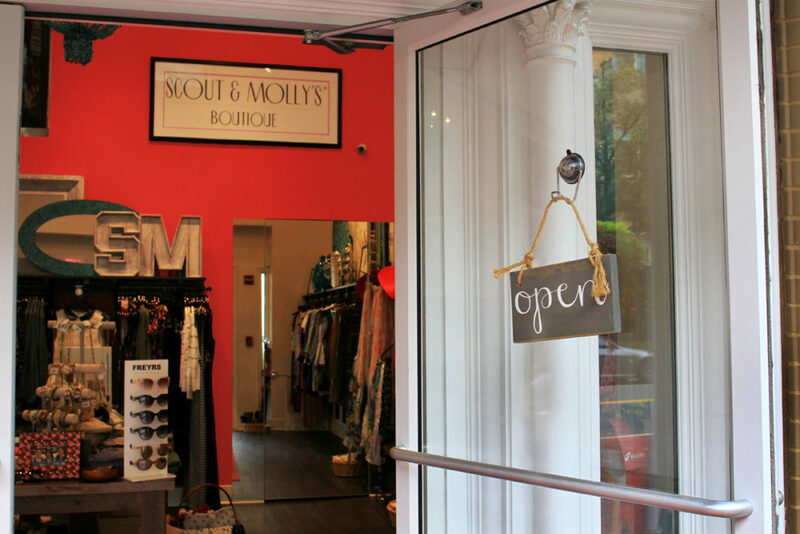 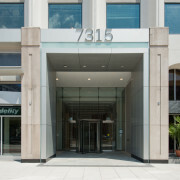 901 NY Ave. 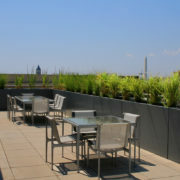 Roof Top Terrace is a 3,263 SF roof top terrace addition. 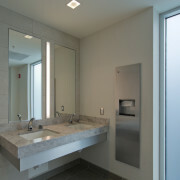 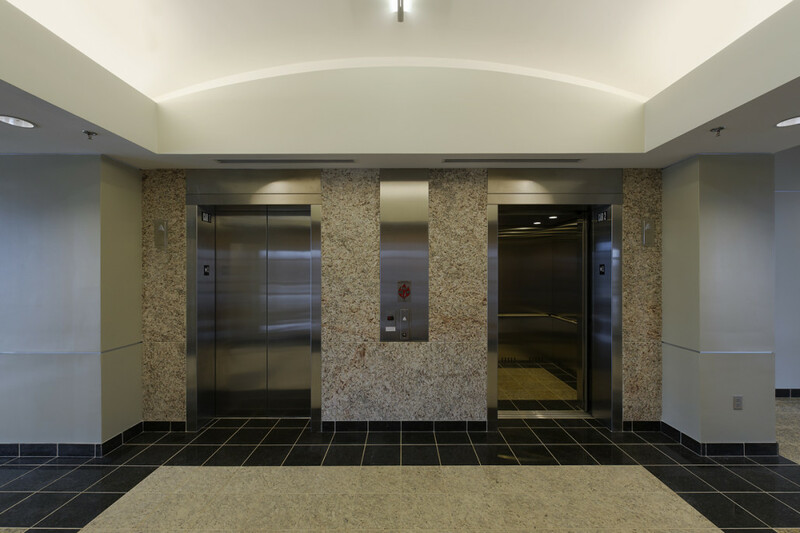 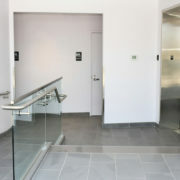 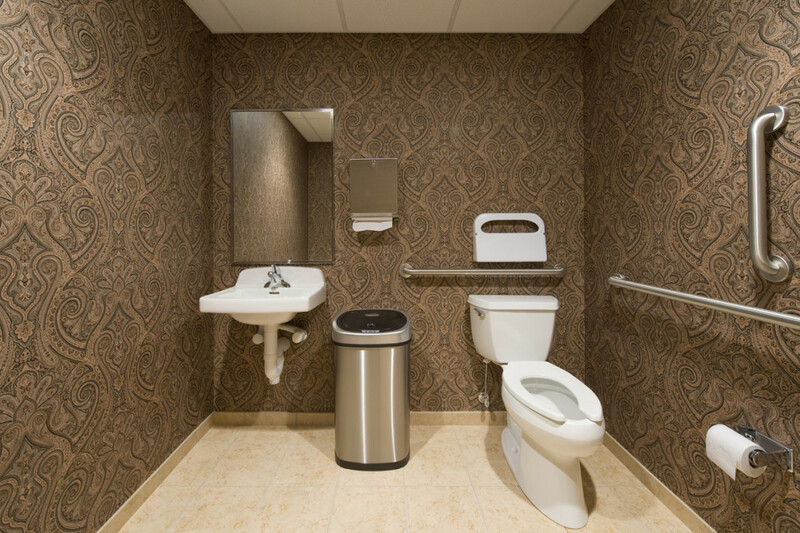 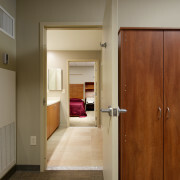 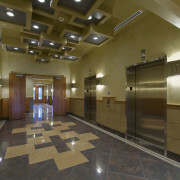 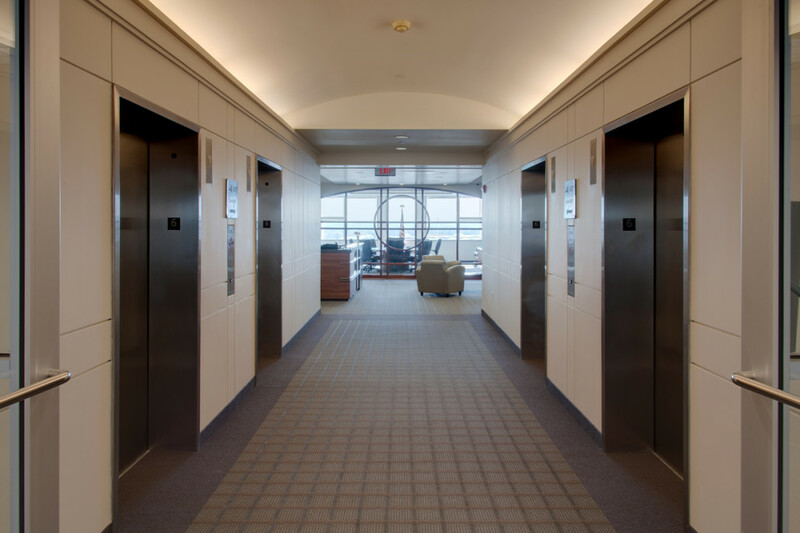 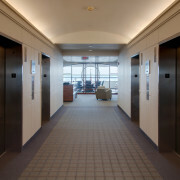 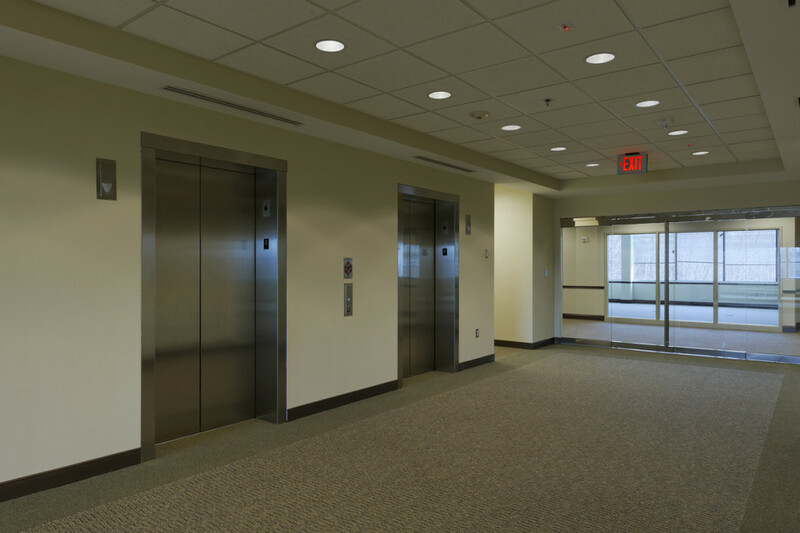 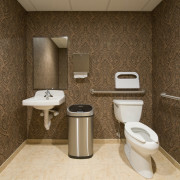 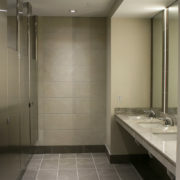 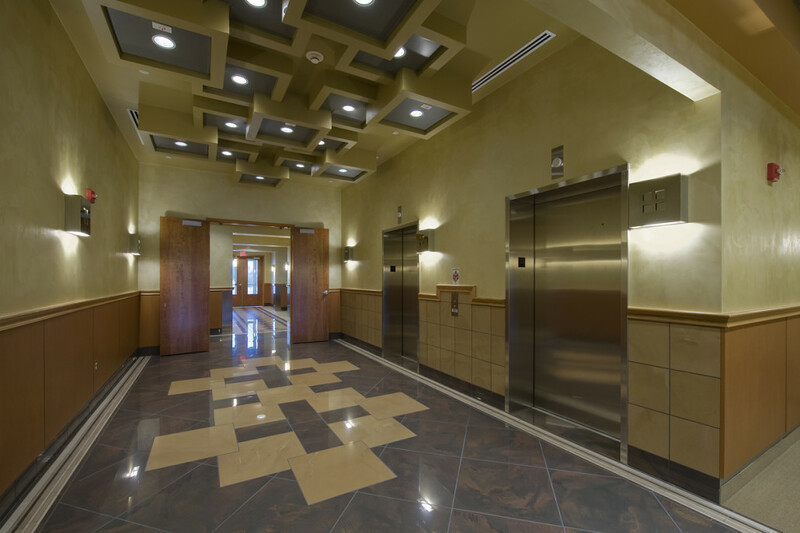 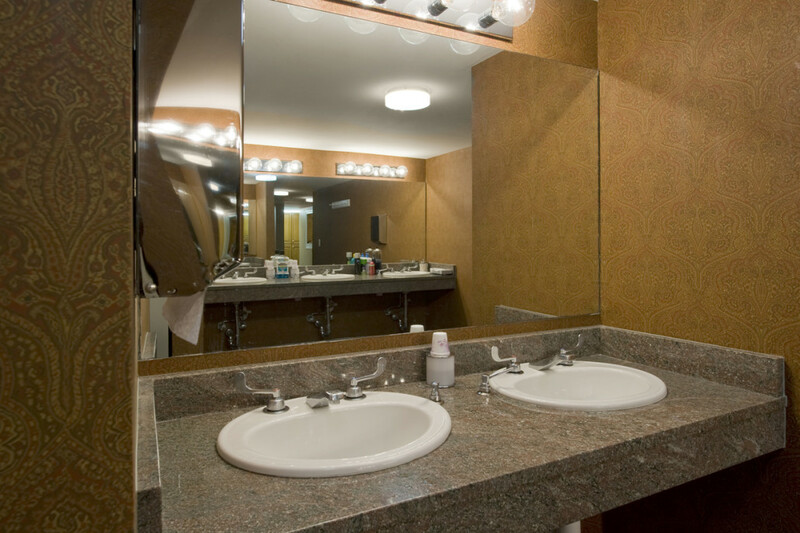 The penthouse renovation consists of upgrades to the elevator lobby, restrooms and pantry. 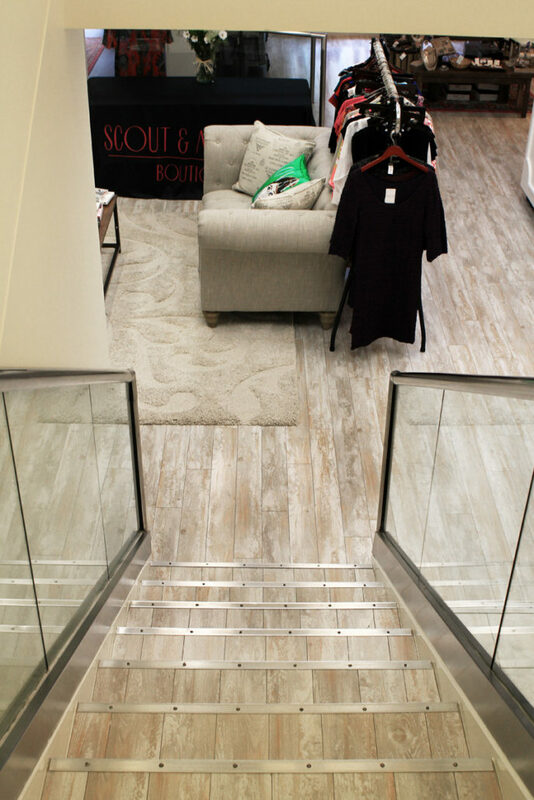 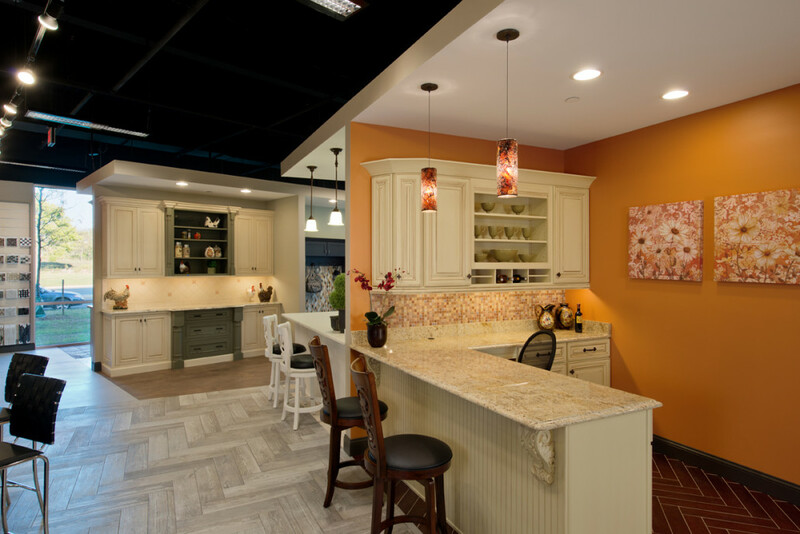 These interior upgrades include updated lighting, a storefront door, wall and floor tile, stone stair treads, and pantry millwork. 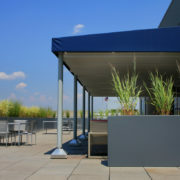 The terrace renovations feature modifications to the existing terrace canopy area and expansion of the terrace seating area. 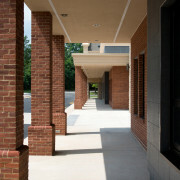 These exterior upgrades include new stone and wood pavers, installation of a pantry roll-up door, exterior lighting upgrades, and refinishing of the exterior façade. 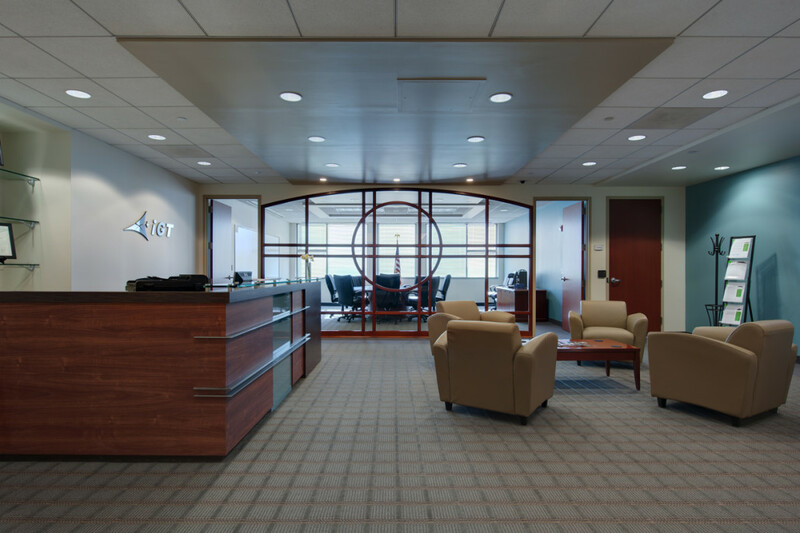 MEP Engineer: WFT Engineering, Inc.
3101 Wilson Blvd. 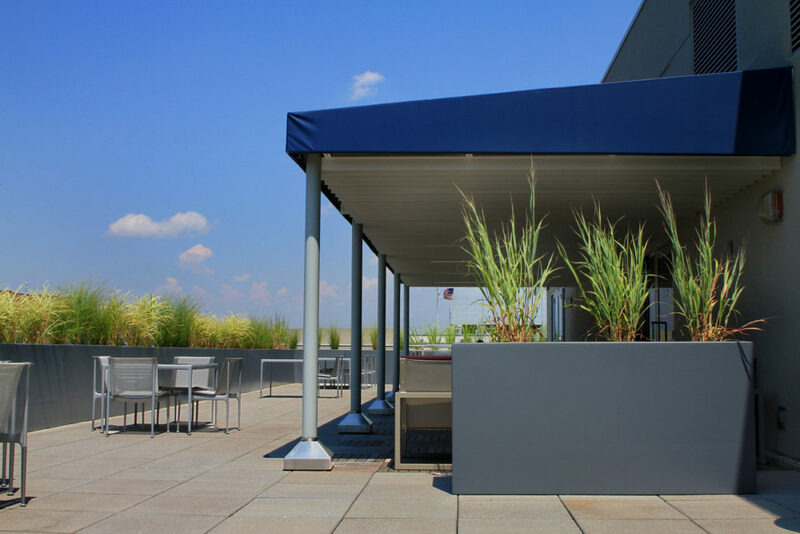 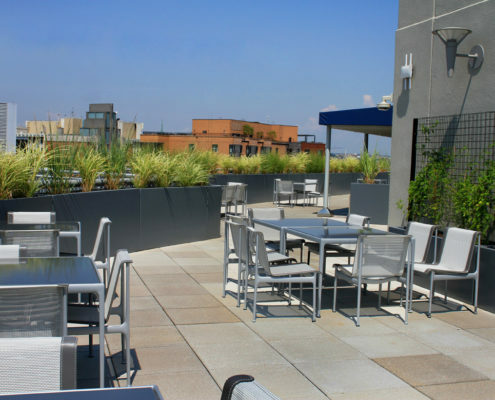 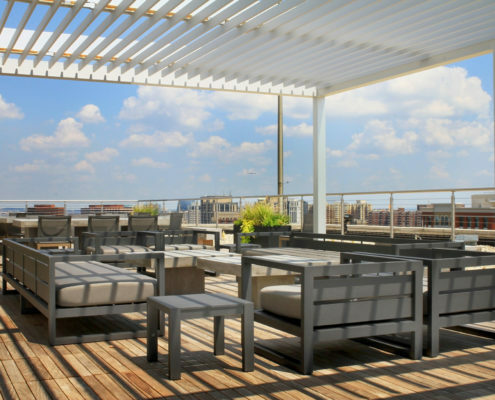 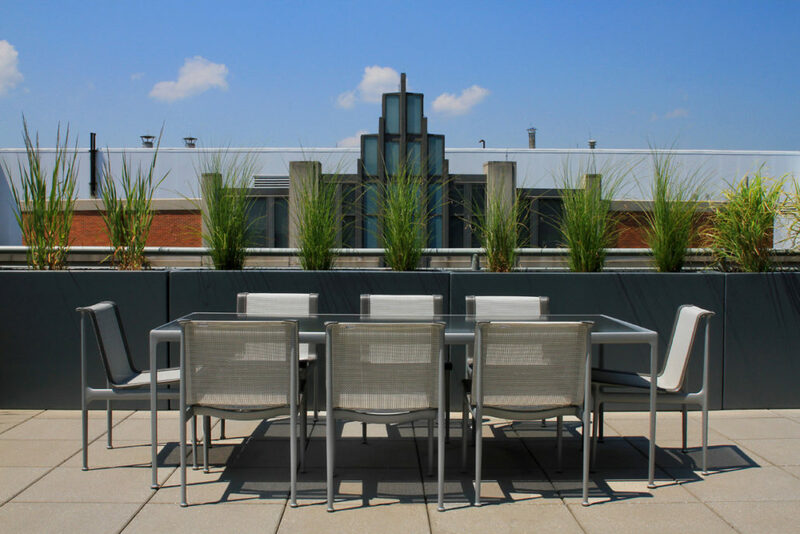 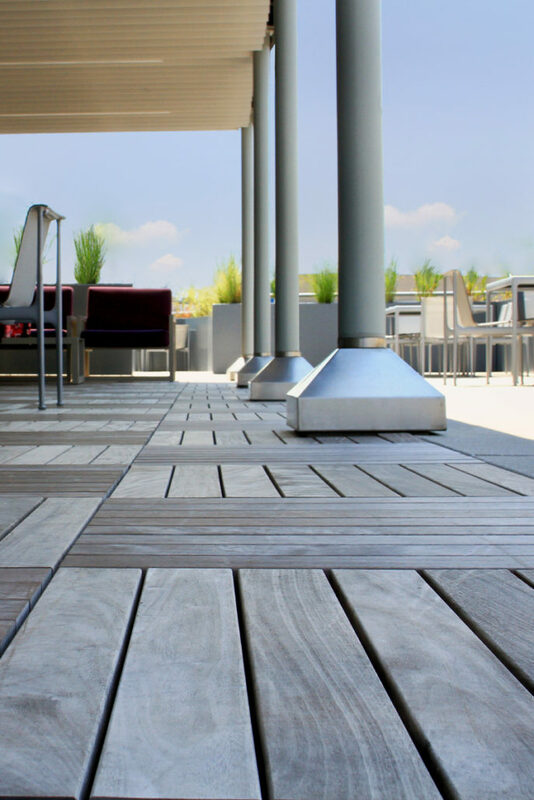 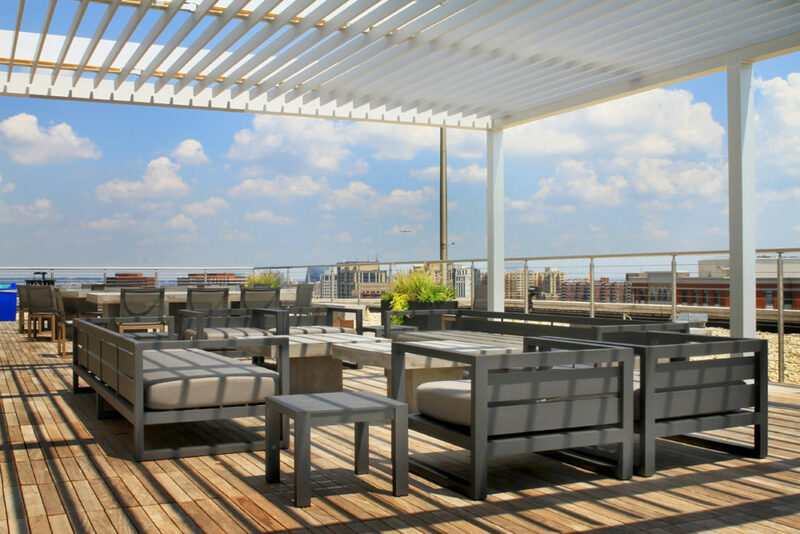 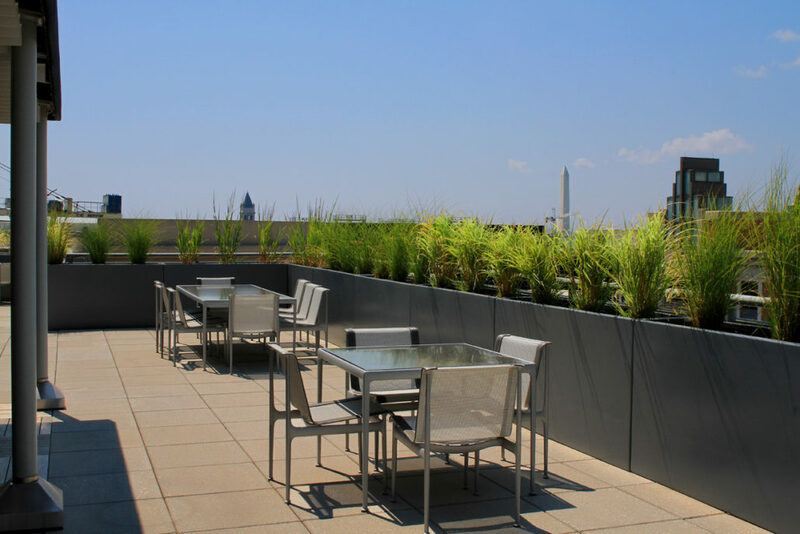 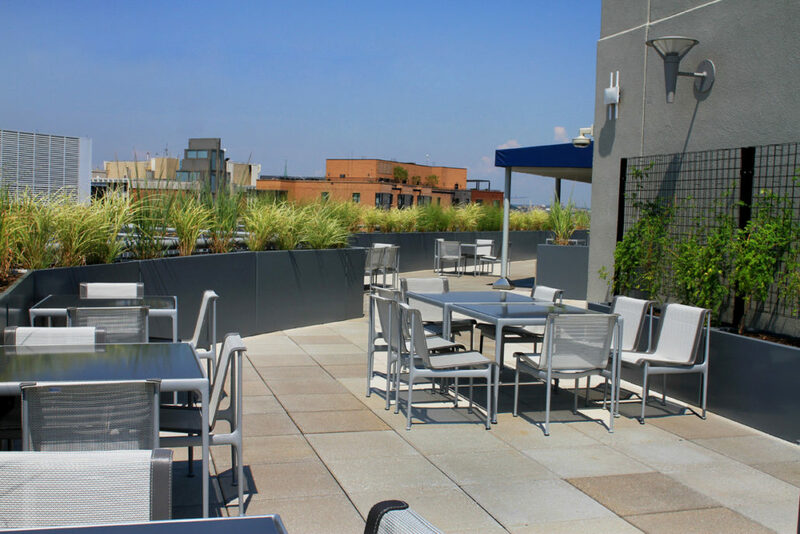 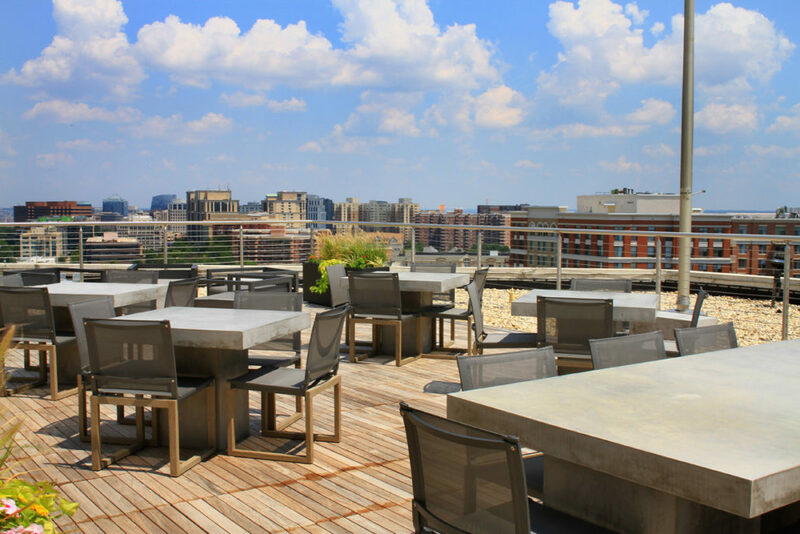 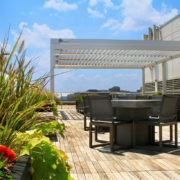 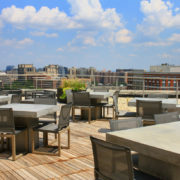 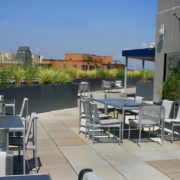 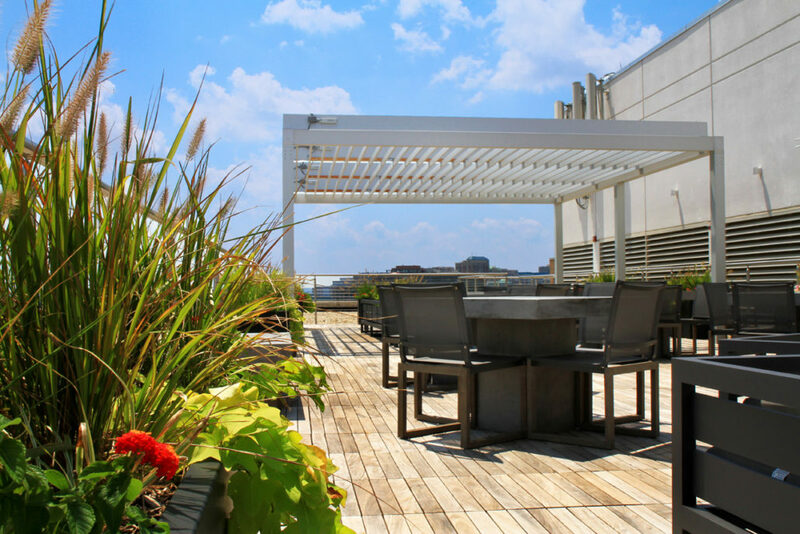 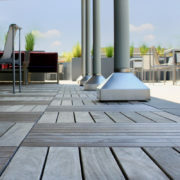 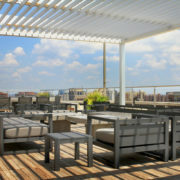 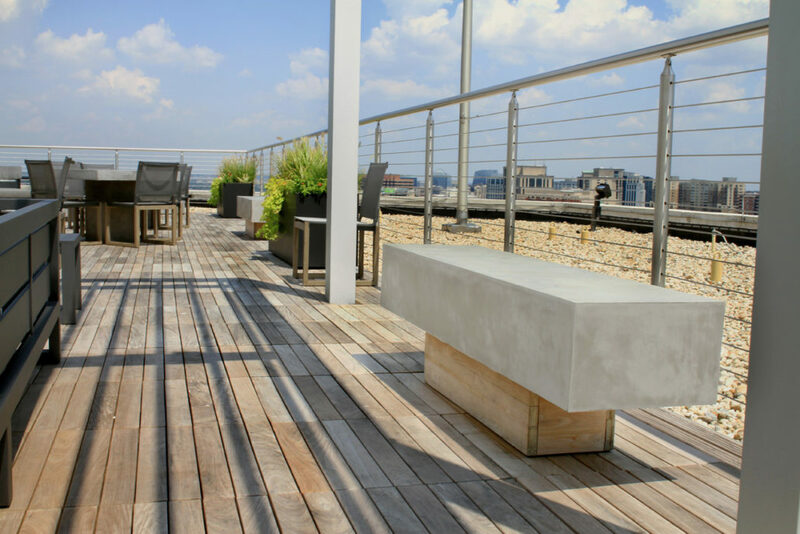 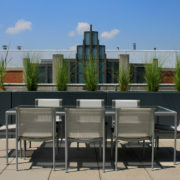 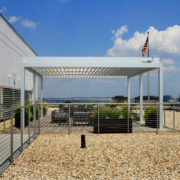 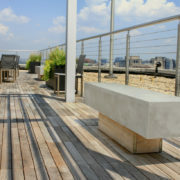 Roof Top Terrace is a 2,900 SF roof top terrace addition in Arlington, VA. 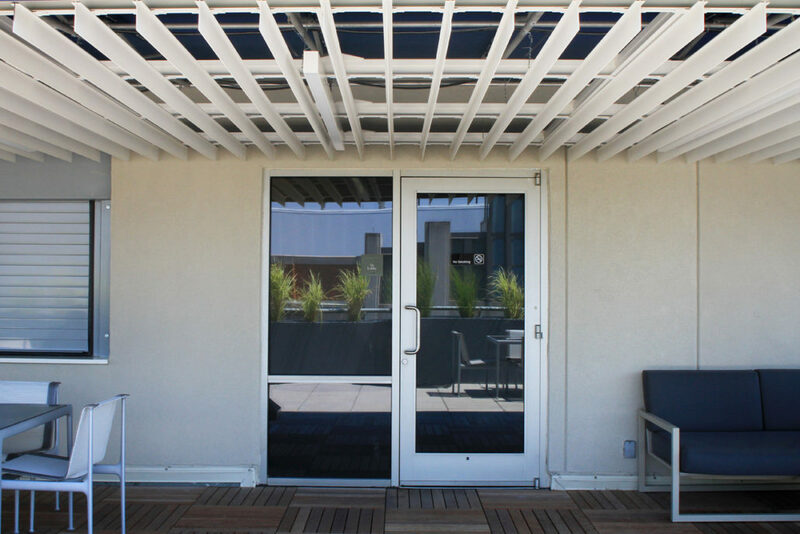 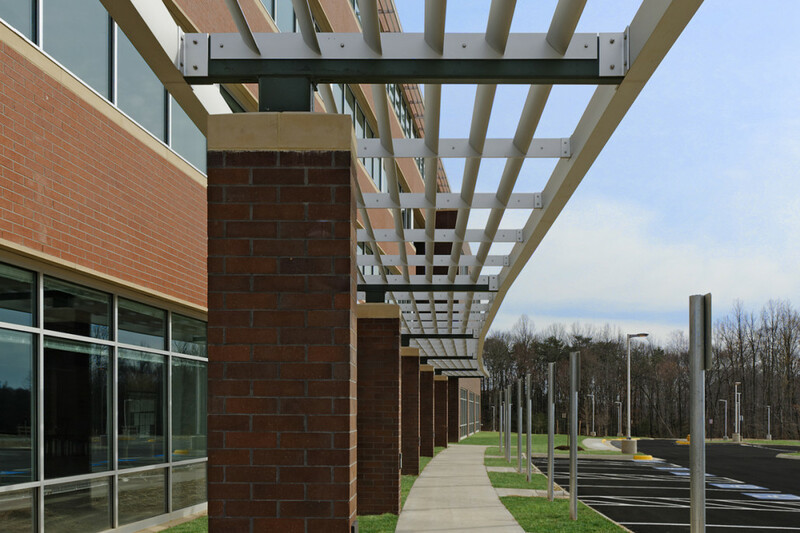 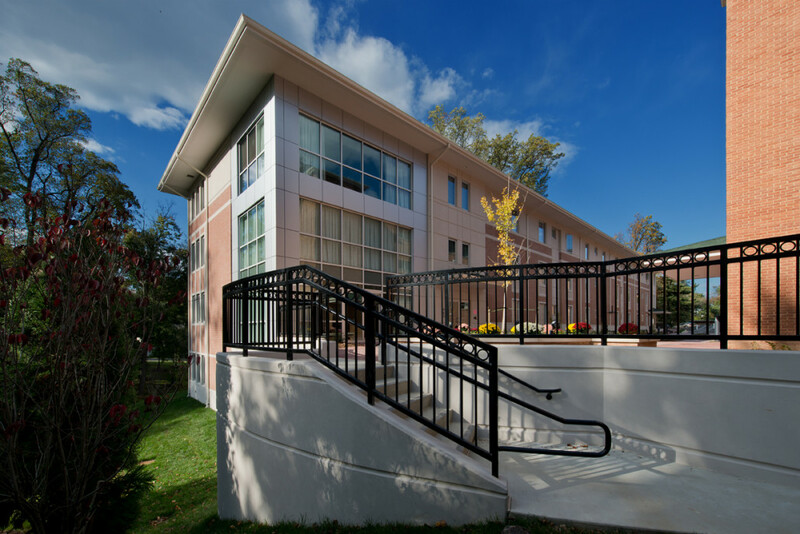 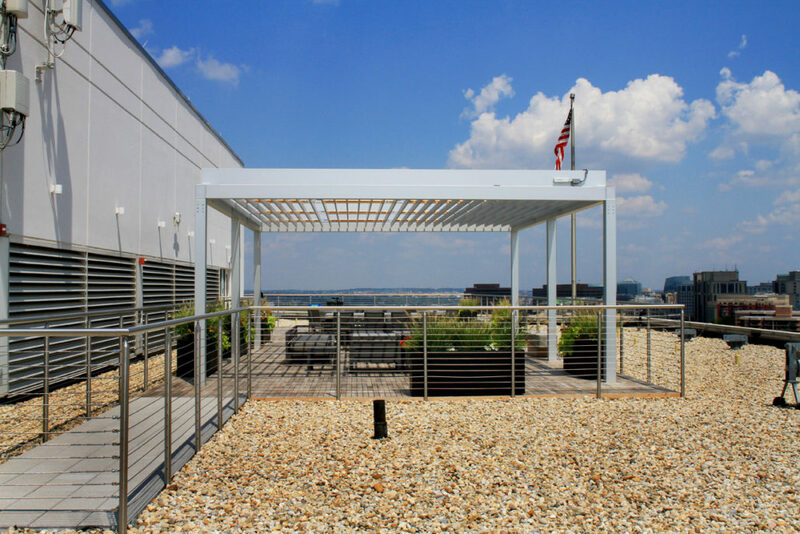 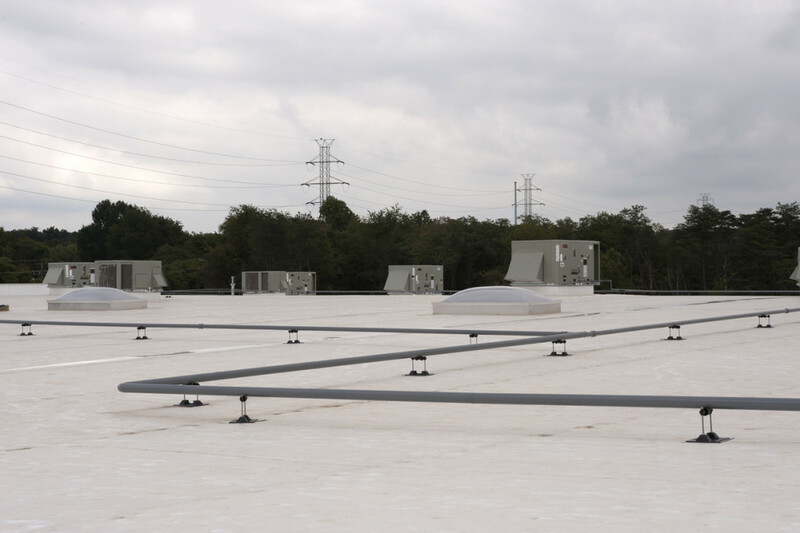 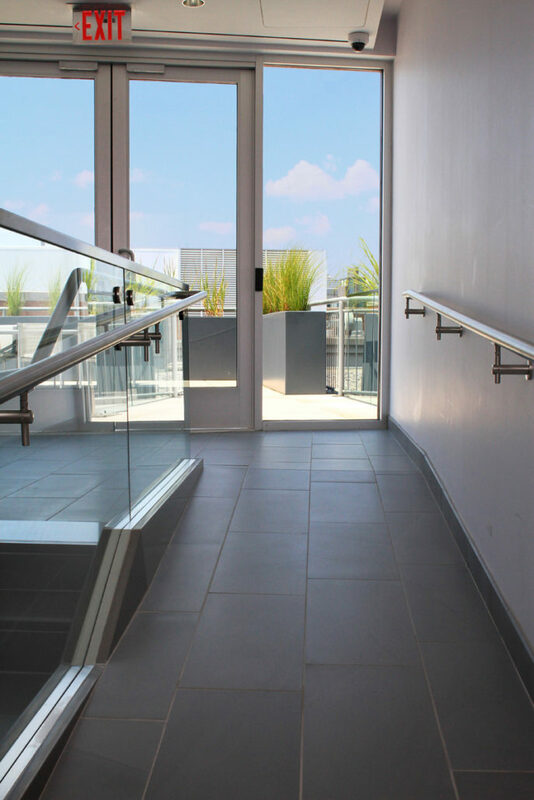 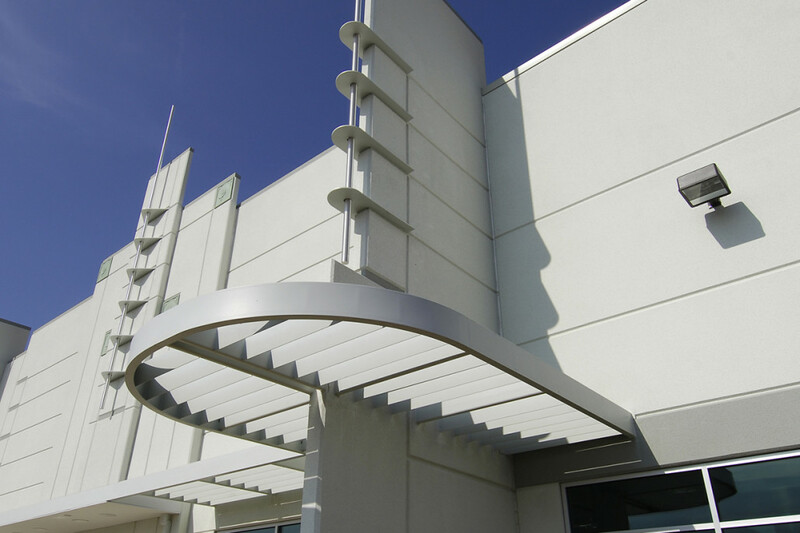 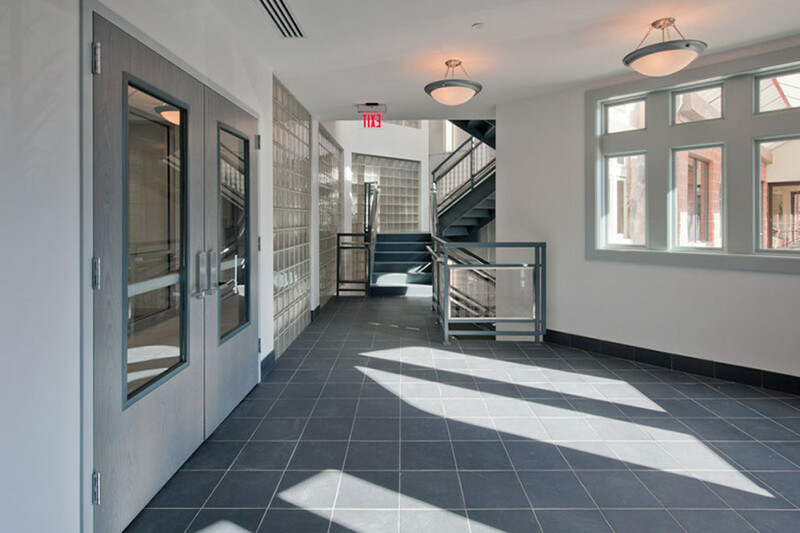 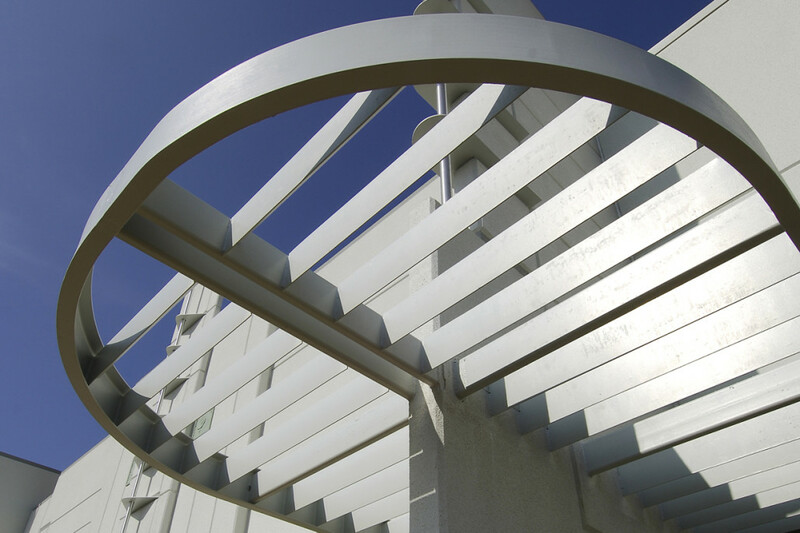 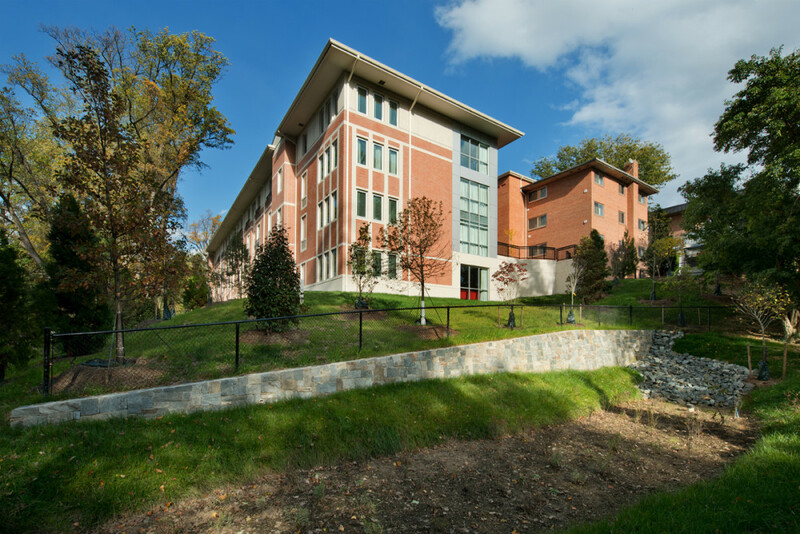 The project featured new roof top pavers, a wood decking system, an aluminum trellis, stainless steel railing and modifications to the building HVAC and structure to extend a stairway to the roof level. 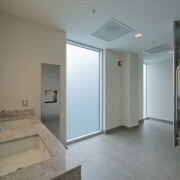 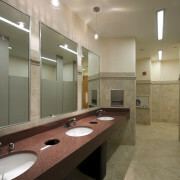 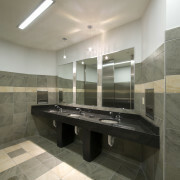 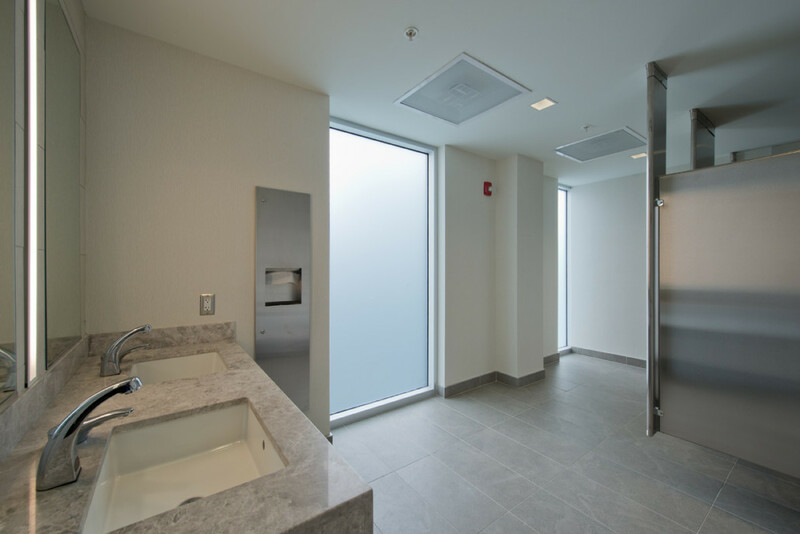 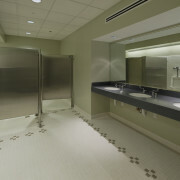 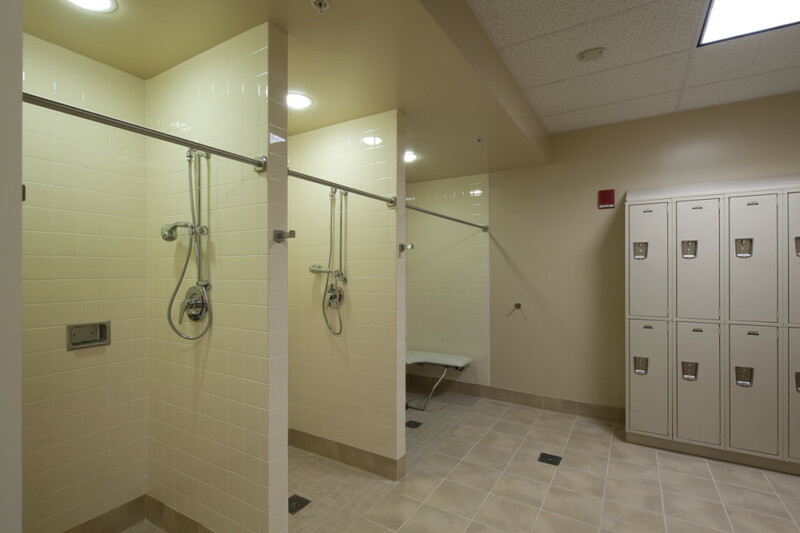 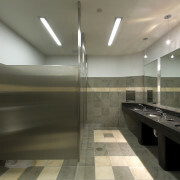 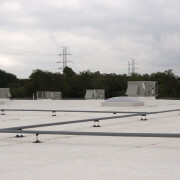 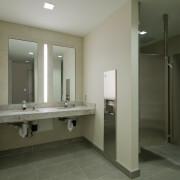 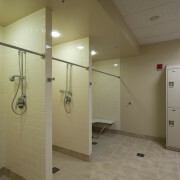 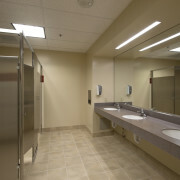 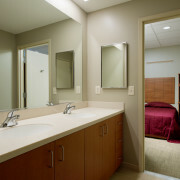 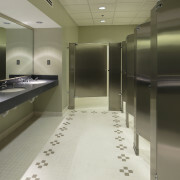 Men’s and women’s restrooms were added to the roof level for the convenience of the building tenants. 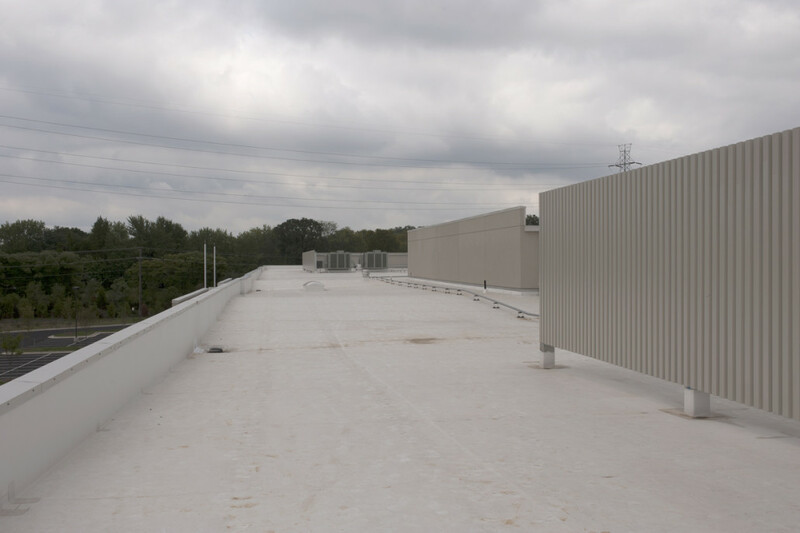 At 9 stories above Wilson Blvd., the project team had to manage the challenges of stocking and removing construction materials to and from the roof. 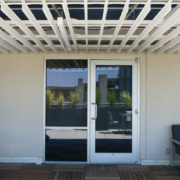 This process required sidewalk closure permits and close coordination with property management and city officials. 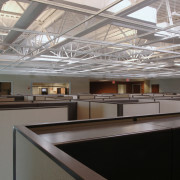 Structural Engineer: Fernandez & Associates Structural Engineers, P.C. 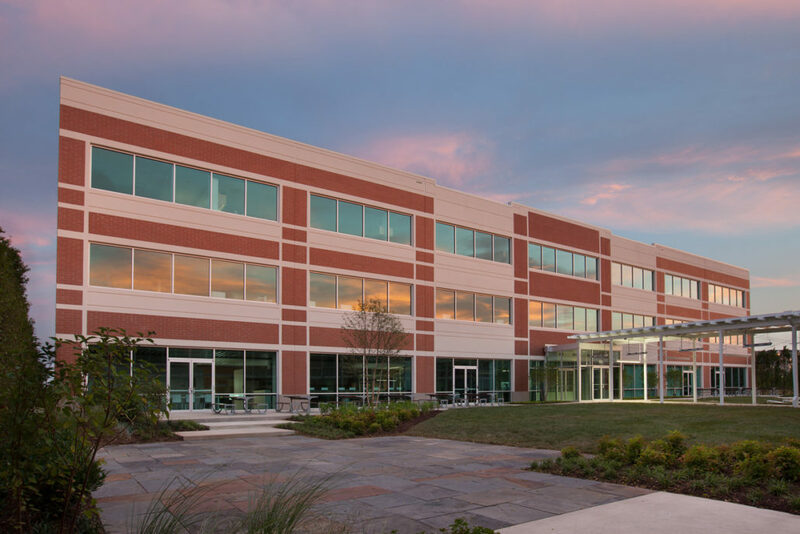 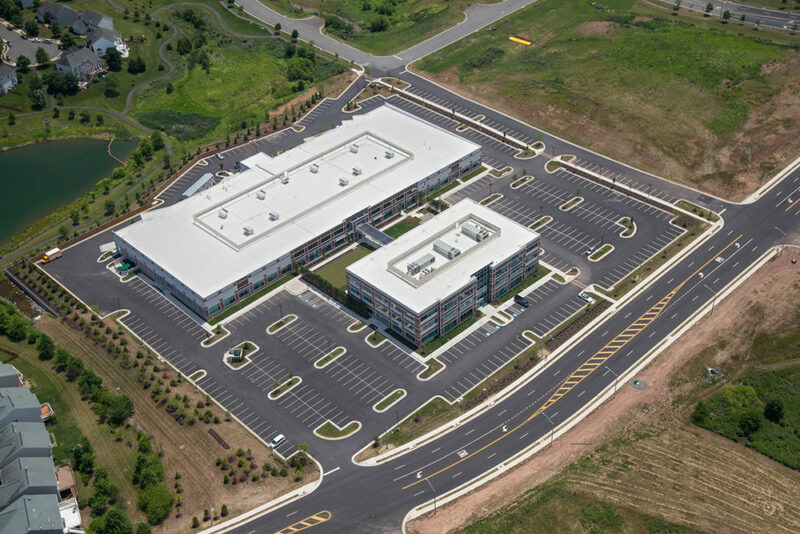 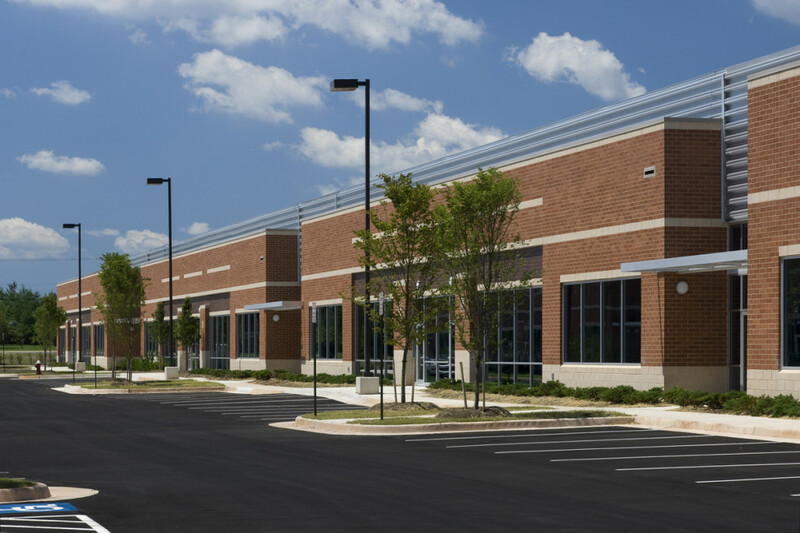 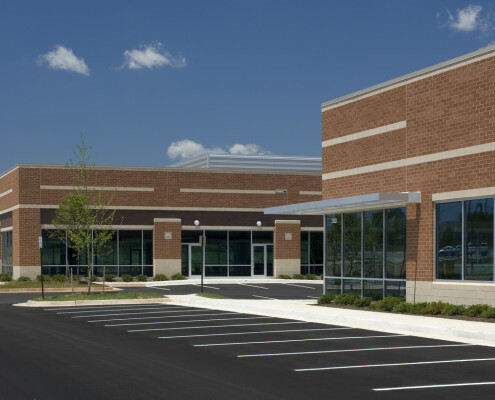 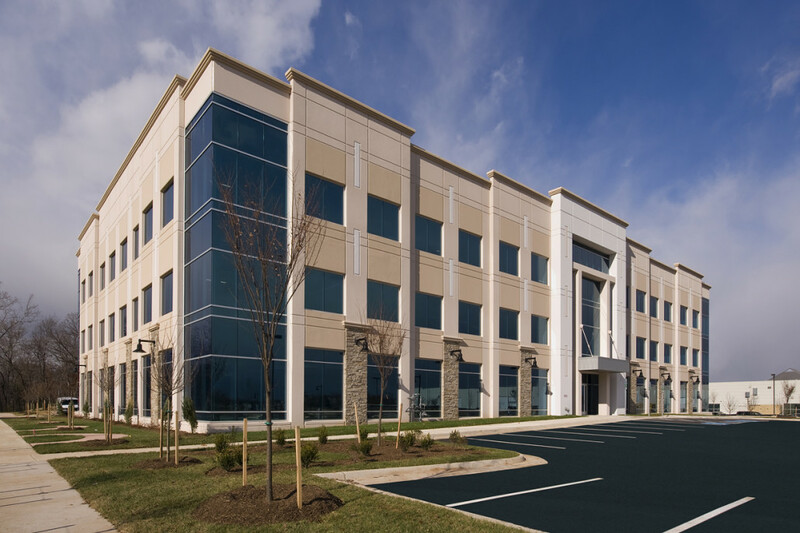 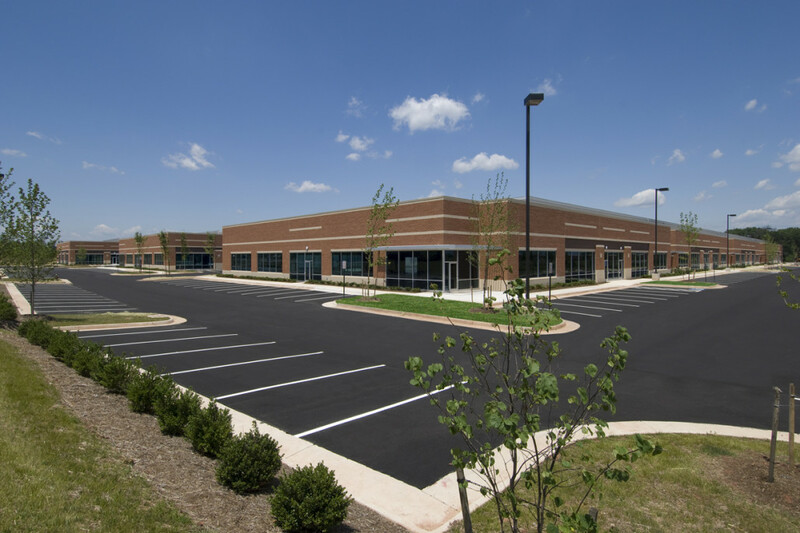 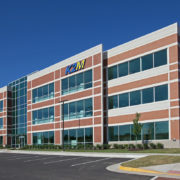 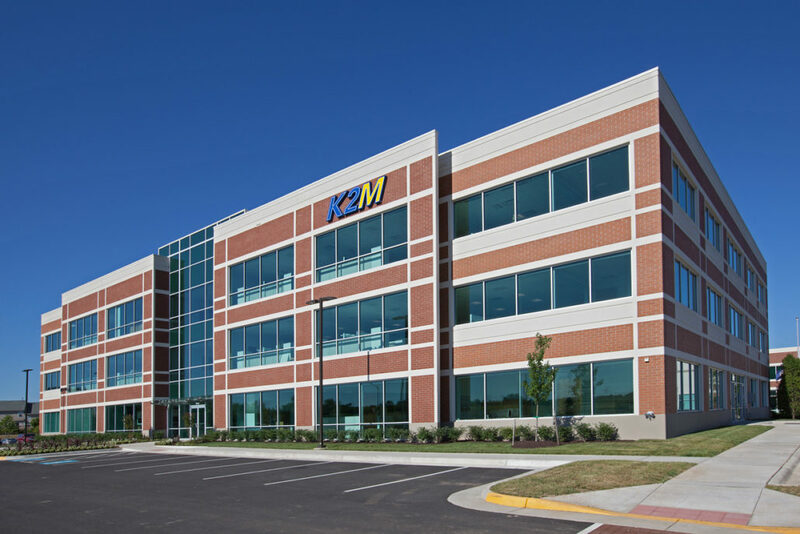 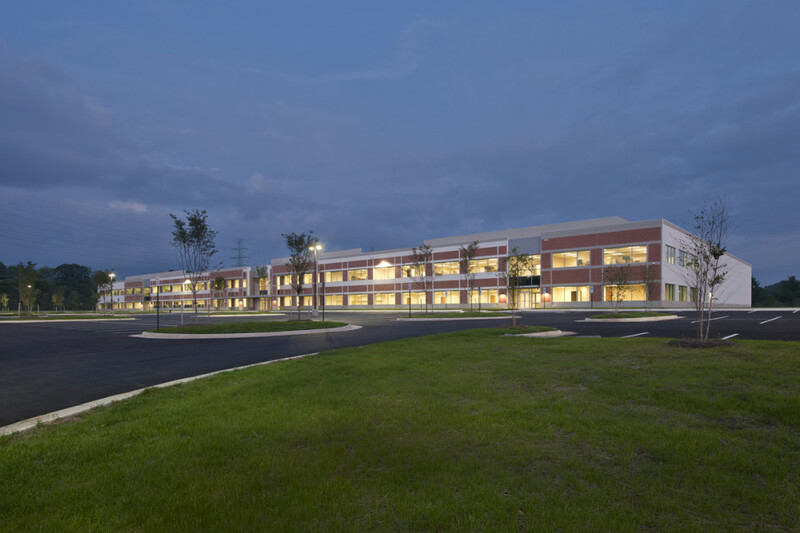 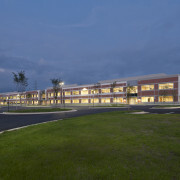 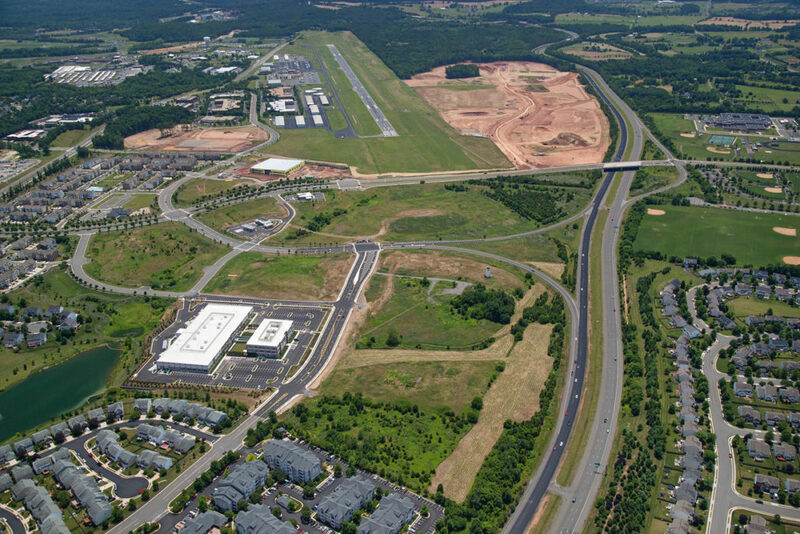 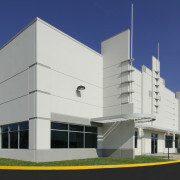 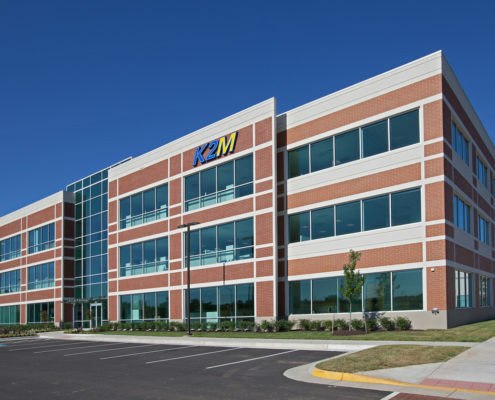 K2M at Oaklawn is a design-assist, negotiated 148,850 SF build to suit corporate headquarters facility Leesburg, VA. 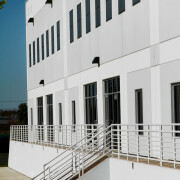 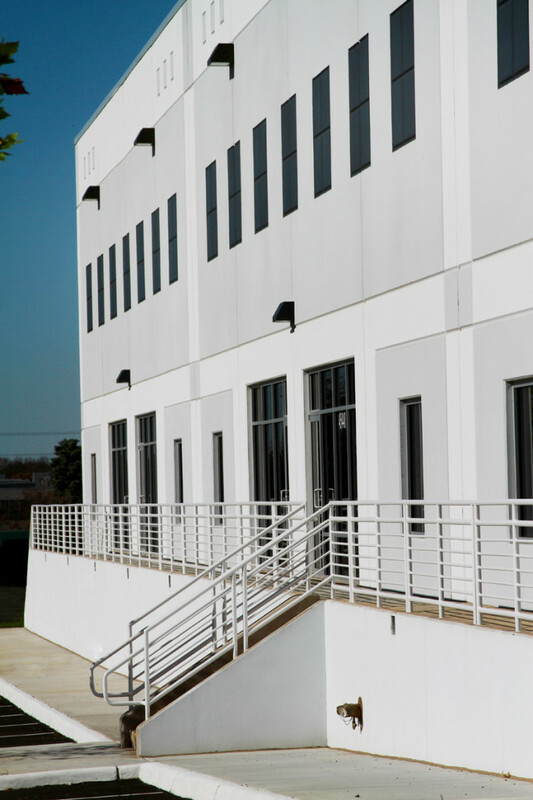 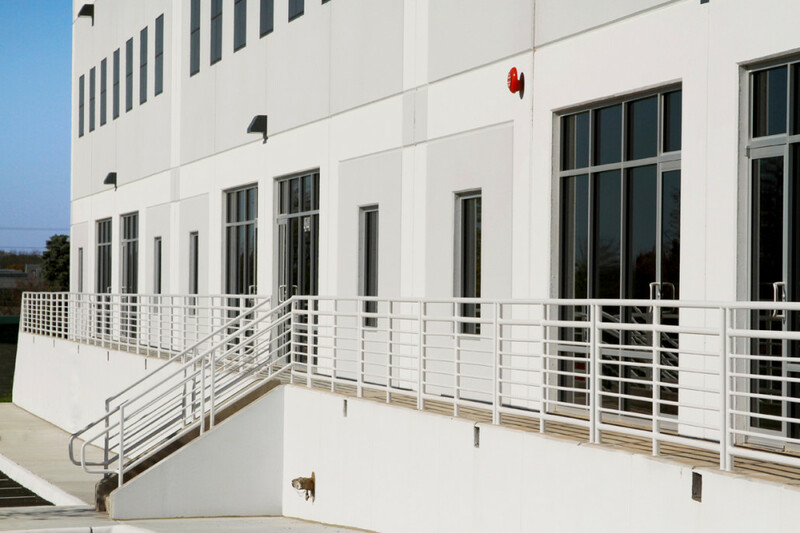 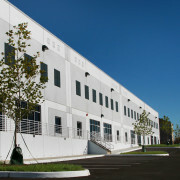 The two-building complex is comprised of a 3-story, 60,000 SF Class A office building and 84,850 SF production/lab/warehouse facility. 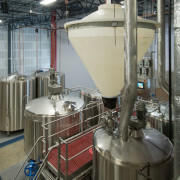 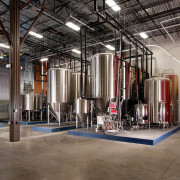 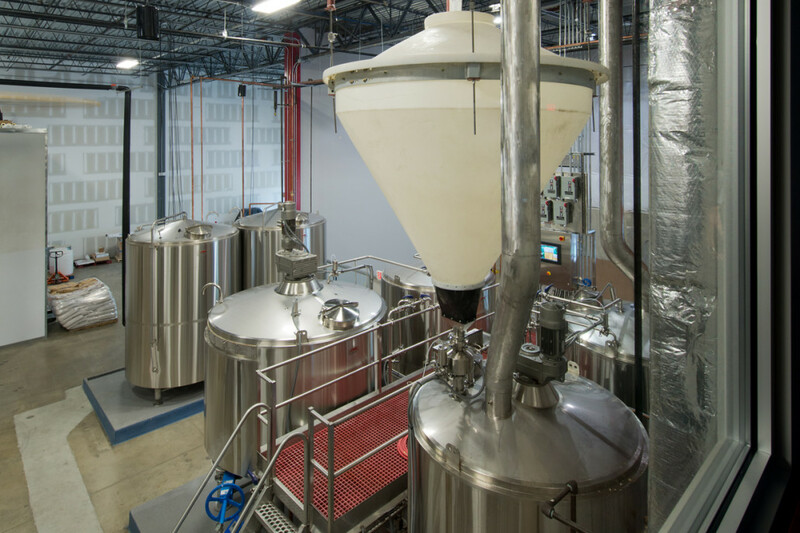 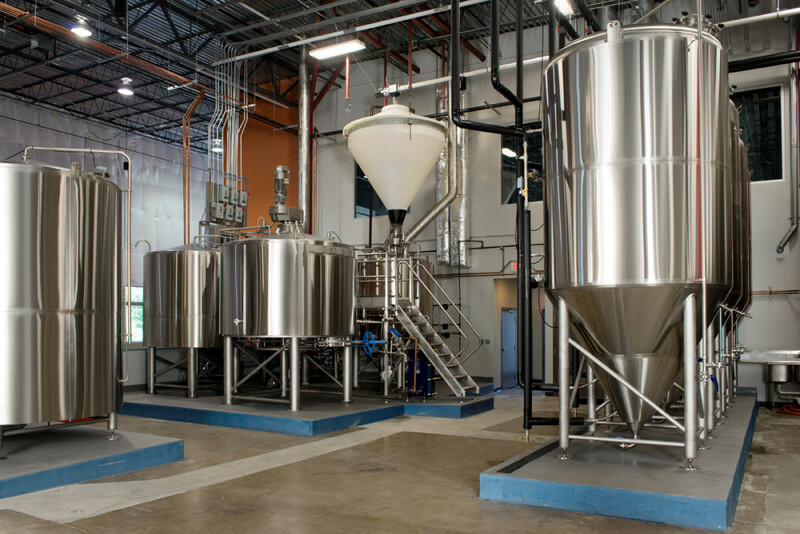 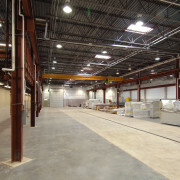 The project included full site work, shell and core construction and completion of extensive mechanical and electrical infrastructure to include high end HVAC, hood systems and back-up generators. 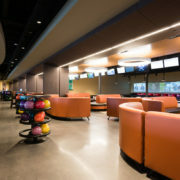 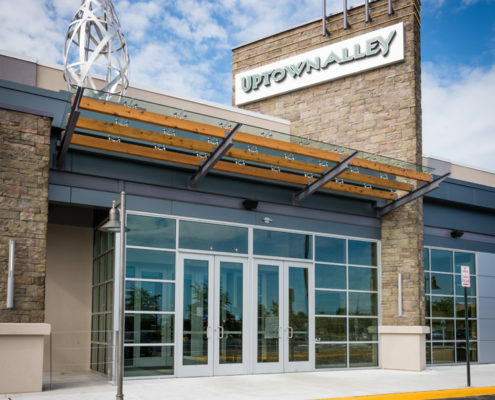 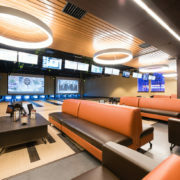 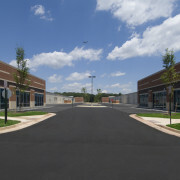 Uptown Alley is a high end bowling alley and entertainment venue in Manassas, VA. 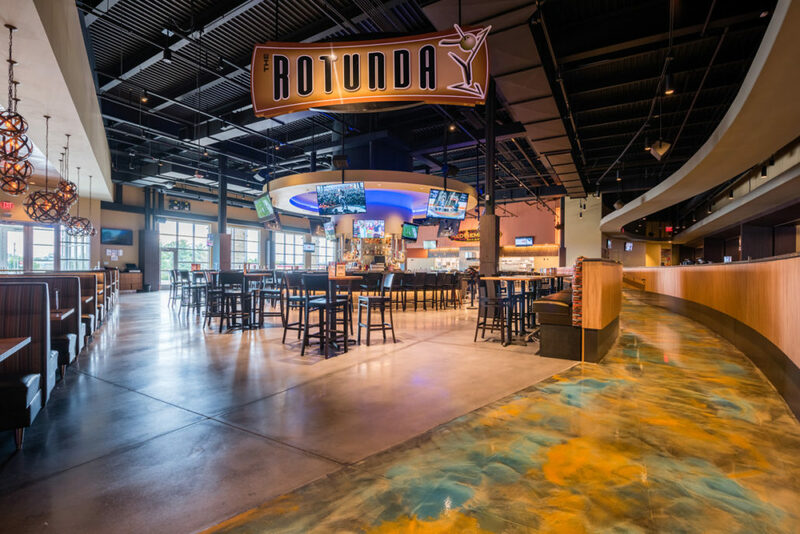 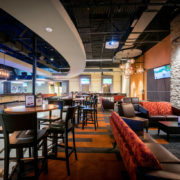 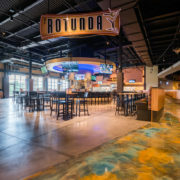 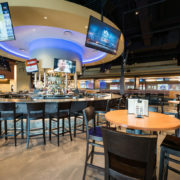 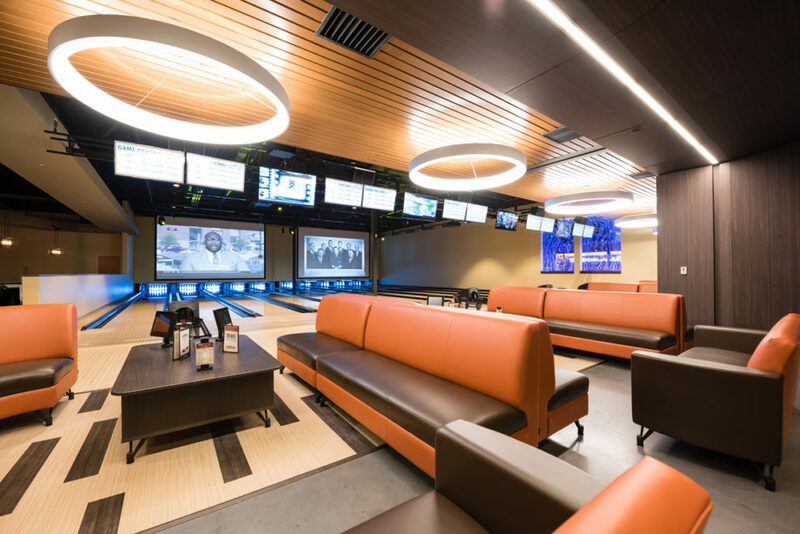 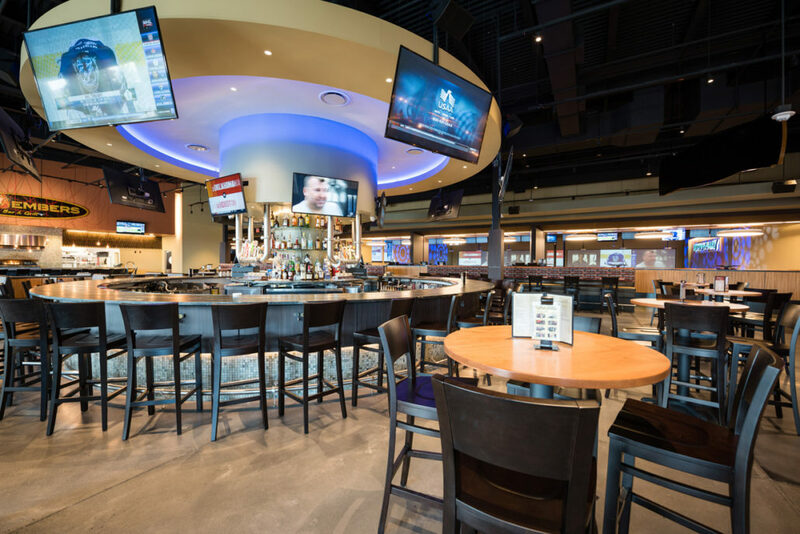 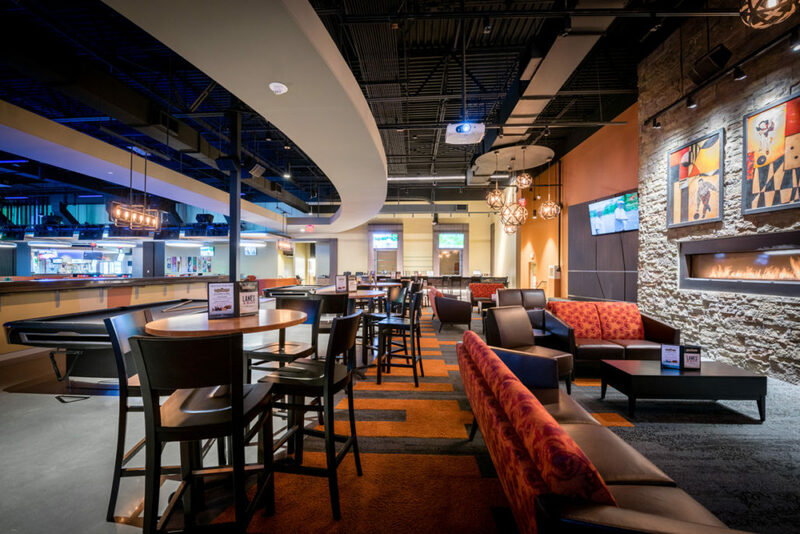 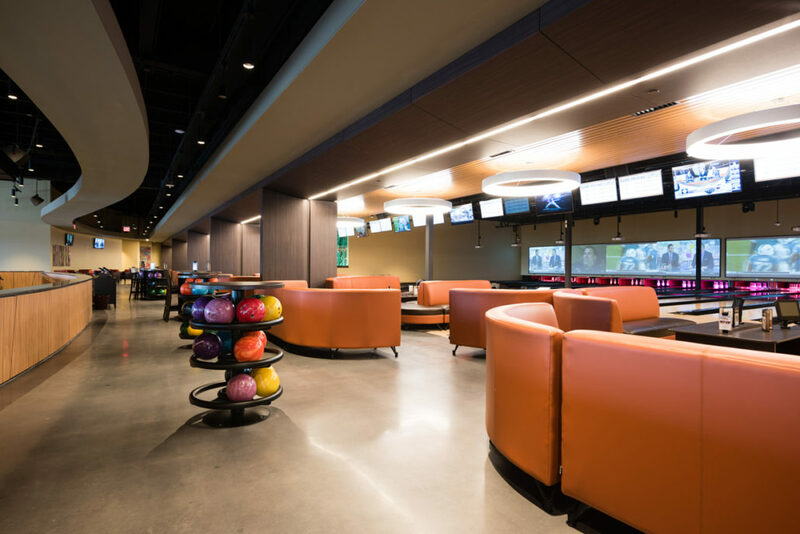 The build-out features a full service kitchen, 24 bowling lanes, laser tag, a performance stage, four bars and a boutique seating area including a fireplace and billiards tables. 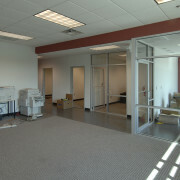 Exterior renovations include the addition of an exterior seating area, an office and a loading area. 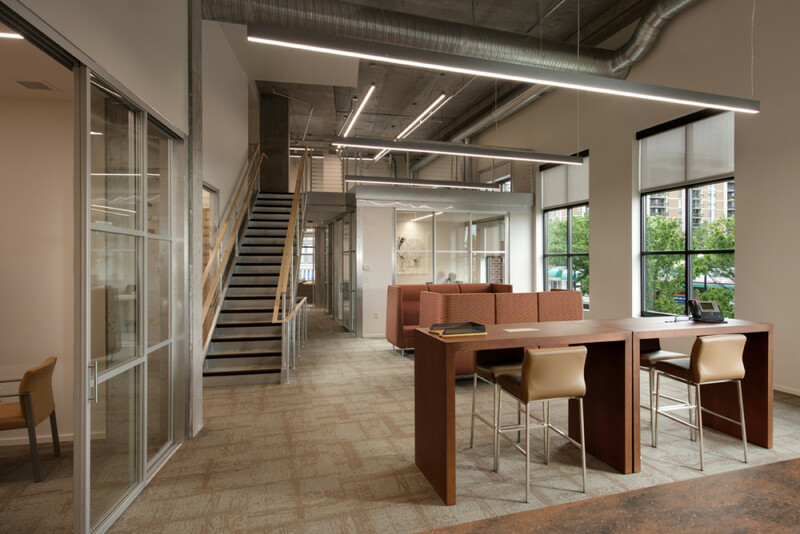 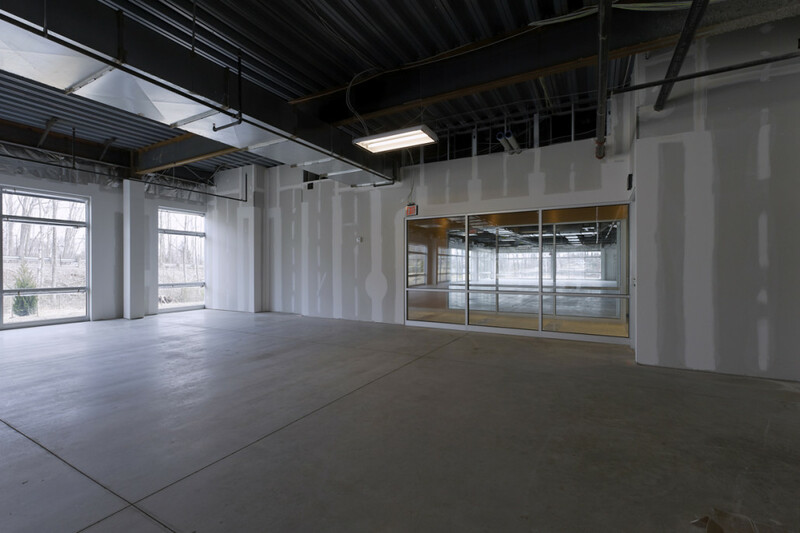 The interior features stained concrete, epoxy and resilient flooring as well as multiple ceiling materials including drywall, acoustical ceiling tiles and wood paneling. 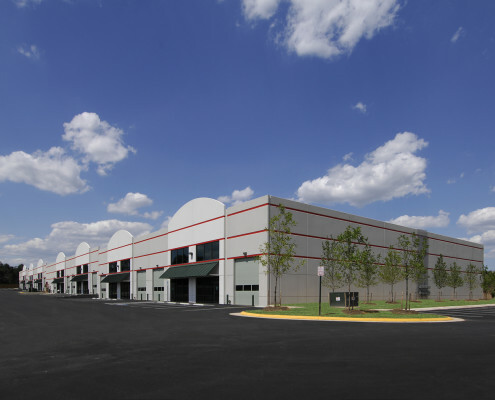 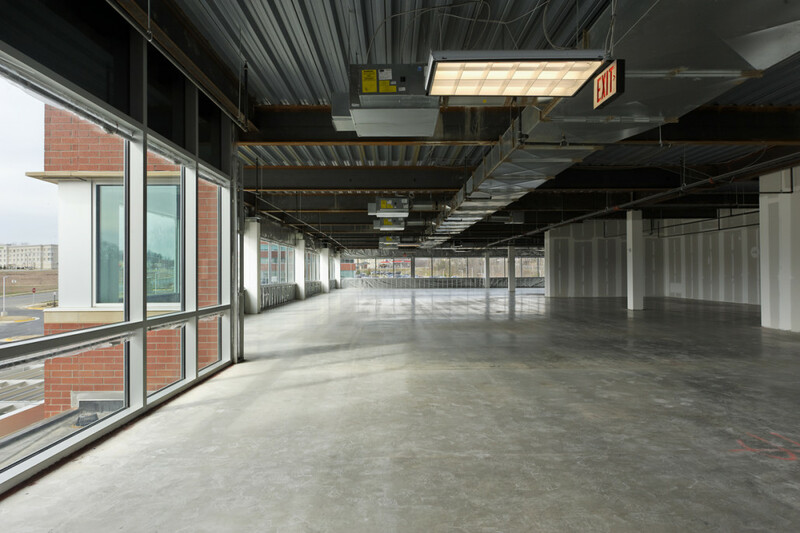 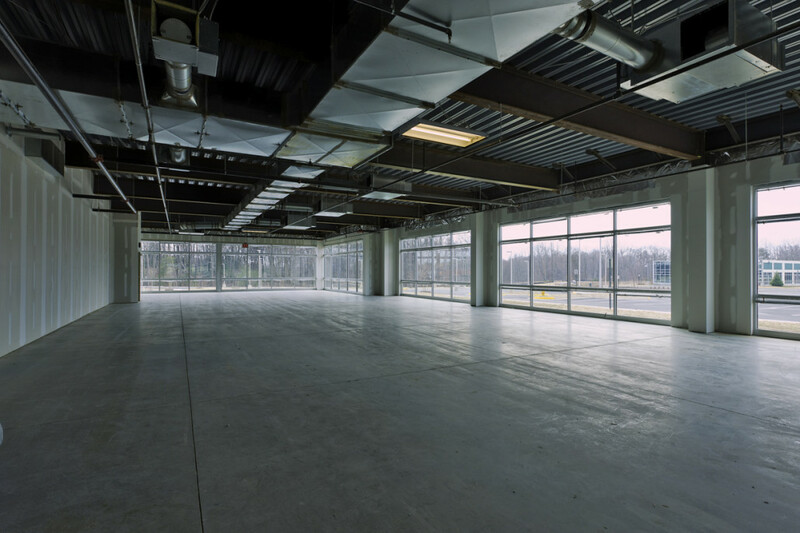 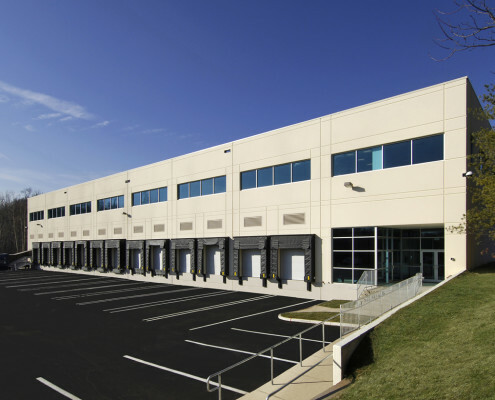 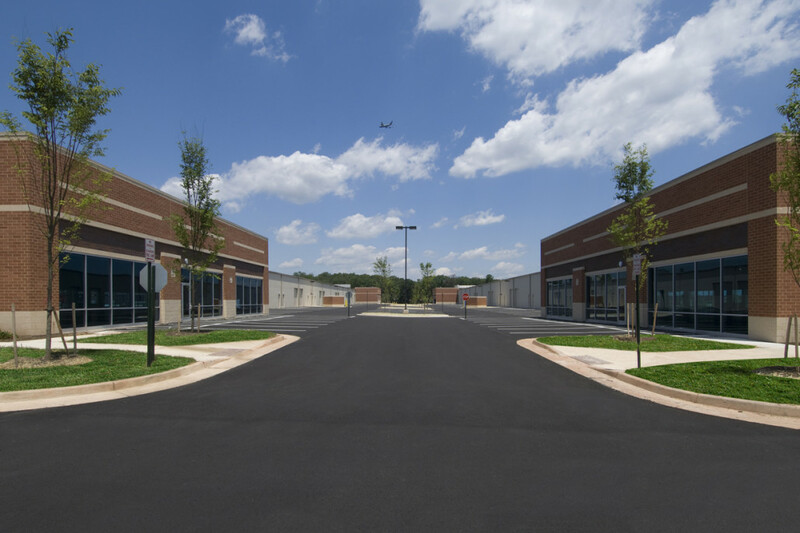 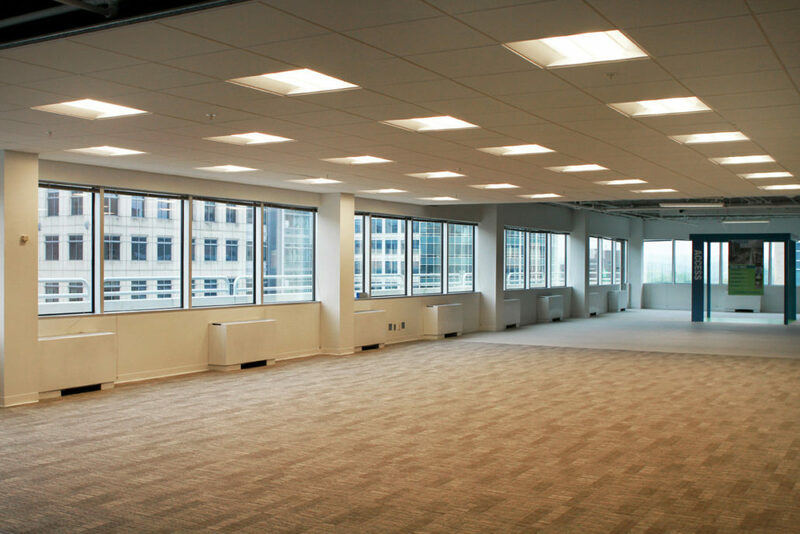 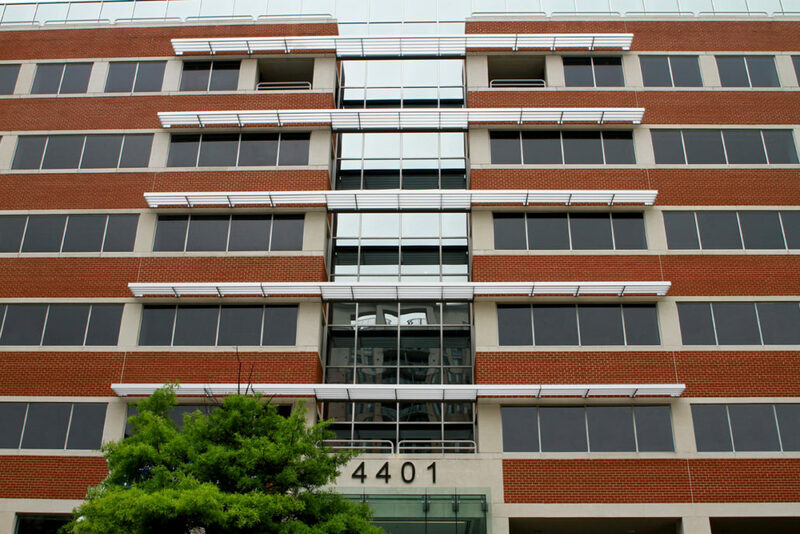 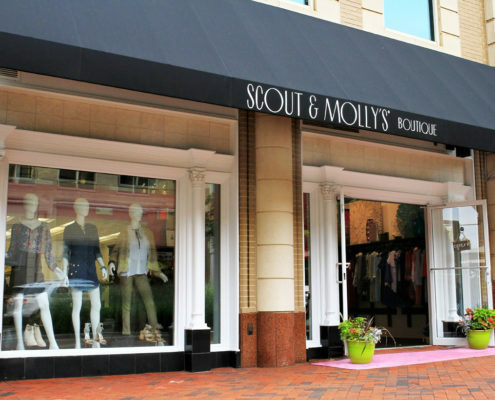 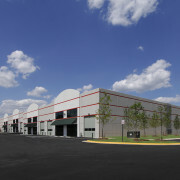 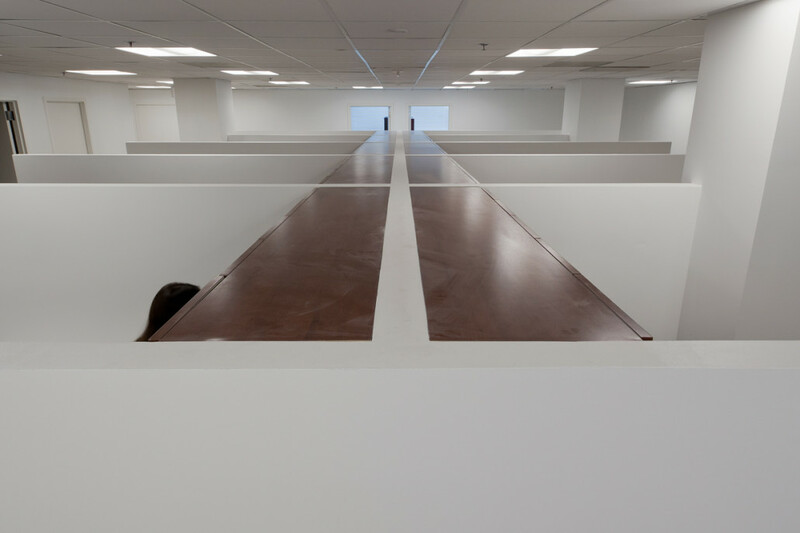 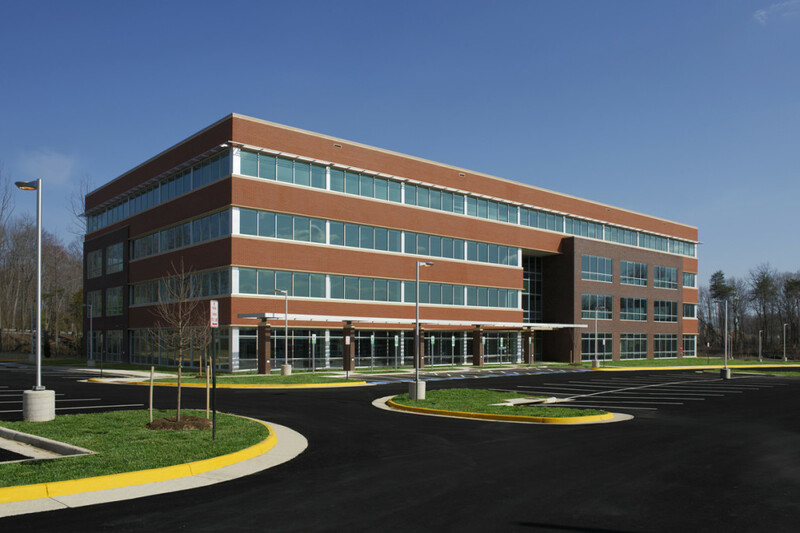 Arlington Square is a 134,700 SF repositioning project in Arlington, VA. 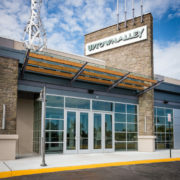 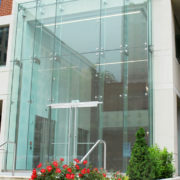 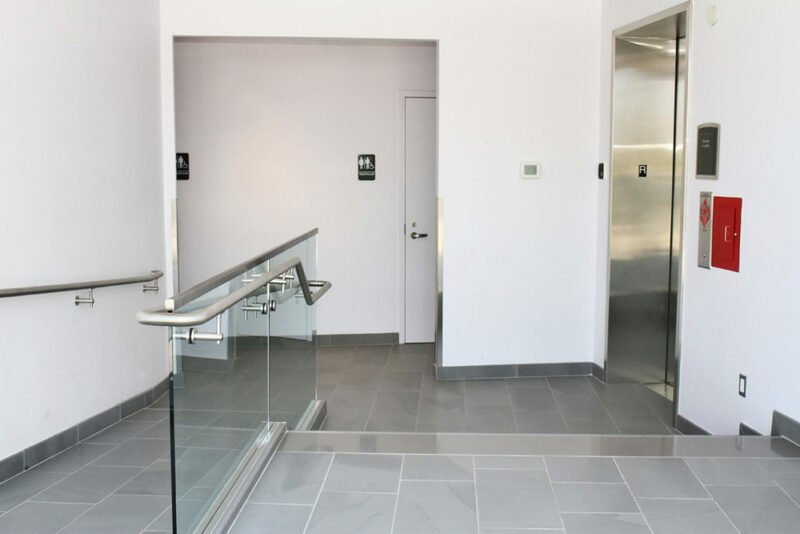 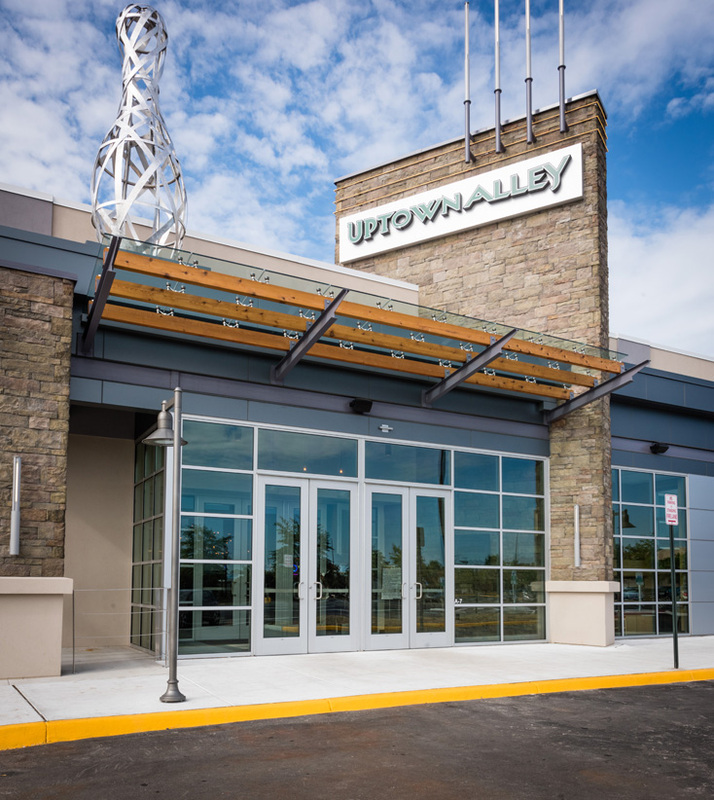 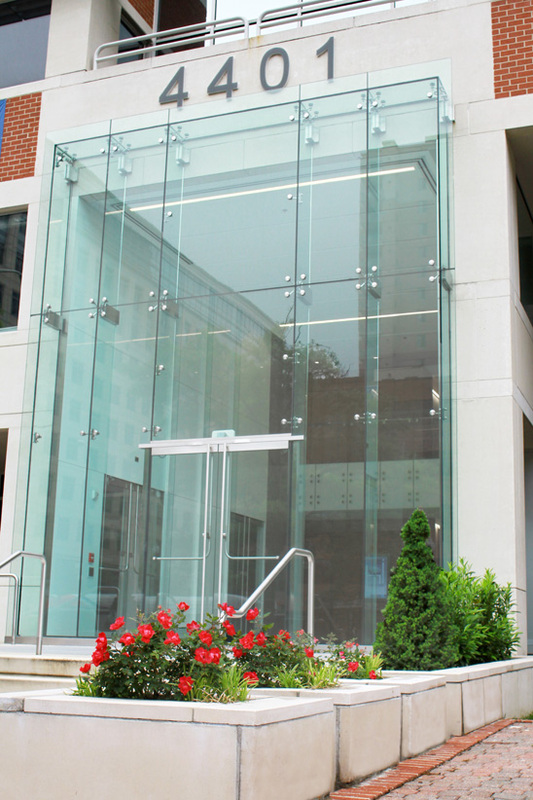 The work included reconfiguration of the exterior entrance, a 2-story structural glass wall with integrated glass doors and an elevated precast patio area. 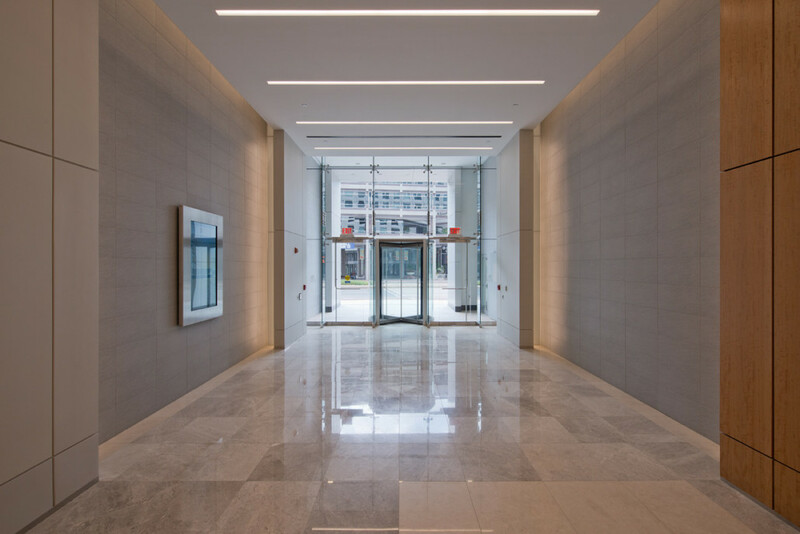 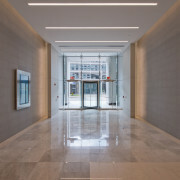 The interior main lobby was completely renovated and features white back-painted glass with integral LED lighting and dimensional stone tile. 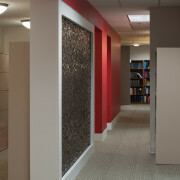 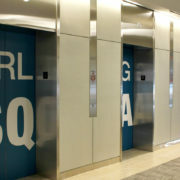 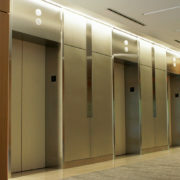 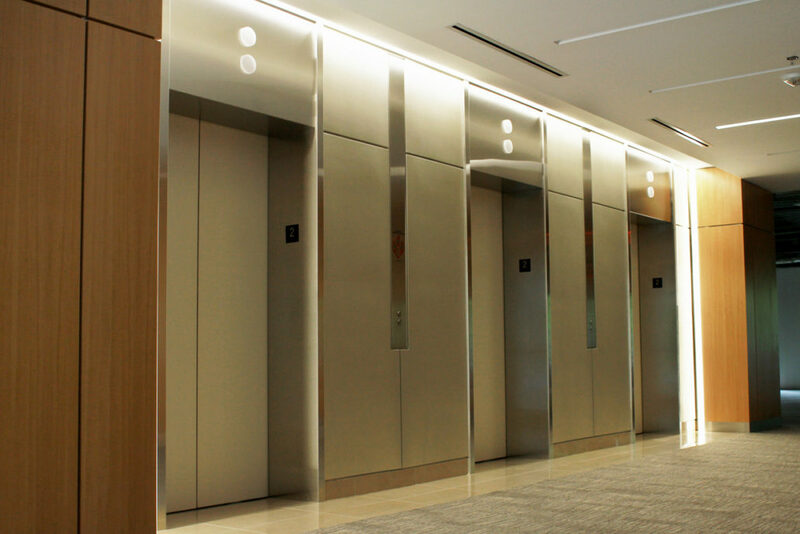 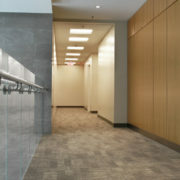 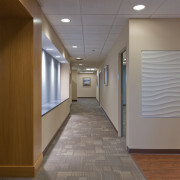 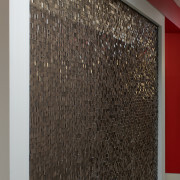 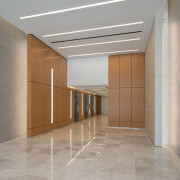 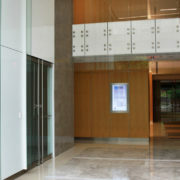 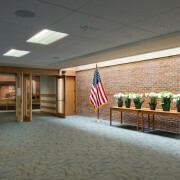 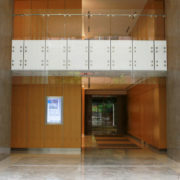 Stainless wall accents and book-matched anigre wood panels contribute to the very bright and sanitary feel of the lobby. 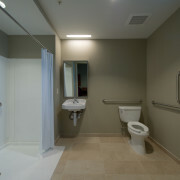 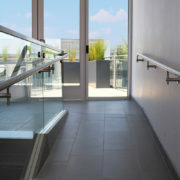 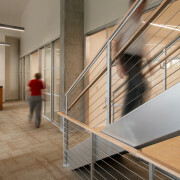 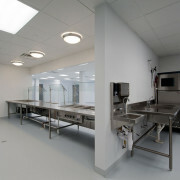 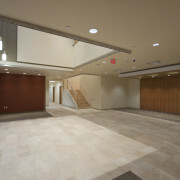 A portion of the 1st floor slab was removed to install a glass and stainless hand rail and elevate the ceilings to 18’. 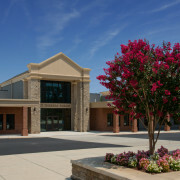 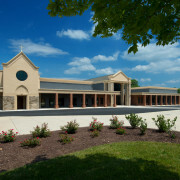 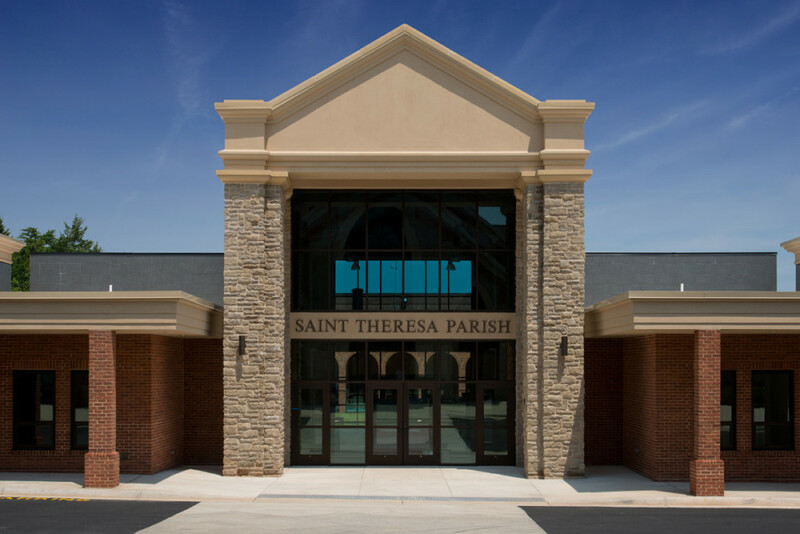 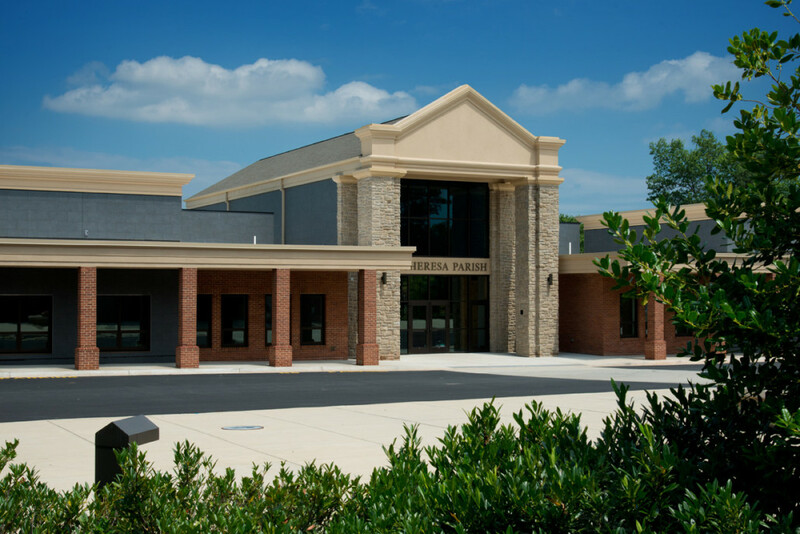 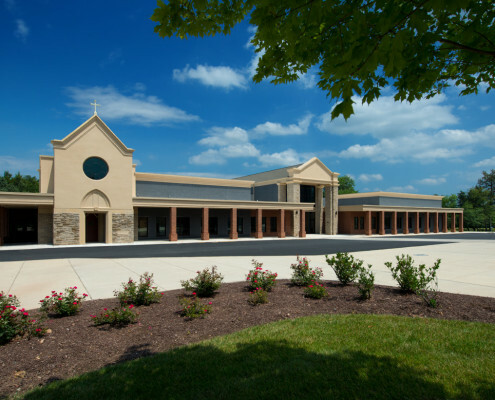 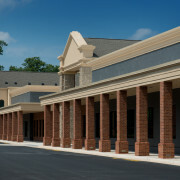 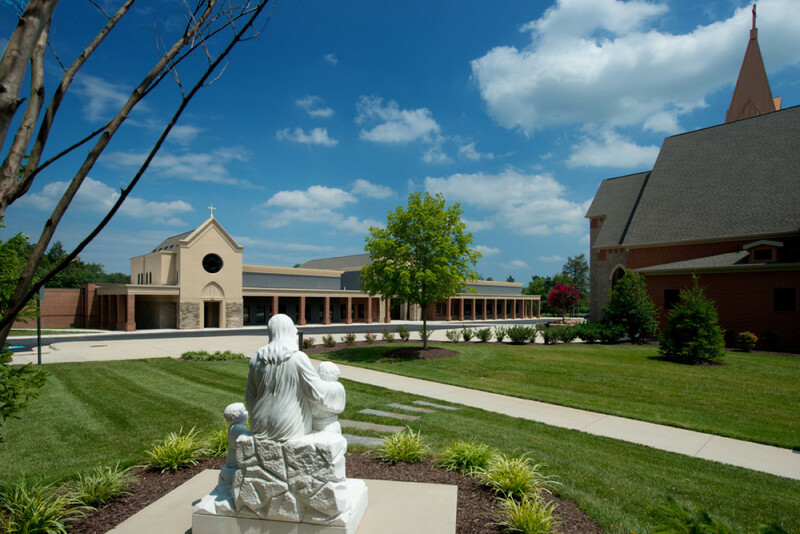 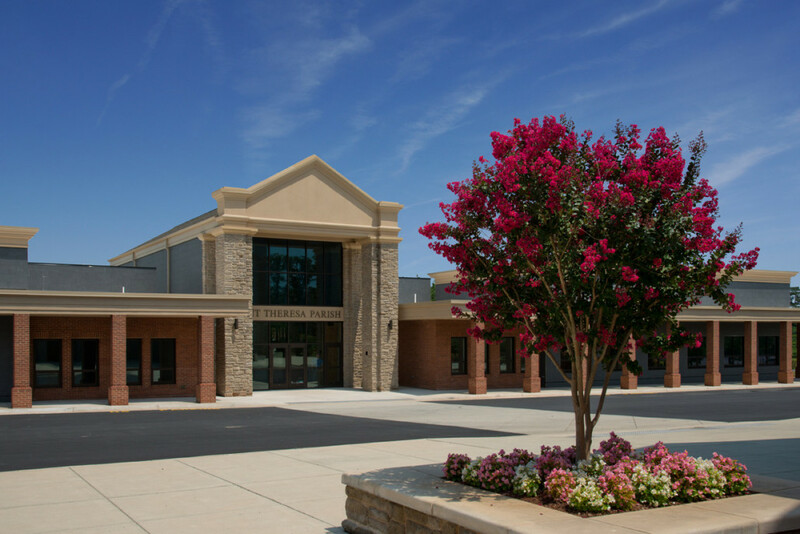 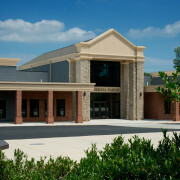 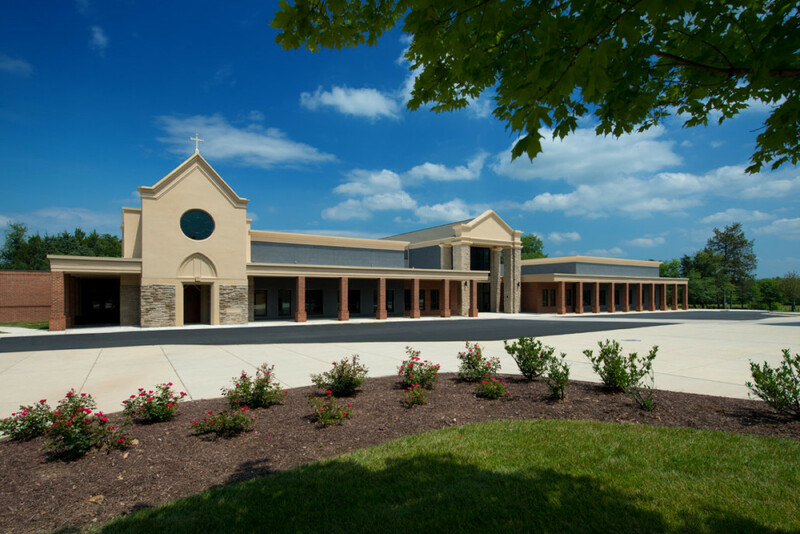 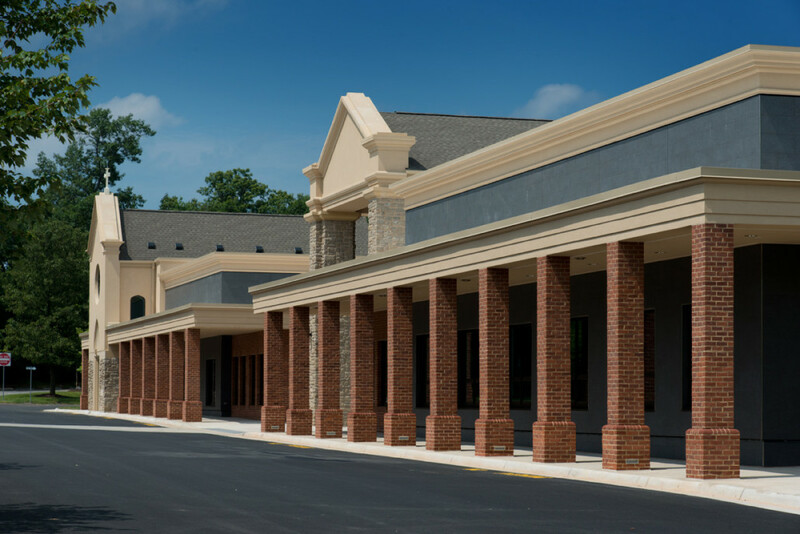 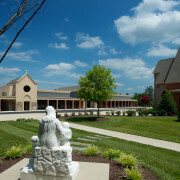 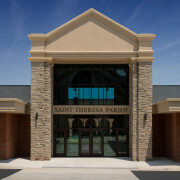 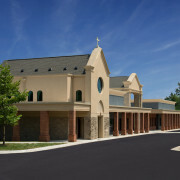 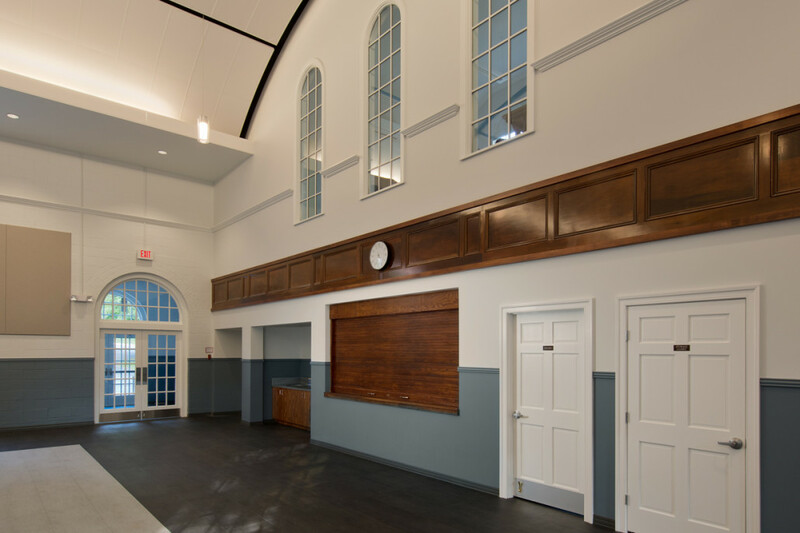 St. Theresa’s Parish addition and renovation was a 20,665 SF multi-phase addition and renovation of an occupied school in Ashburn, VA. 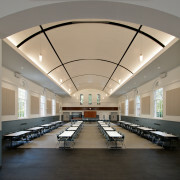 The 16,138 SF addition infilled two wings of the existing school creating a courtyard between the existing U-shaped elevation of the school and the new addition. 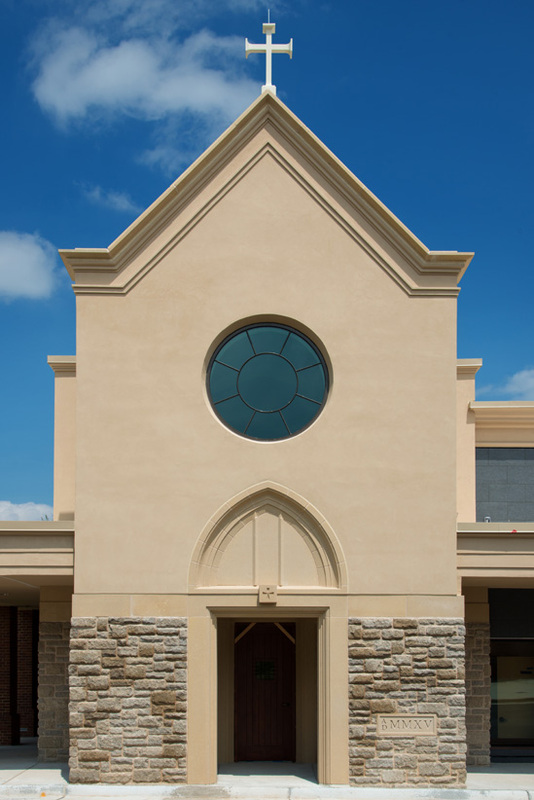 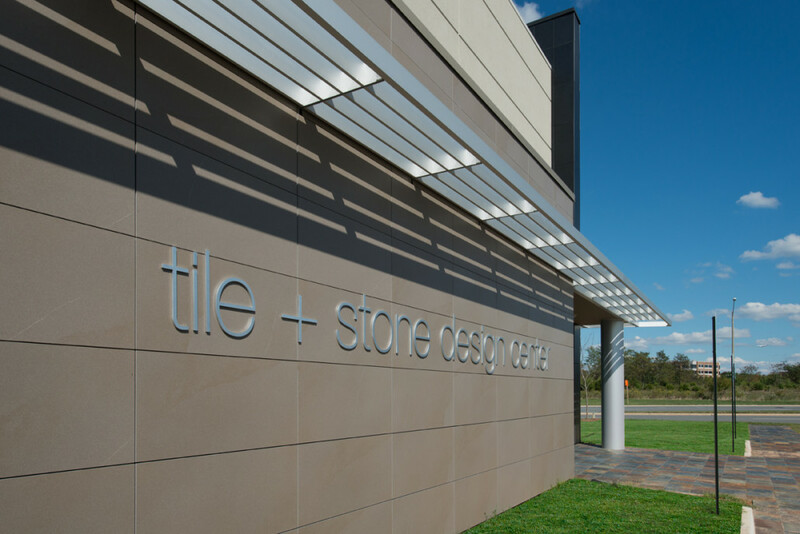 The addition façade is composed of multiple materials including brick, porcelain tile, architectural and modular precast stone and EIFS. 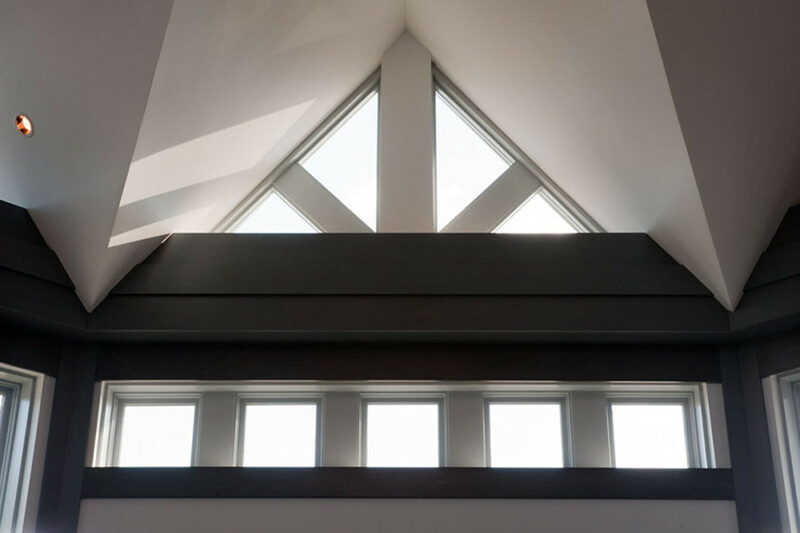 Inside, the addition entry features maple column and beam wraps, porcelain tile flooring and a peaked roof with pendant light fixtures. 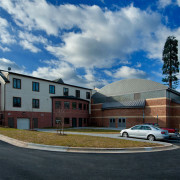 Flanking the main entry is office space for the school faculty and staff as well as a chapel, clinic, and multi-purpose rooms that can be divided as necessary with the use of new operable partitions. 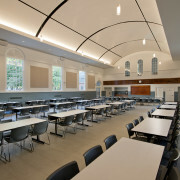 The renovation was completed over summer break and includes modifications to offices and classrooms to better serve the needs of the school. 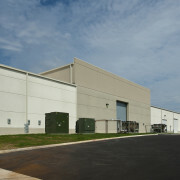 East Severn Way is a speculative built 68,726 SF flex industrial facility. 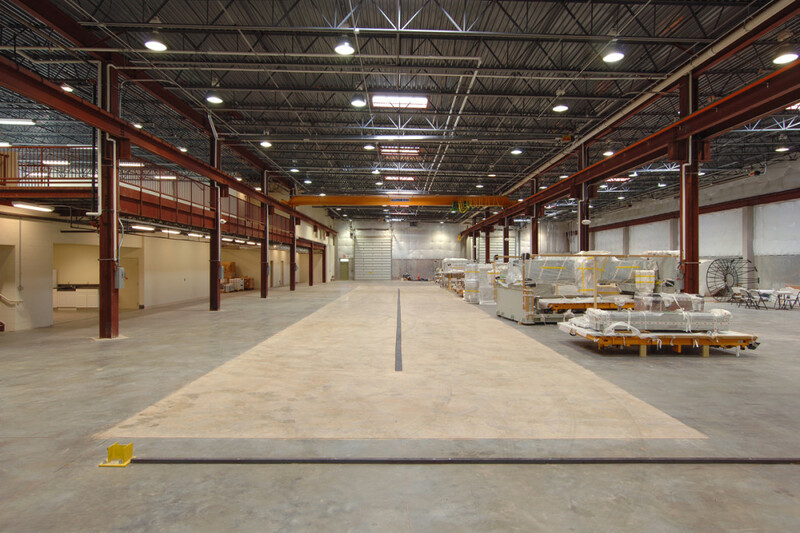 The building construction is concrete tilt up with cast in place concrete retaining wall/walk way at the front elevation. 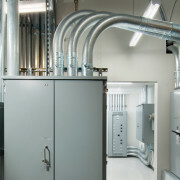 An underground primary electric cable was discovered at the onset of construction creating many challenges for efficient completion of the building foundations and site work. 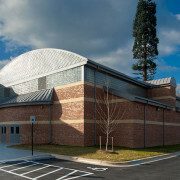 Architect: W.A. 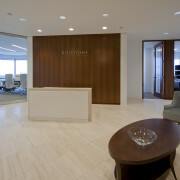 Brown & Associates, P.C. 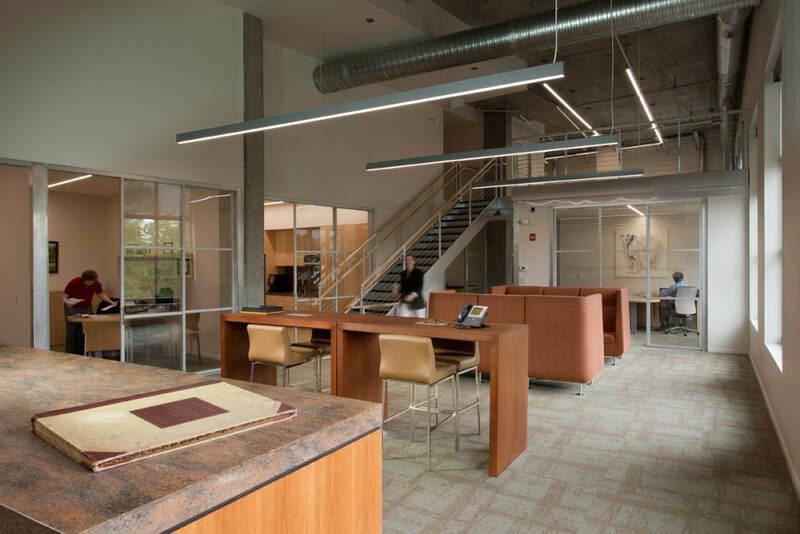 Civil Engineer: Rinker Design Associates, P.C. 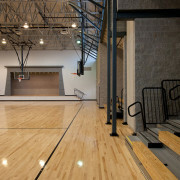 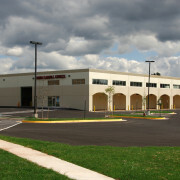 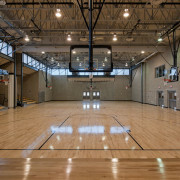 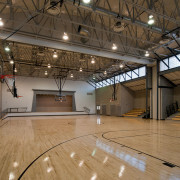 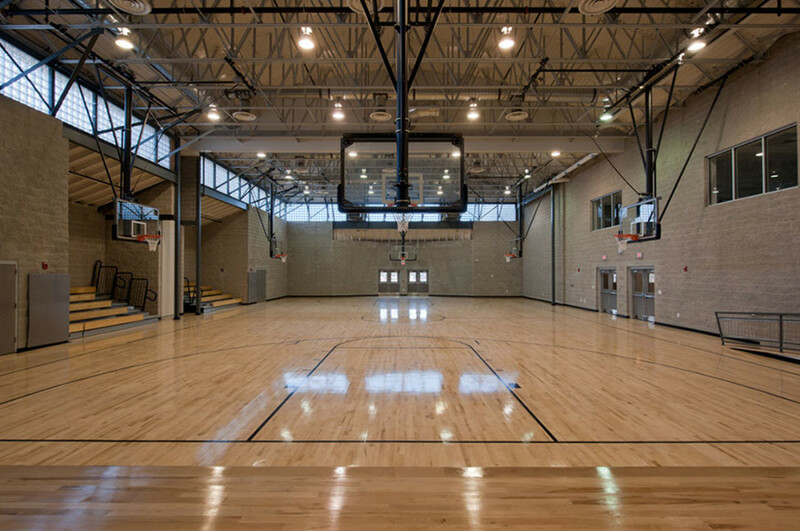 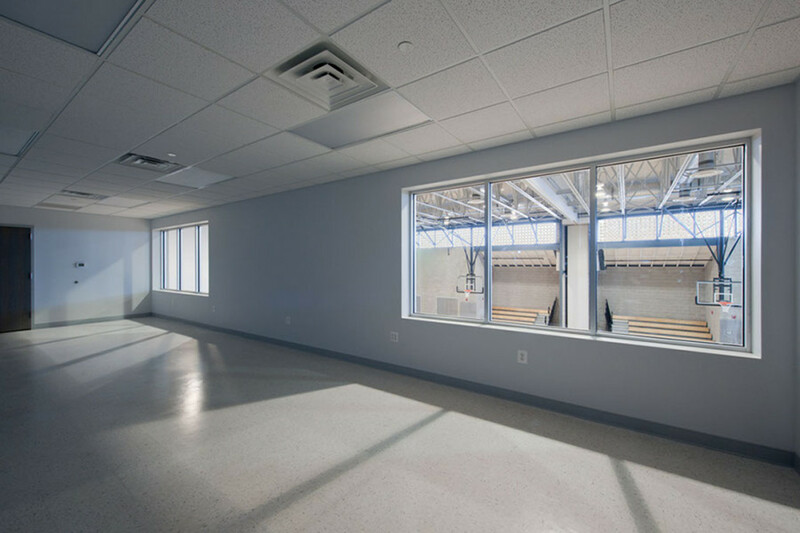 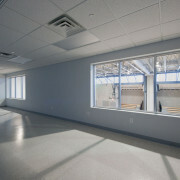 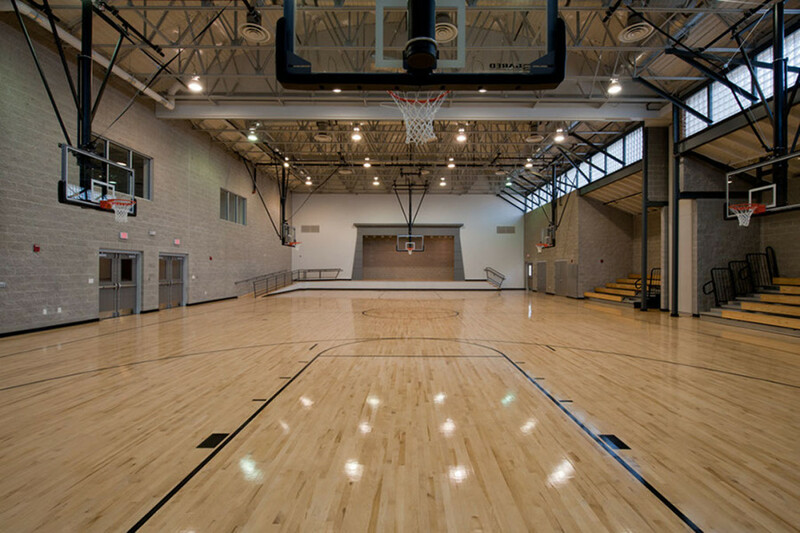 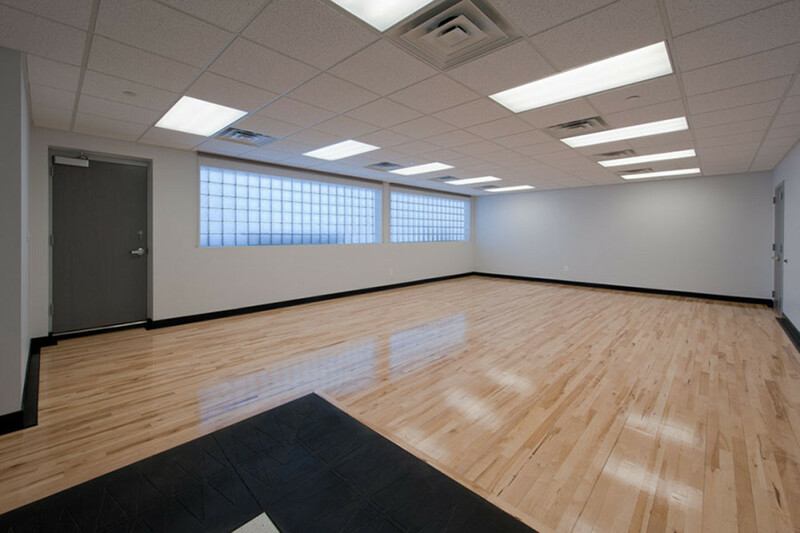 The Youth Activity Center was a 20,000 SF addition to an occupied facility, built to tie two existing buildings together. 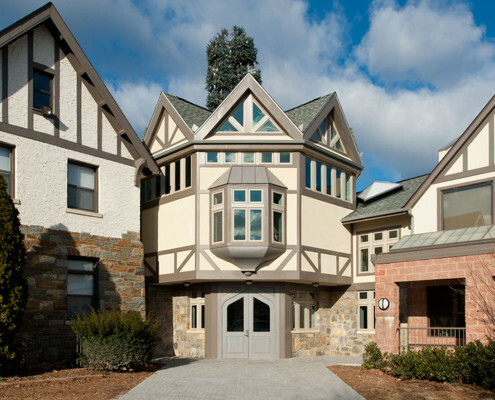 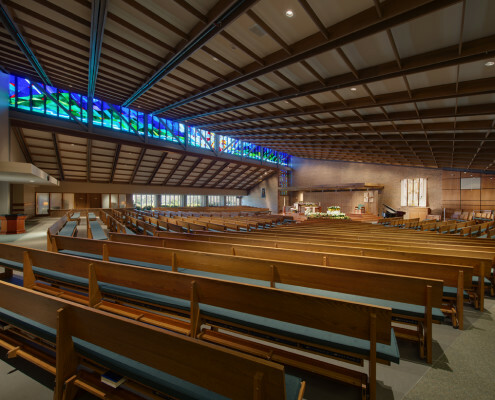 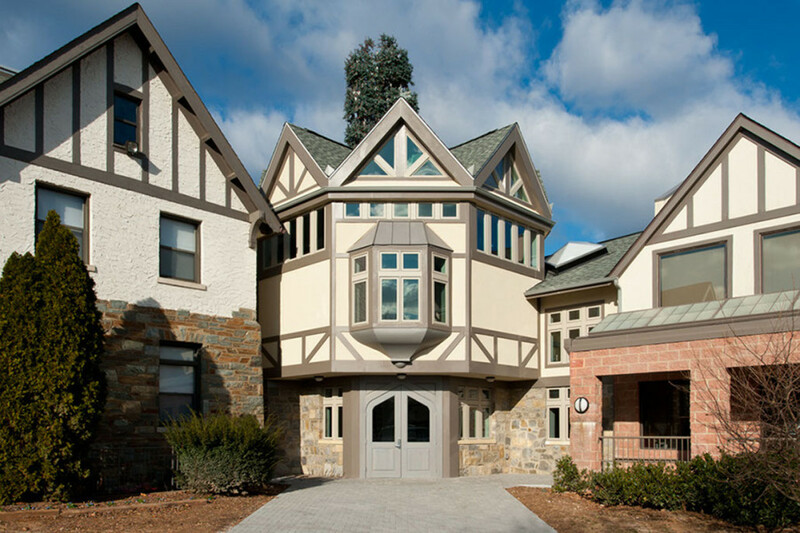 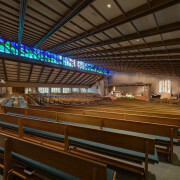 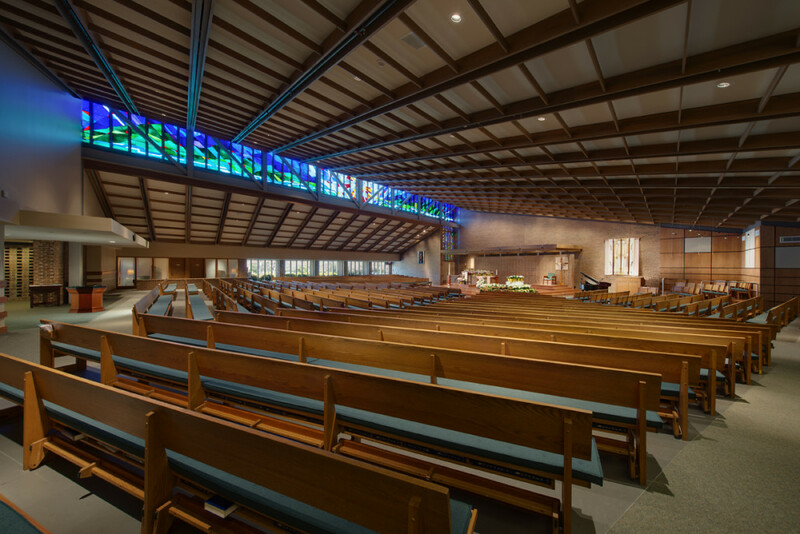 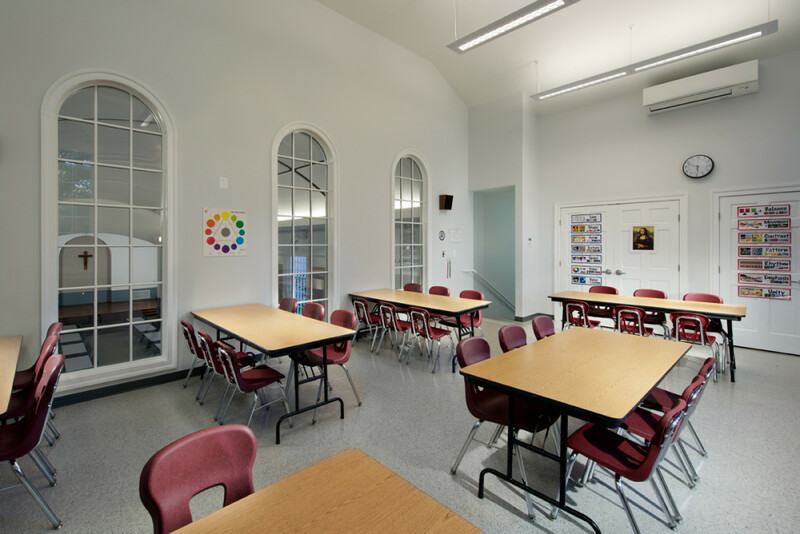 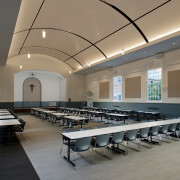 The project included a gymnasium, a full service kitchen, a dining room, a dance studio, a band room, staff offices, classrooms, conference rooms, and an octagonal chapel. 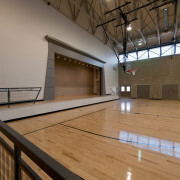 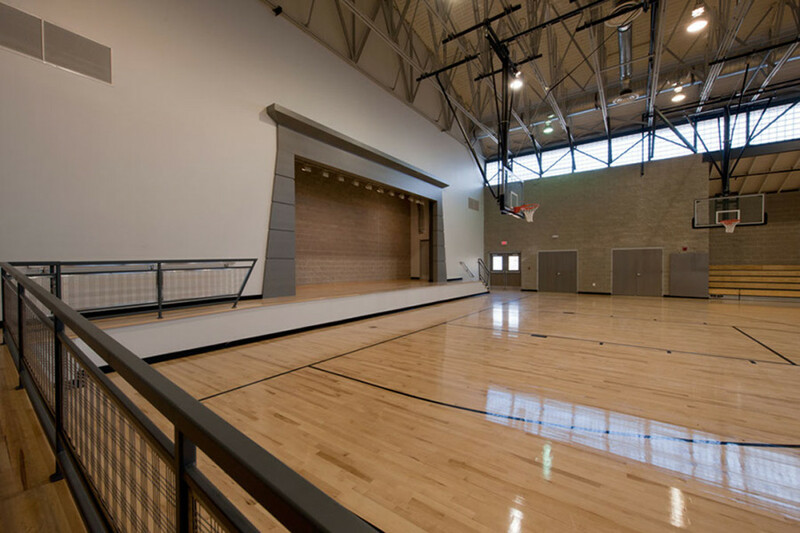 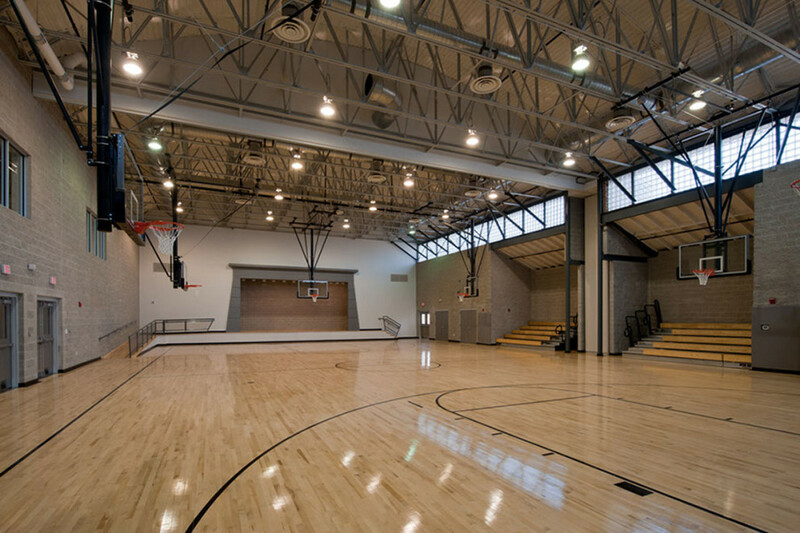 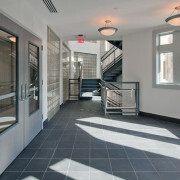 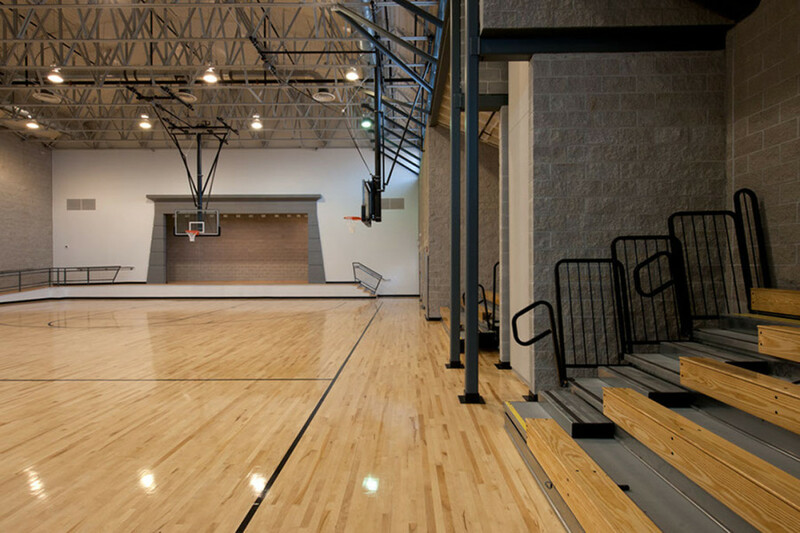 The design included a monumental stair and a glass block band in the gymnasium to allow natural lighting. 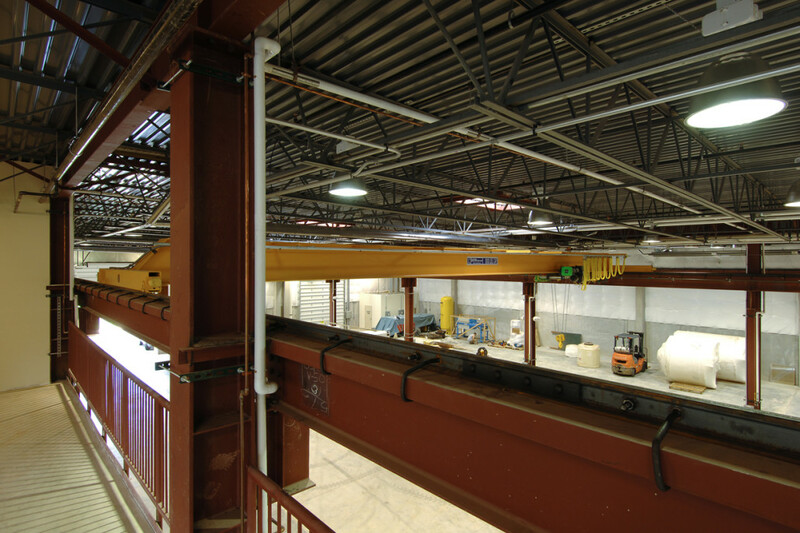 Structural Engineer: O’Donnell & Naccarato, Inc. 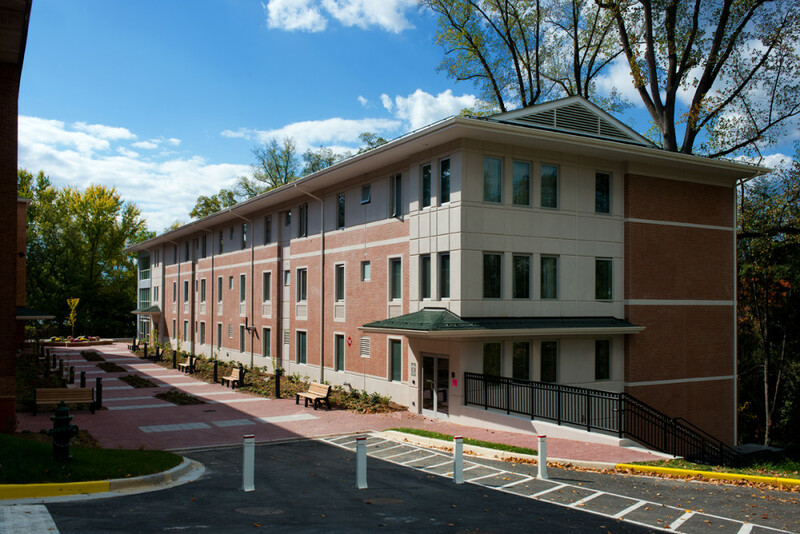 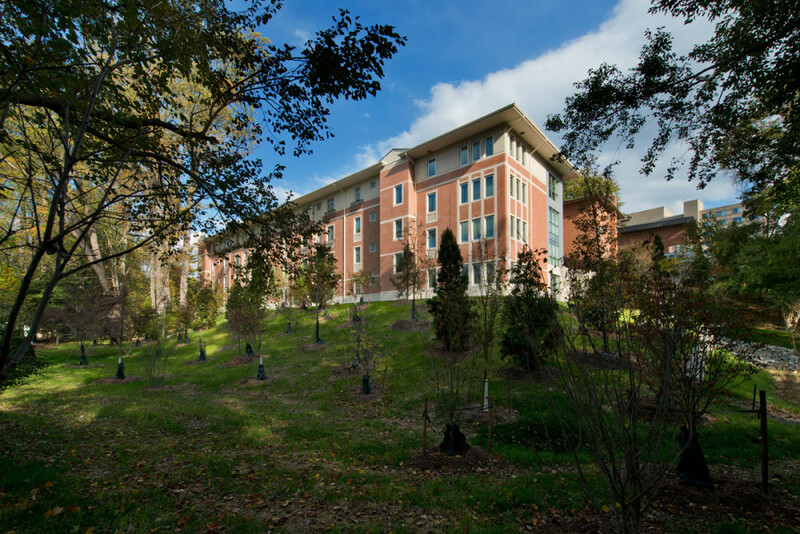 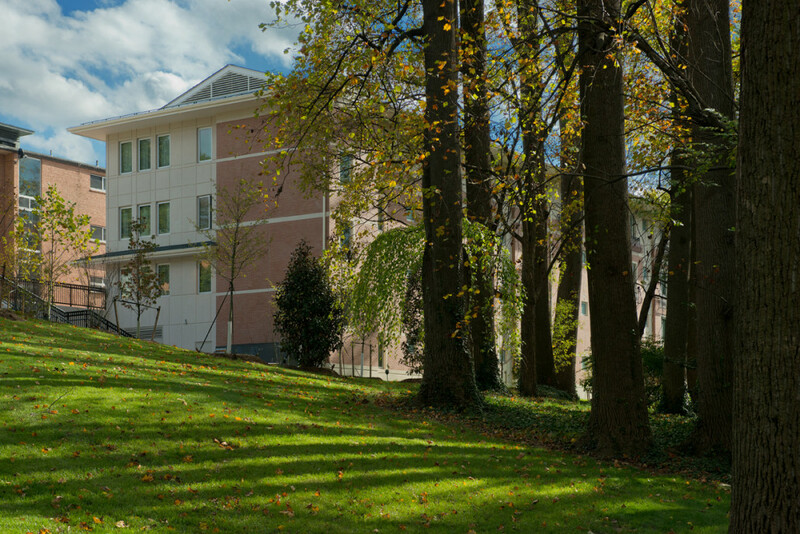 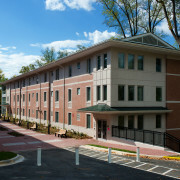 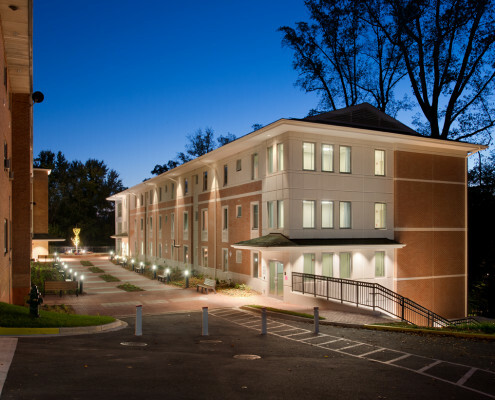 This video shows the construction of a new four story dormitory on the campus of Wesley Theological Seminary. 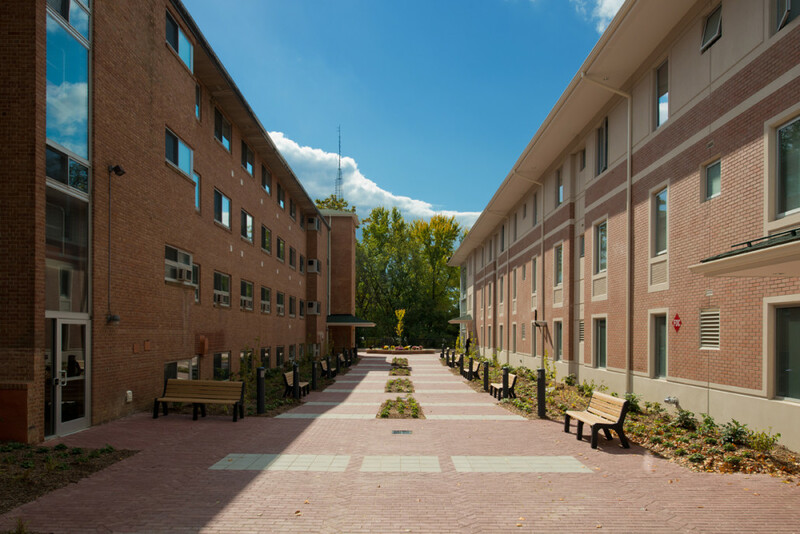 The design-build team used the creative approach of Tilt-Up Concrete to build a lasting economical solution to the housing needs on the fifty year old campus. 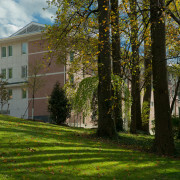 The steeply sloping site with its large tree population, proximity to an operating dormitory, and limited site access created many challenges. 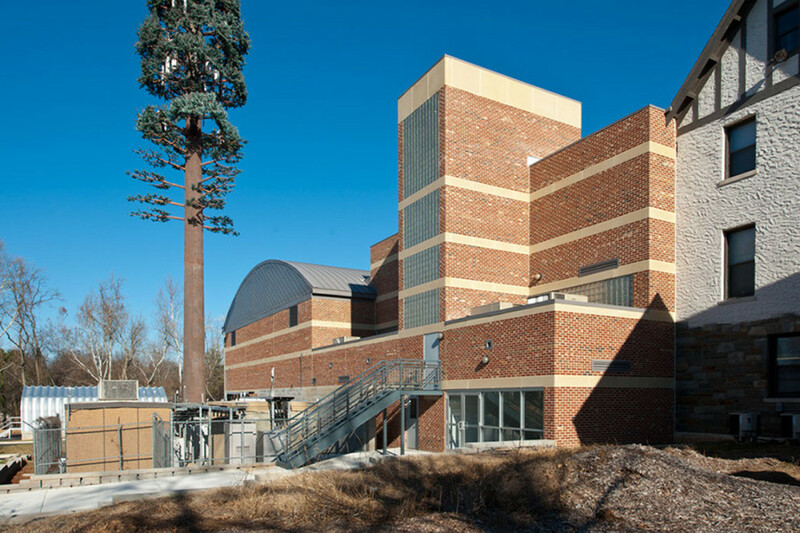 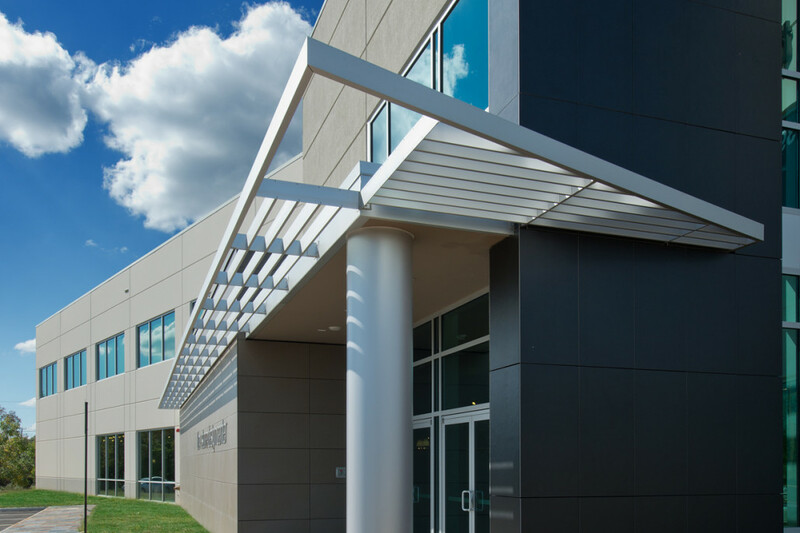 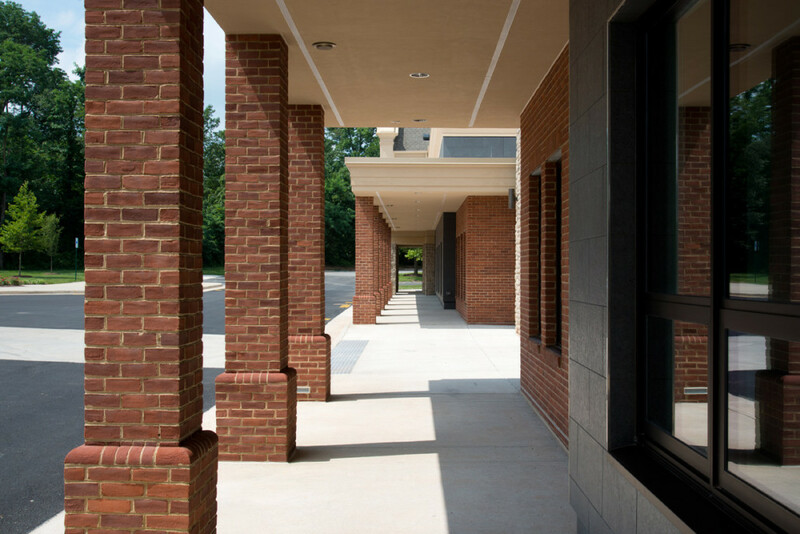 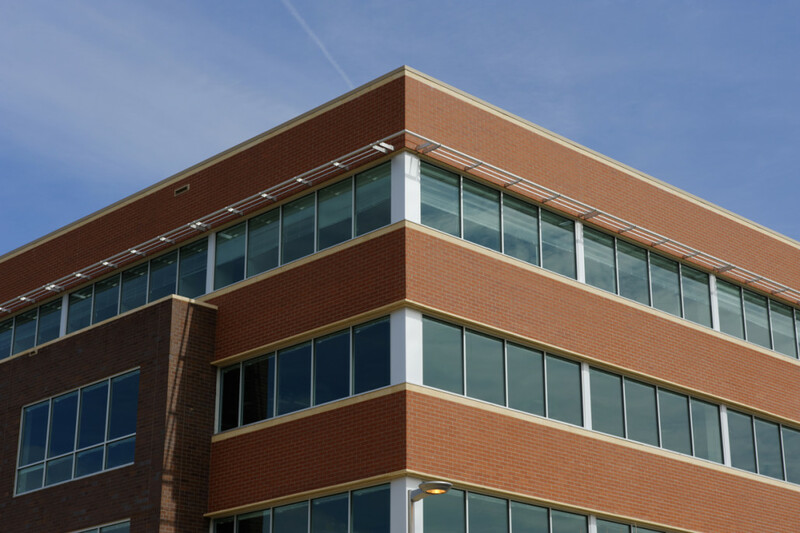 Vantage incorporated an inlayed brick system in the concrete tilt up panels to allow the building to blend and complement the existing campus. 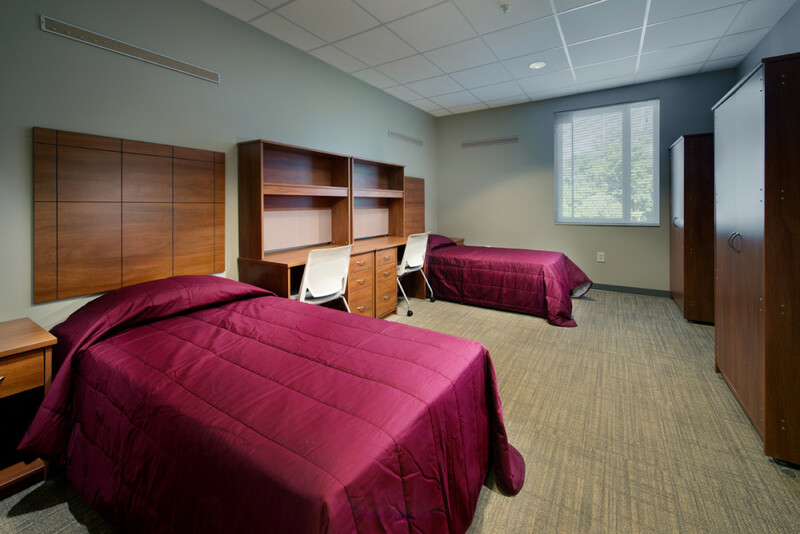 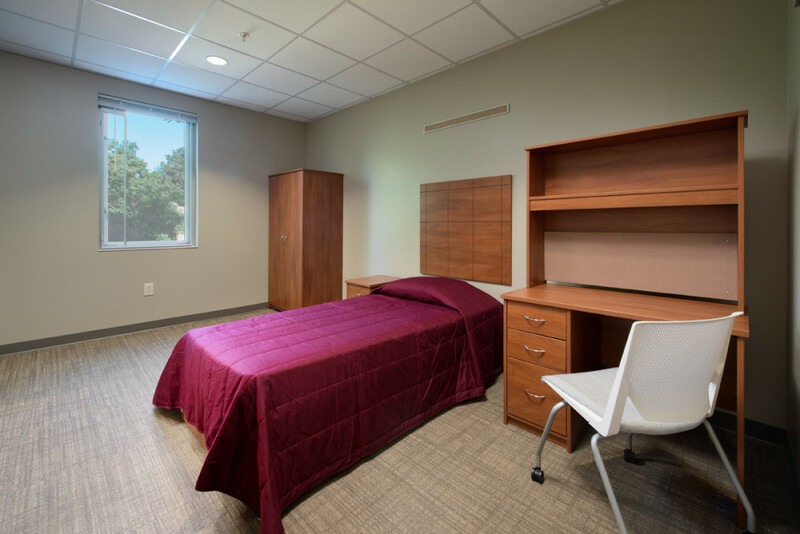 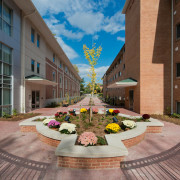 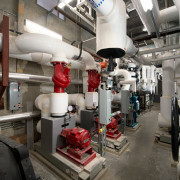 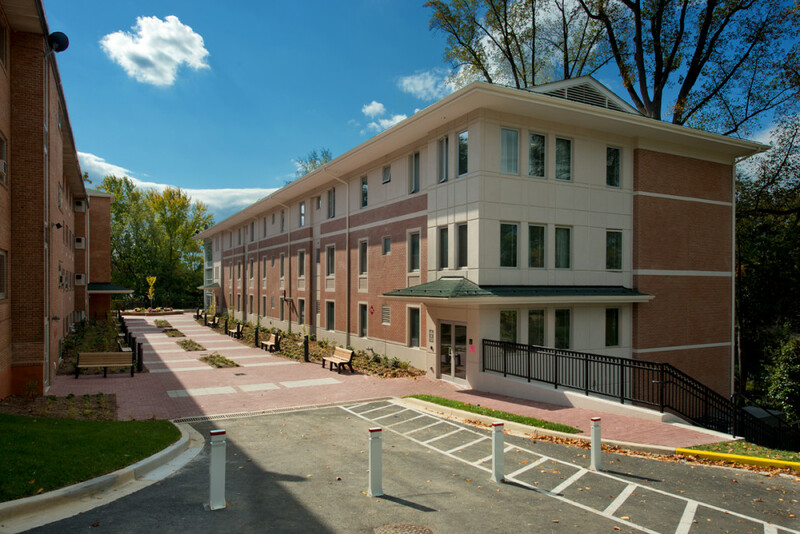 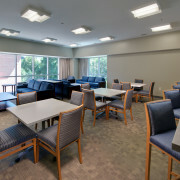 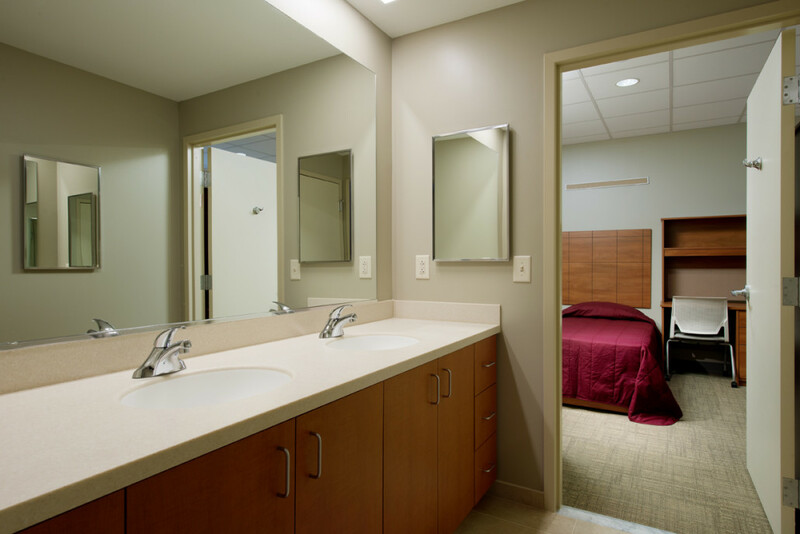 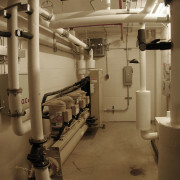 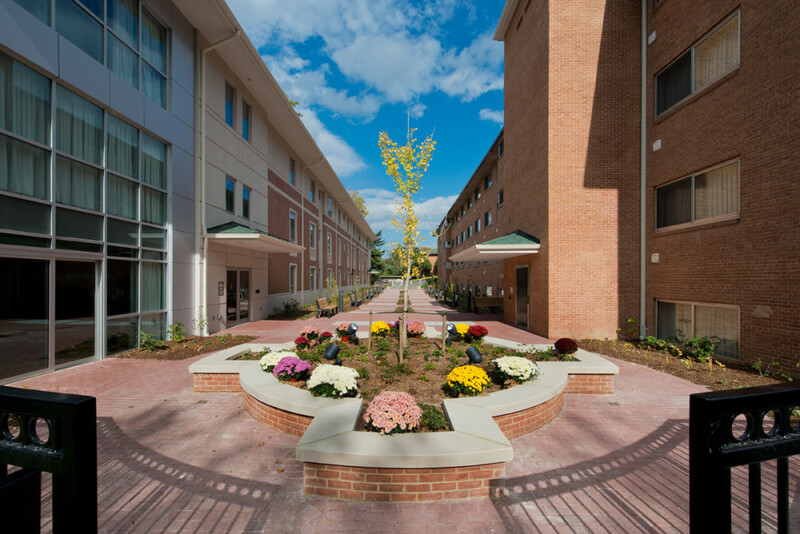 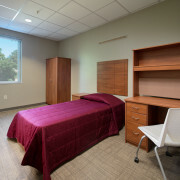 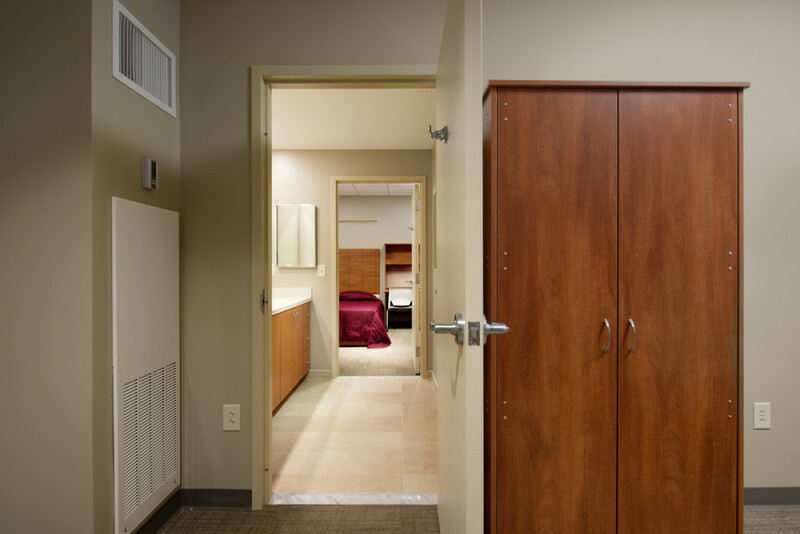 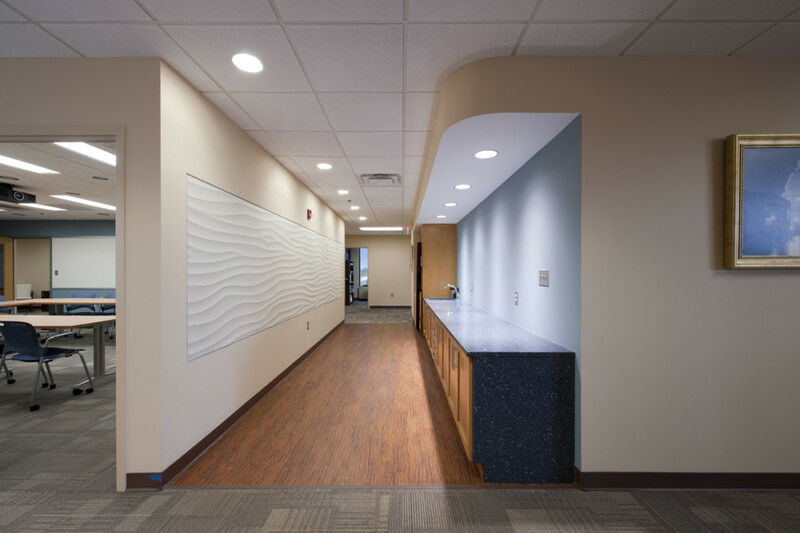 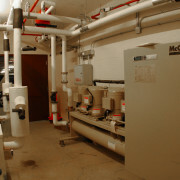 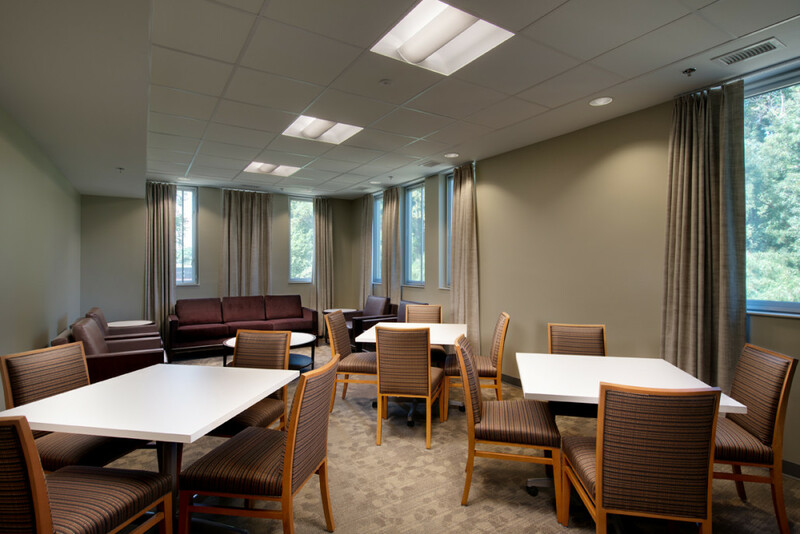 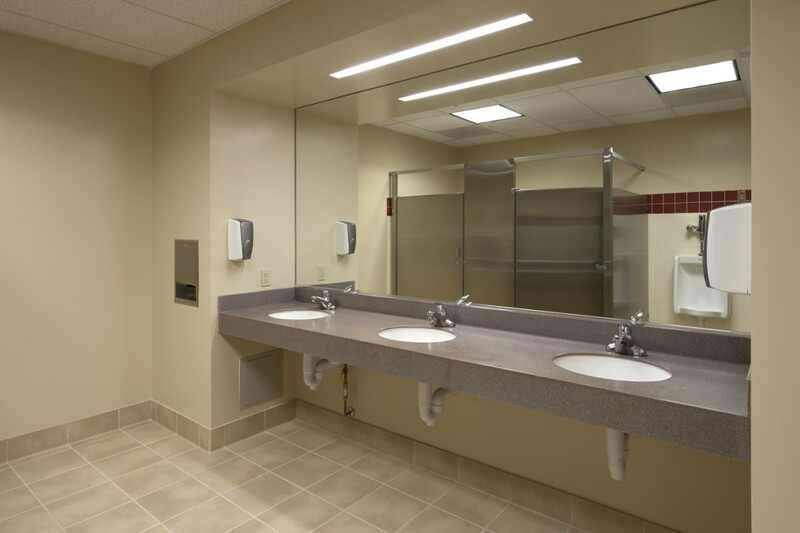 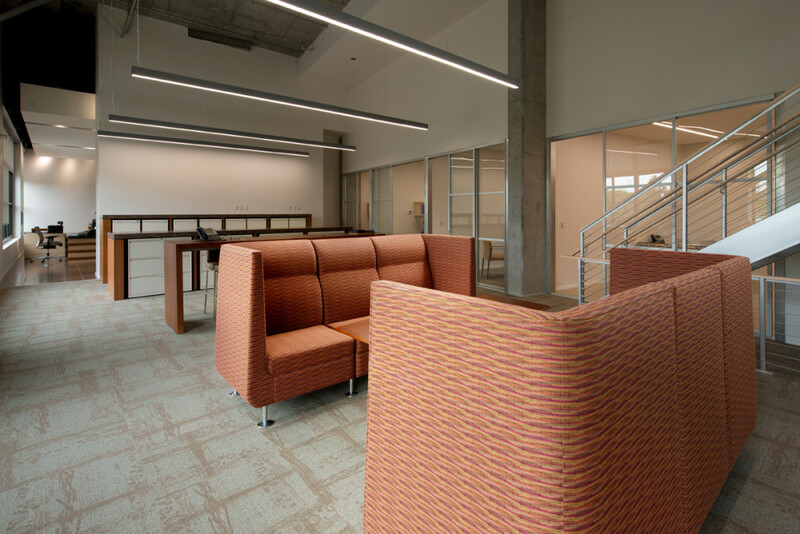 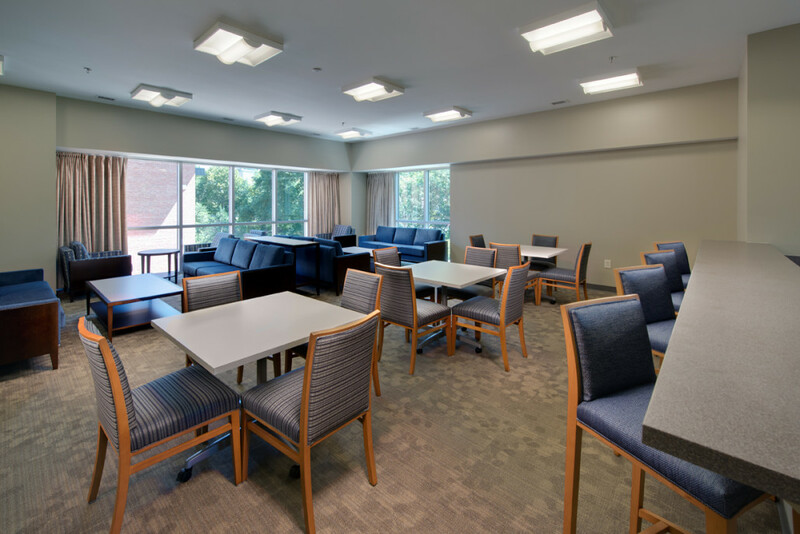 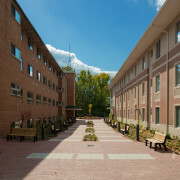 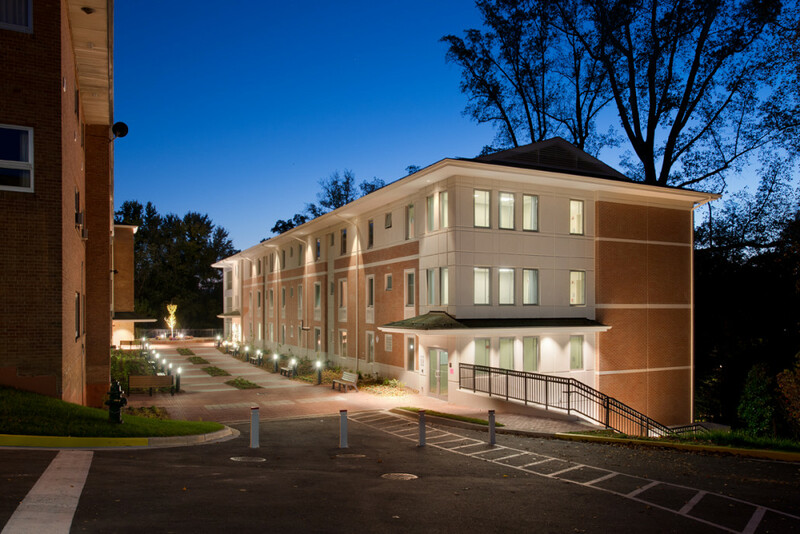 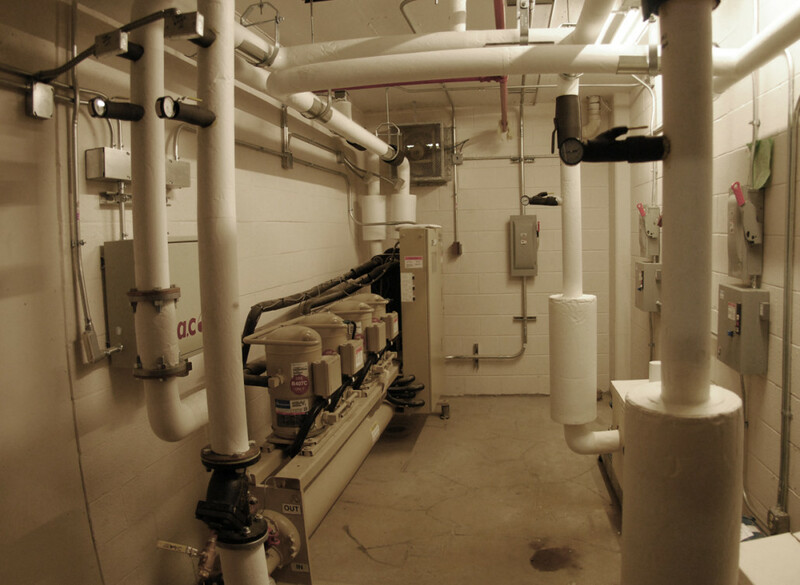 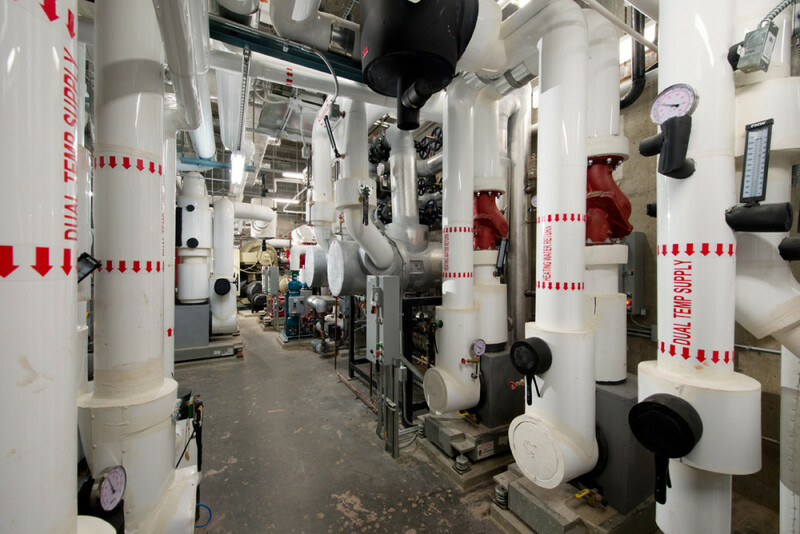 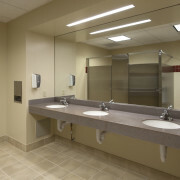 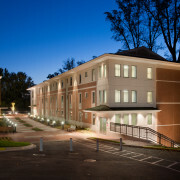 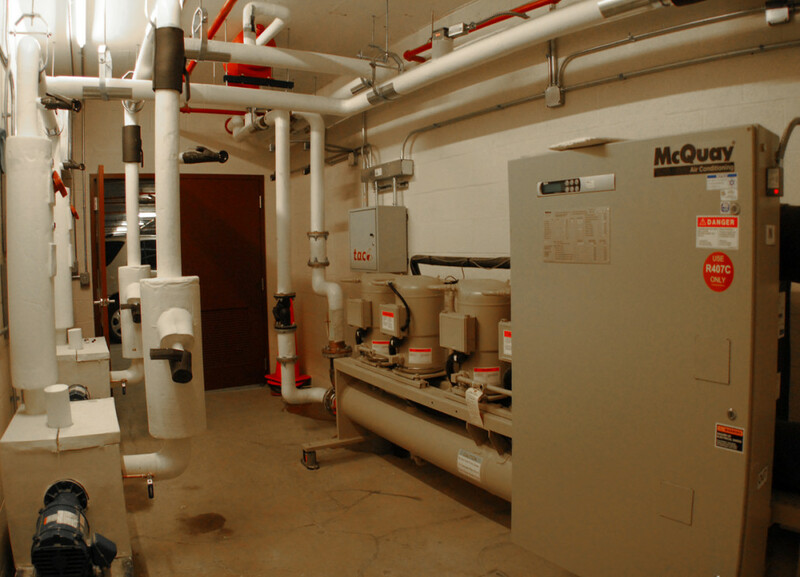 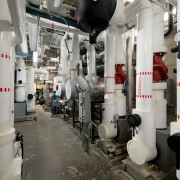 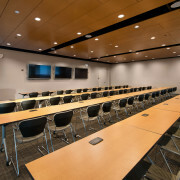 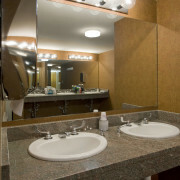 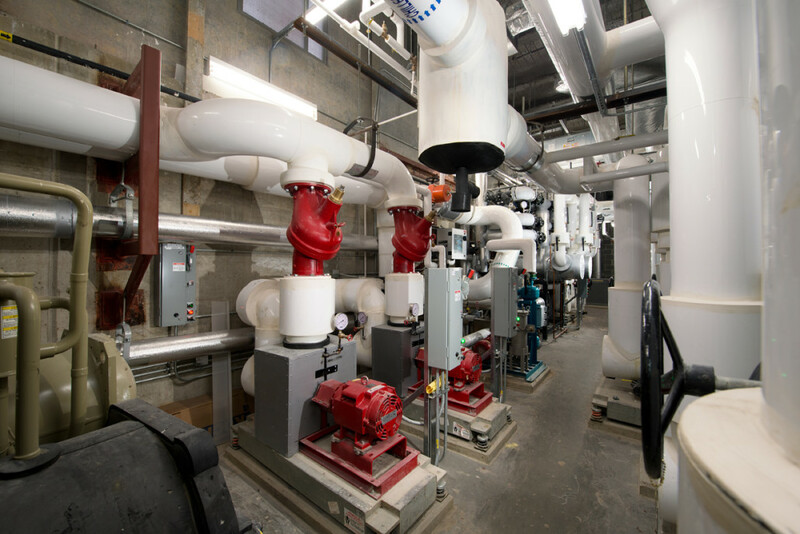 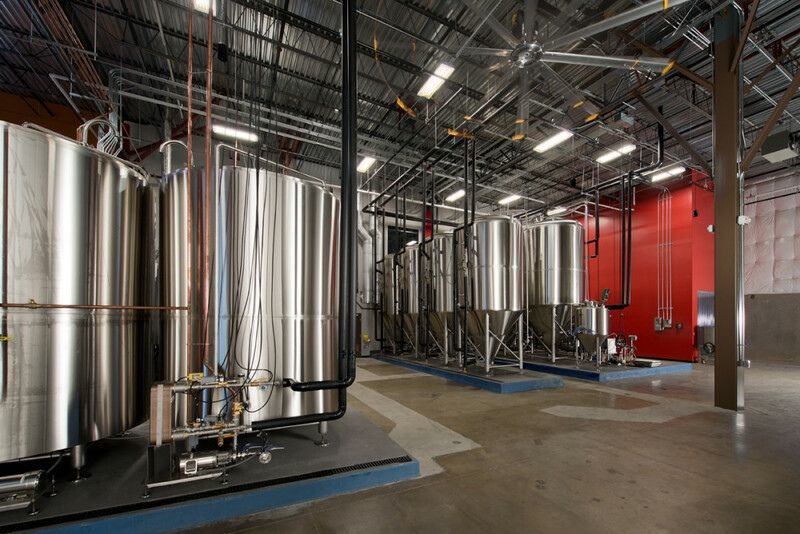 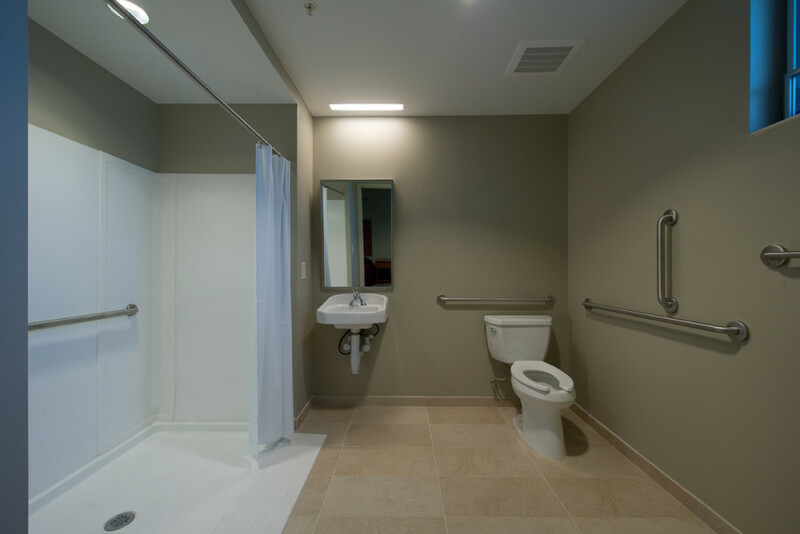 The project included single occupancy, hoteling, and double occupancy rooms as well as a new central plant to serve the entire campus’ heating and cooling needs. 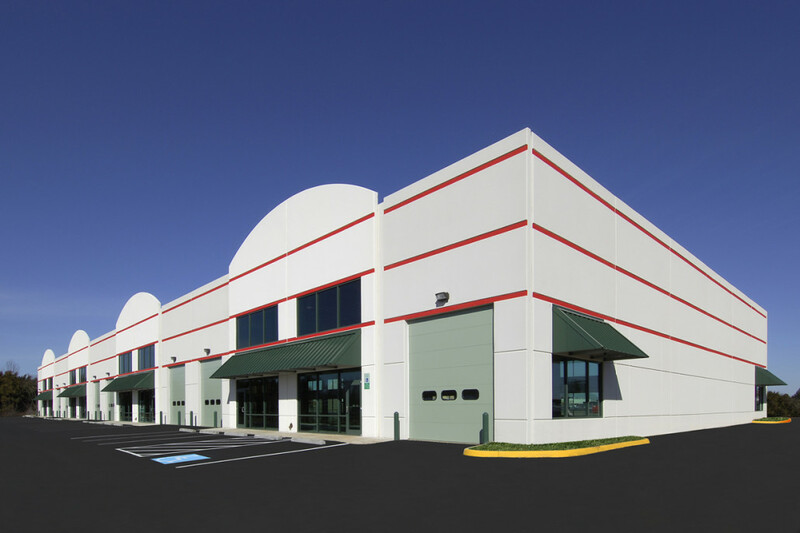 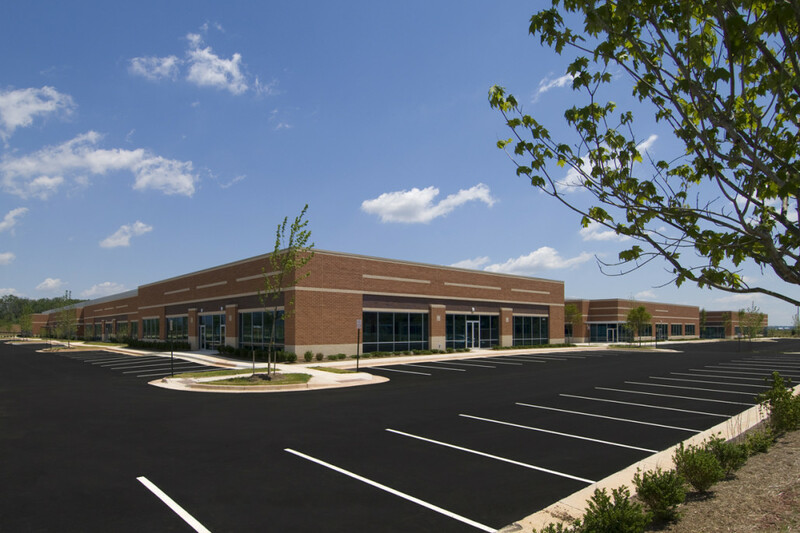 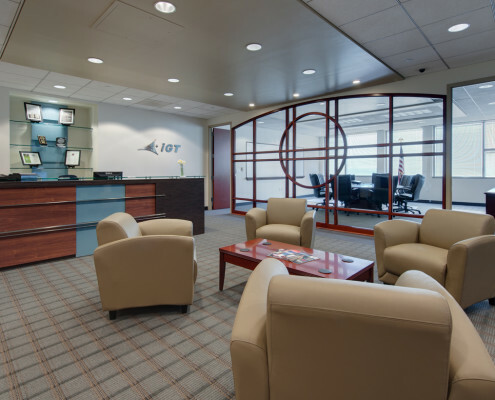 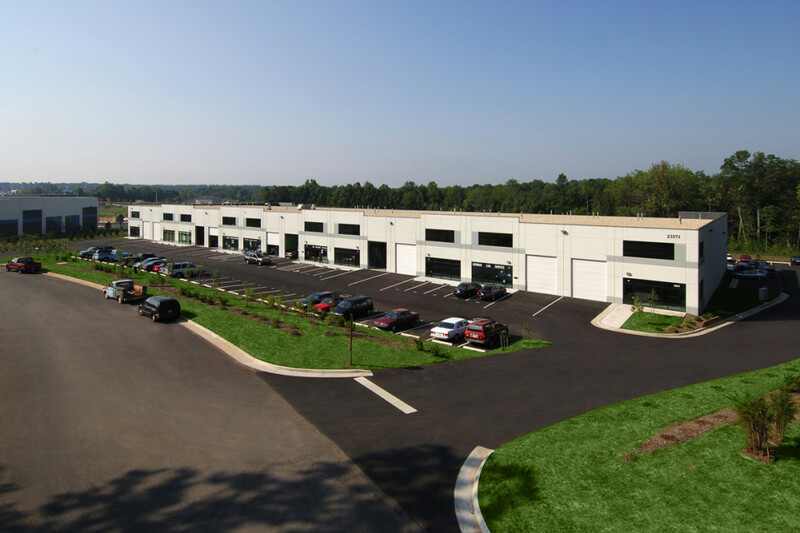 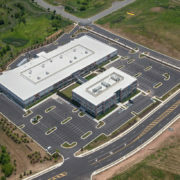 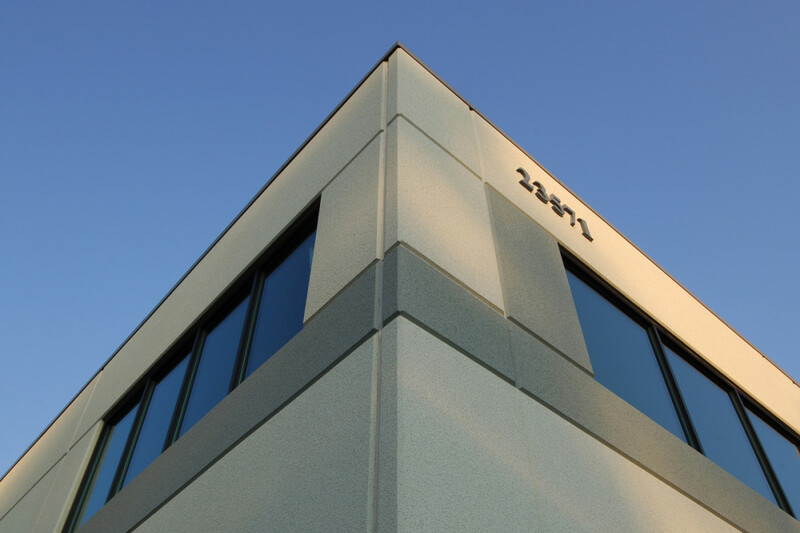 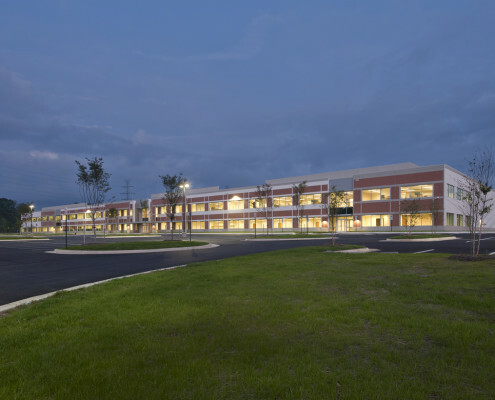 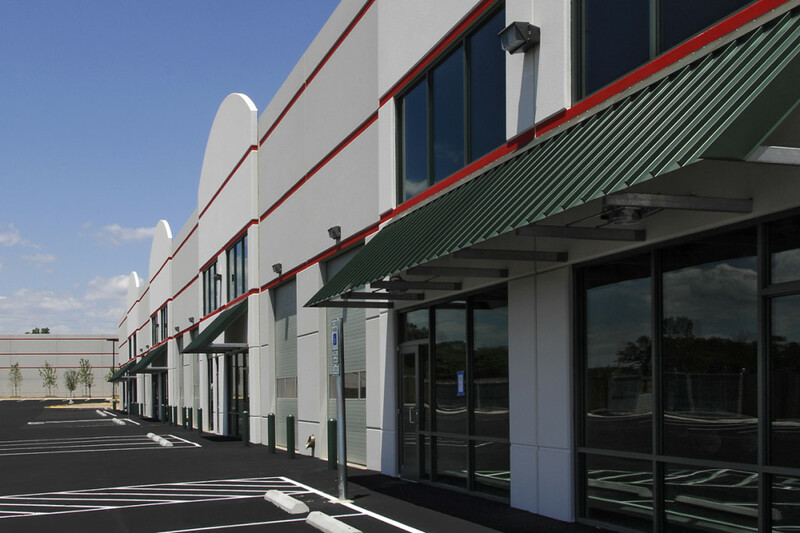 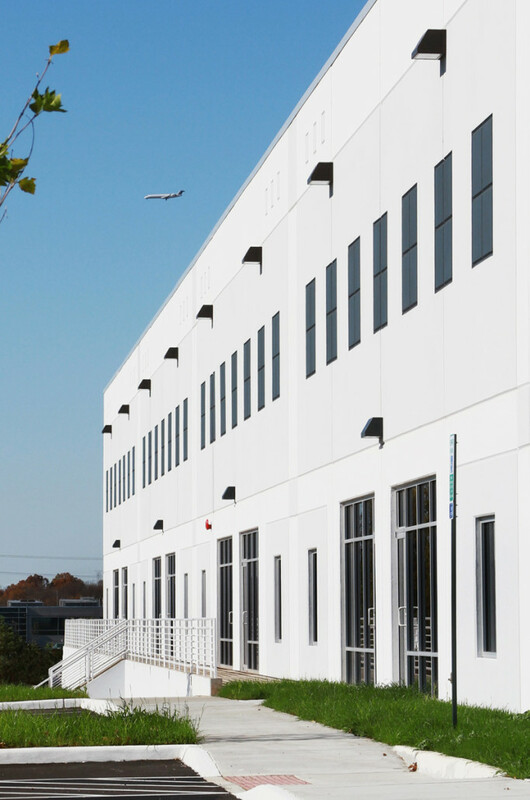 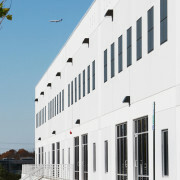 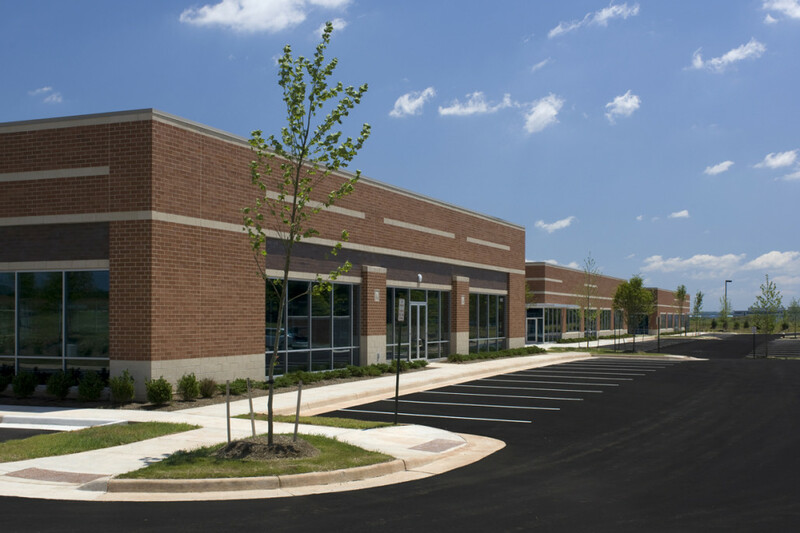 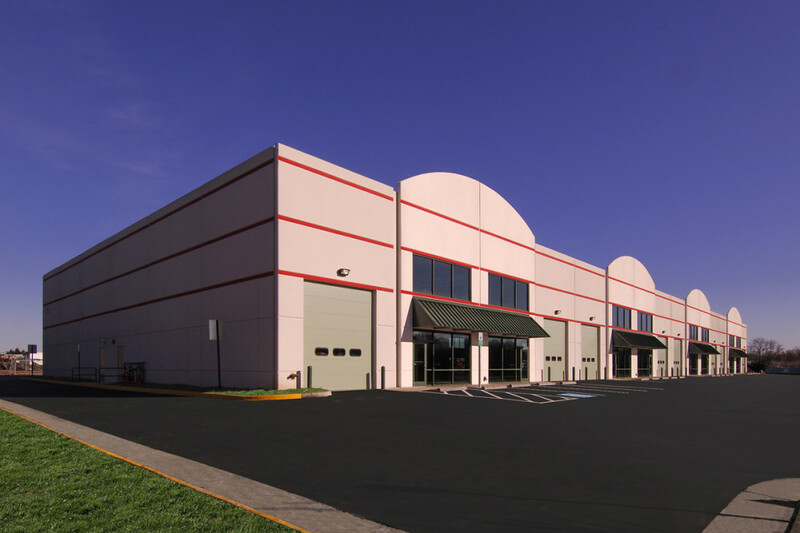 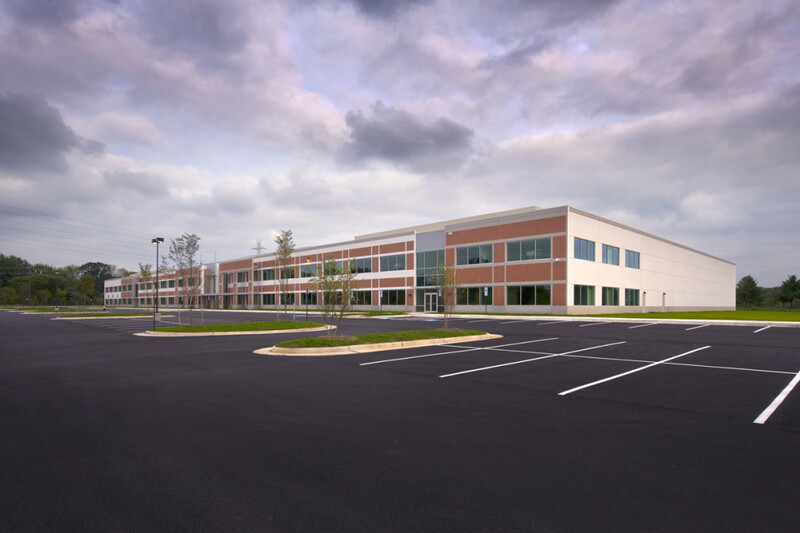 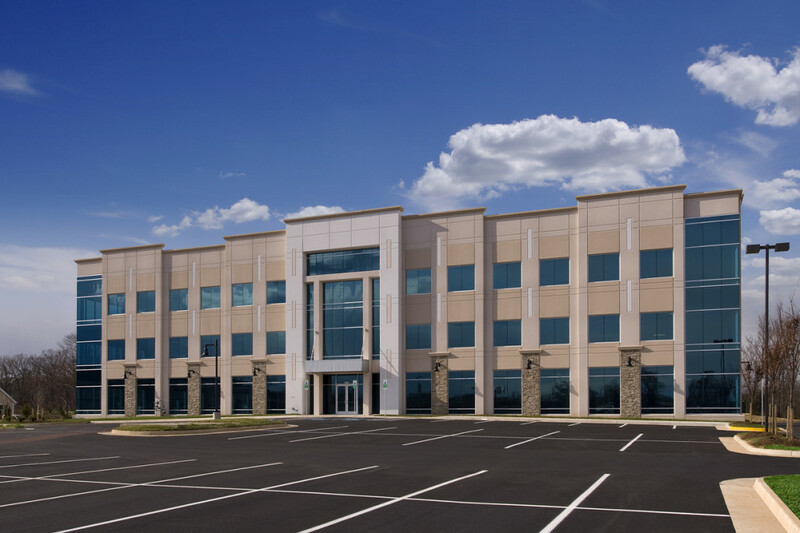 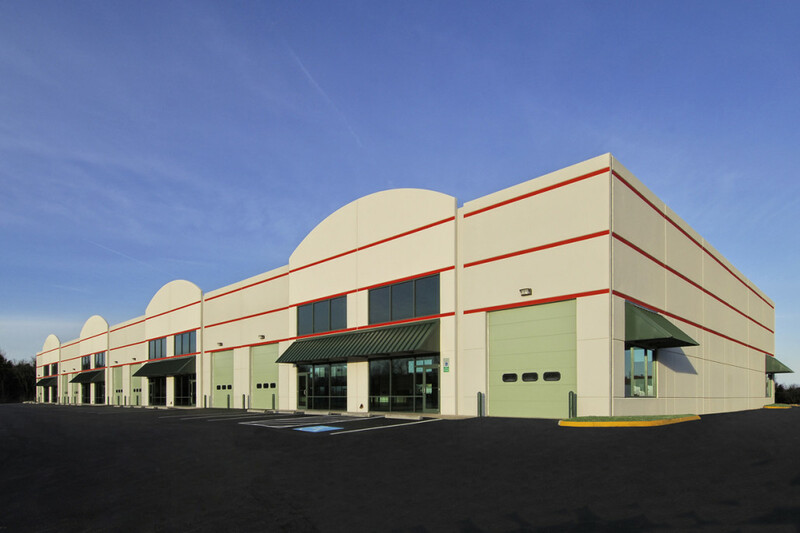 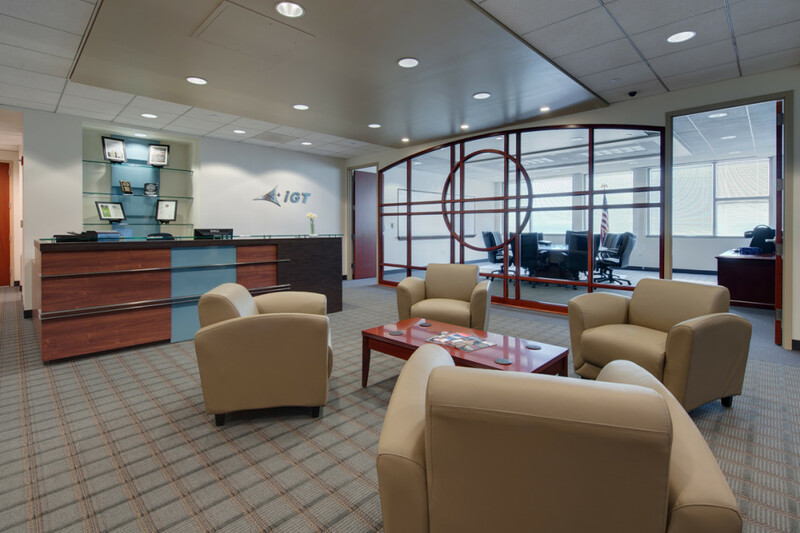 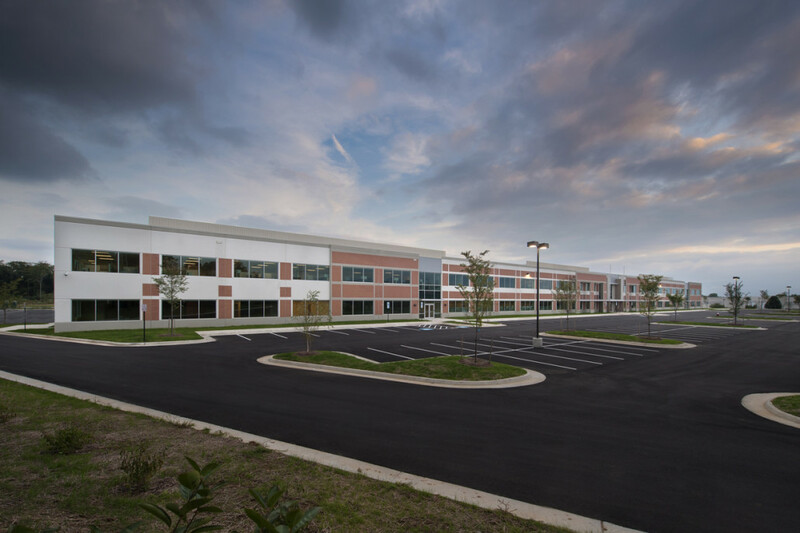 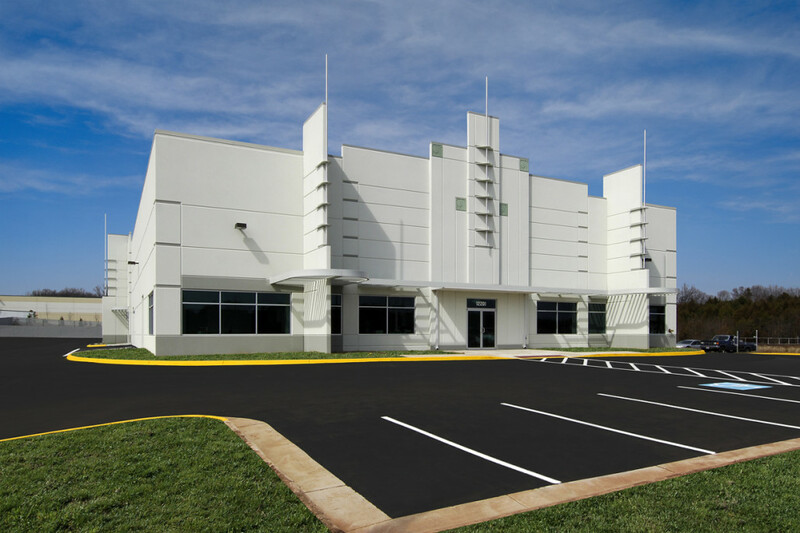 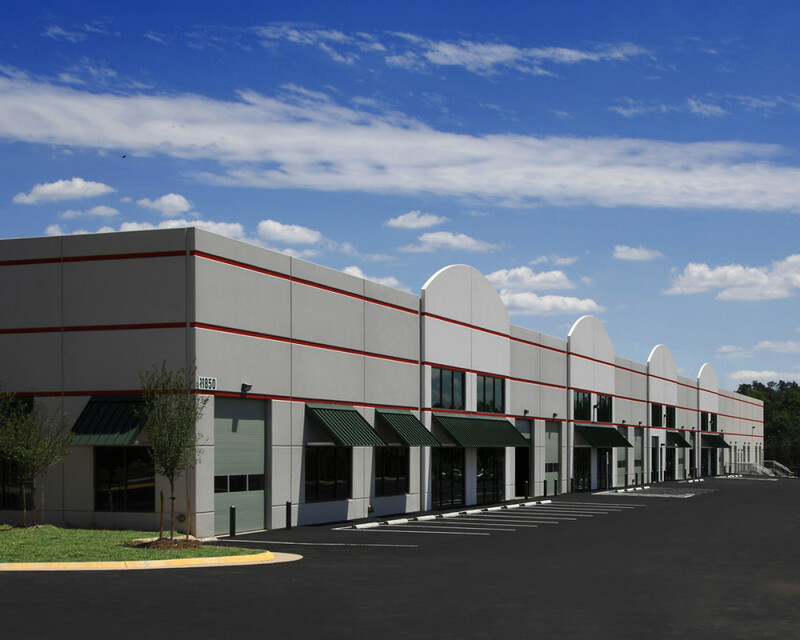 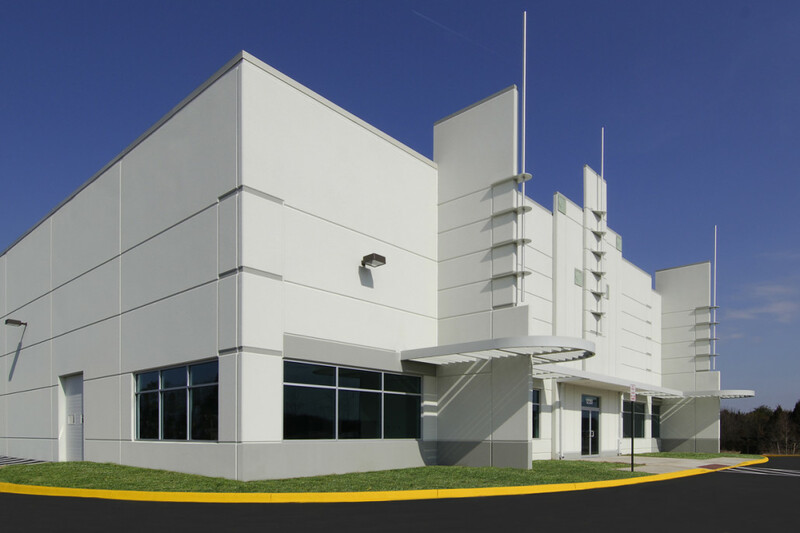 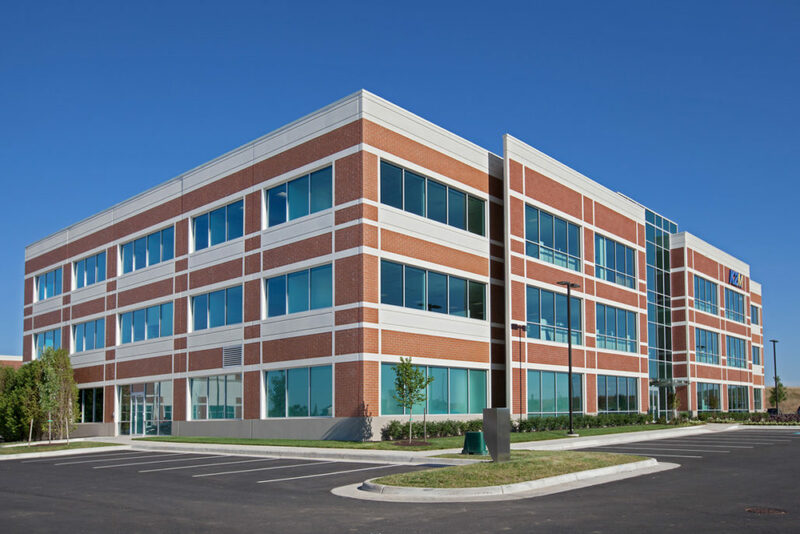 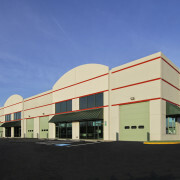 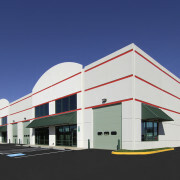 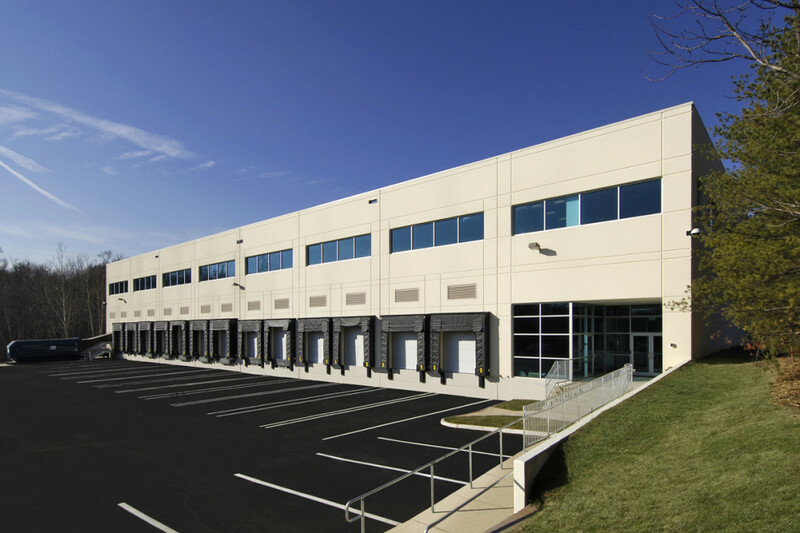 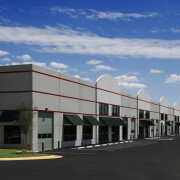 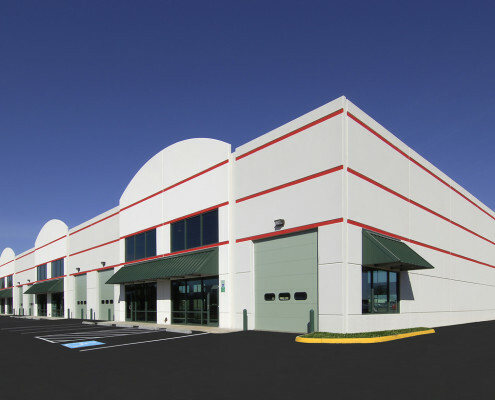 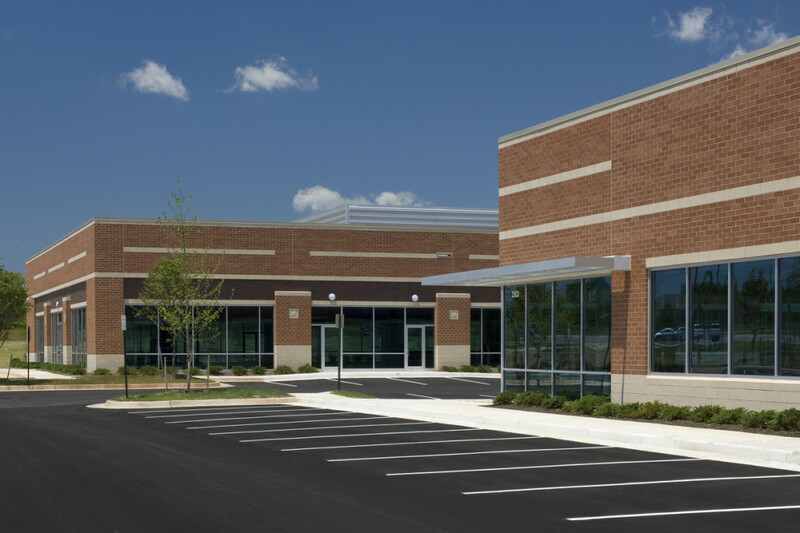 The Rockwell Collins project was a 178,178 SF build to suit tilt-up building with a full TI build out. 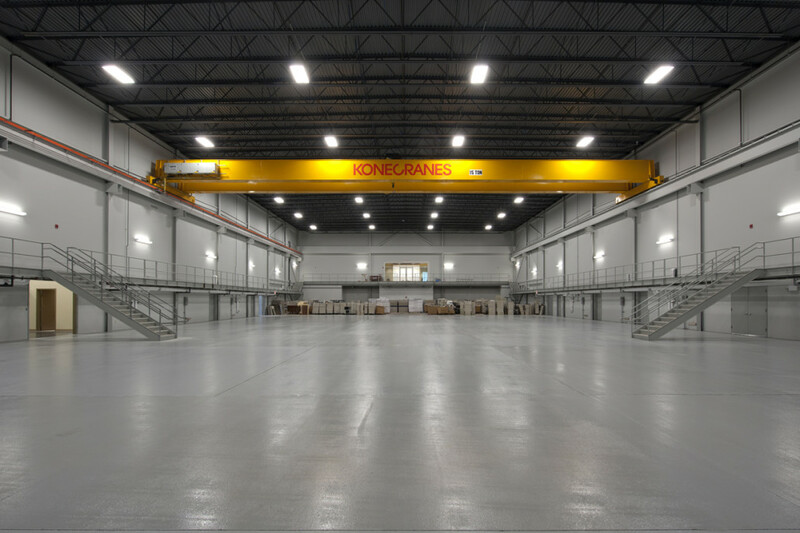 The project included a 200 ft x 100 ft bay, 32 ft clear with a 15 ton 100 ft clear span bridge crane, 82,000 SF of office space, and 75,000 SF of lab and production space. 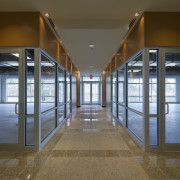 The project was completed in 54 weeks from the Groundbreaking to the Certificate of Occupancy. 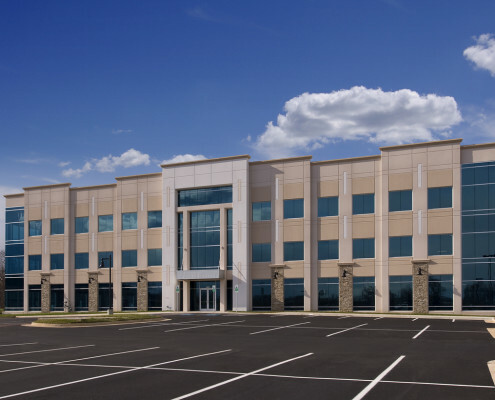 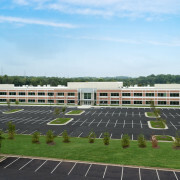 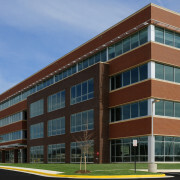 Quantico Center Building III is a 104,000 SF, four story class A office building in Prince William County, VA. 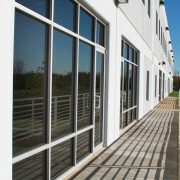 It is a speculative built steel frame office building, with masonry veneer and decorative aluminum solar shade leading to the glass/aluminum curtain wall at the main building entry. 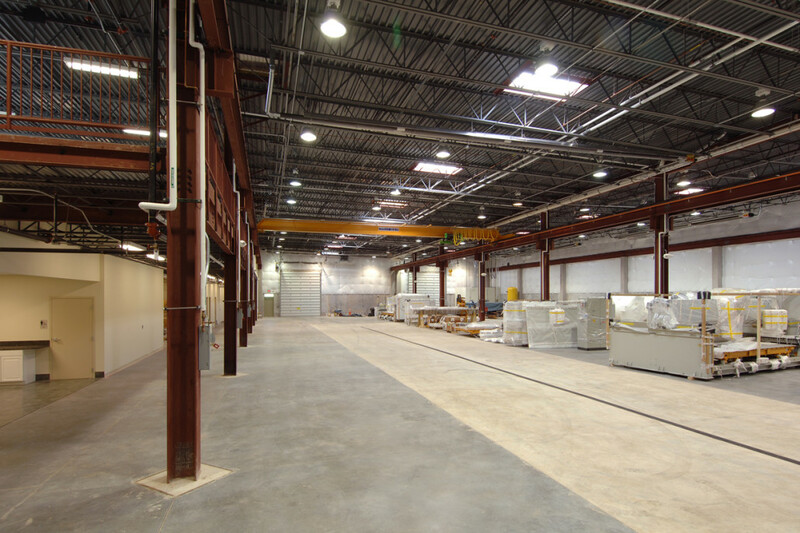 The project was completed 90 days ahead of schedule and the site conditions required extensive lime treatment of problem soils and large cuts to fills. 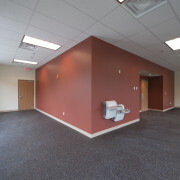 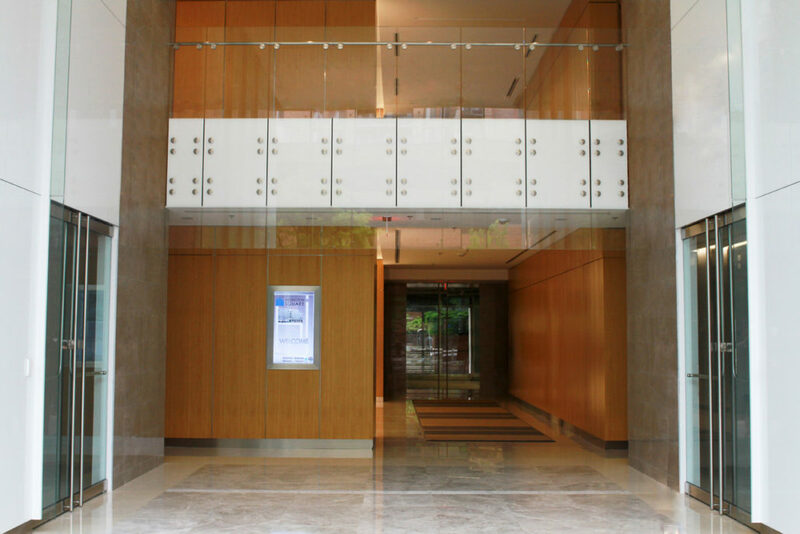 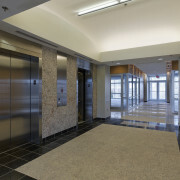 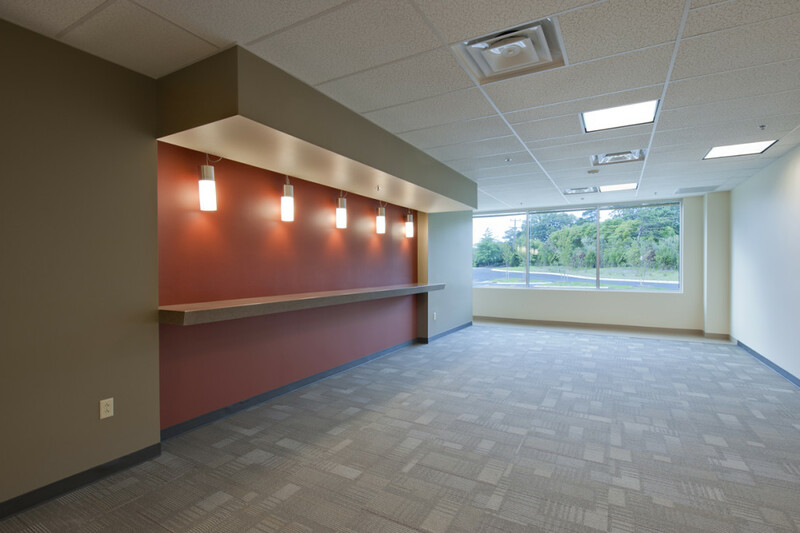 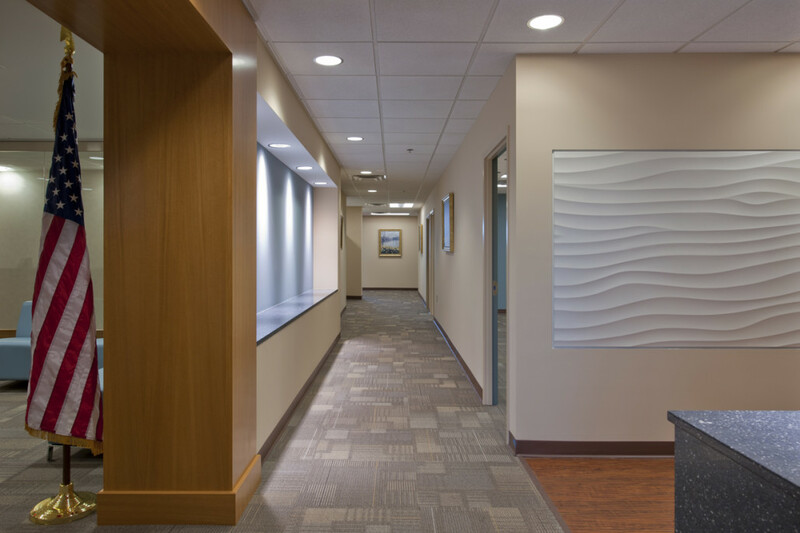 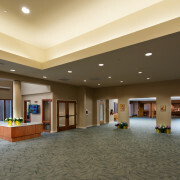 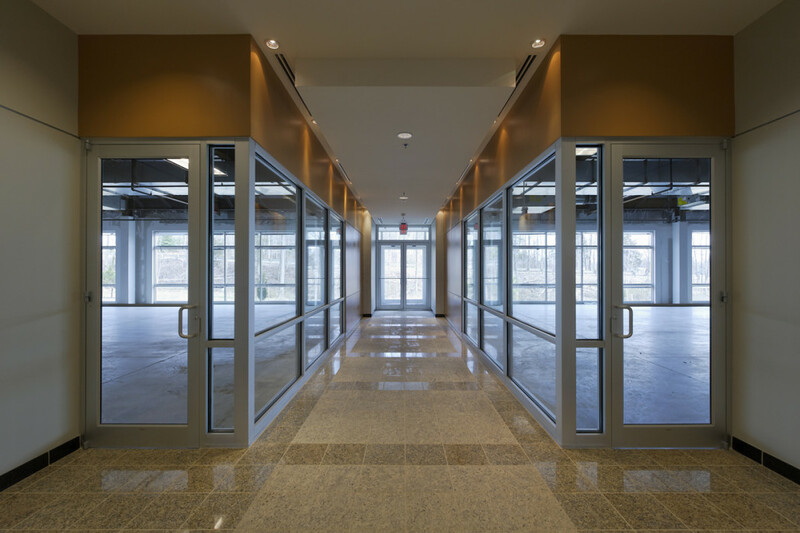 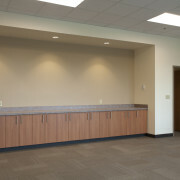 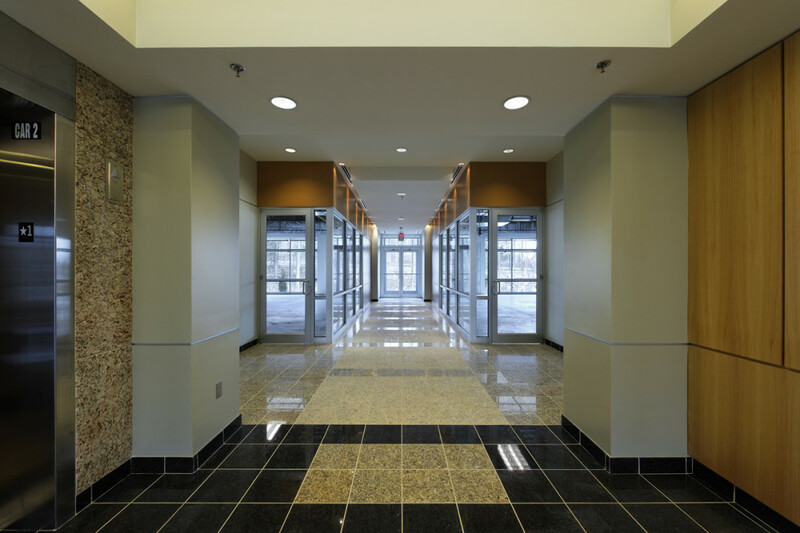 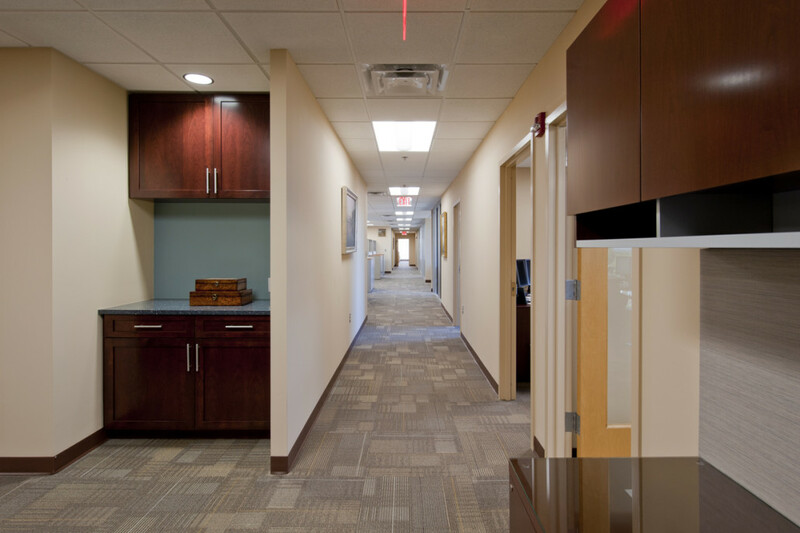 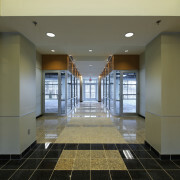 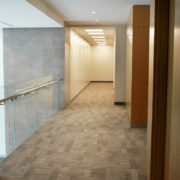 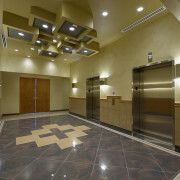 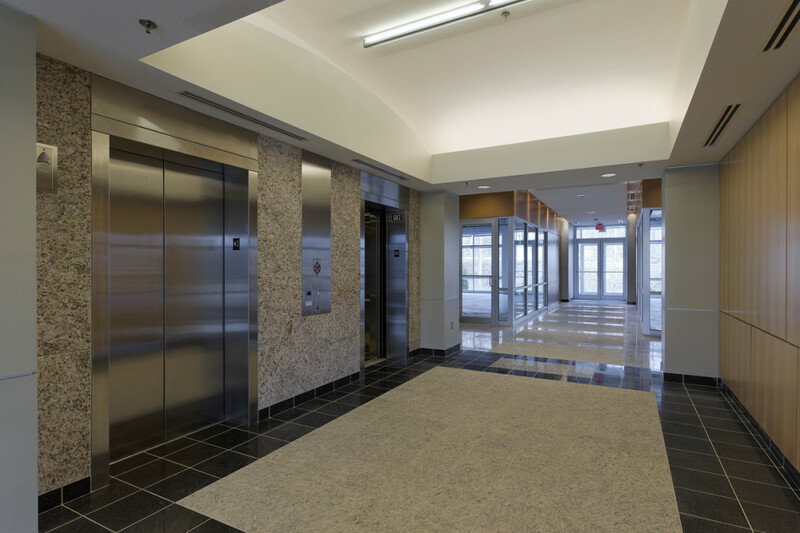 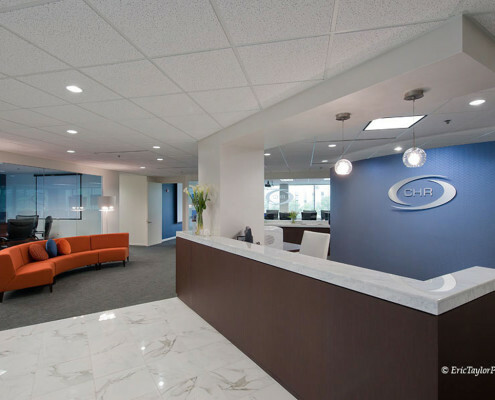 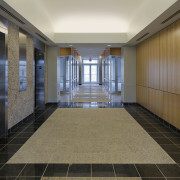 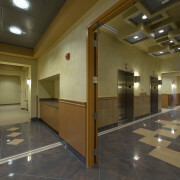 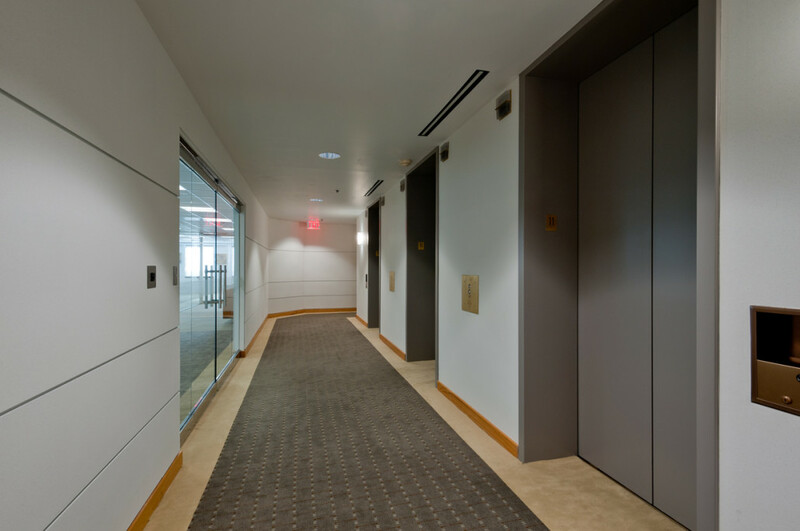 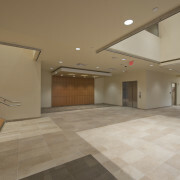 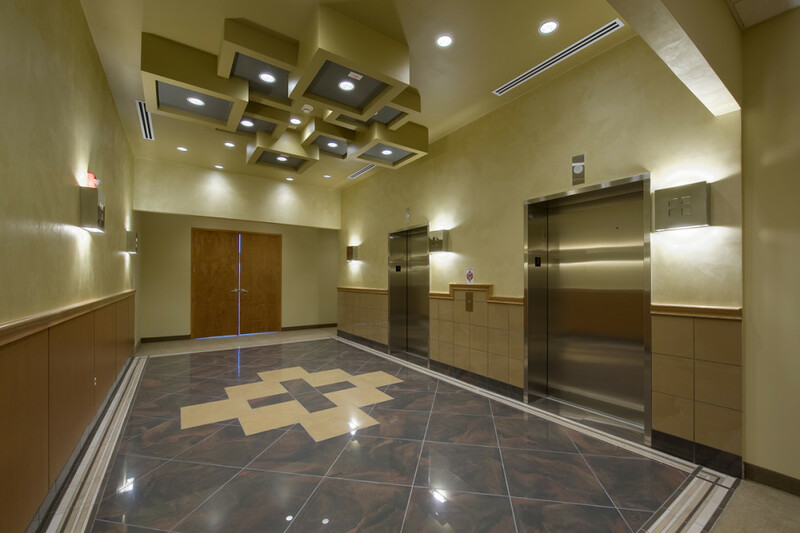 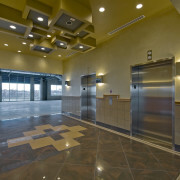 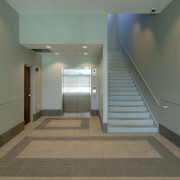 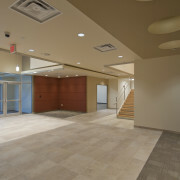 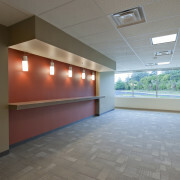 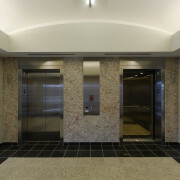 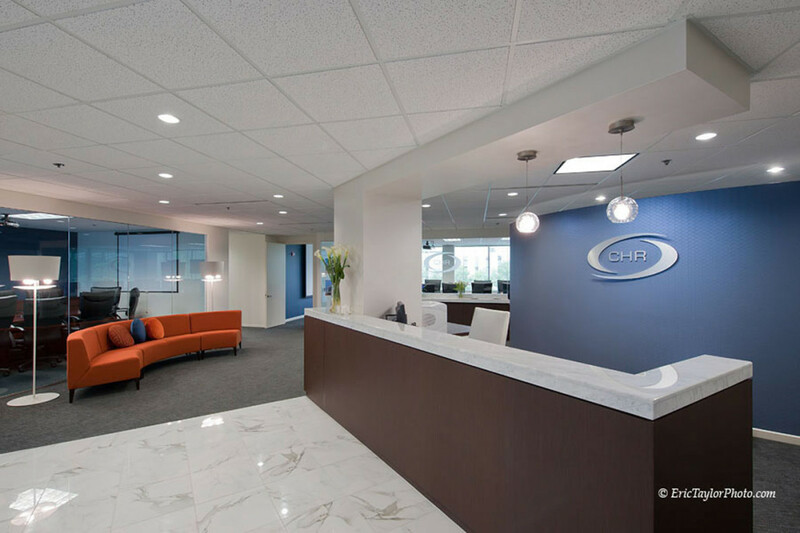 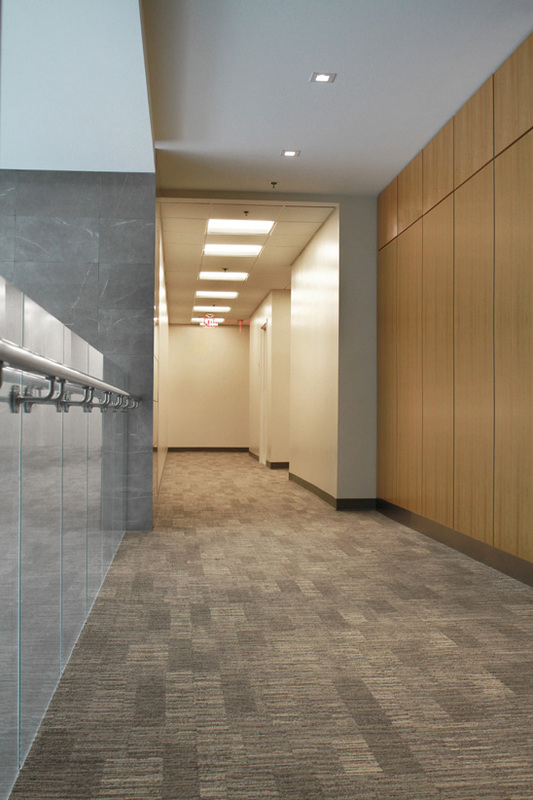 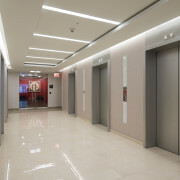 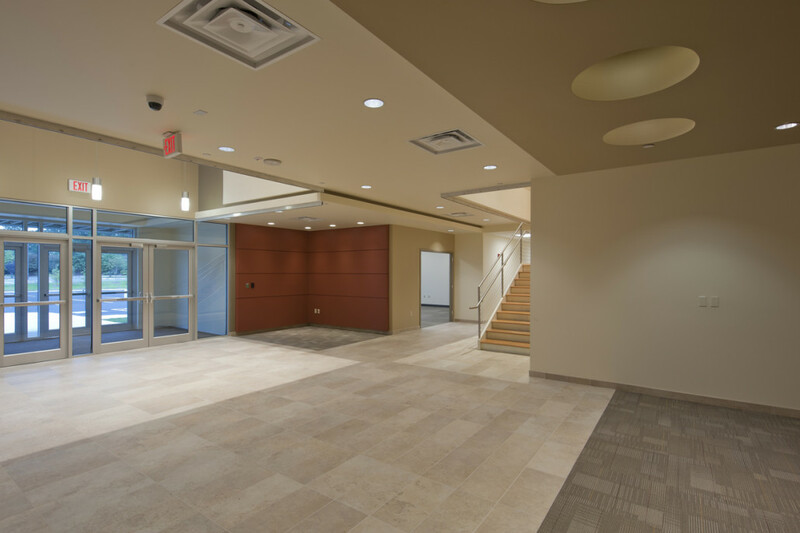 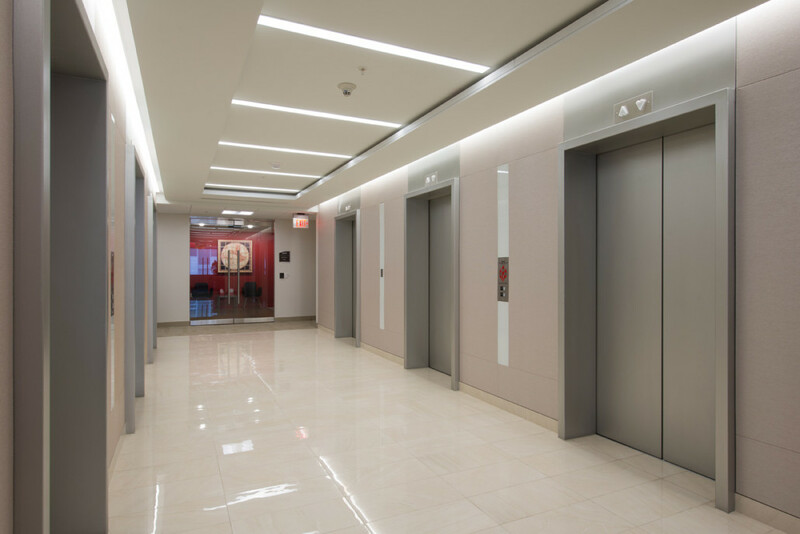 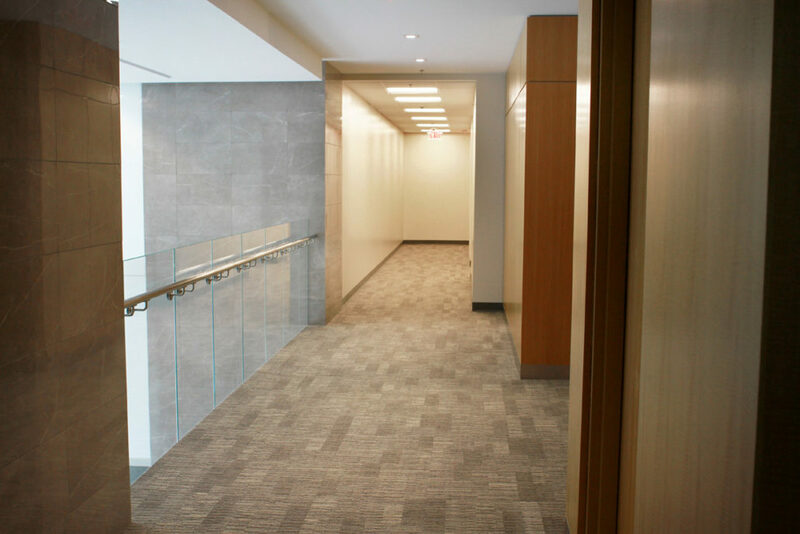 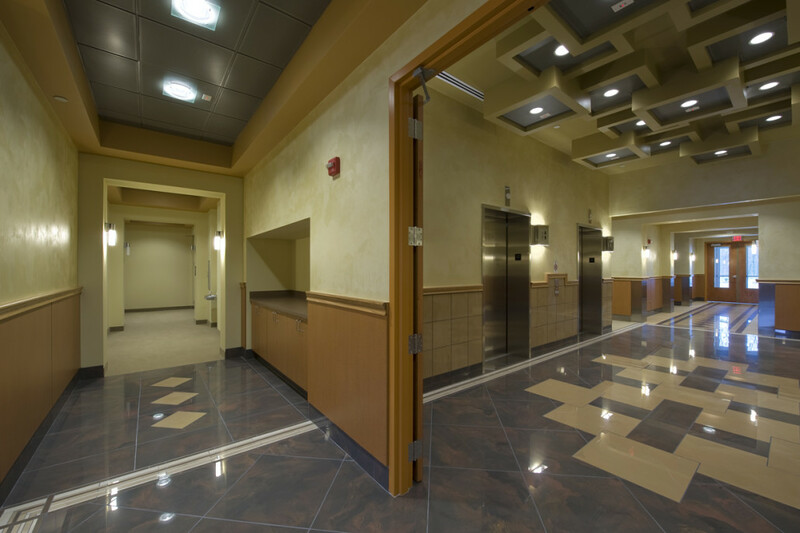 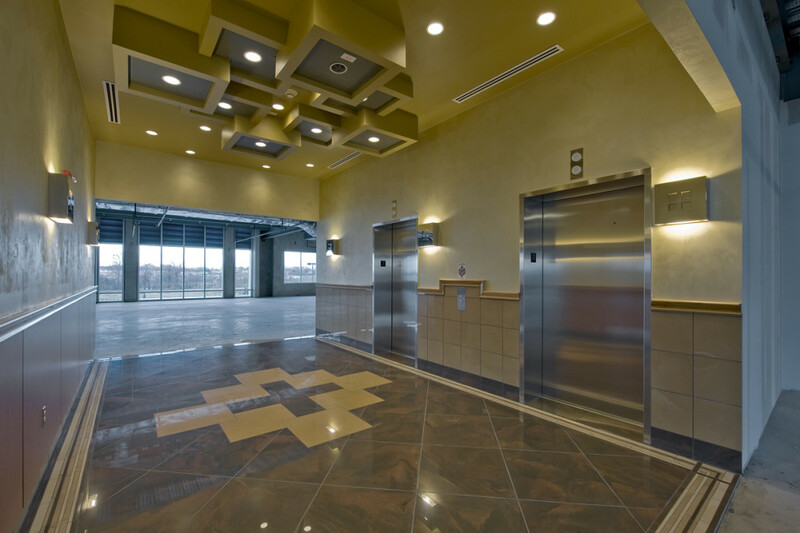 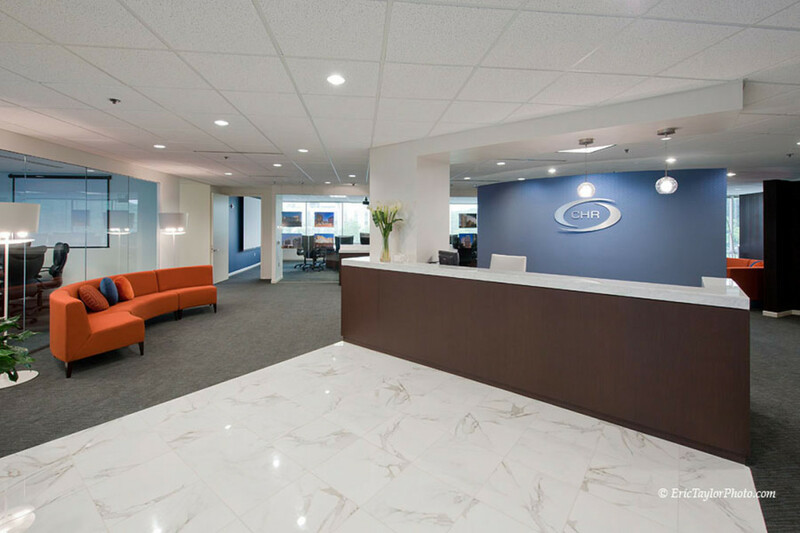 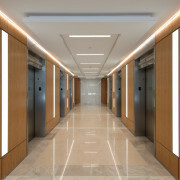 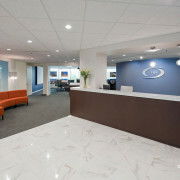 Lobby and core construction was followed by a full floor tenant fit out on the fourth floor. 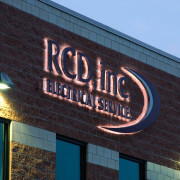 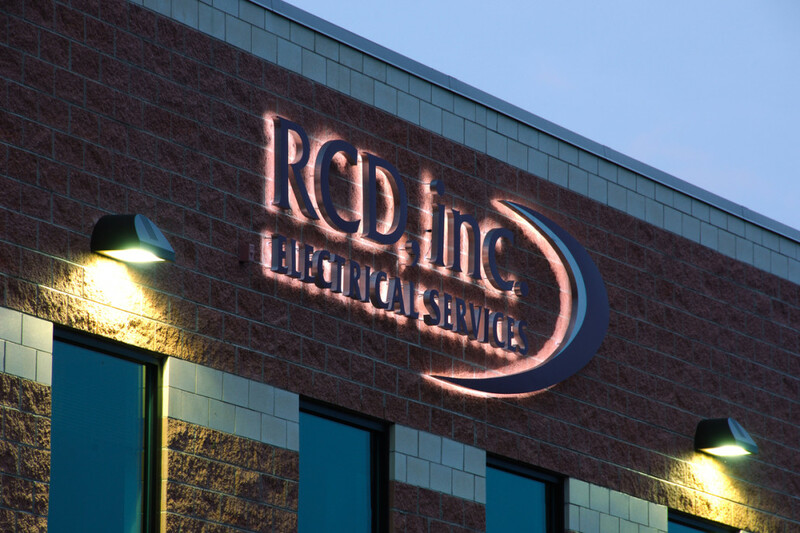 This project was a design build, build to suit for RCD Electric. 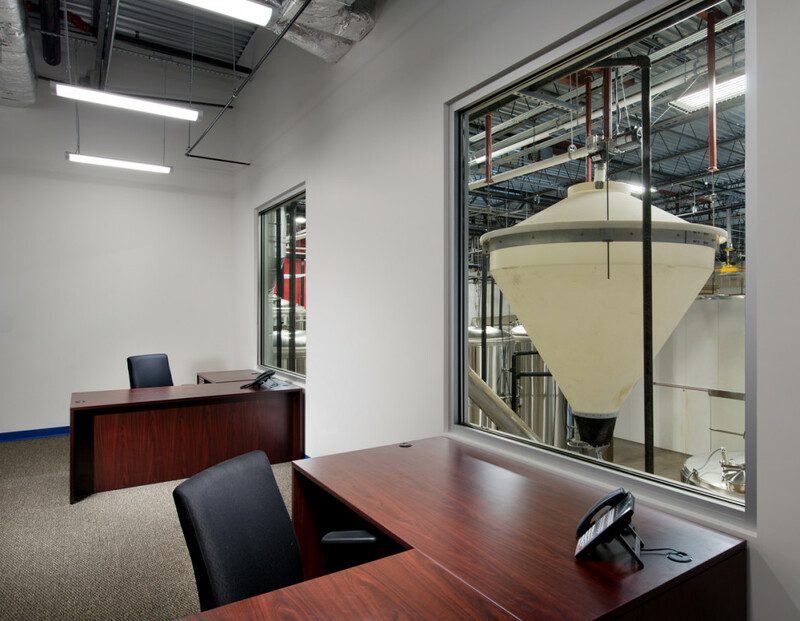 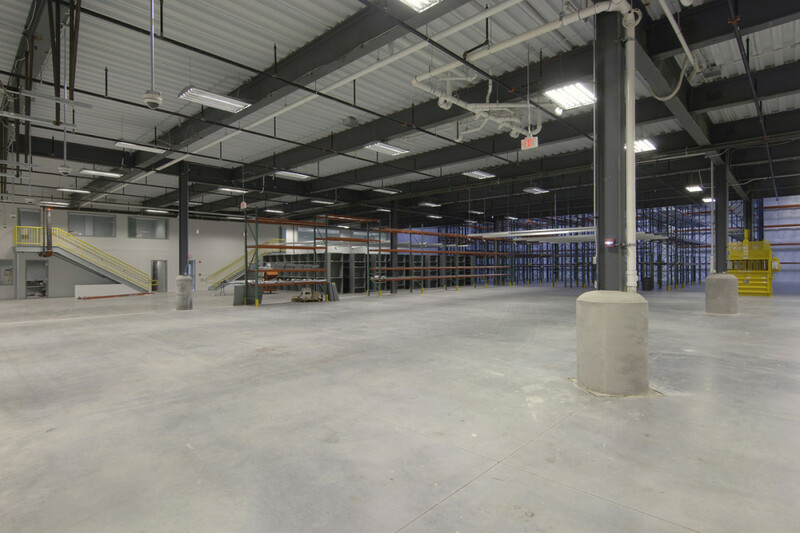 Designed around a tight site, the 20,000 SF program was designed with 17’ clear warehouse space on the first level and a full office fit out on the second floor. 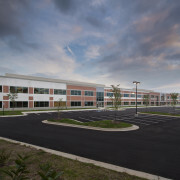 This three story, 60,000 SF tilt up class A office building was constructed on the old Army base at Vint Hill Farms. 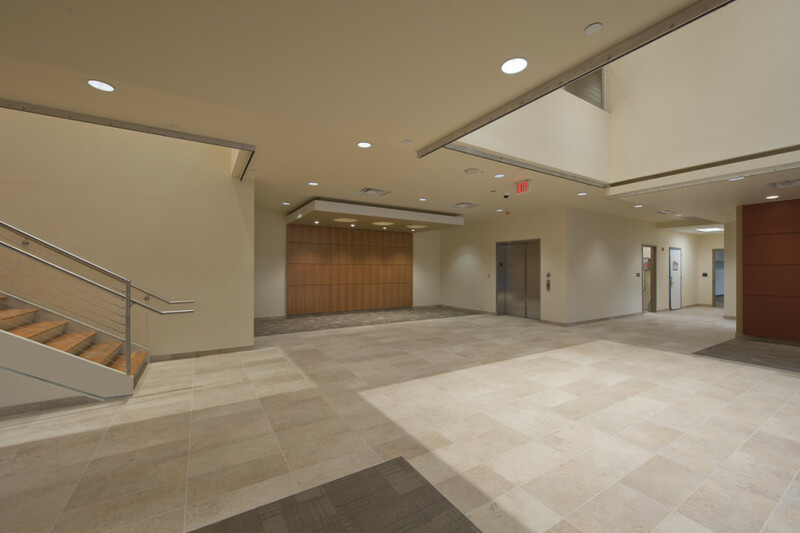 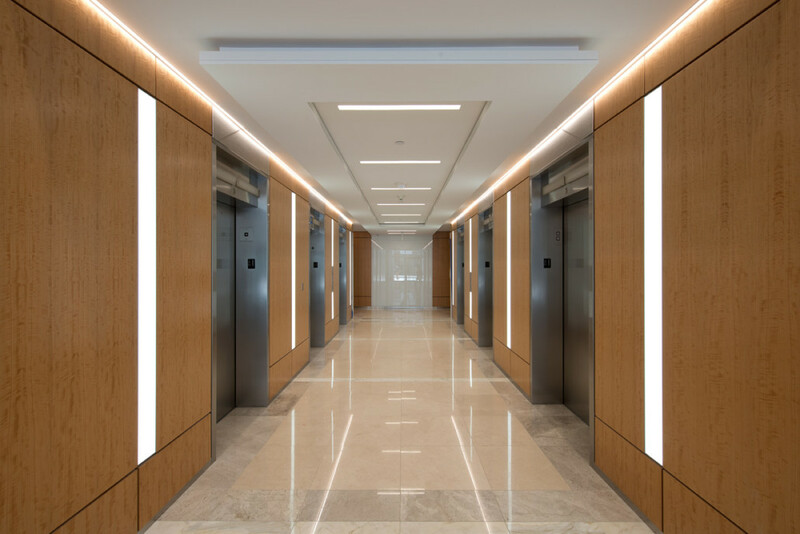 The lobbies included metal panel ceilings to mirror the stone tile floor patterns, wood panels, and Venetian Plaster walls. 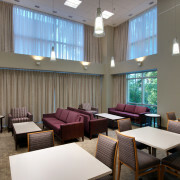 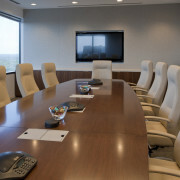 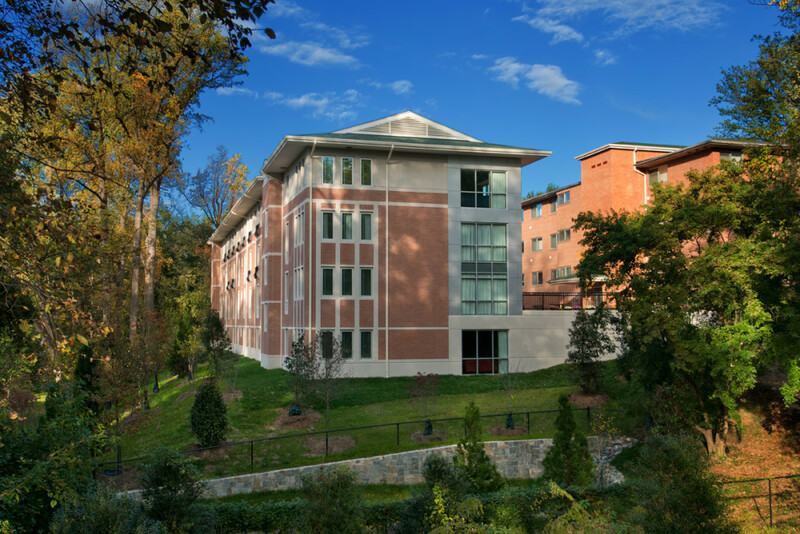 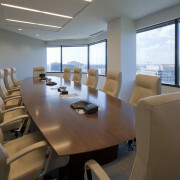 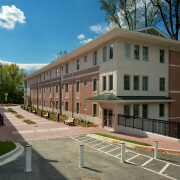 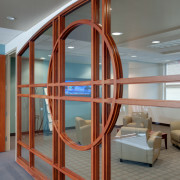 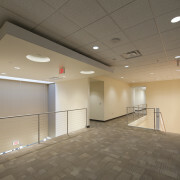 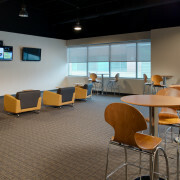 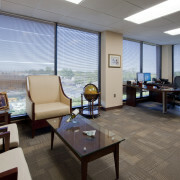 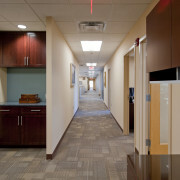 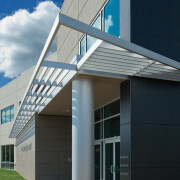 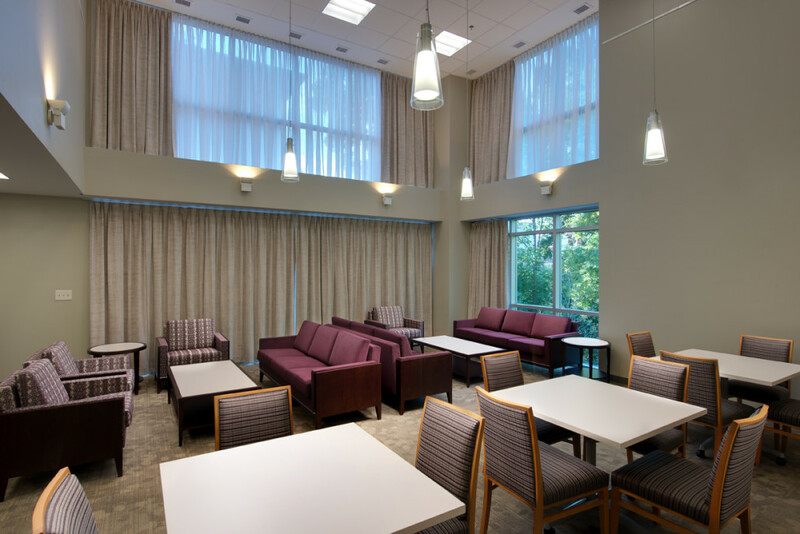 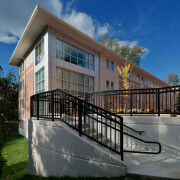 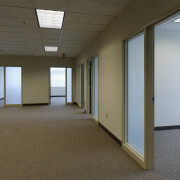 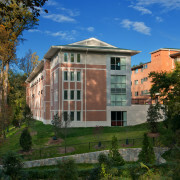 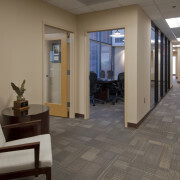 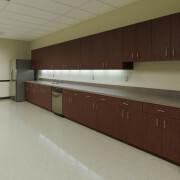 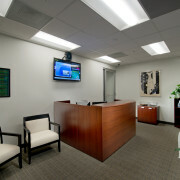 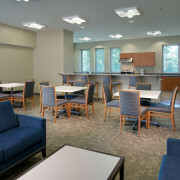 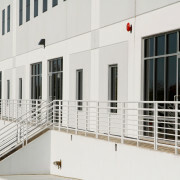 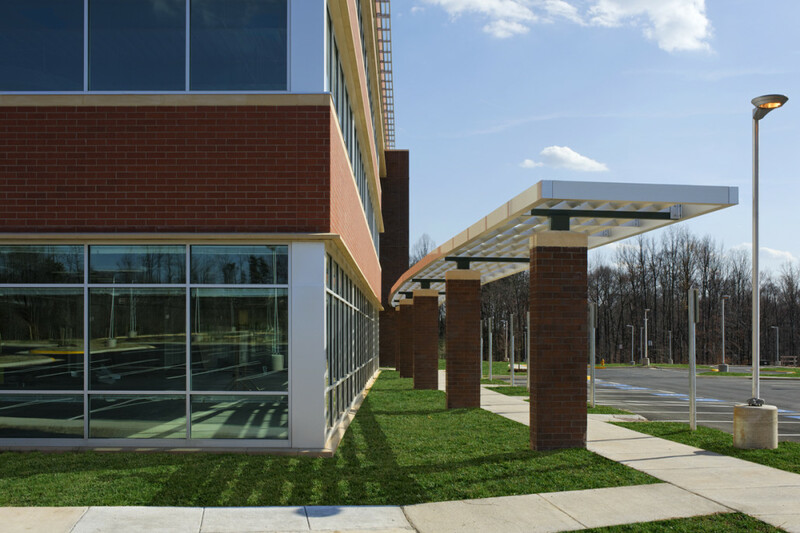 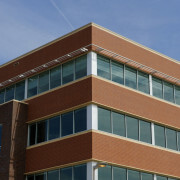 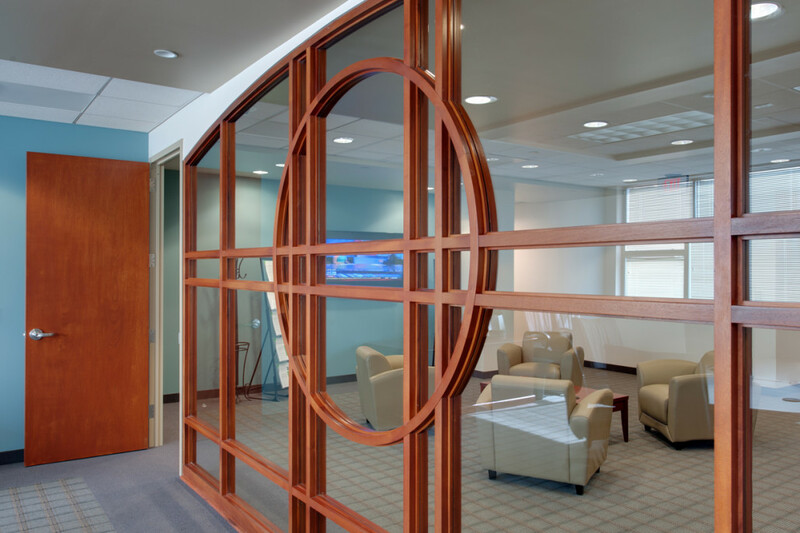 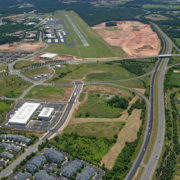 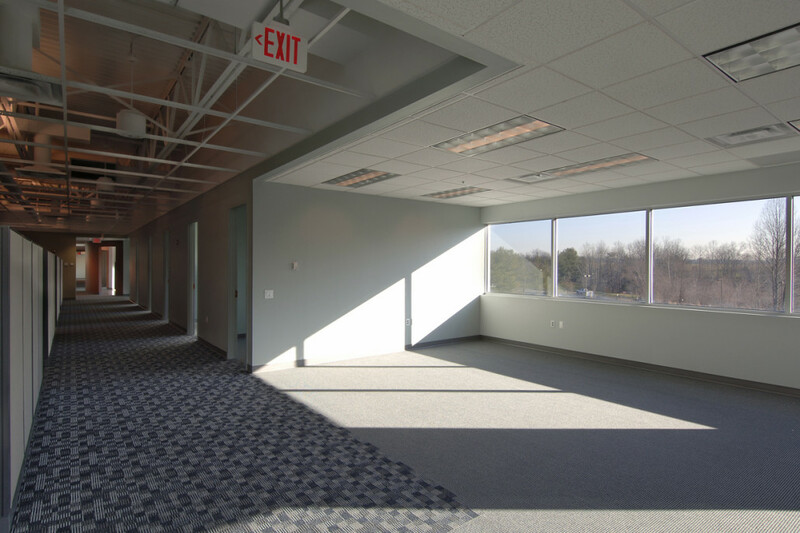 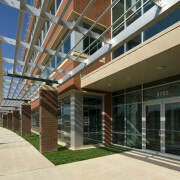 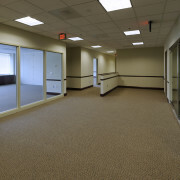 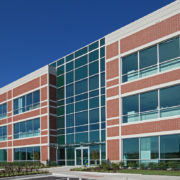 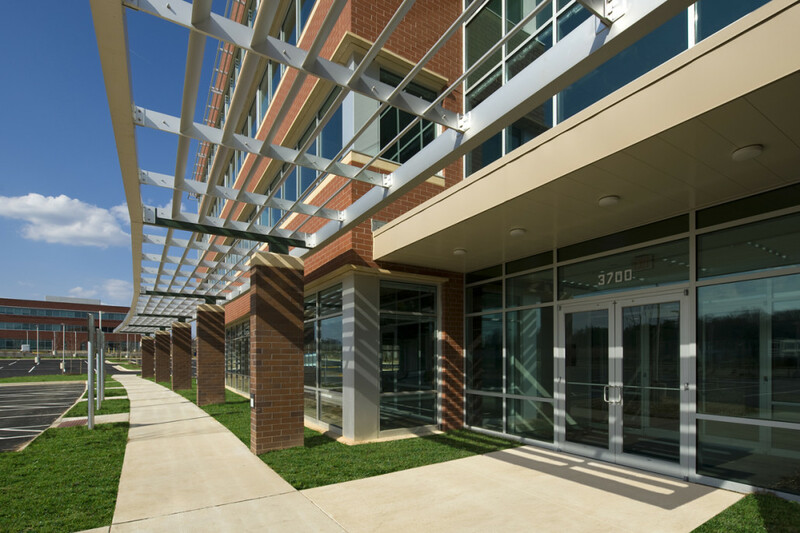 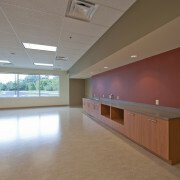 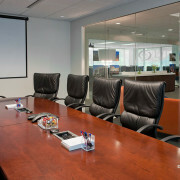 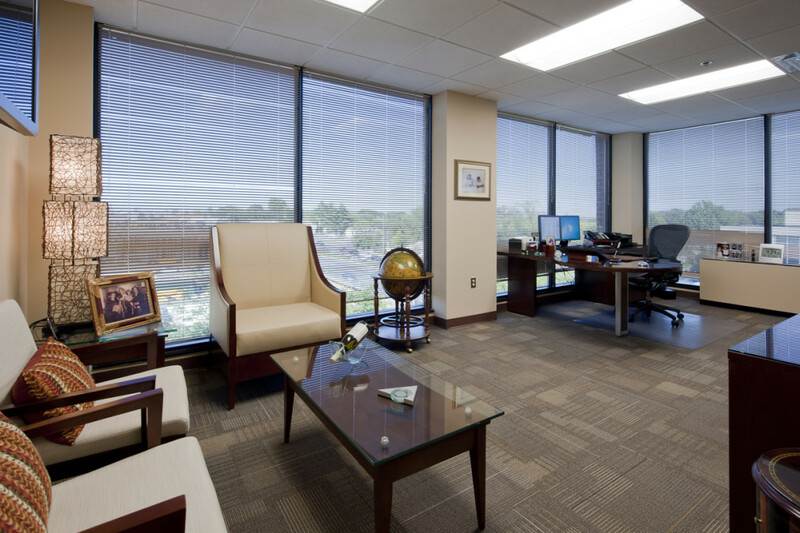 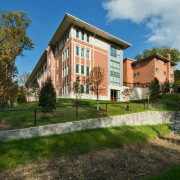 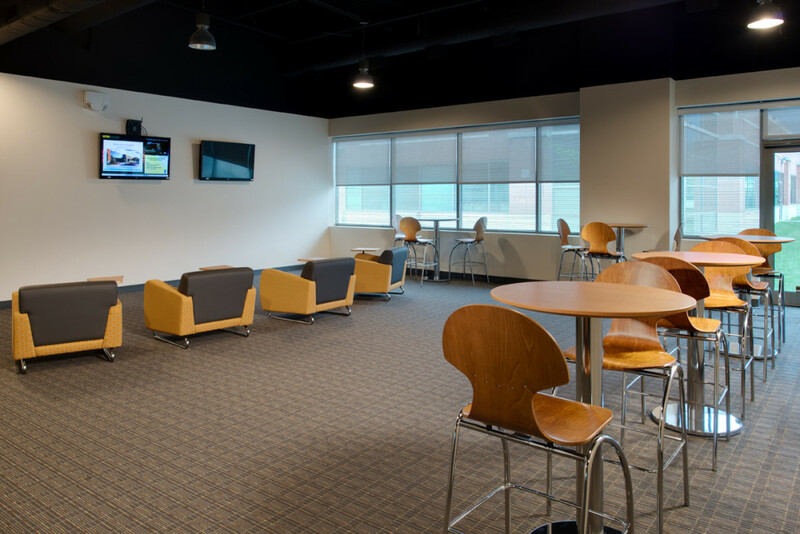 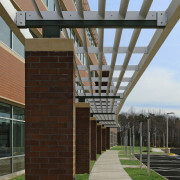 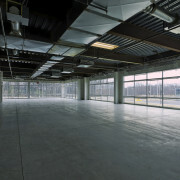 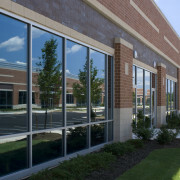 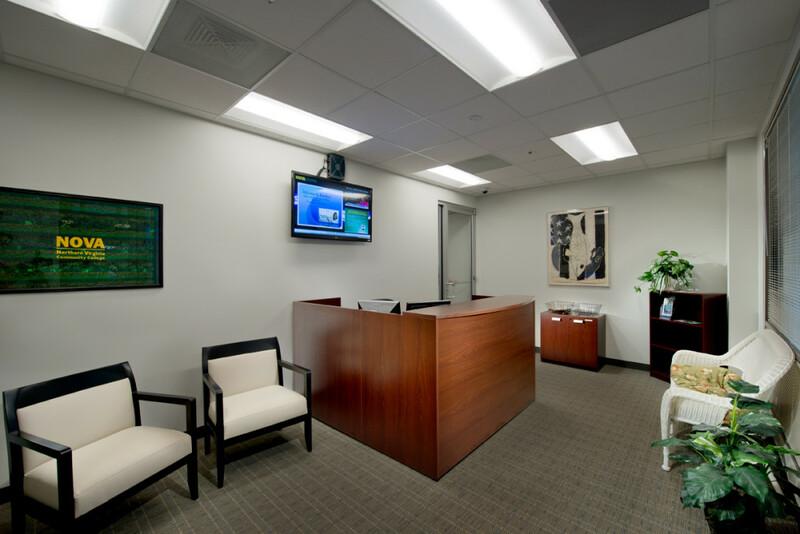 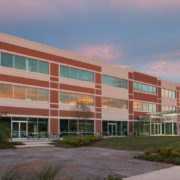 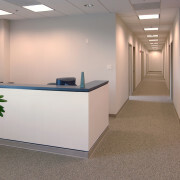 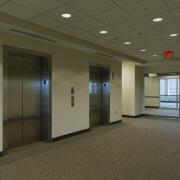 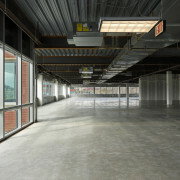 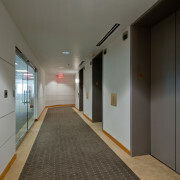 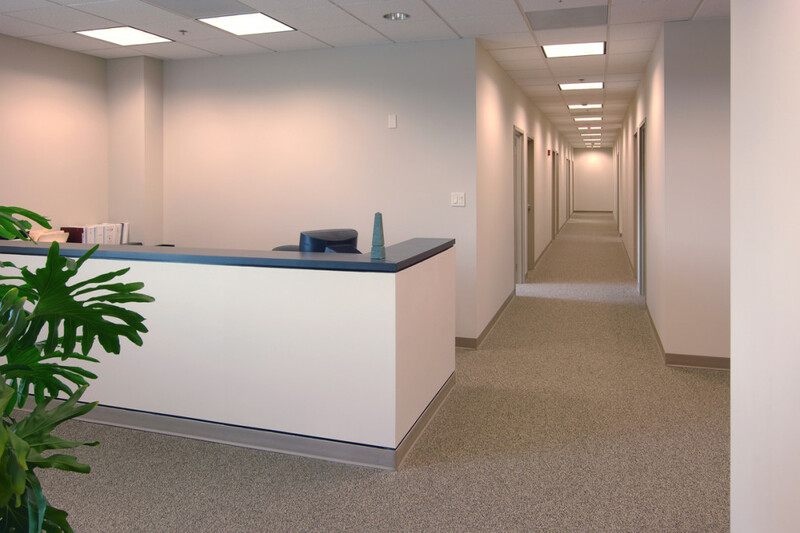 NVCC is a tenant fit out in Fairfax County. 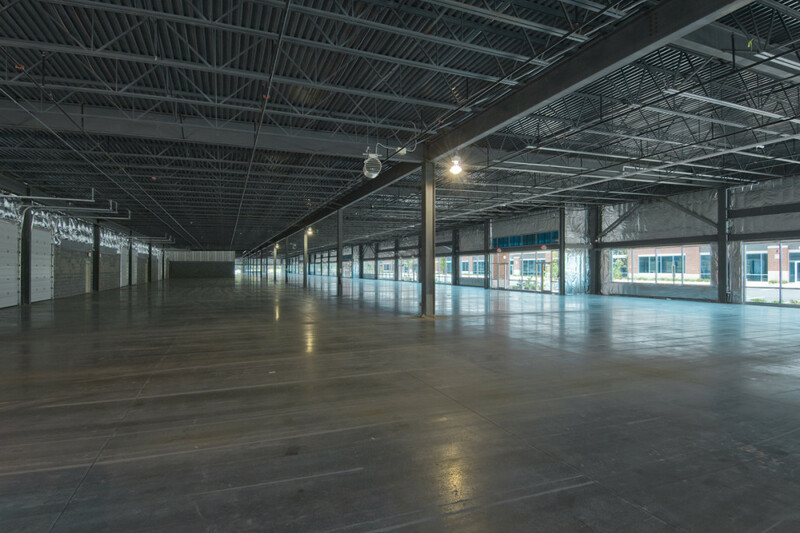 The 88,200 SF space is comprised of two full single story building floor plates and another partial area of first floor space, with all three buildings located directly adjacent to one another. 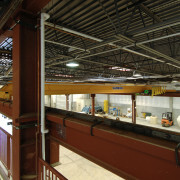 Directional boring was utilized on the existing finished site for installation of inter duct to provide network connection of the three spaces. 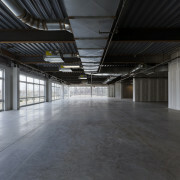 Despite extensive electrical and mechanical revisions during the course of the project, the space was delivered on schedule. 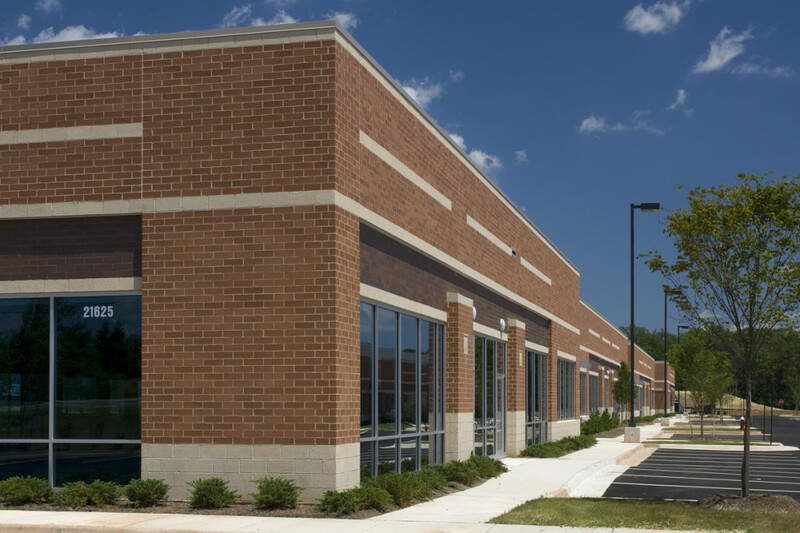 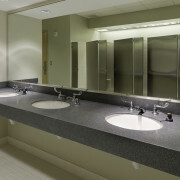 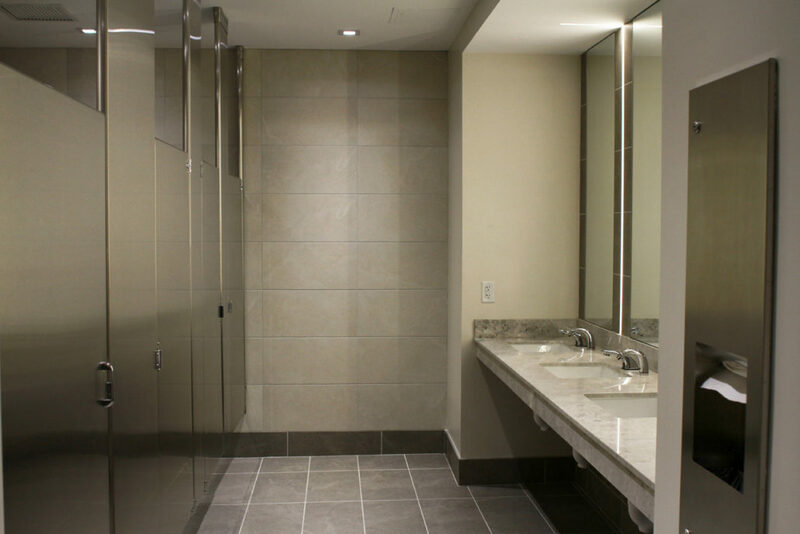 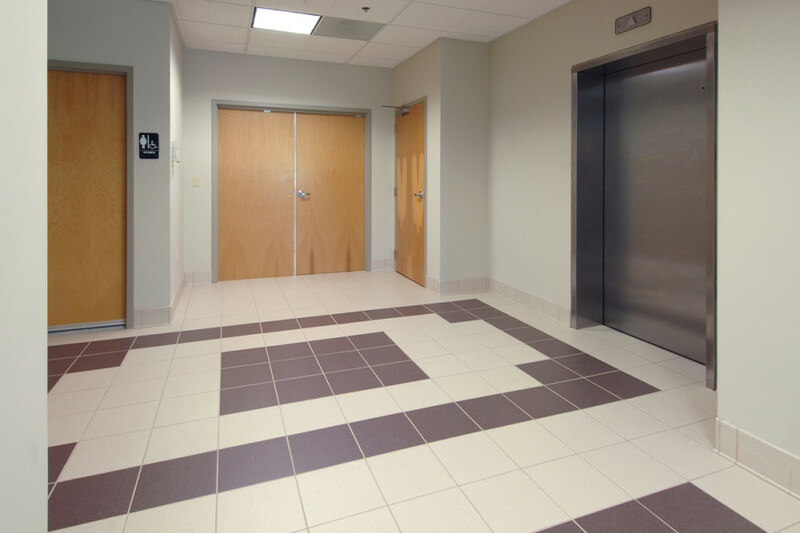 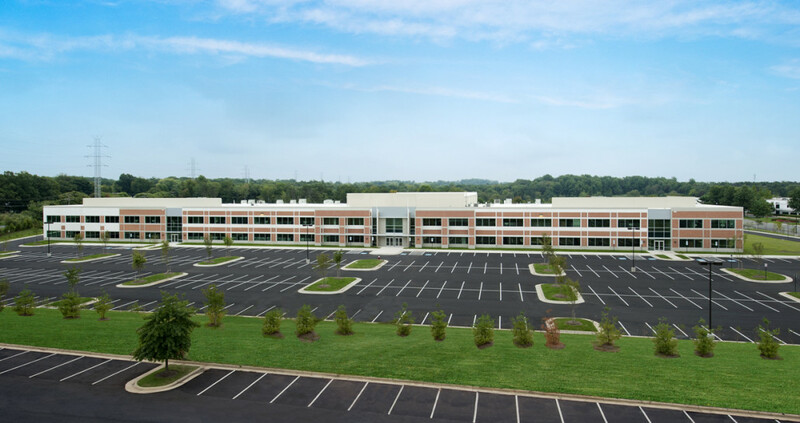 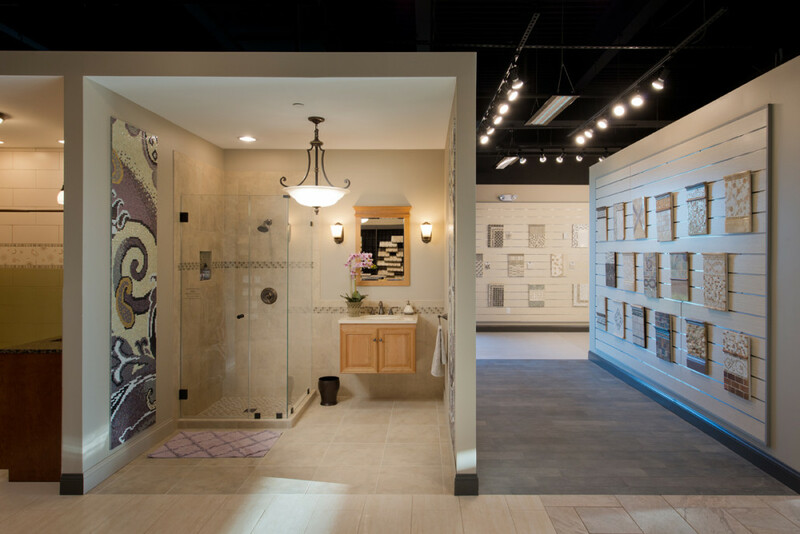 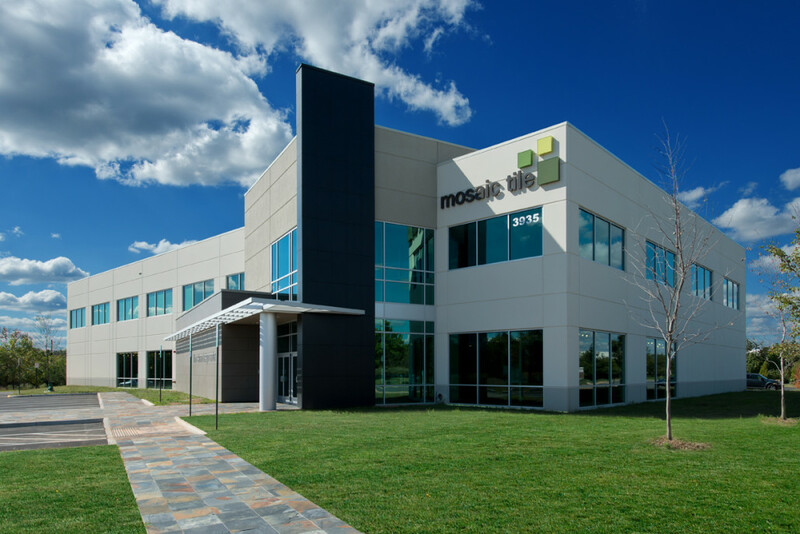 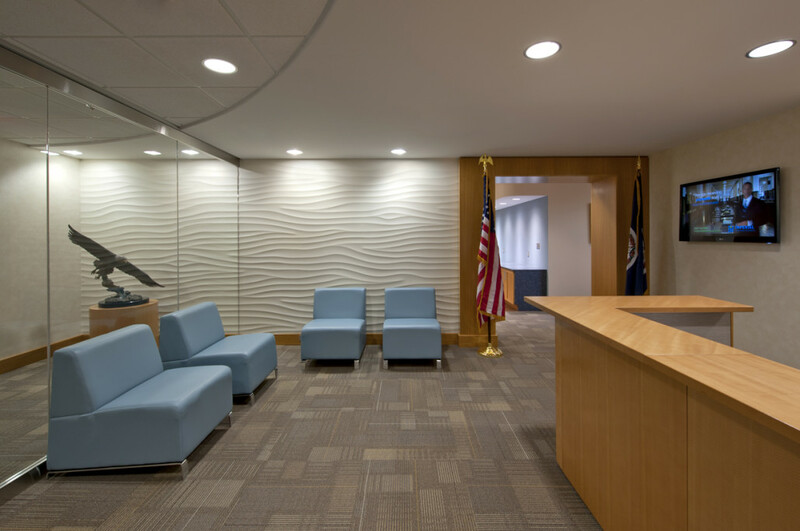 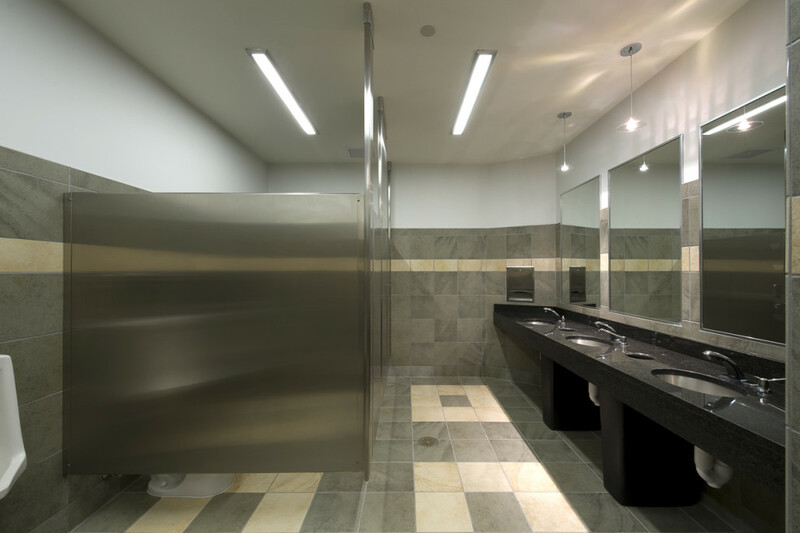 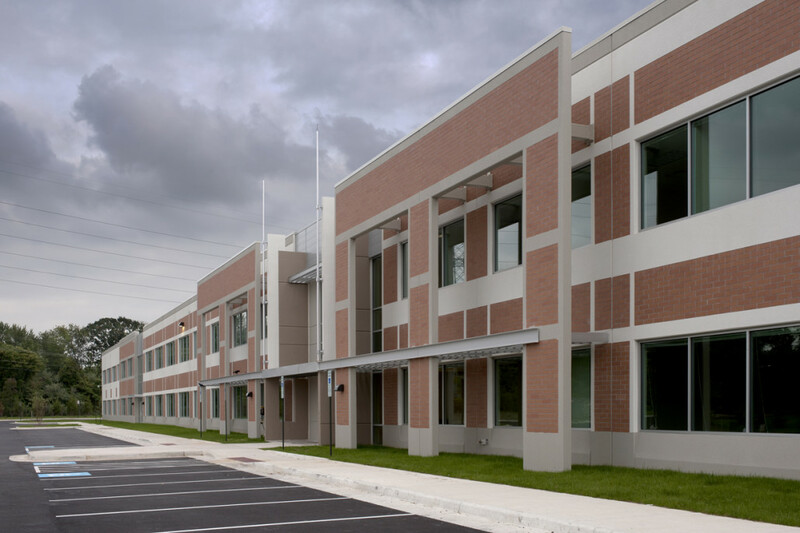 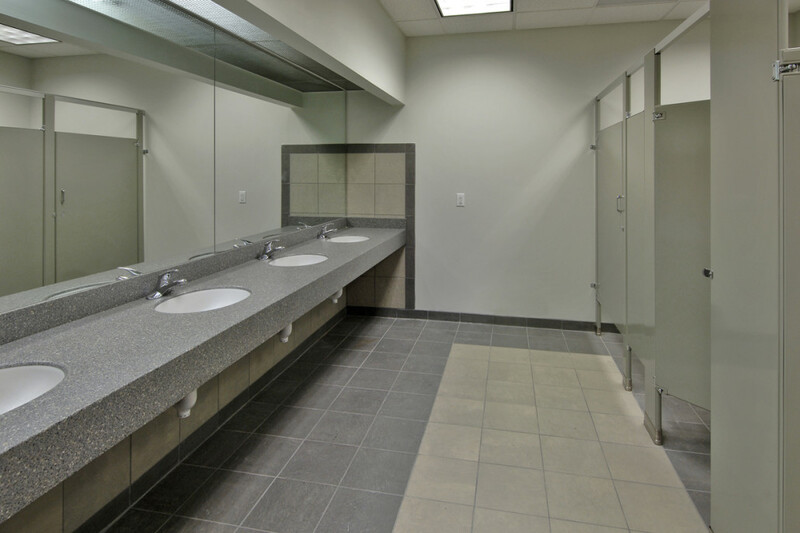 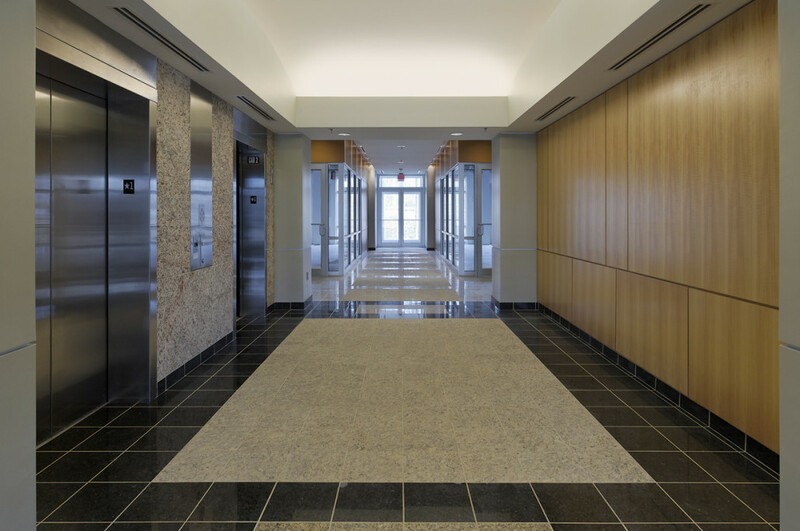 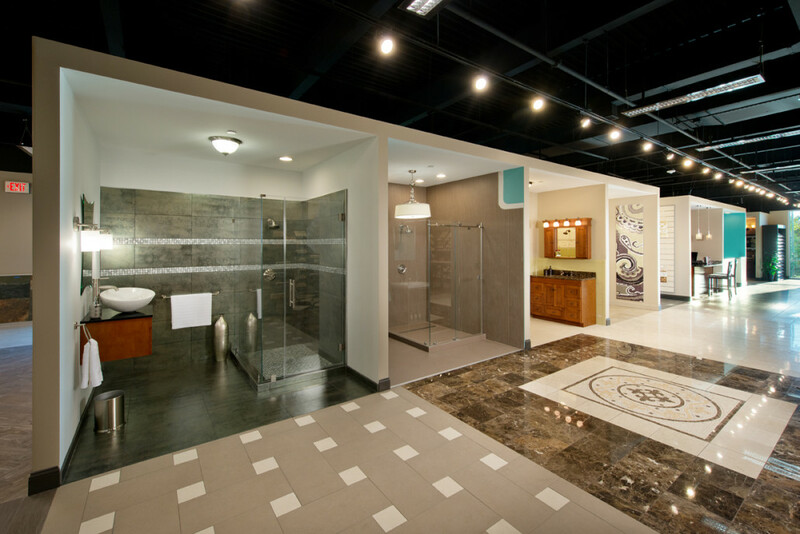 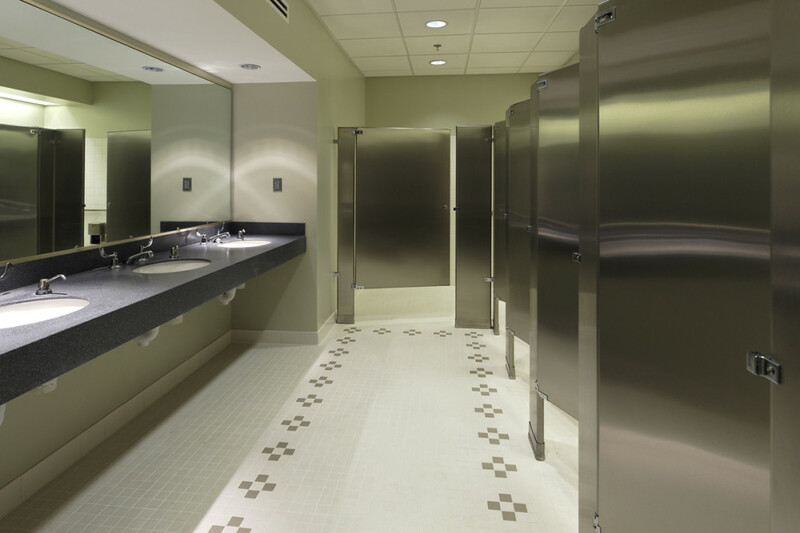 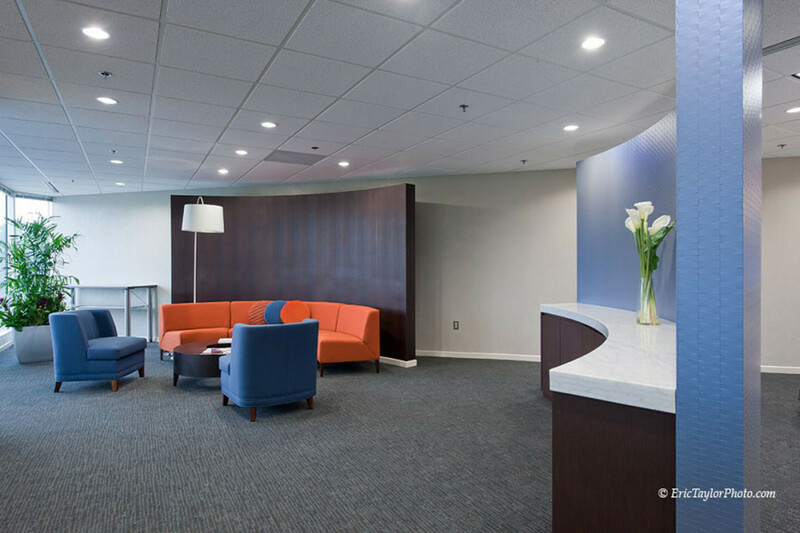 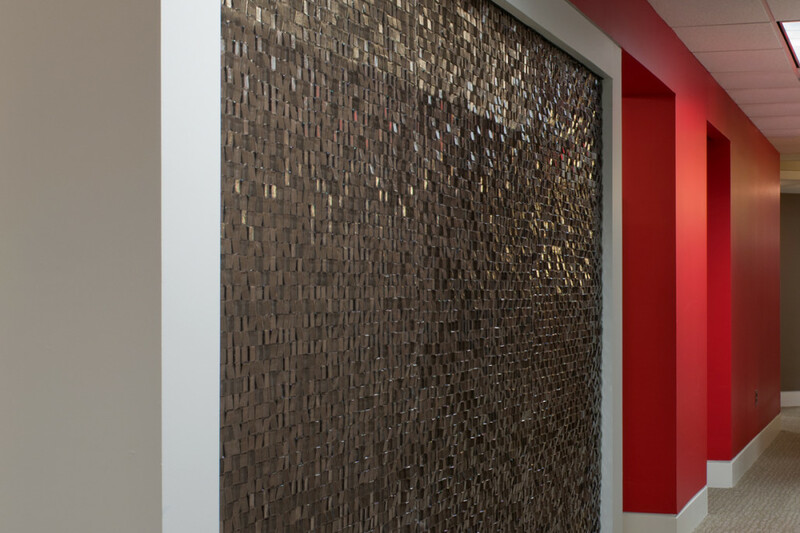 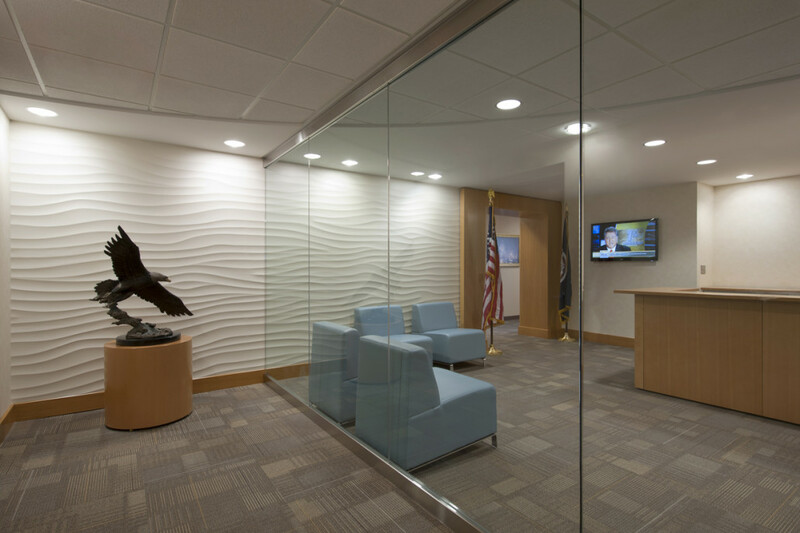 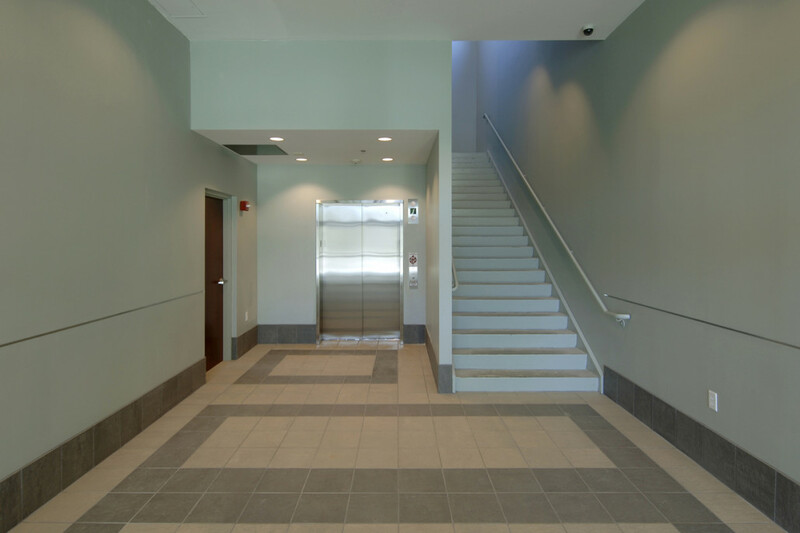 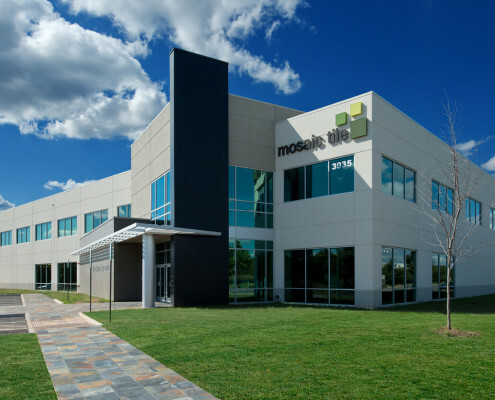 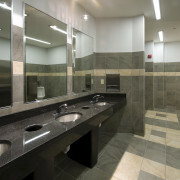 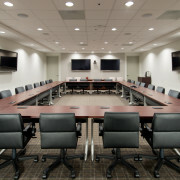 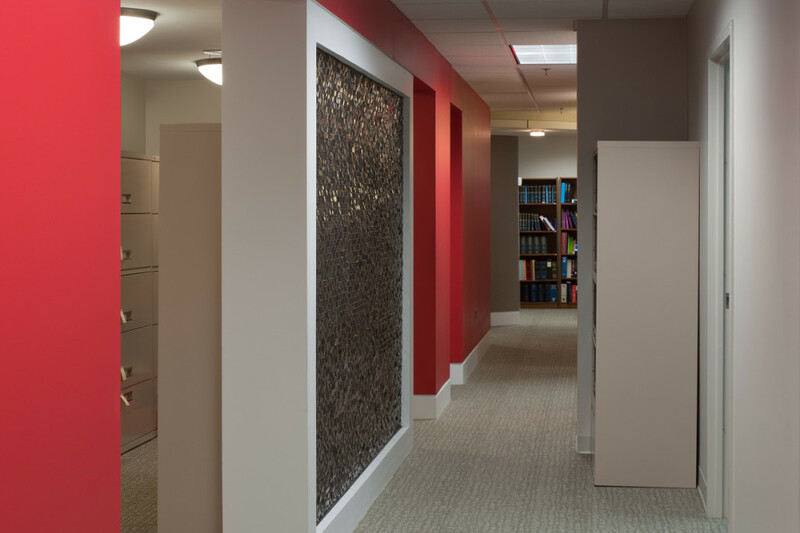 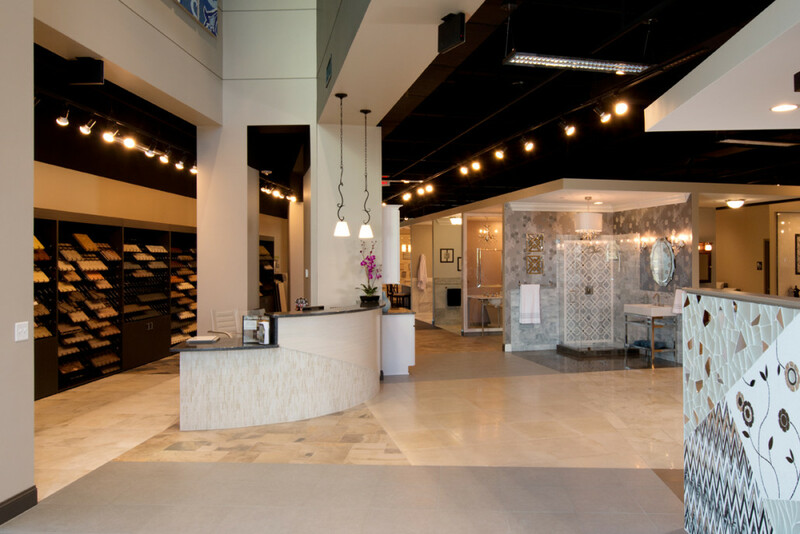 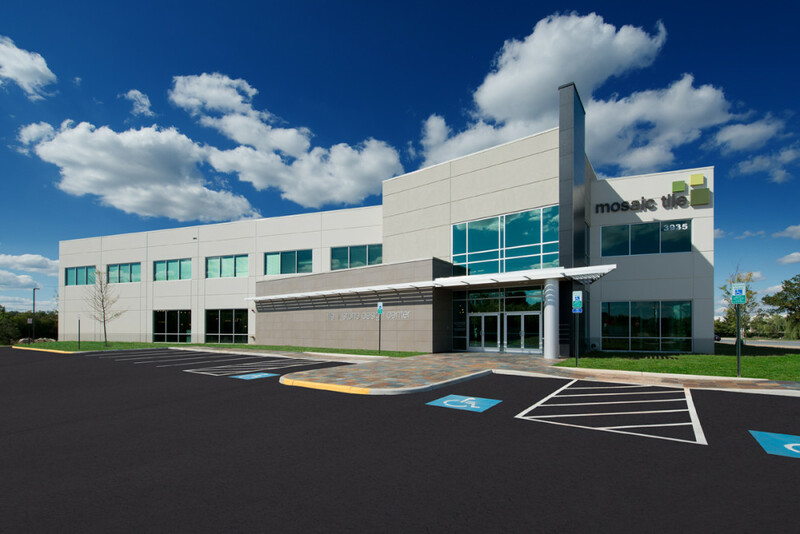 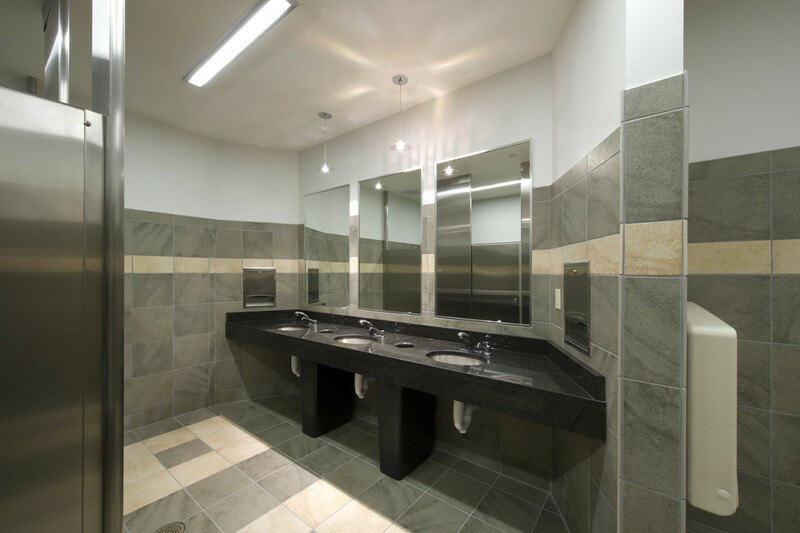 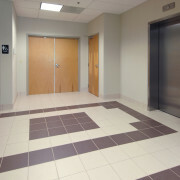 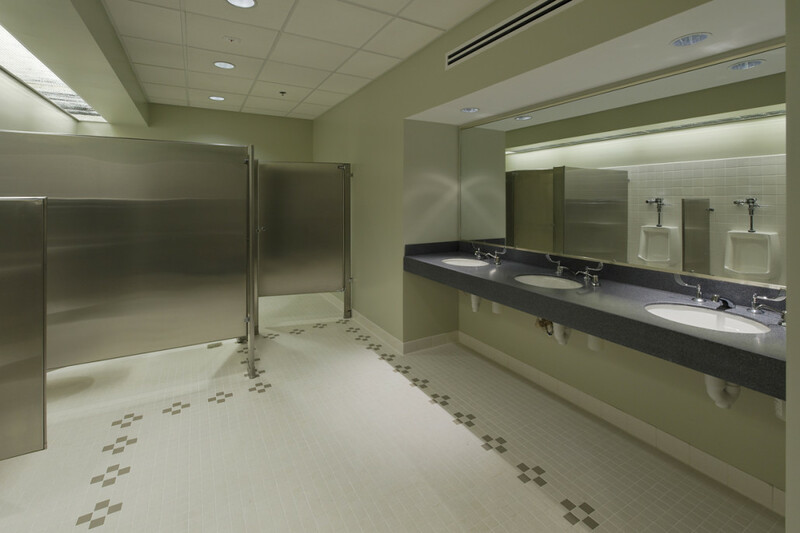 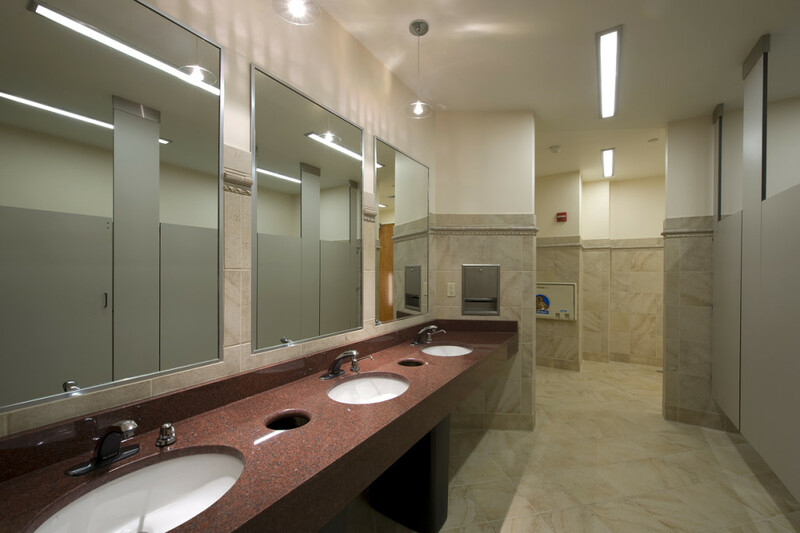 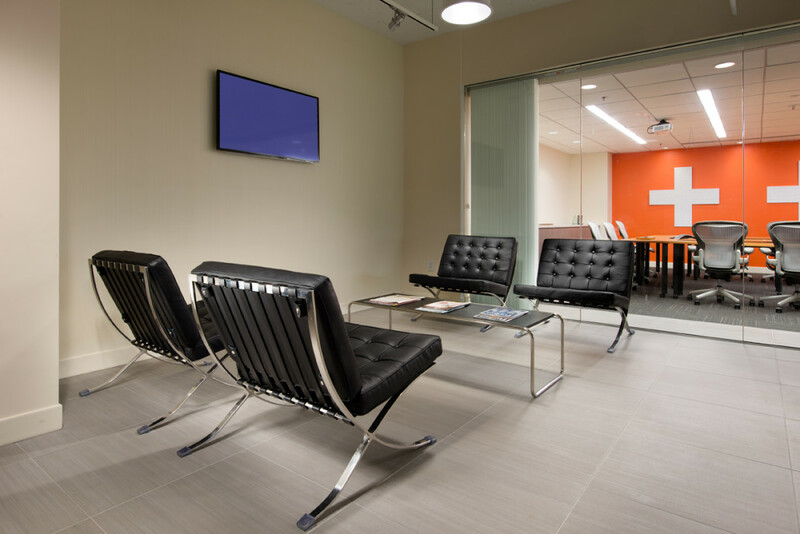 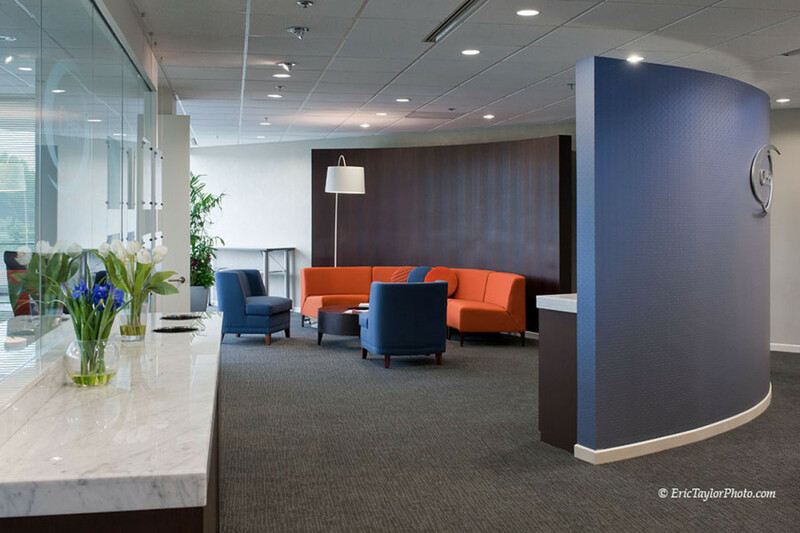 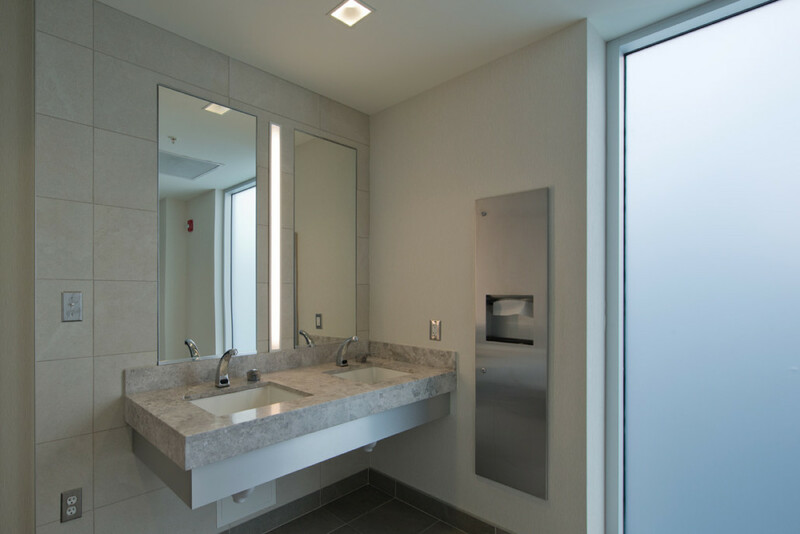 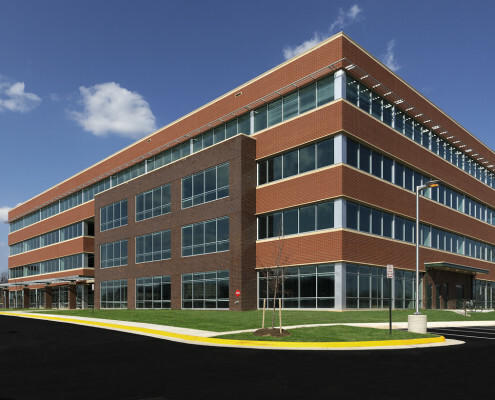 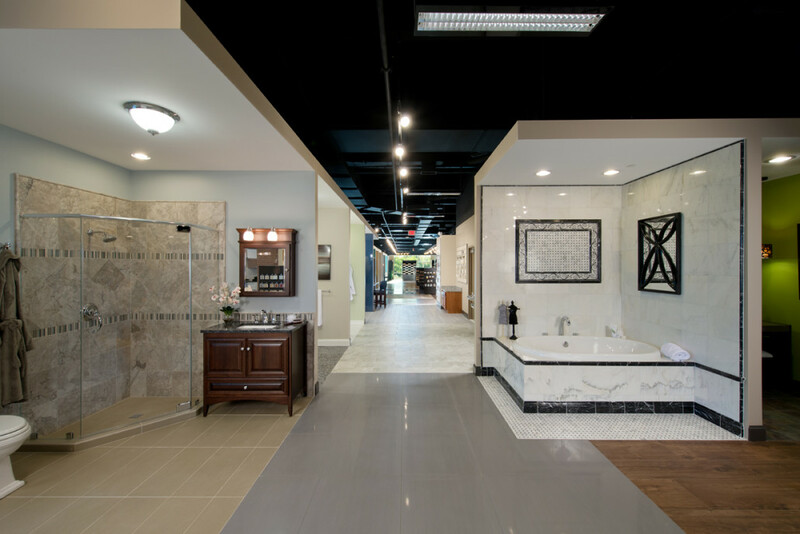 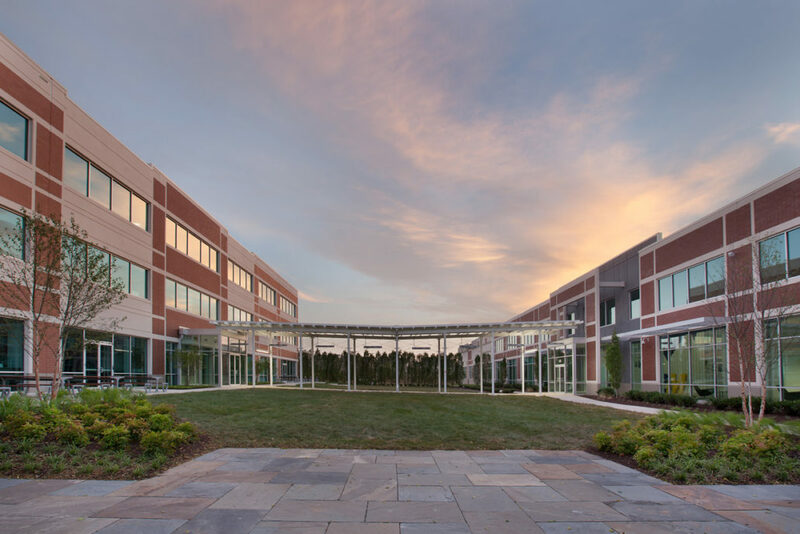 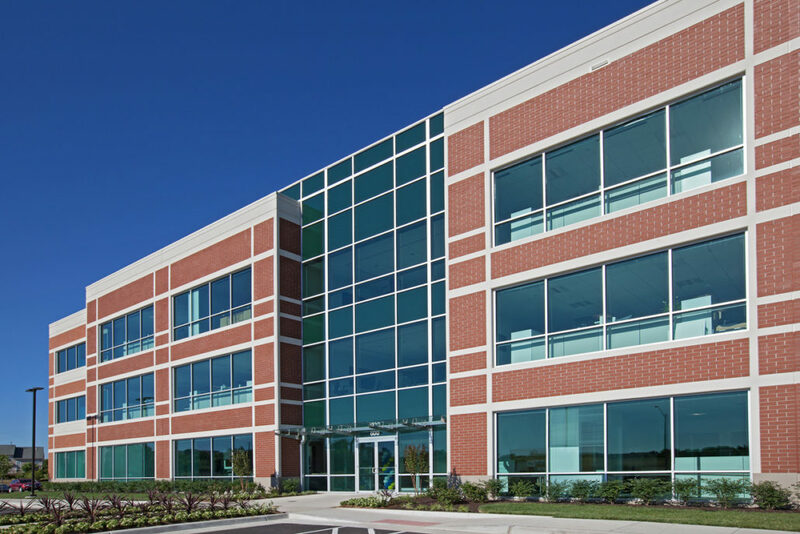 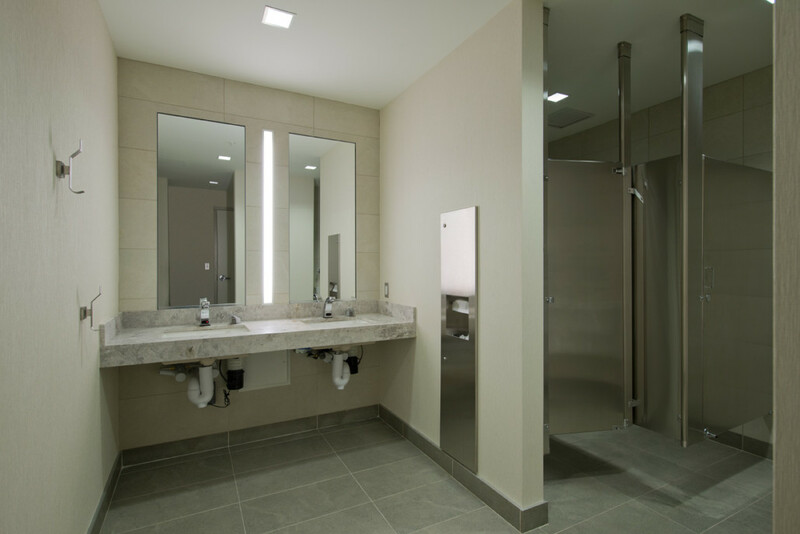 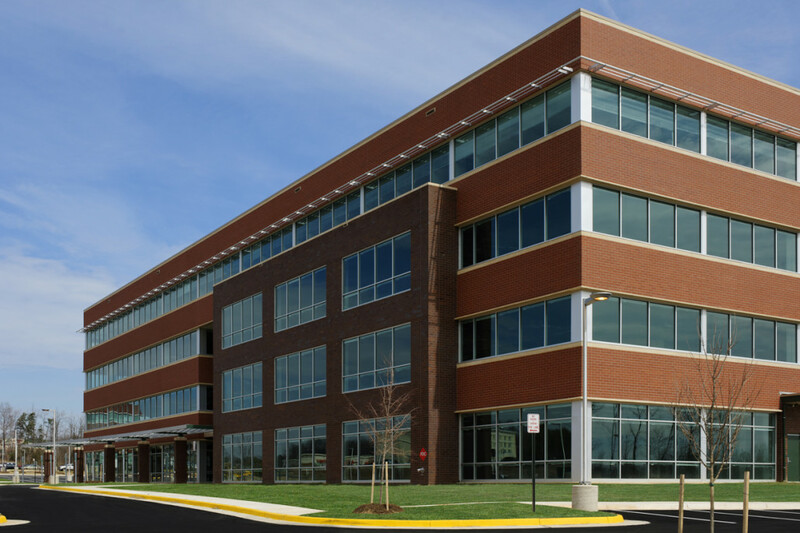 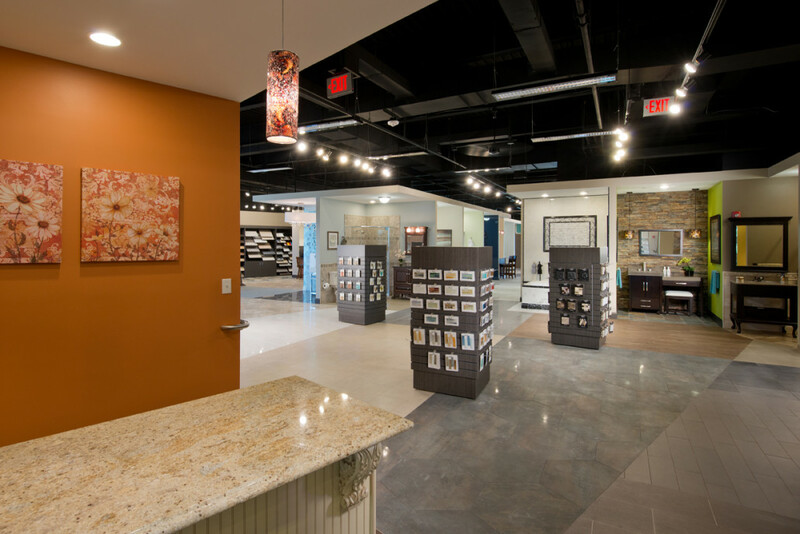 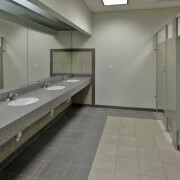 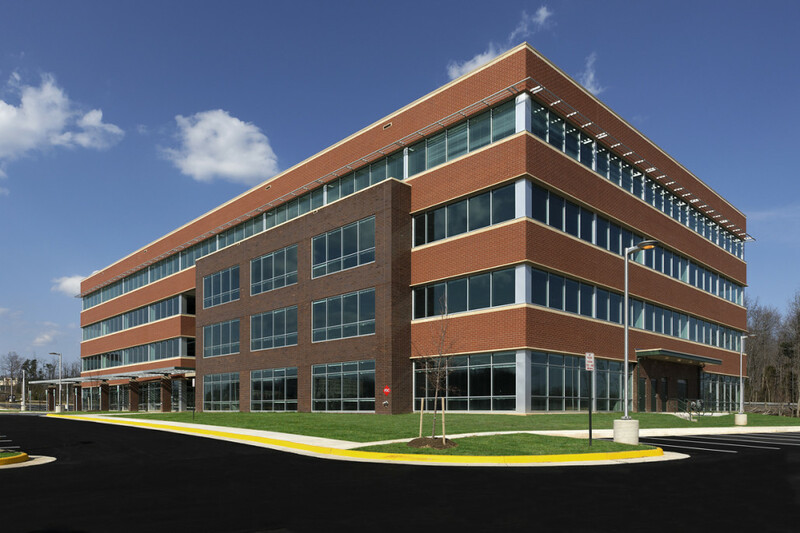 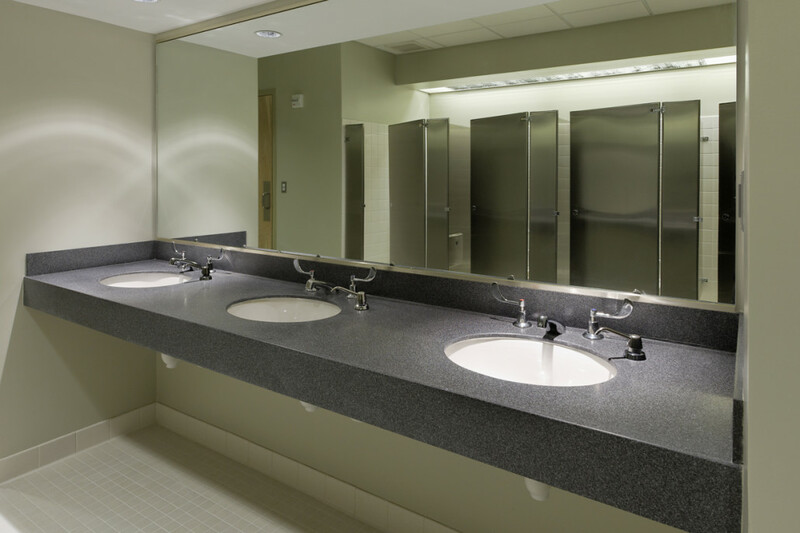 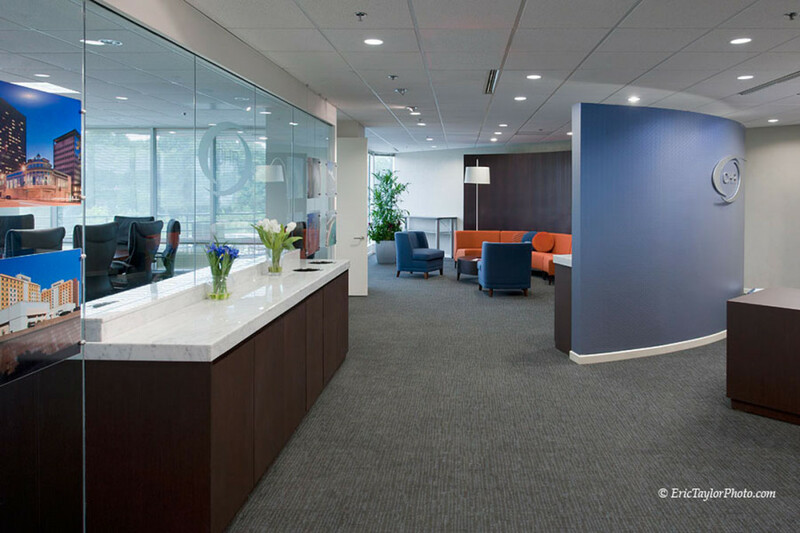 Engineer: Potomac Energy Group, Inc.
Mosaic Tile is a build to suit 28,162 SF facility constructed for the consolidation of Mosaic Tile’s corporate headquarters and show room facilities in Chantilly, VA. 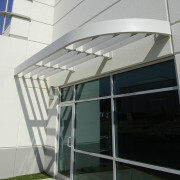 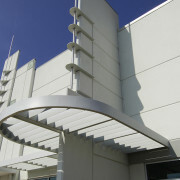 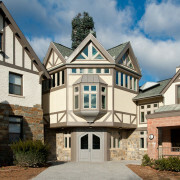 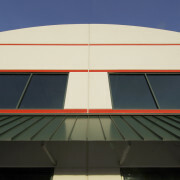 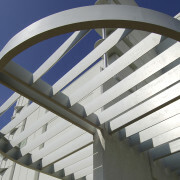 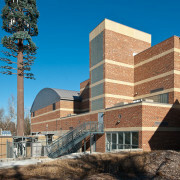 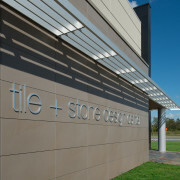 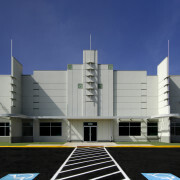 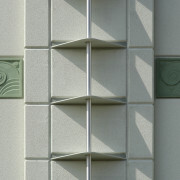 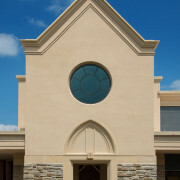 The building construction was predominately concrete tilt-up with minor light gauge and EIFS accents at the main entry. 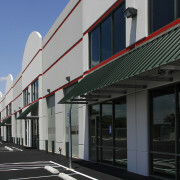 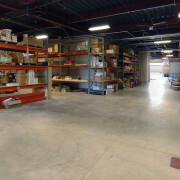 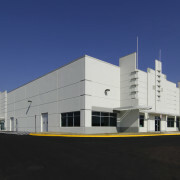 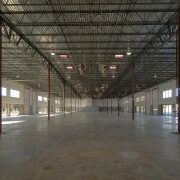 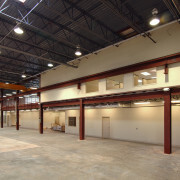 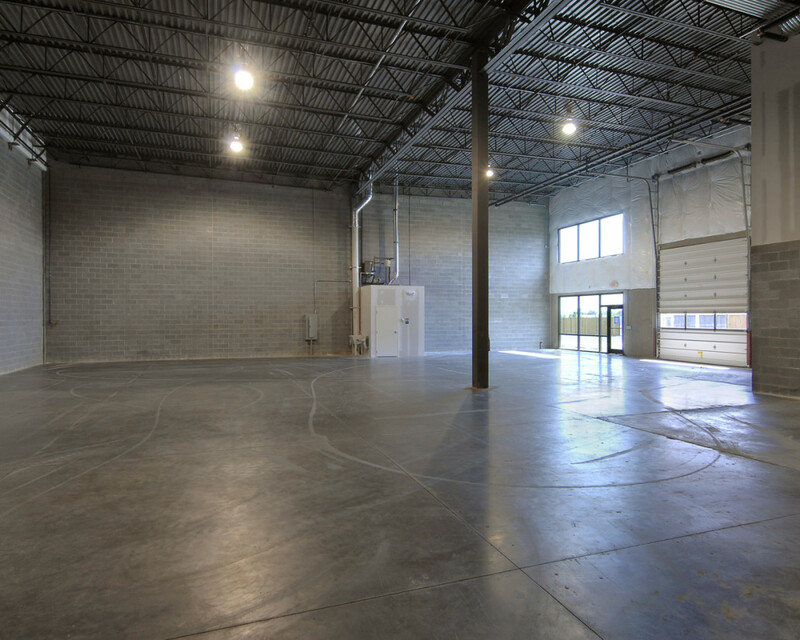 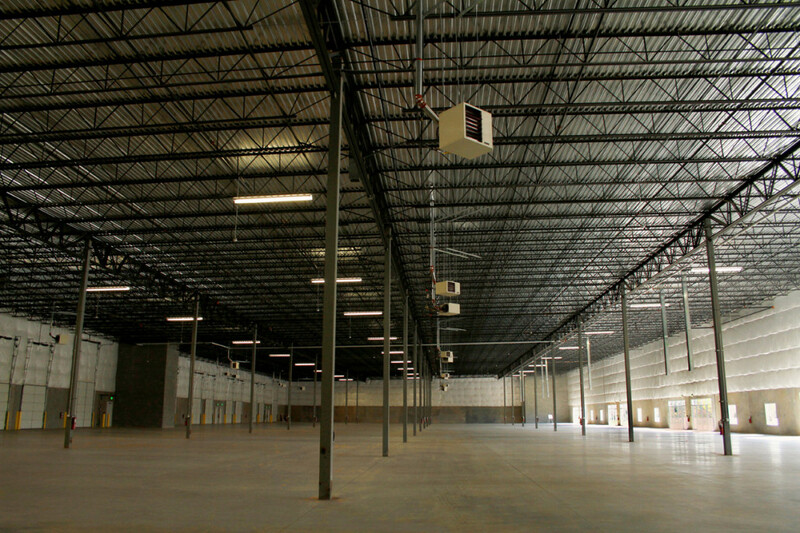 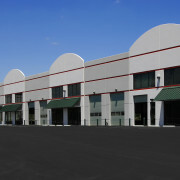 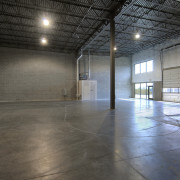 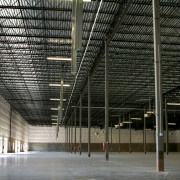 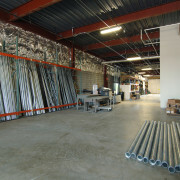 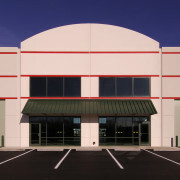 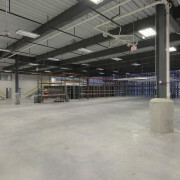 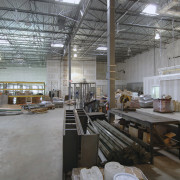 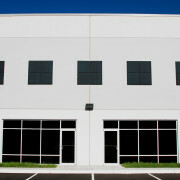 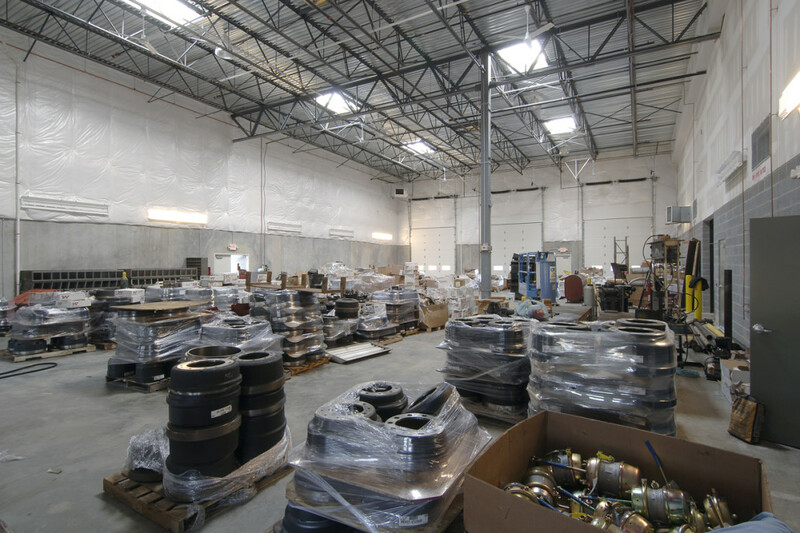 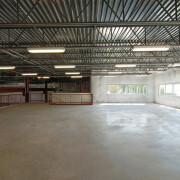 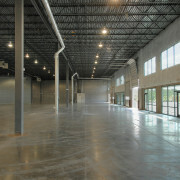 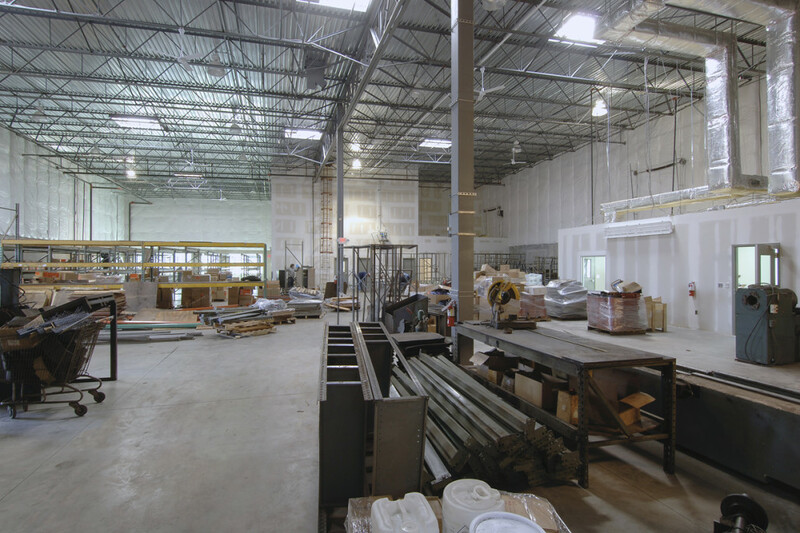 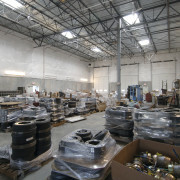 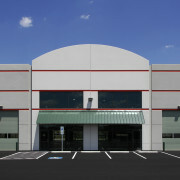 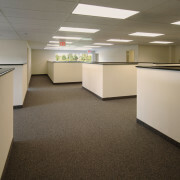 The space also includes a warehouse and contractor’s sales area. 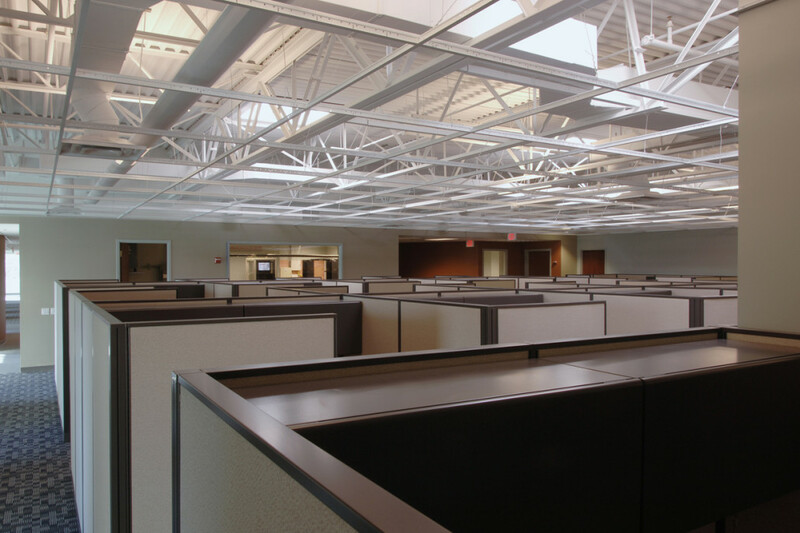 Structural Engineer: The Watkins Partnership, Inc. 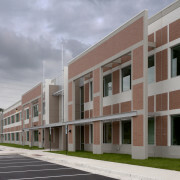 The new home office and distribution facility for Miller’s Office Products was constructed on a reclaimed wetlands area. 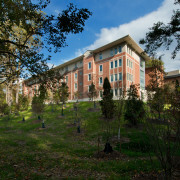 Removal of several beaver dams was required prior to commencement. 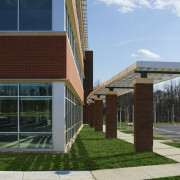 Creative solutions to significant soils issues were required. 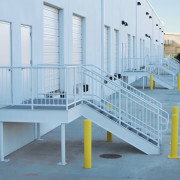 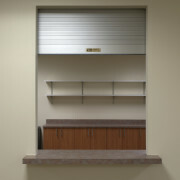 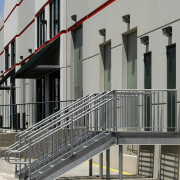 Access to the site was from one side only and required the stacking of all office functions above the loading dock. 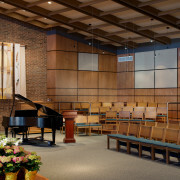 The Little Flower Church Main Hall is the First building on campus, and was constructed around 1950. 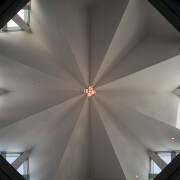 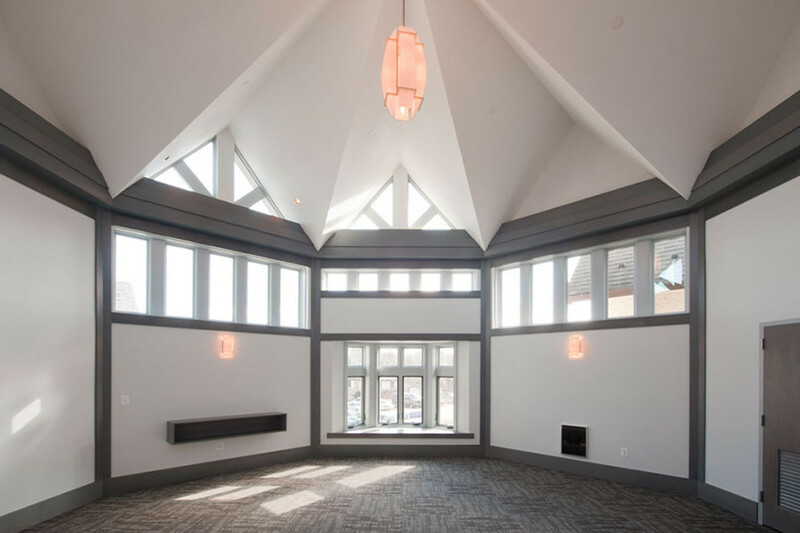 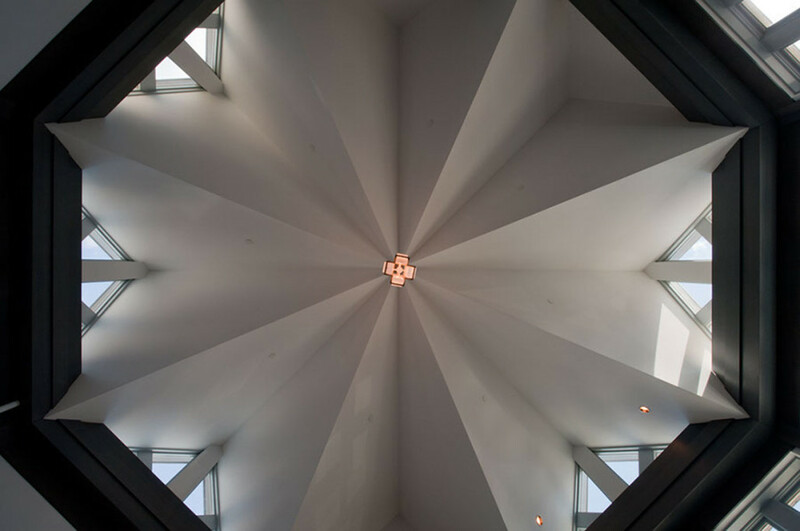 The renovation included a barrel vault ceiling, custom pendant light fixtures, and a new audio visual system. 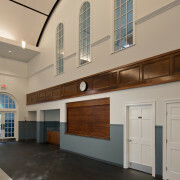 The existing choir balcony was enclosed to create a new class room. 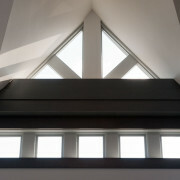 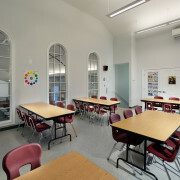 There are three new 16’ tall windows that allow natural light in the second floor classroom to flow into the Main Hall. 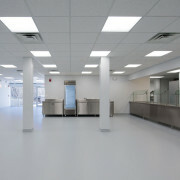 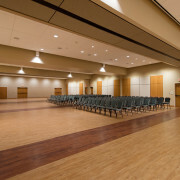 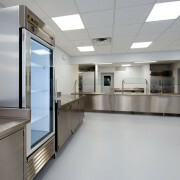 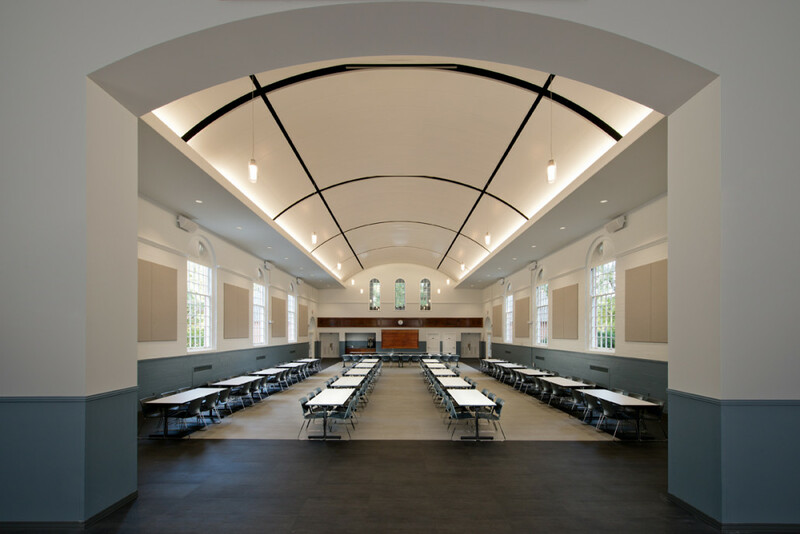 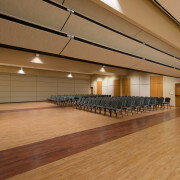 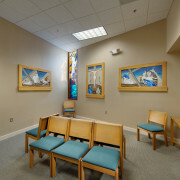 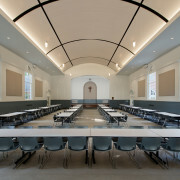 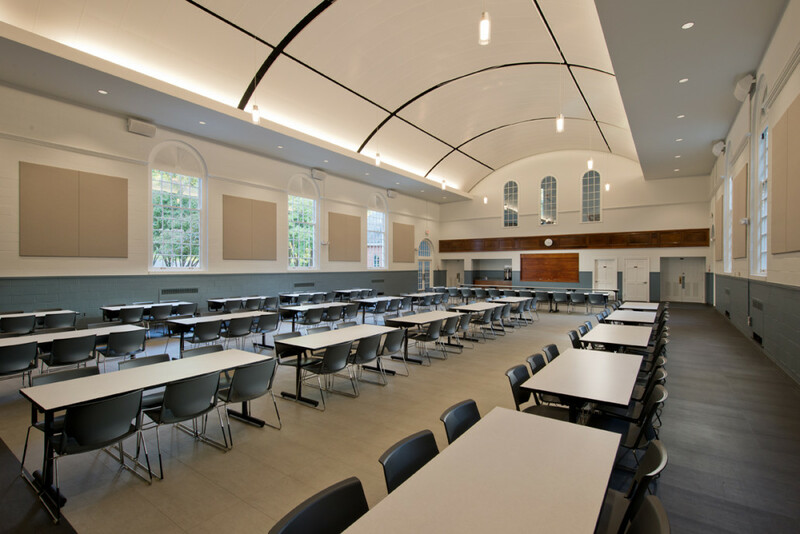 The renovated main hall serves as both the school cafeteria and meeting space after mass. 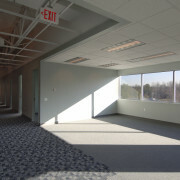 It is a unique space that is now both functional and aesthetically pleasing. 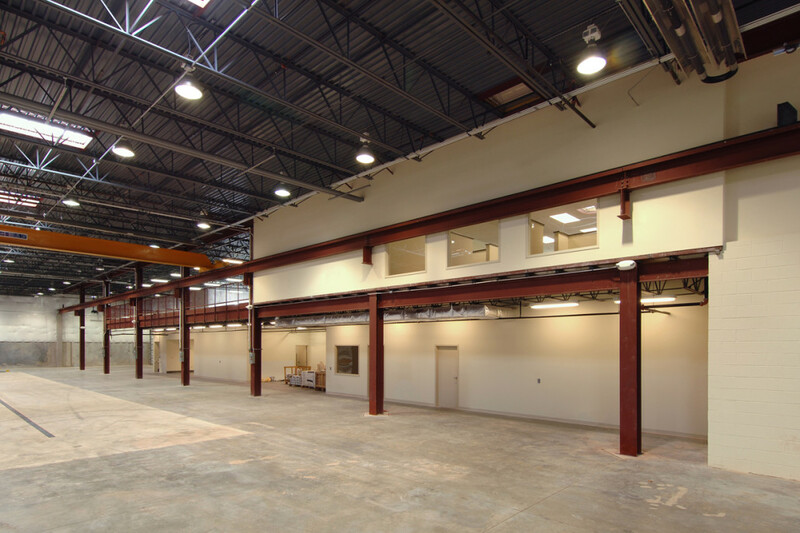 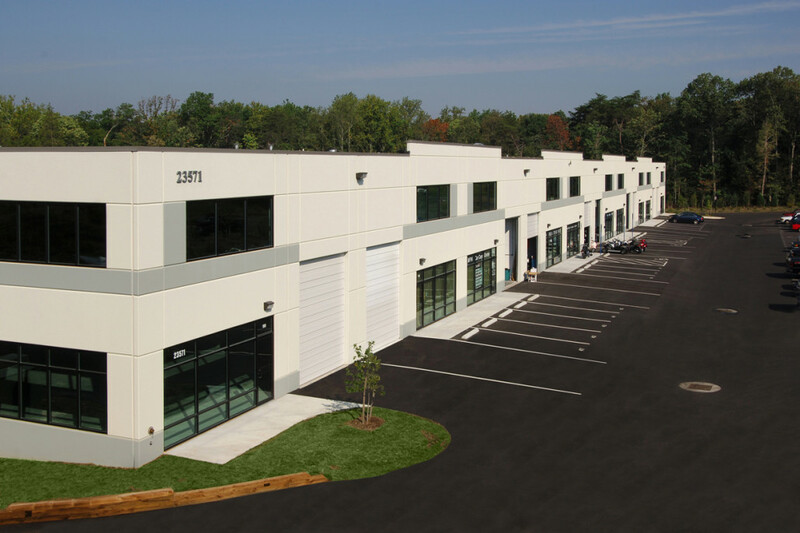 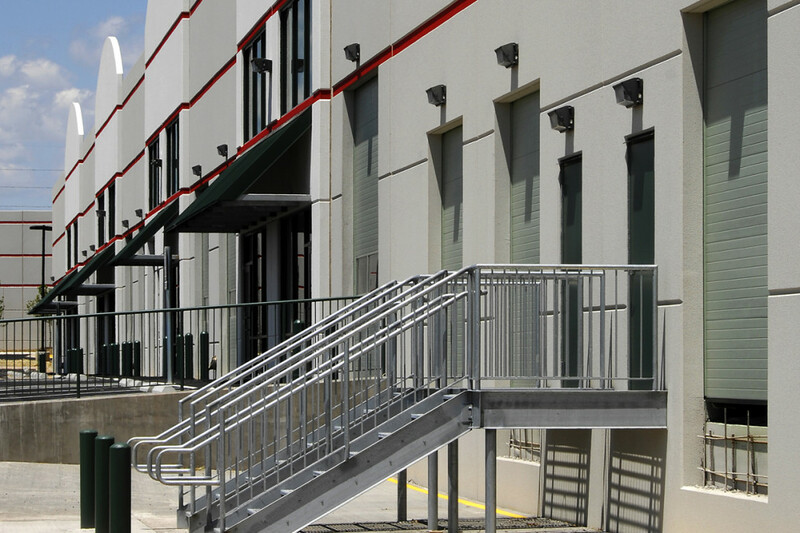 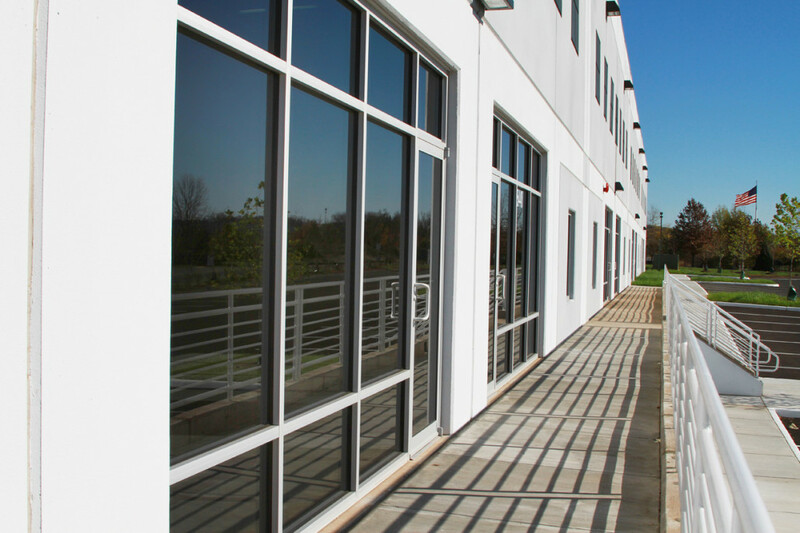 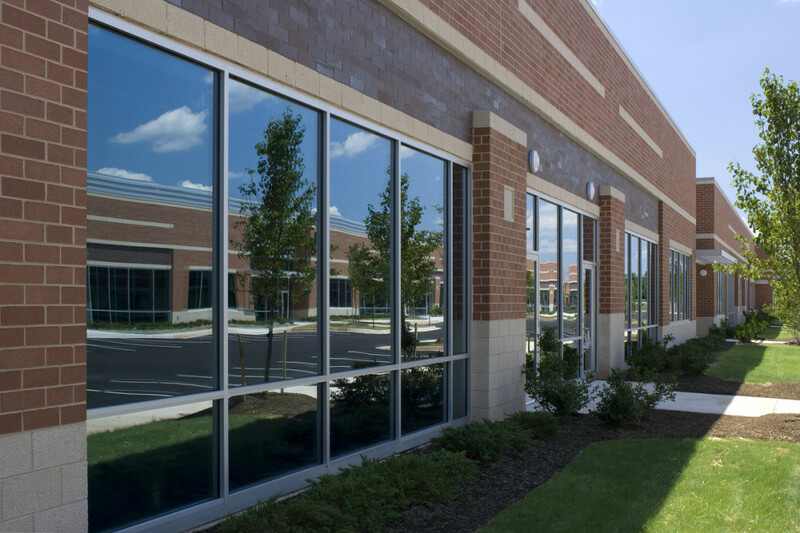 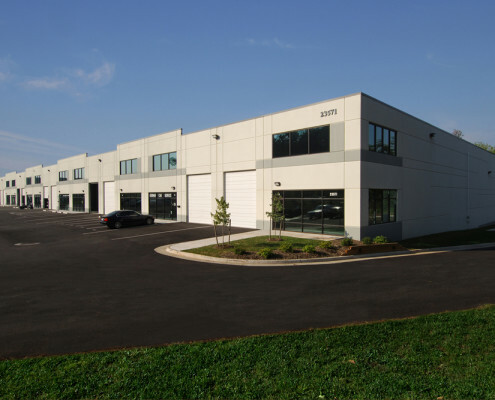 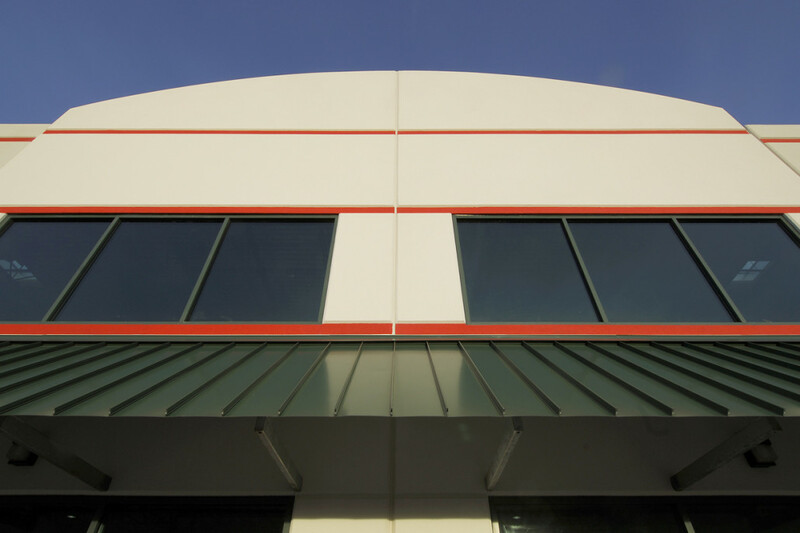 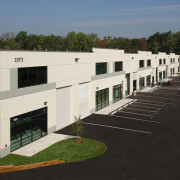 This project was a design build, flex industrial condominium warehouse buildings. 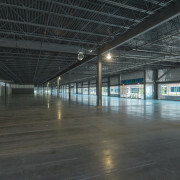 The 24’ clear tilt up buildings was a rear loaded multi-tenant layout with fenced outdoor storage areas having power and water connections. 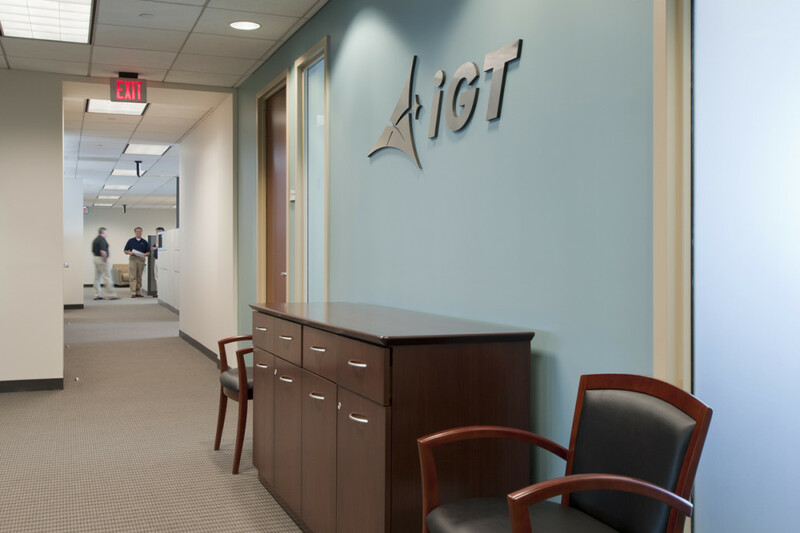 iDirect Government Technologies offers IP communications technology that enables constant connectivity for voice, video, and data applications in diverse and challenging environments. 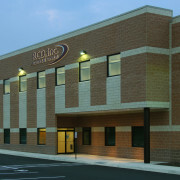 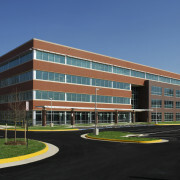 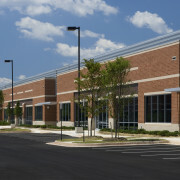 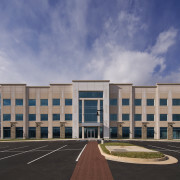 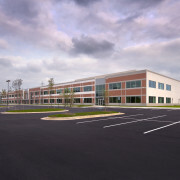 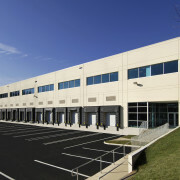 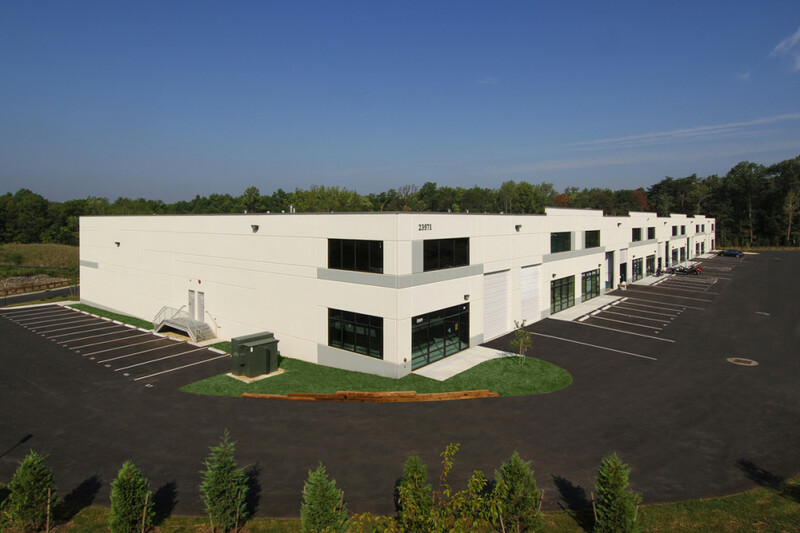 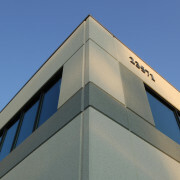 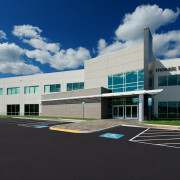 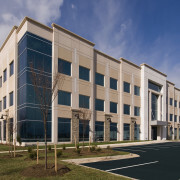 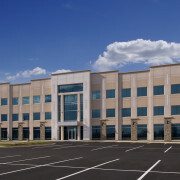 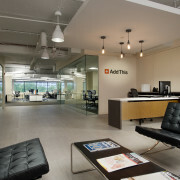 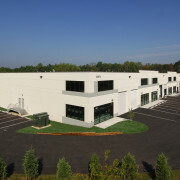 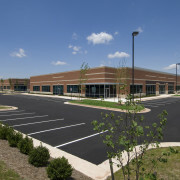 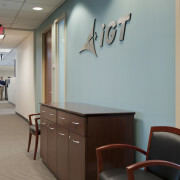 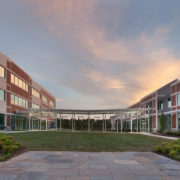 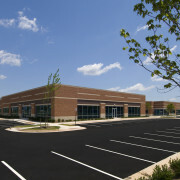 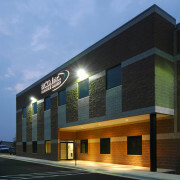 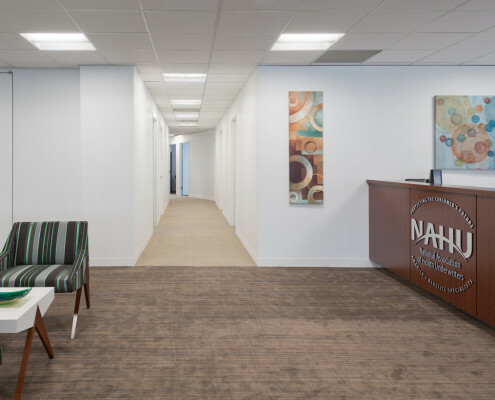 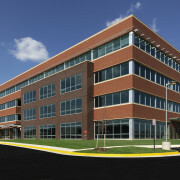 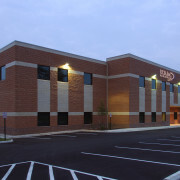 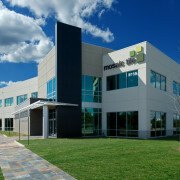 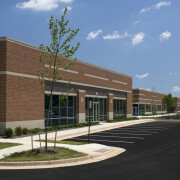 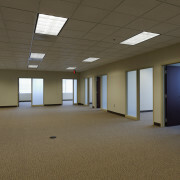 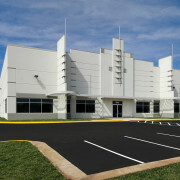 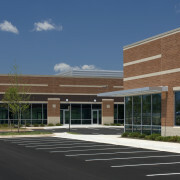 This is their newest 22,000 SF office space located in Fairfax County, directly in the RT. 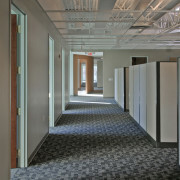 28 Corridor. 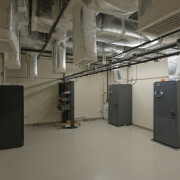 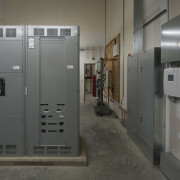 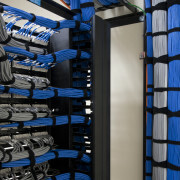 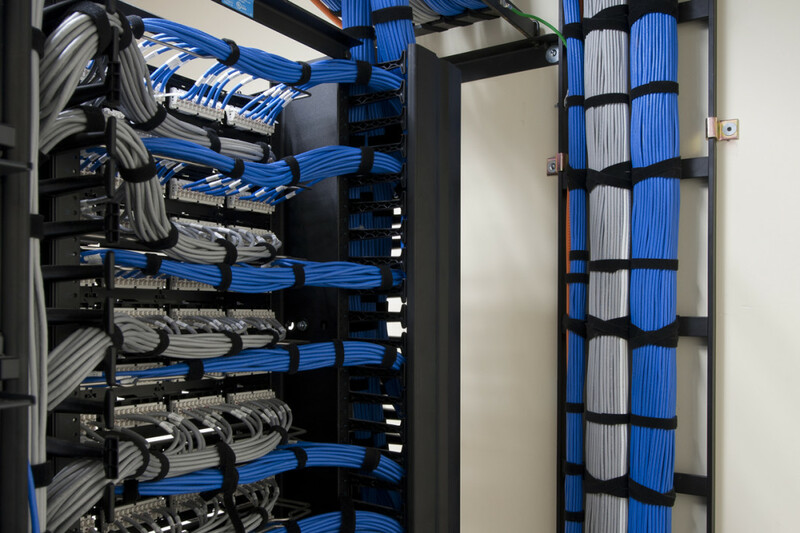 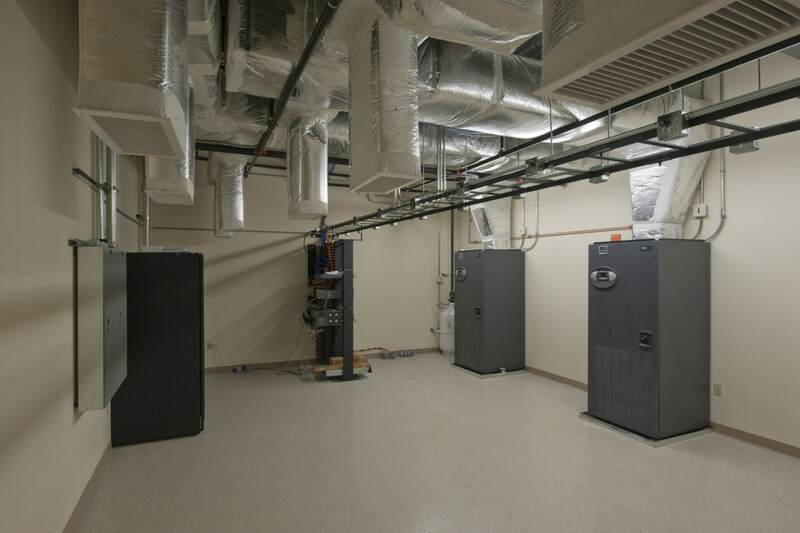 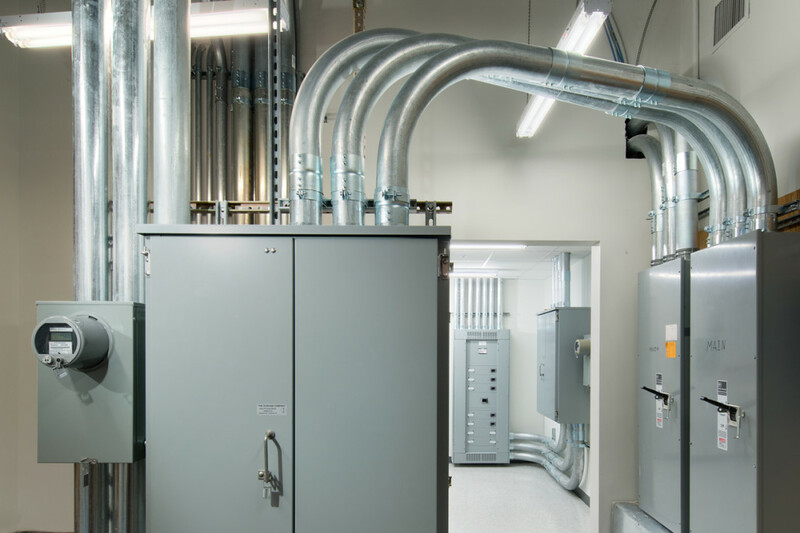 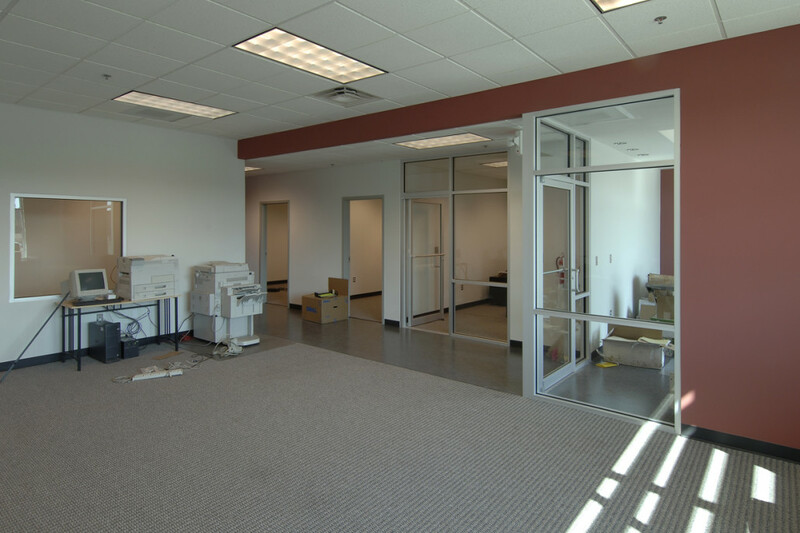 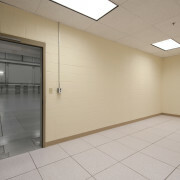 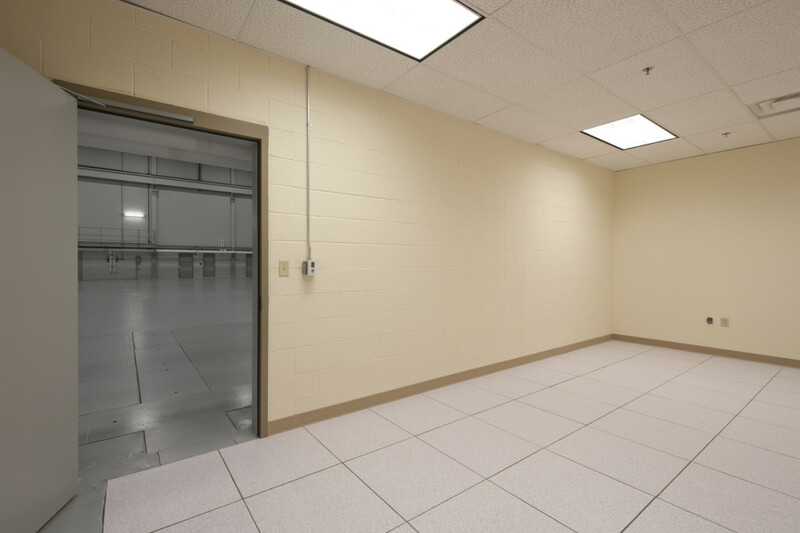 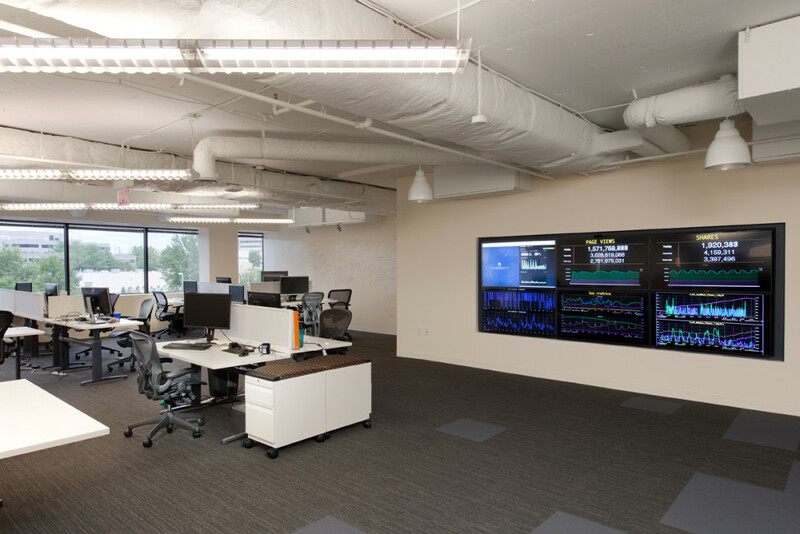 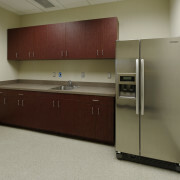 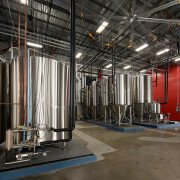 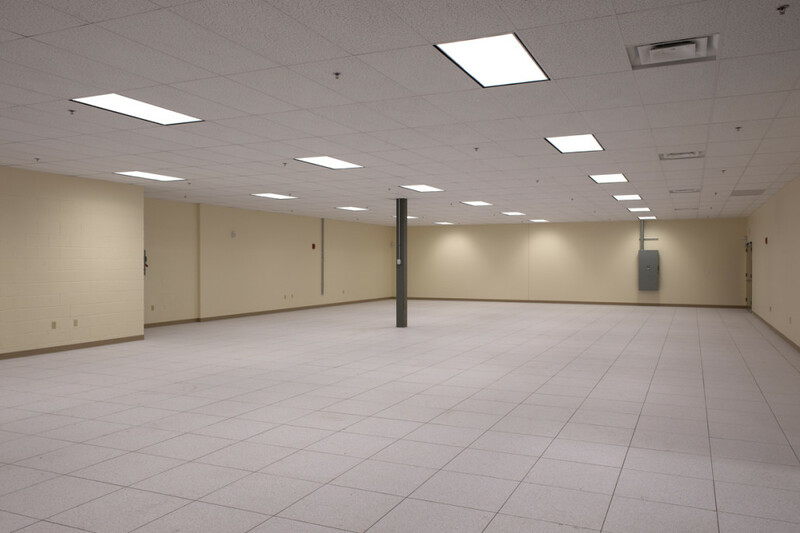 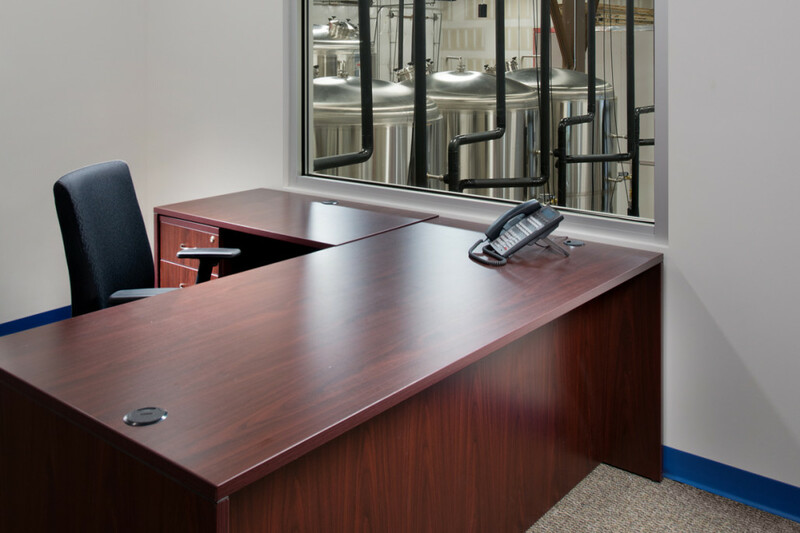 This space features complex supplemental mechanical equipment to cool their multiple IT, UPS, and Server Rooms. 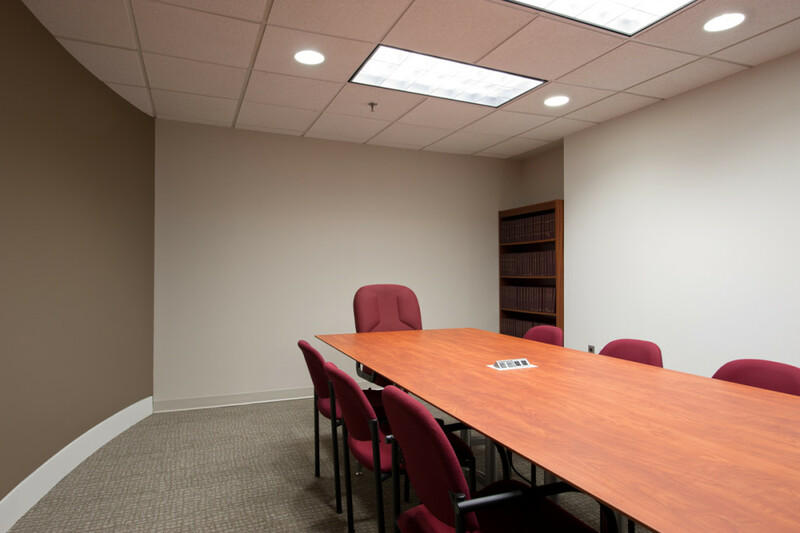 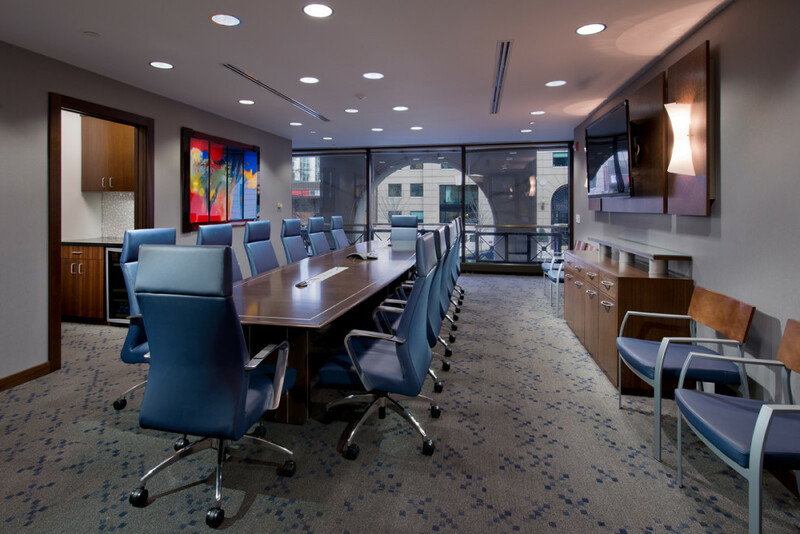 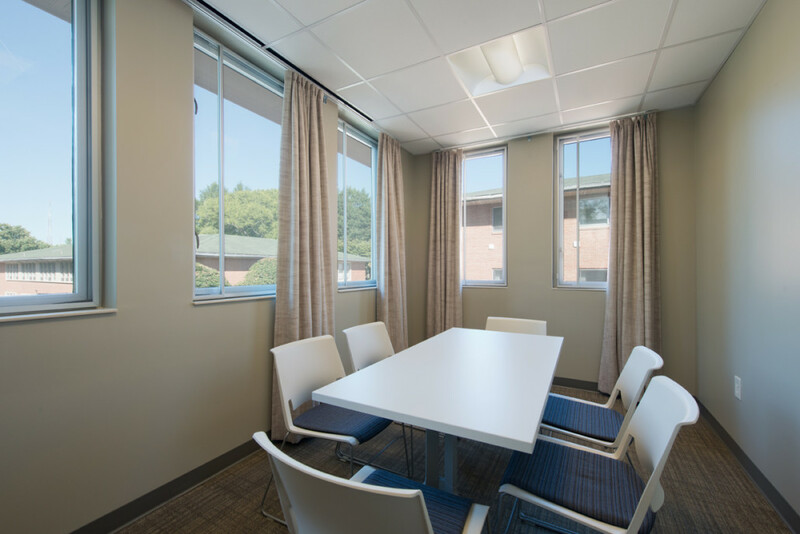 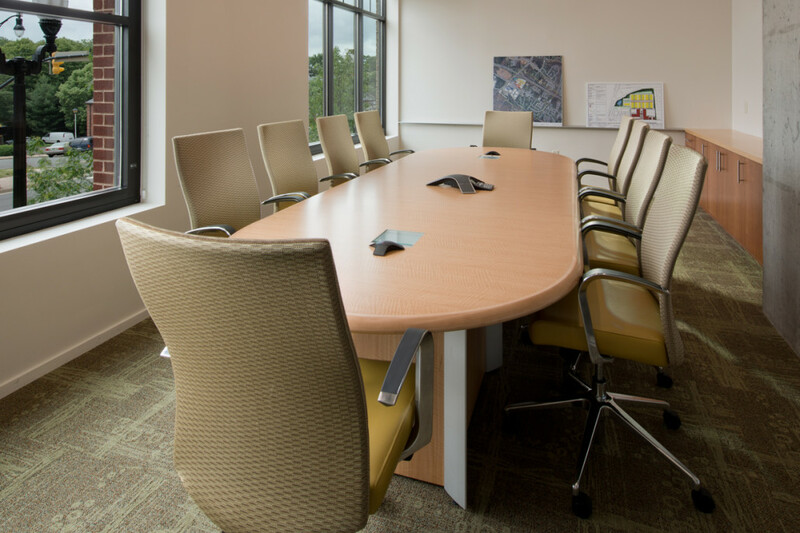 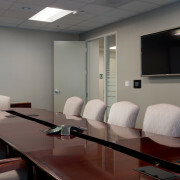 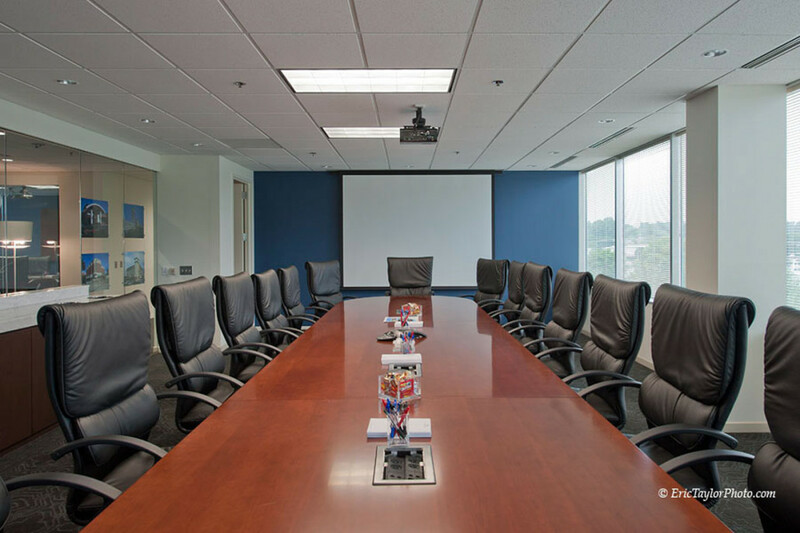 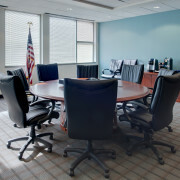 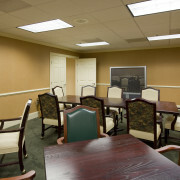 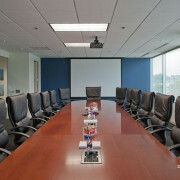 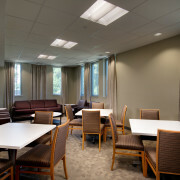 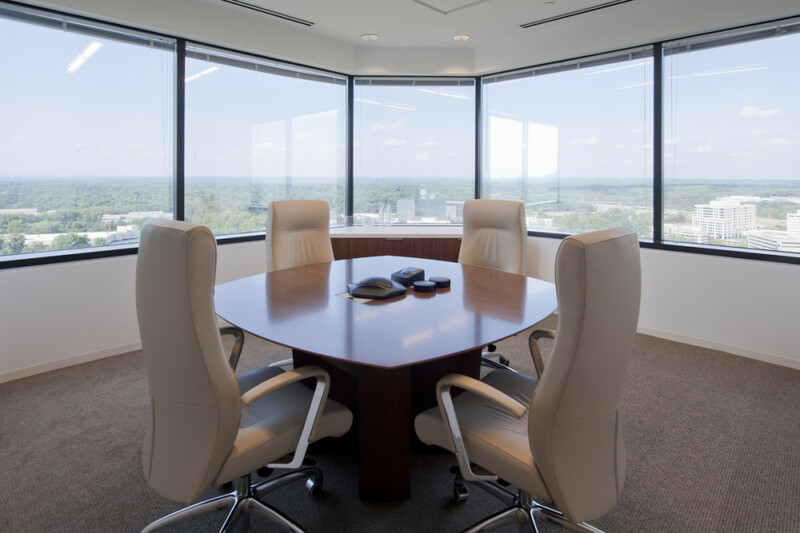 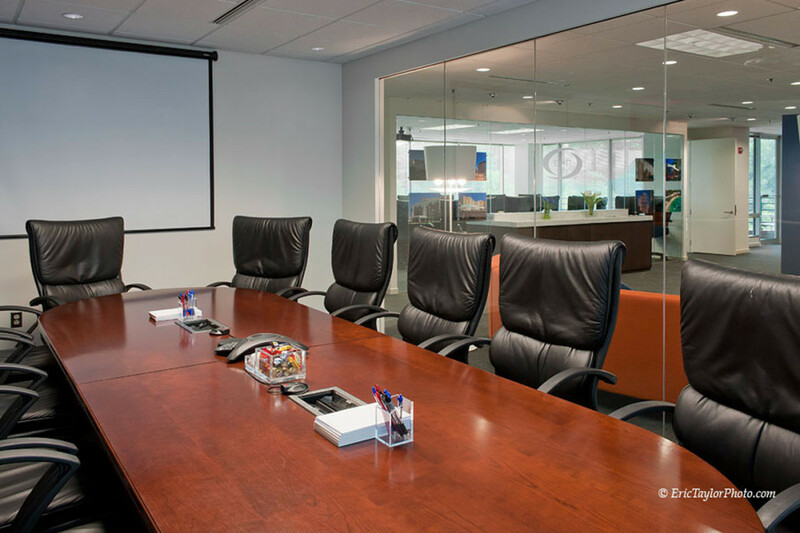 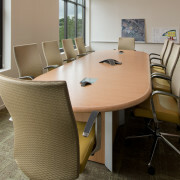 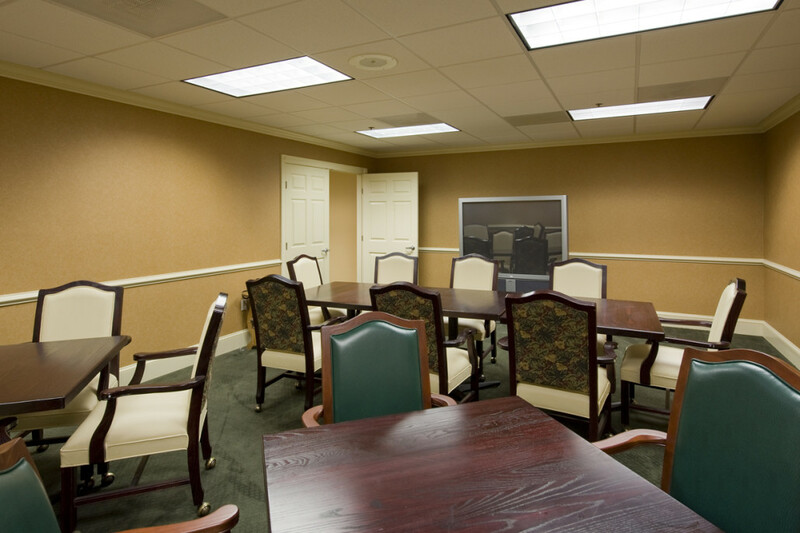 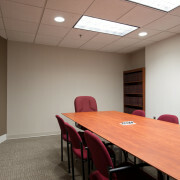 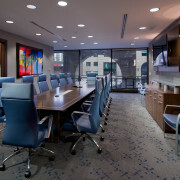 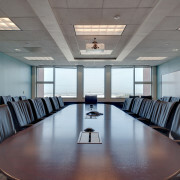 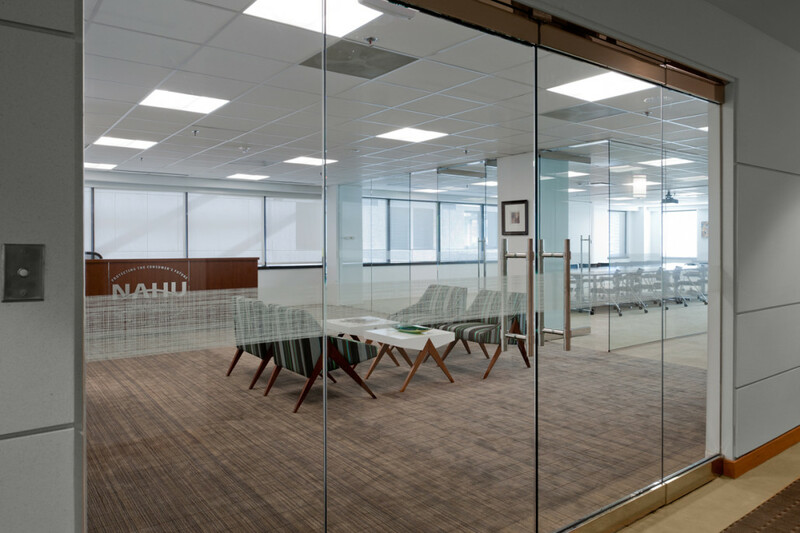 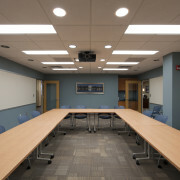 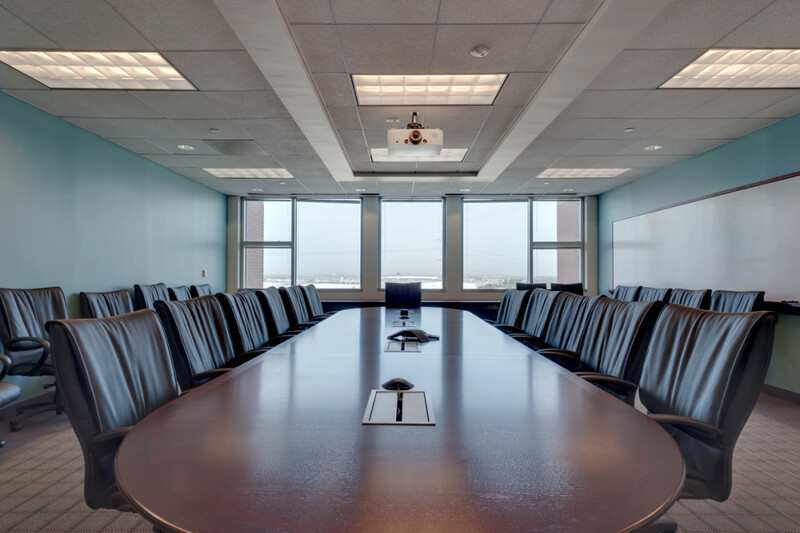 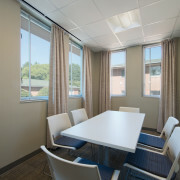 A classified conference room was also constructed within the space that required extensive sound dampening. 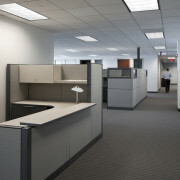 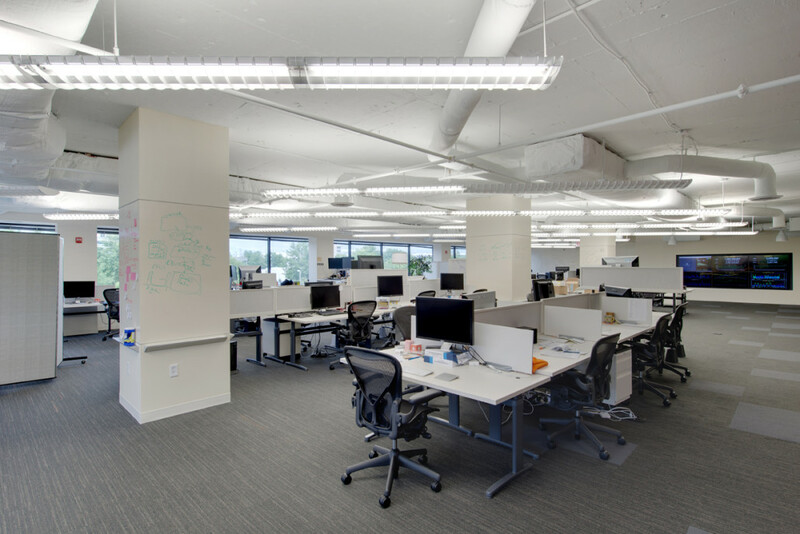 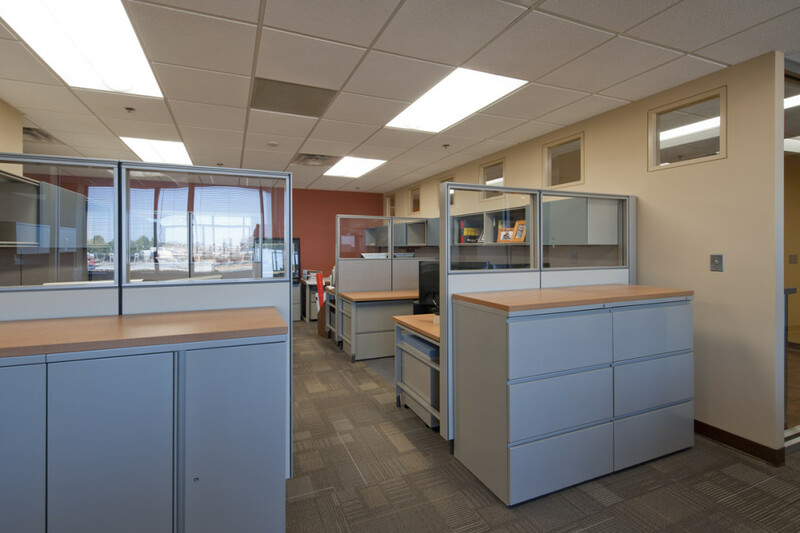 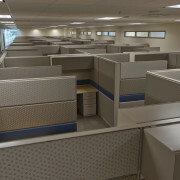 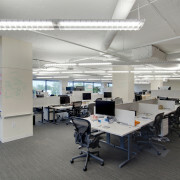 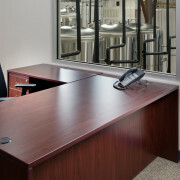 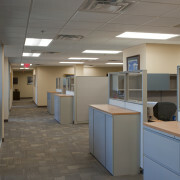 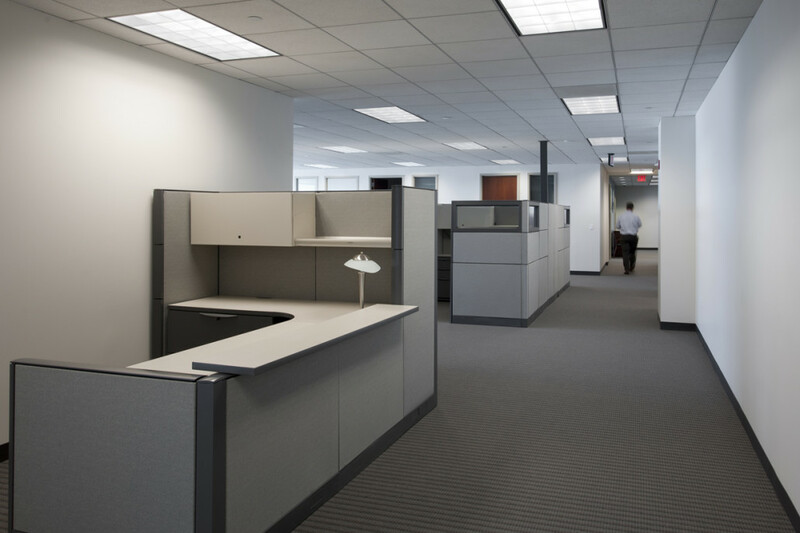 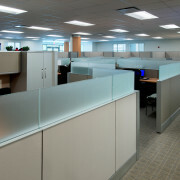 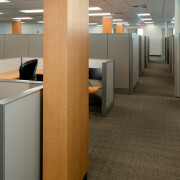 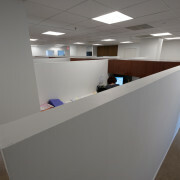 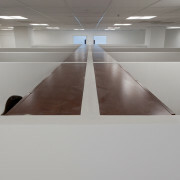 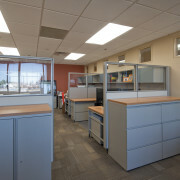 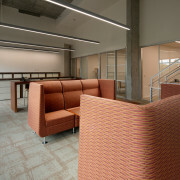 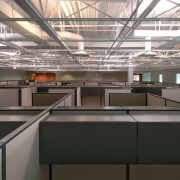 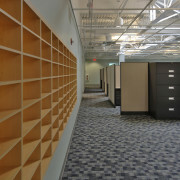 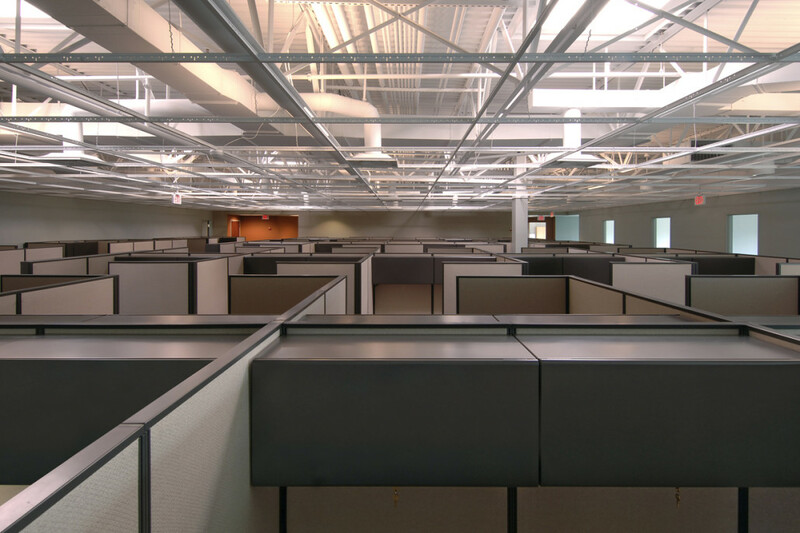 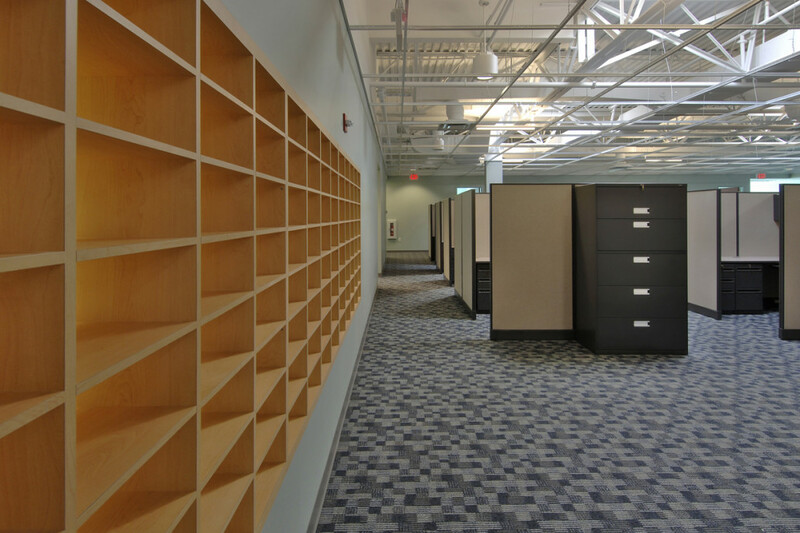 The large work areas include cubicles that have been reclaimed for workstations. 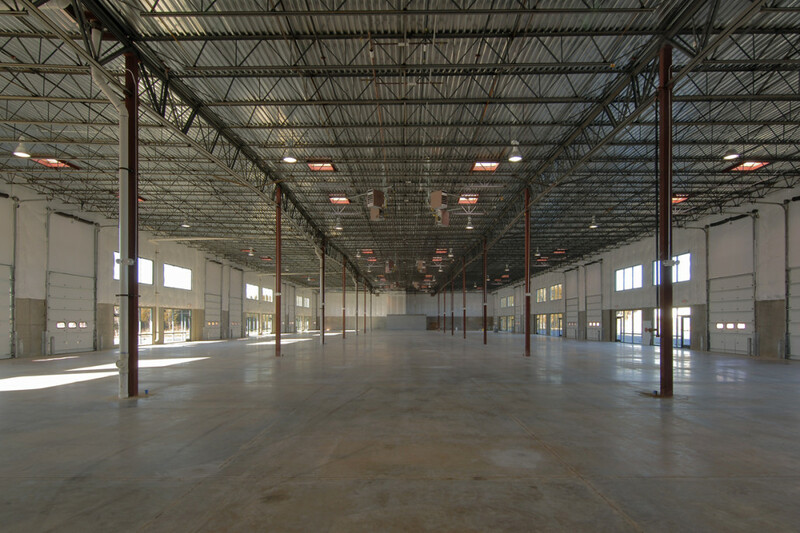 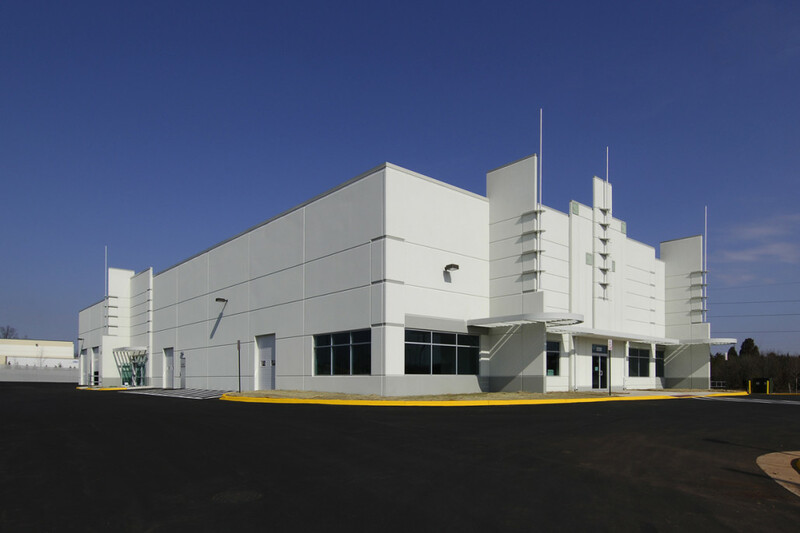 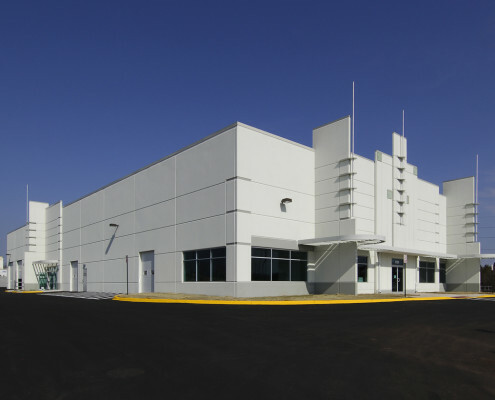 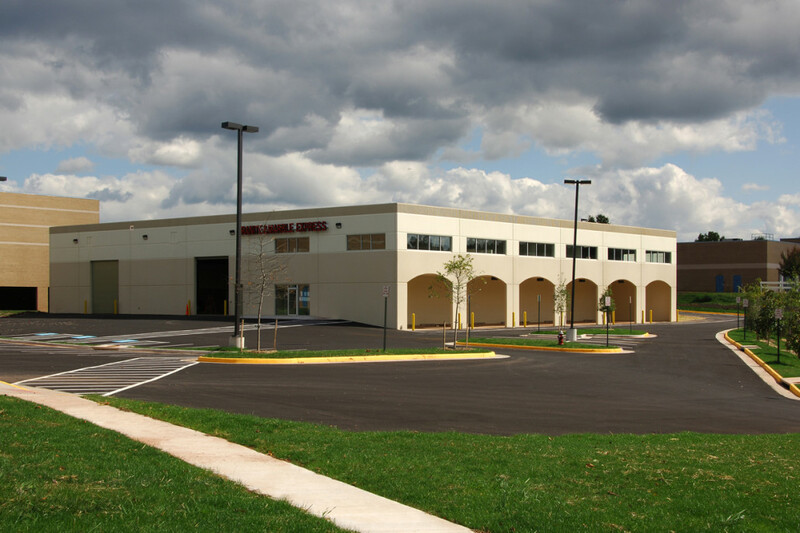 This design build, build to suit was a 24’ clear tilt up concrete warehousing, and heavy vehicle repair facility. 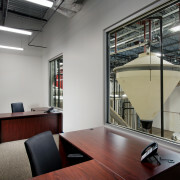 The new home office for Heavy Fleet was designed to accomplish the owner’s desire for a South Beach look in a tilt up building. 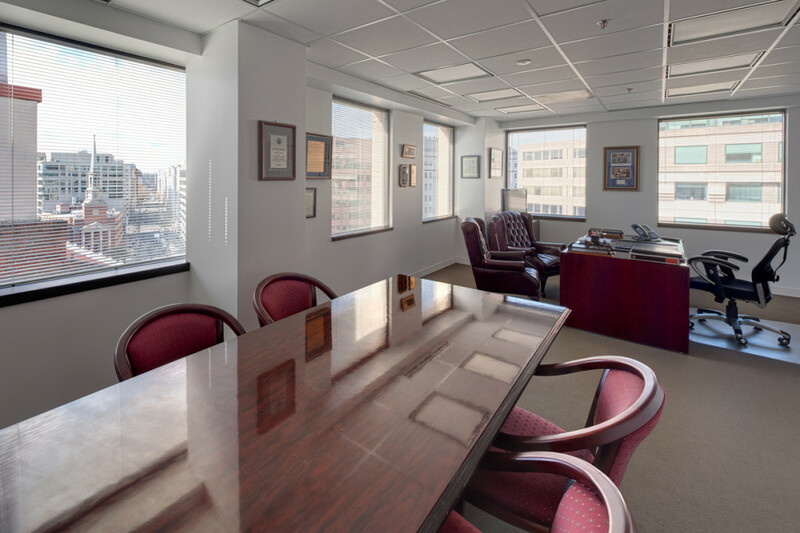 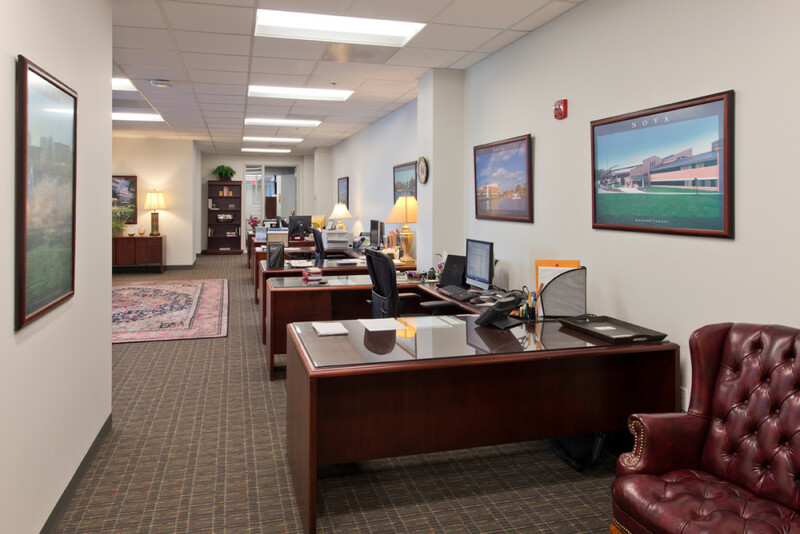 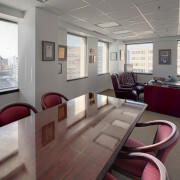 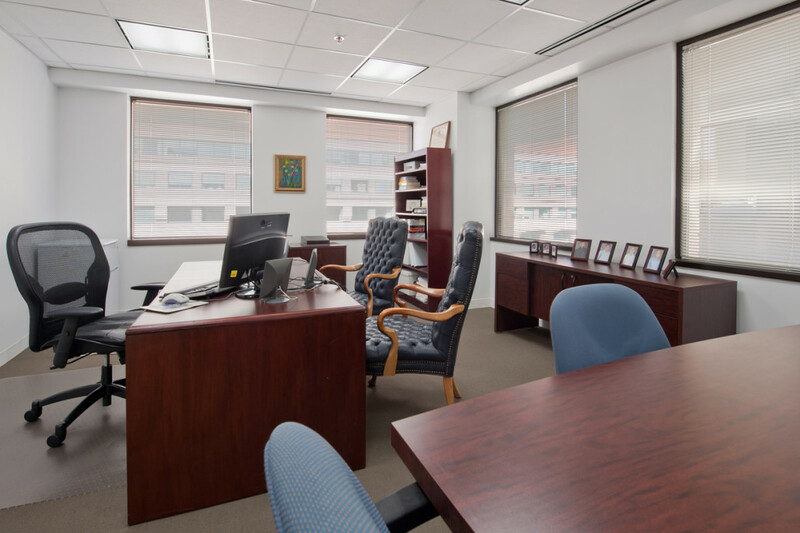 Harmon Curran was founded in 1969 in NW Washington, D.C. to practice law with a commitment to public service. 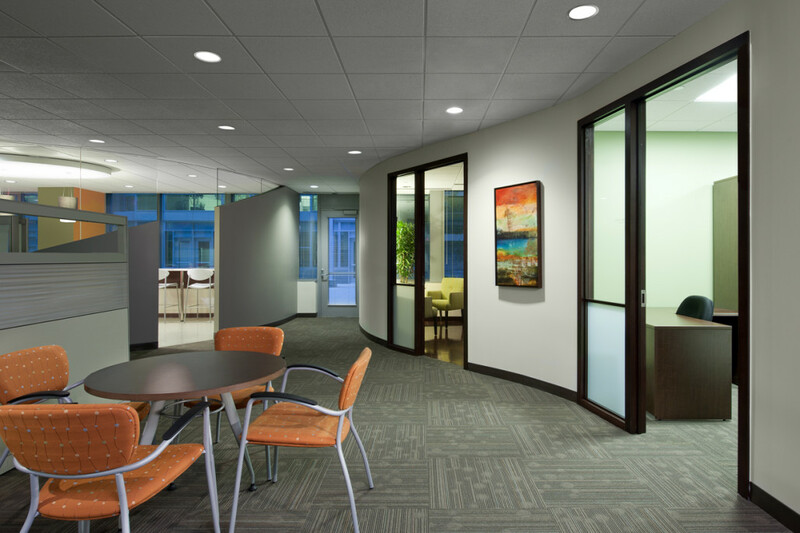 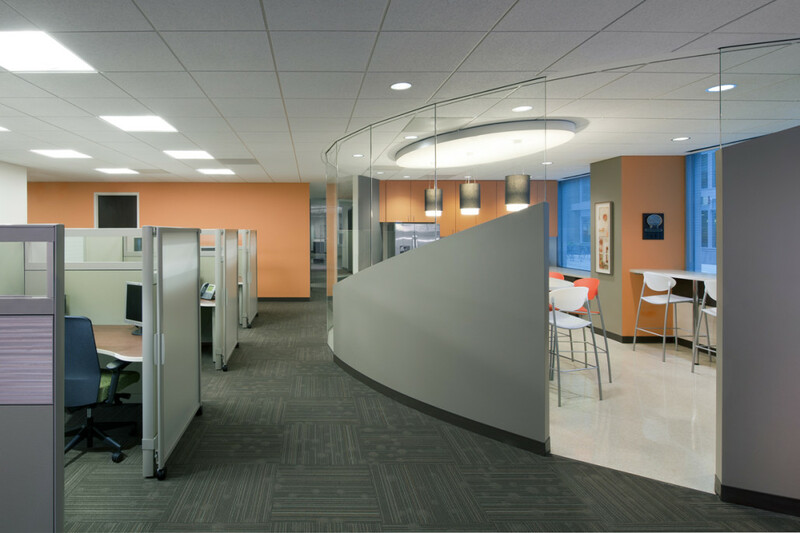 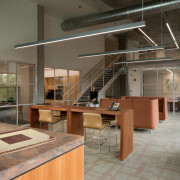 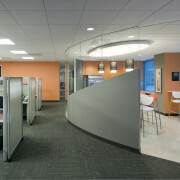 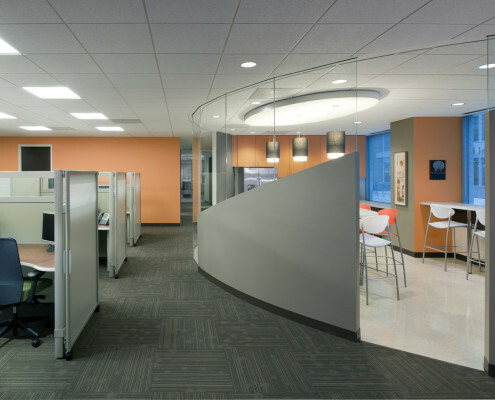 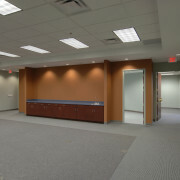 The space includes radius drywall ceilings, accent lighting, and use of 3-form acrylic panels. 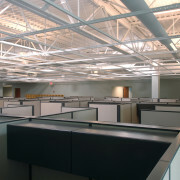 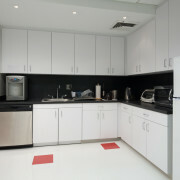 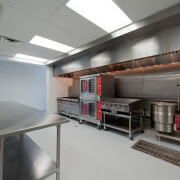 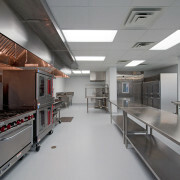 Proficient use of space and elevated ceiling heights maximize the efficiency of the space. 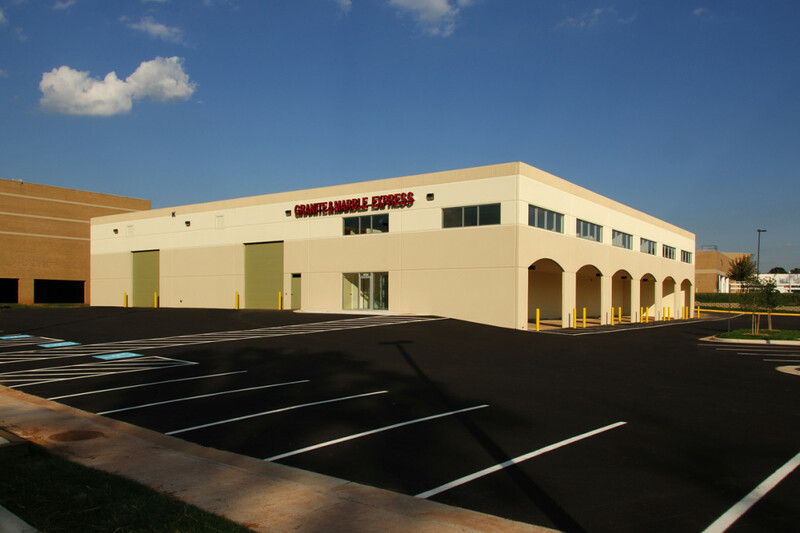 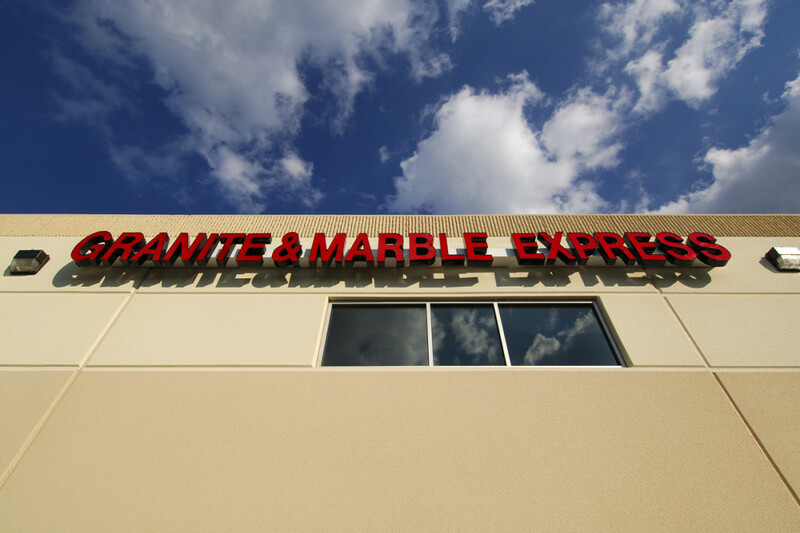 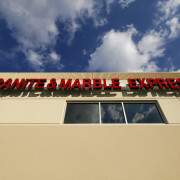 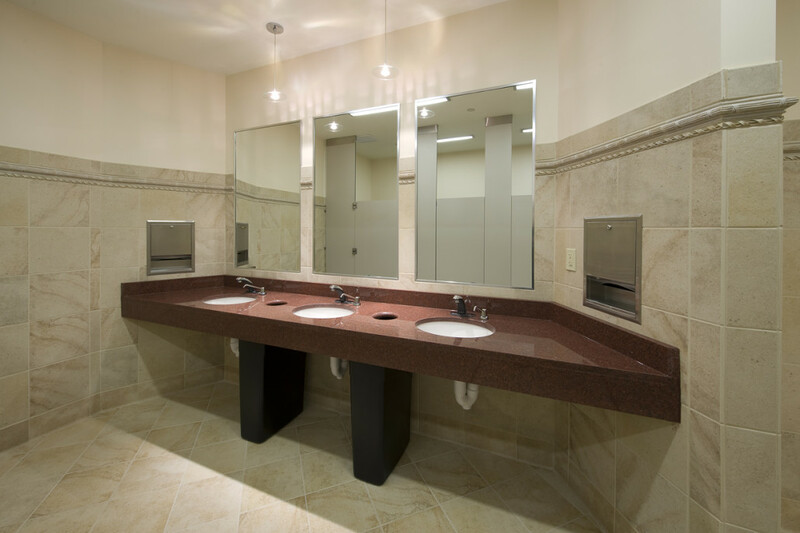 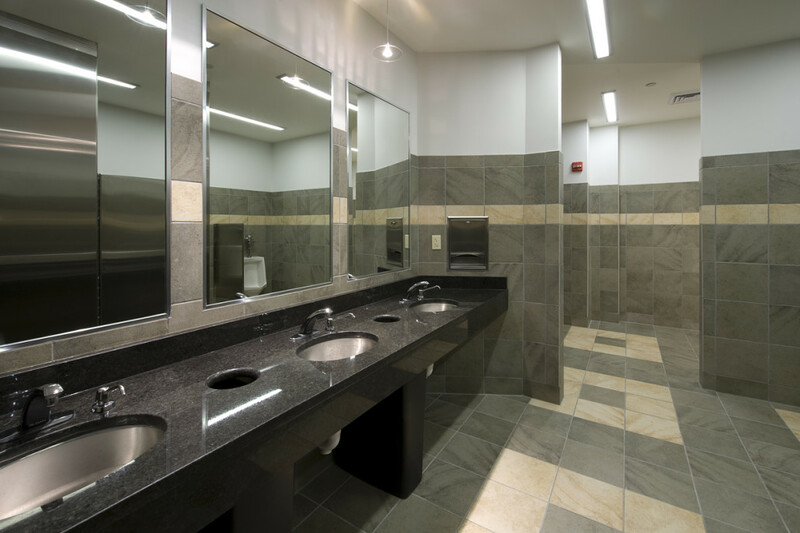 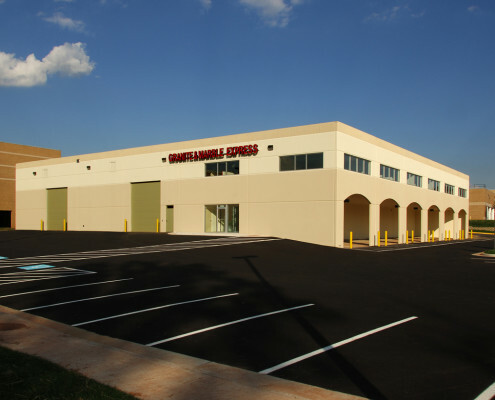 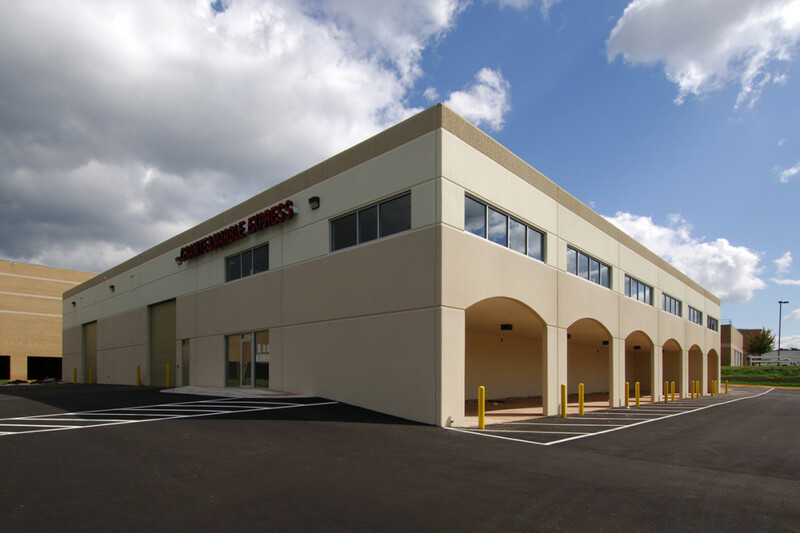 The Granite and Marble Express project was a build to suit for a granite and marble manufacturing and distribution facility. 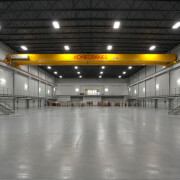 It included a 24’ clear tilt up shell with mezzanine office and storage space, gantry cranes, and CNC machines with water recovery systems for cutting and polishing stones. 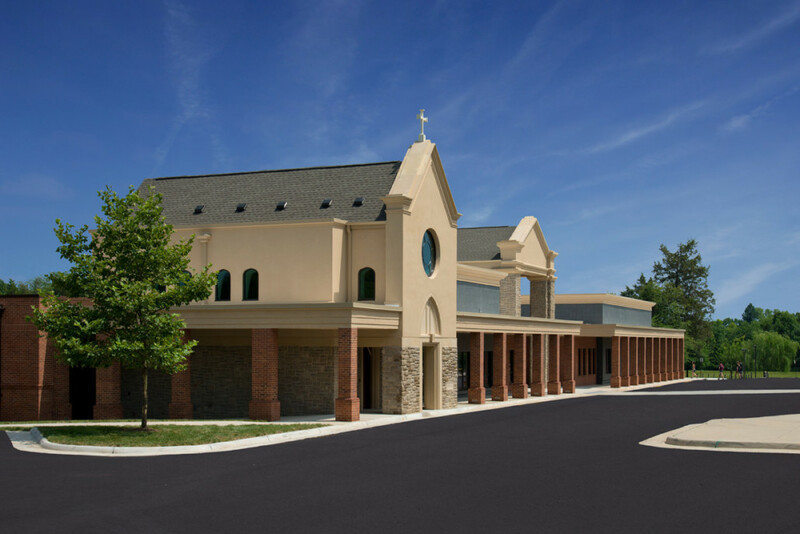 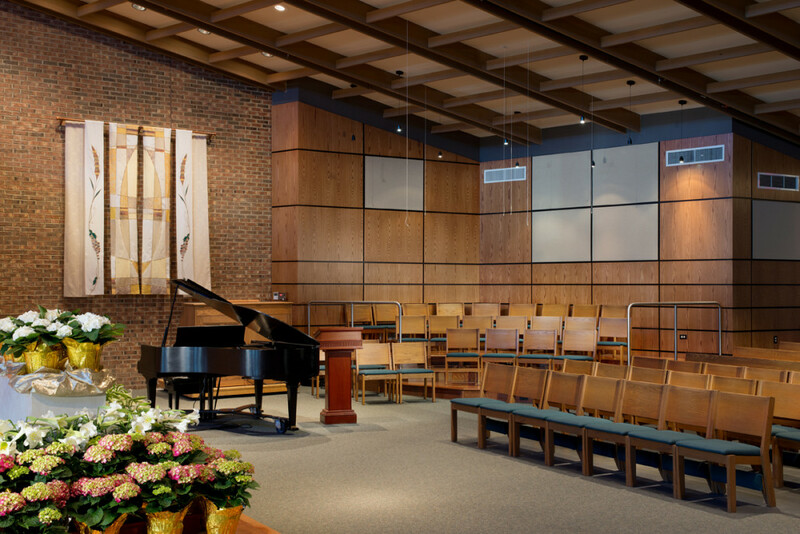 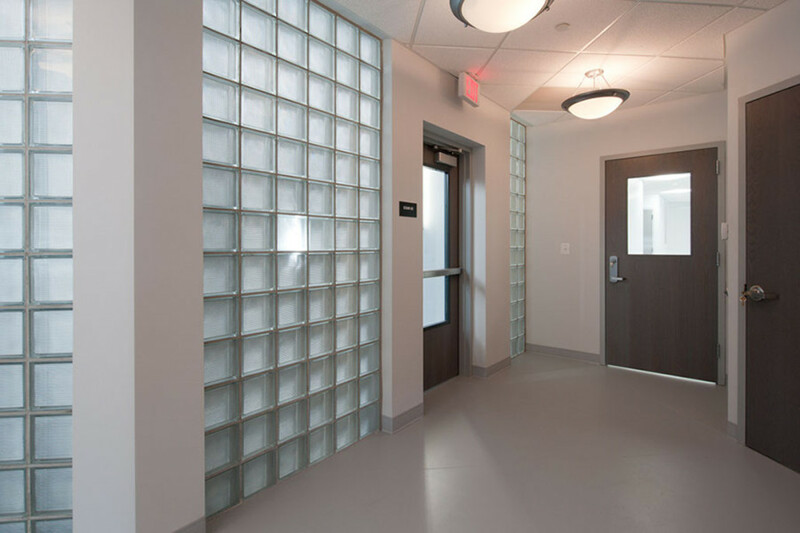 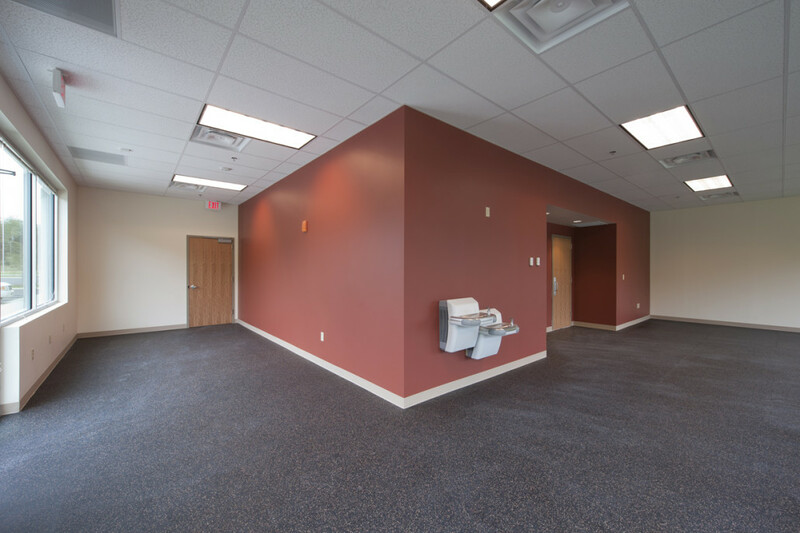 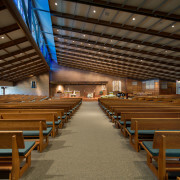 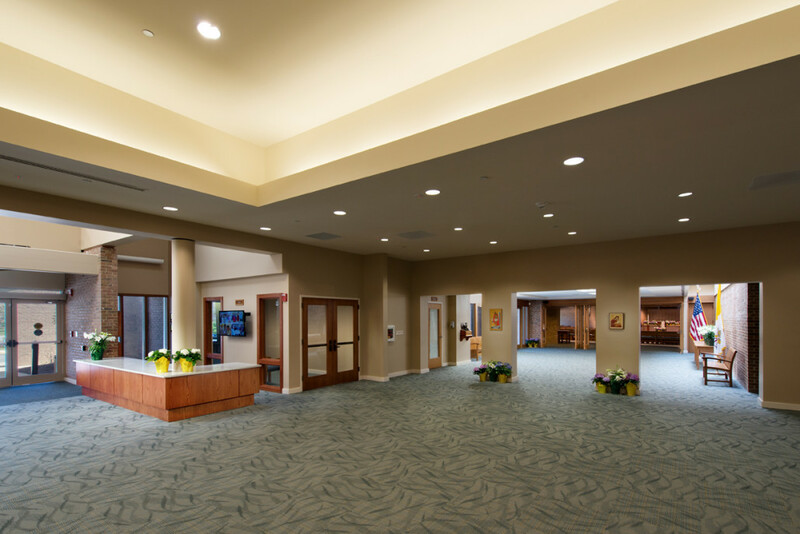 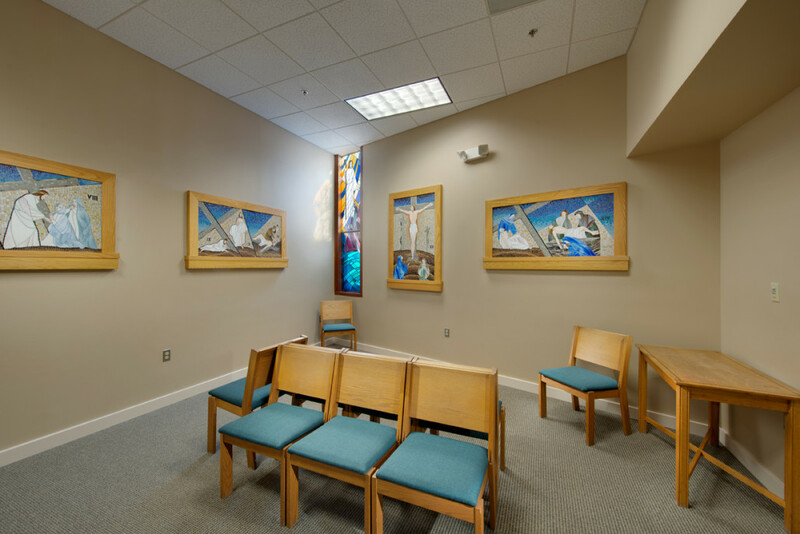 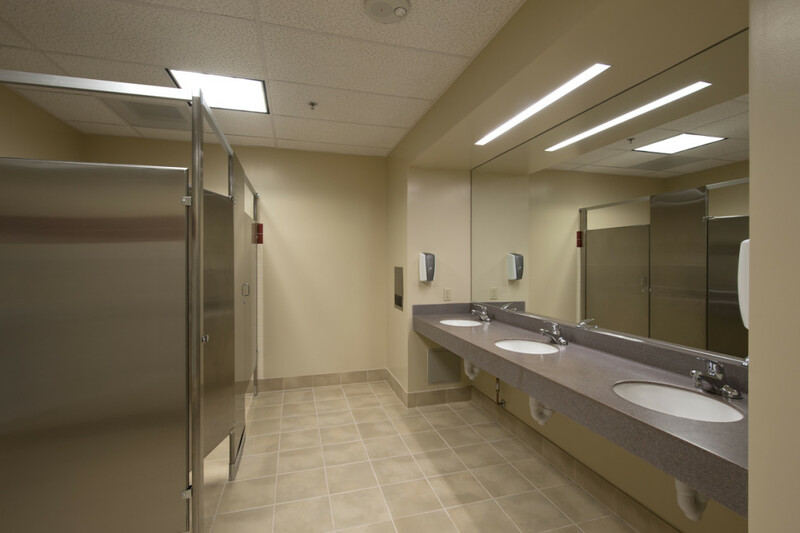 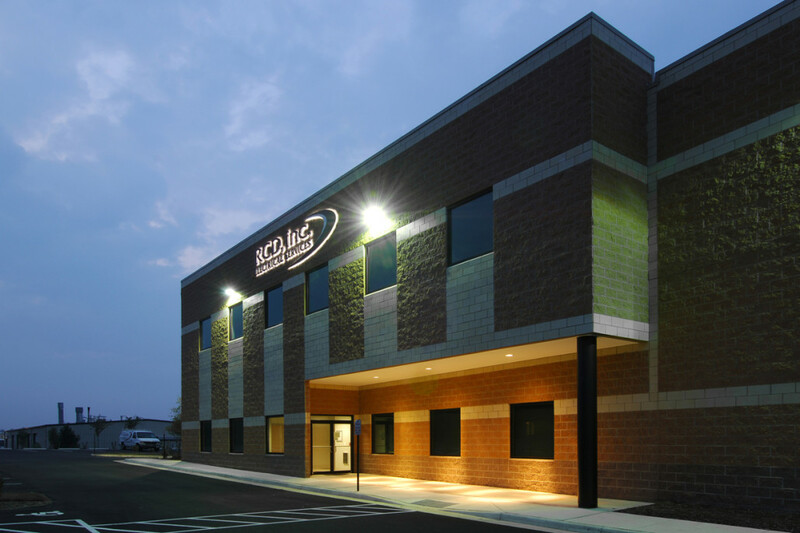 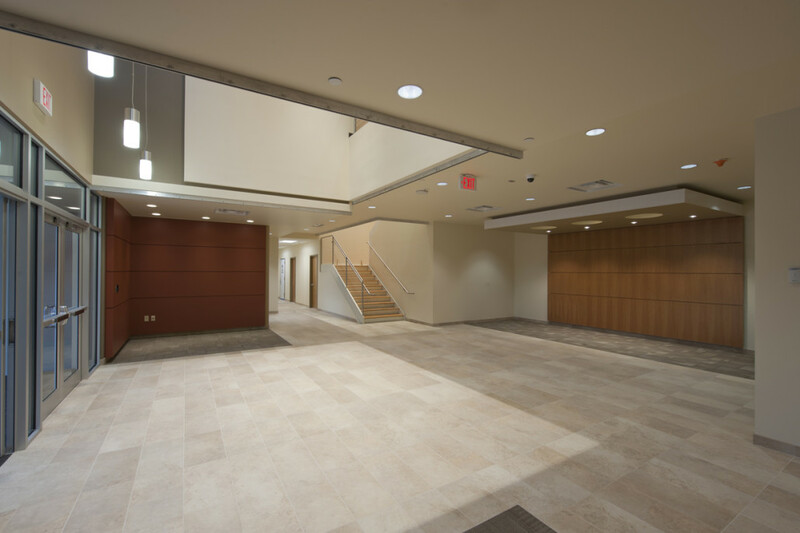 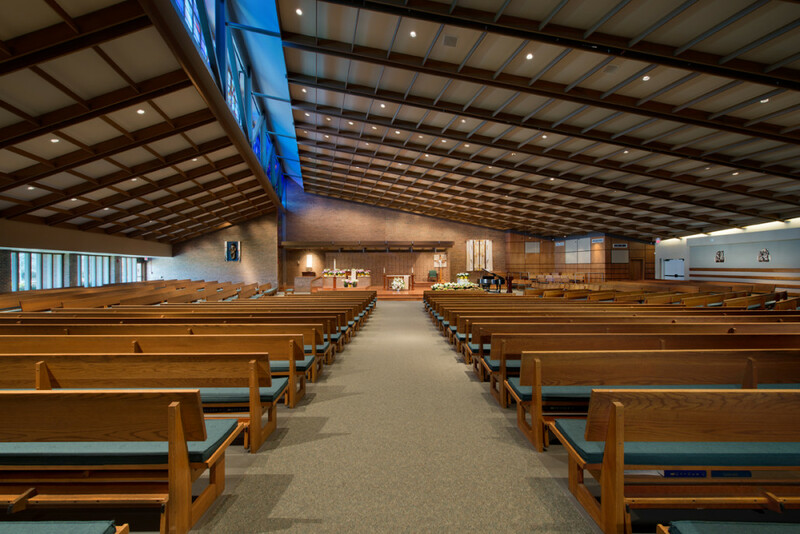 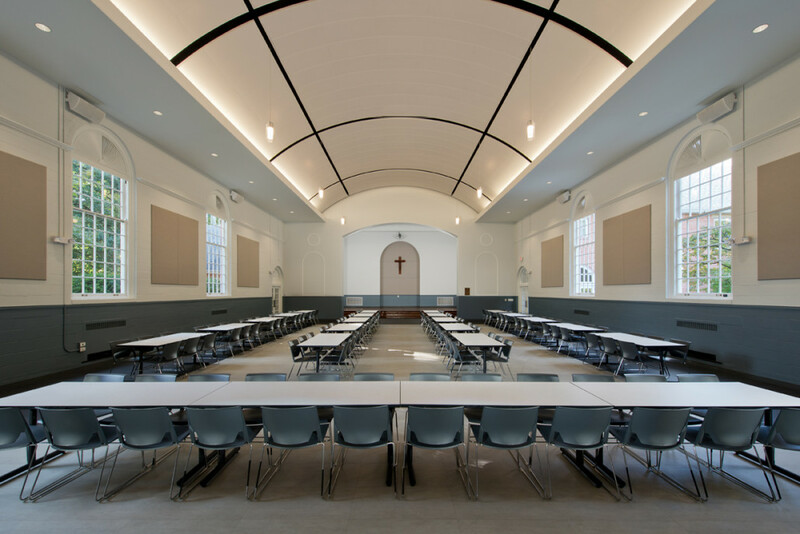 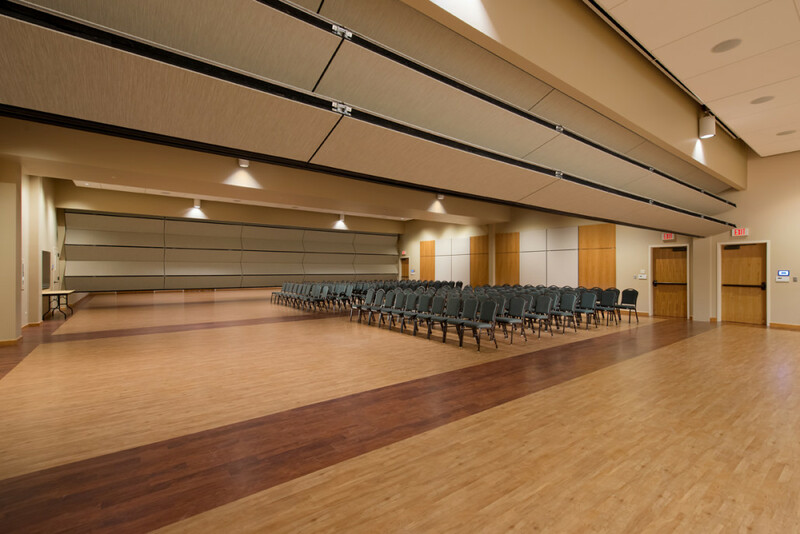 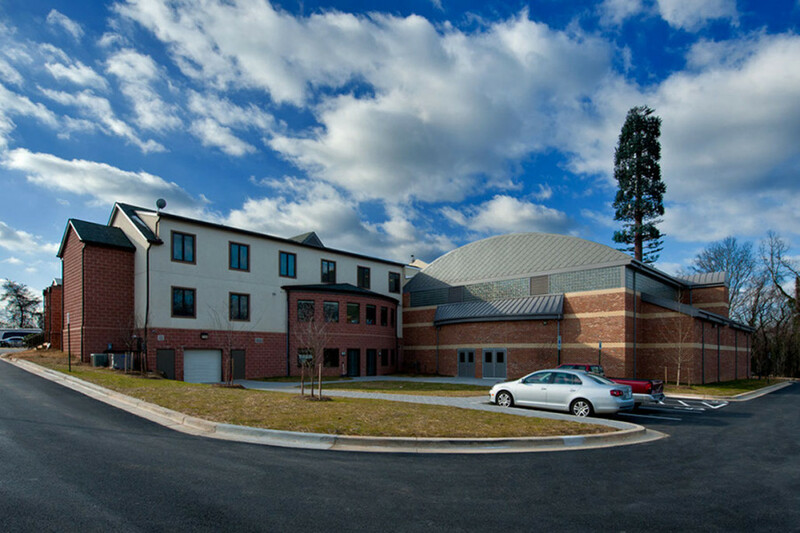 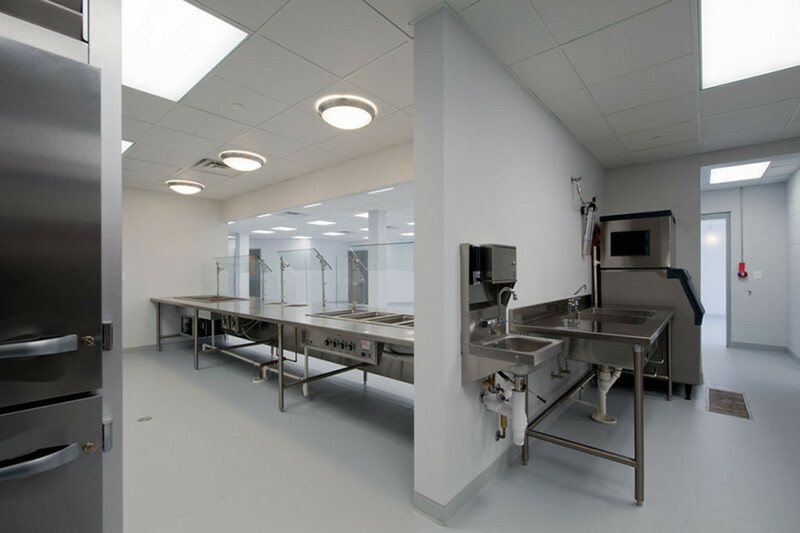 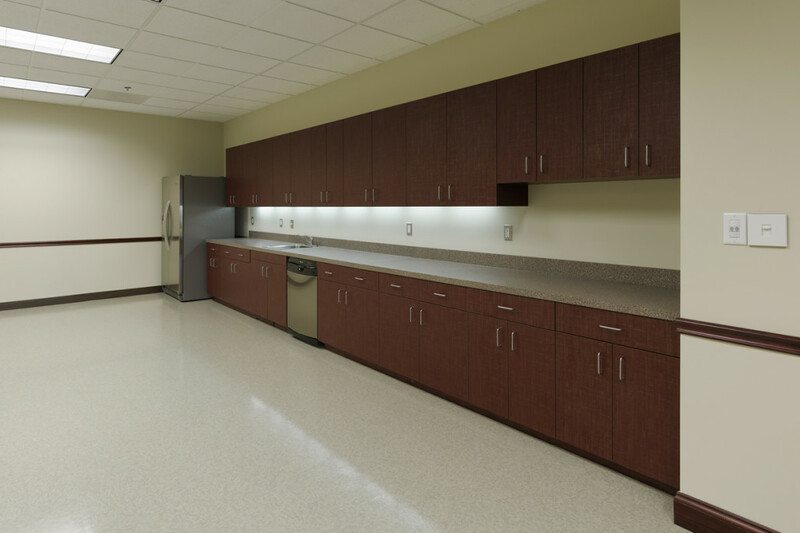 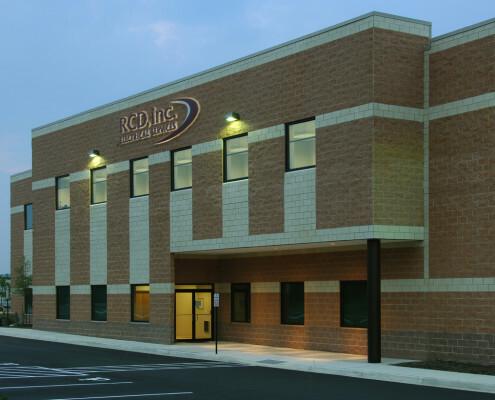 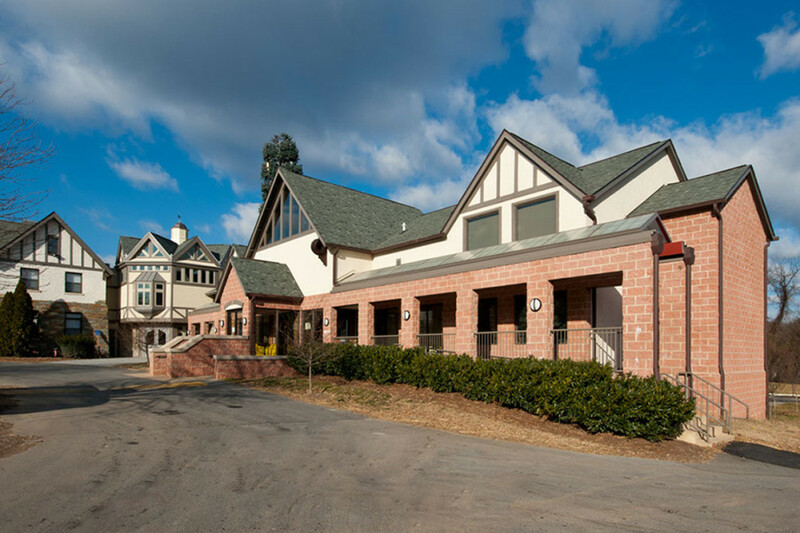 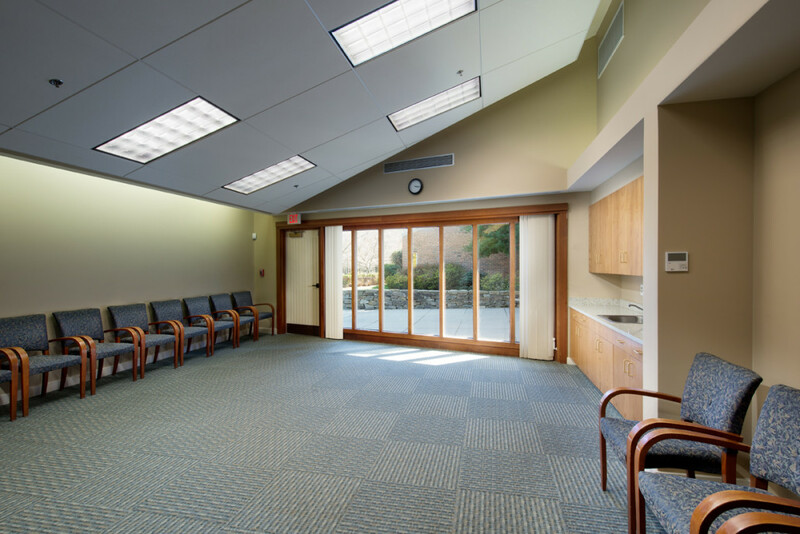 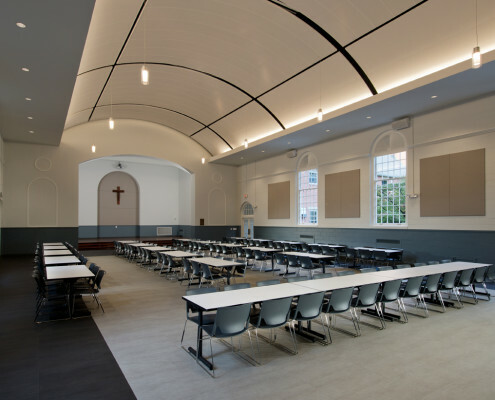 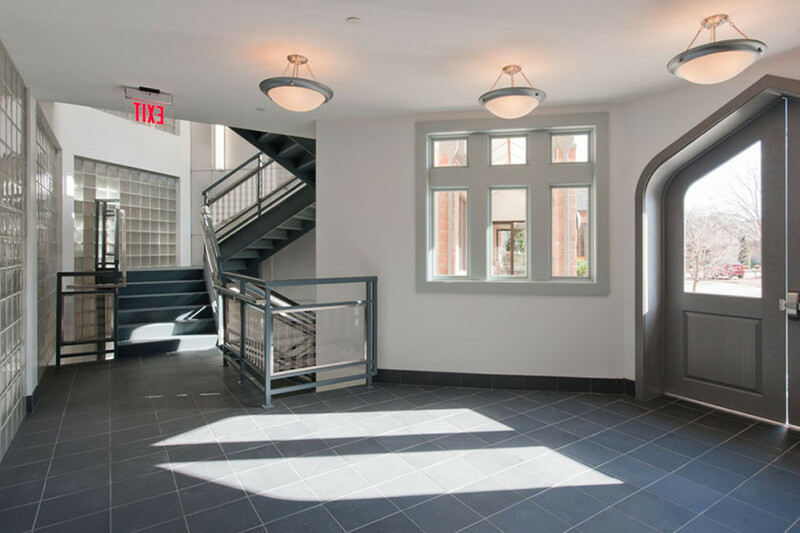 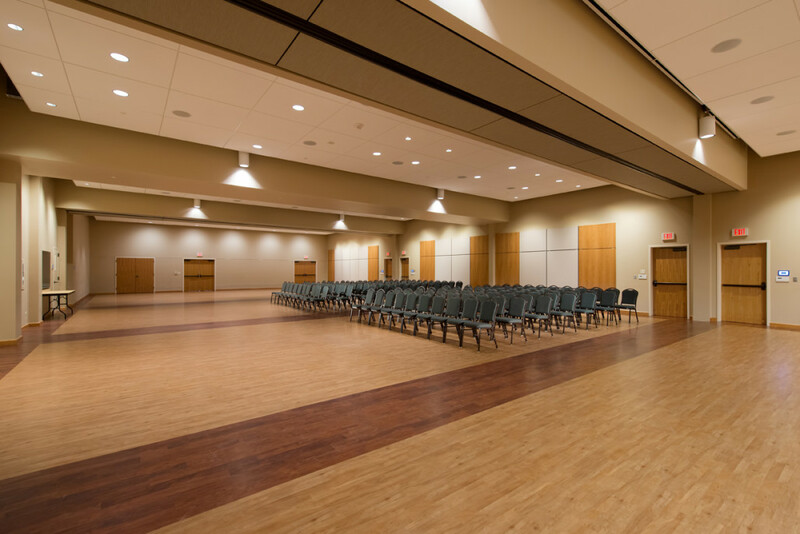 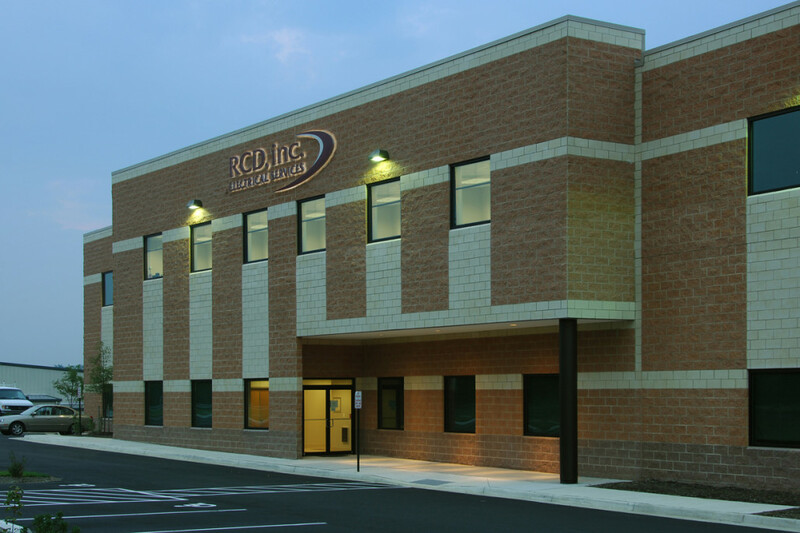 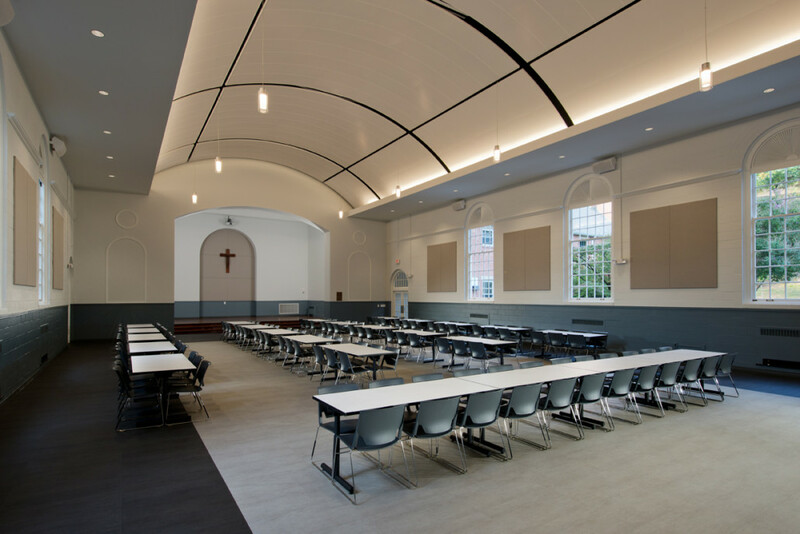 The Good Shepherd Catholic Church renovation and addition was a 33,000 SF multi-phase renovation and addition of an occupied facility in Alexandria, VA. 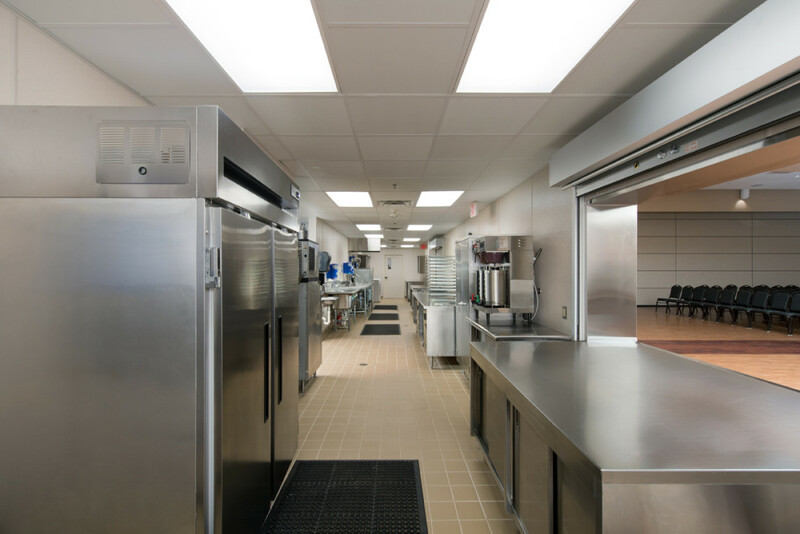 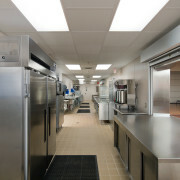 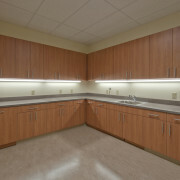 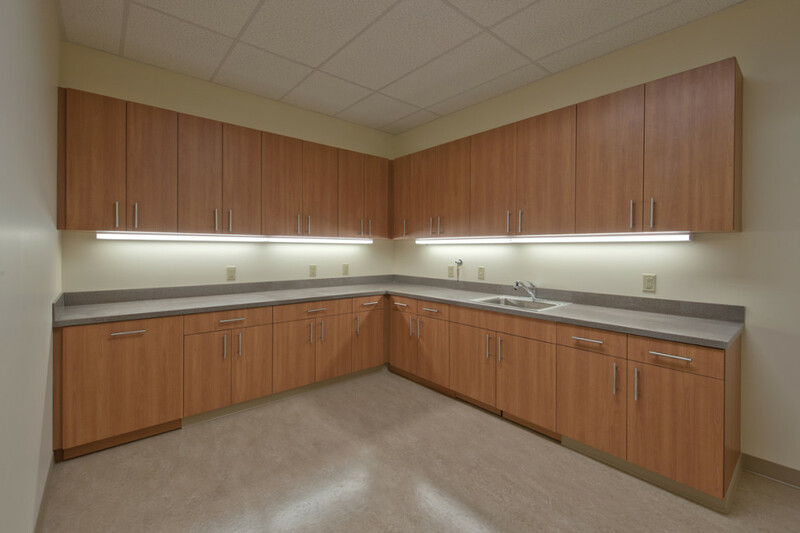 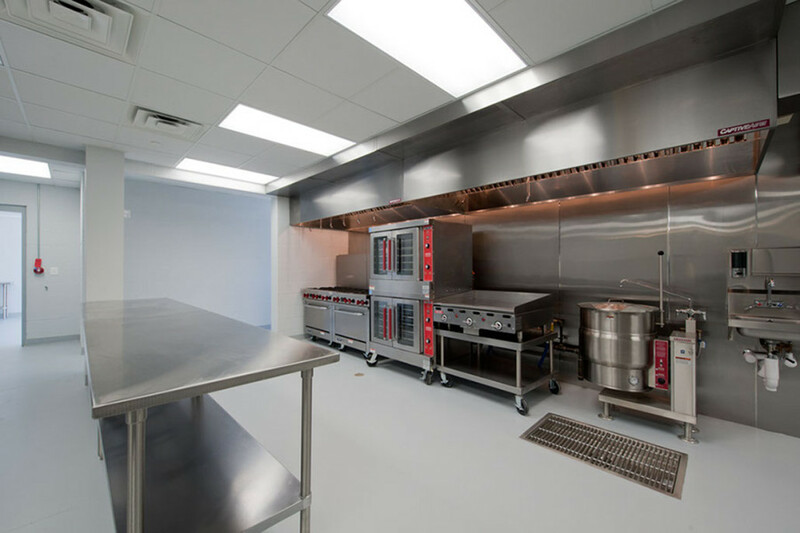 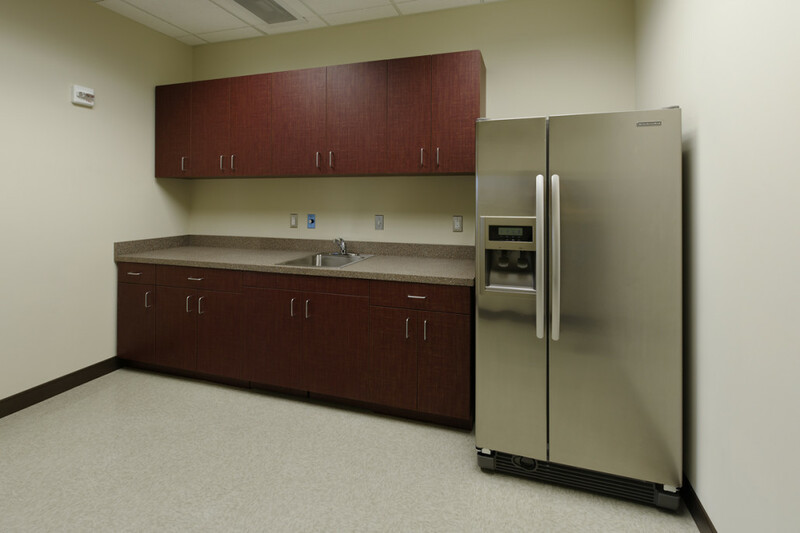 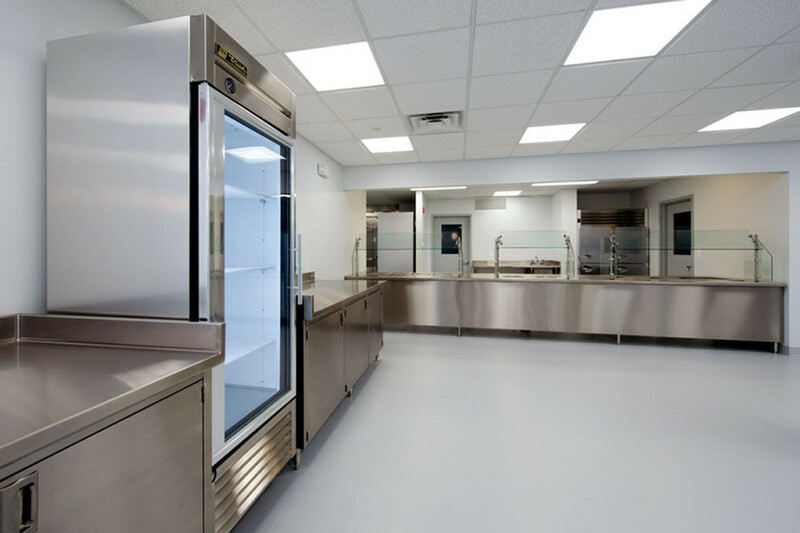 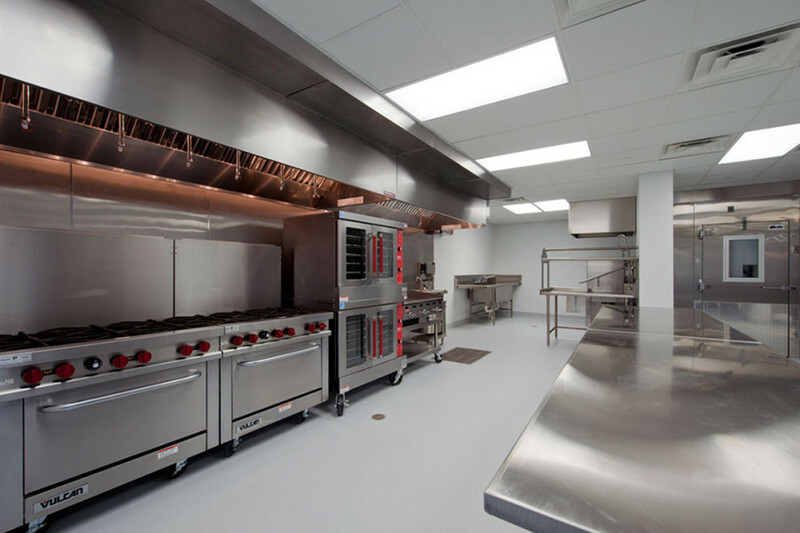 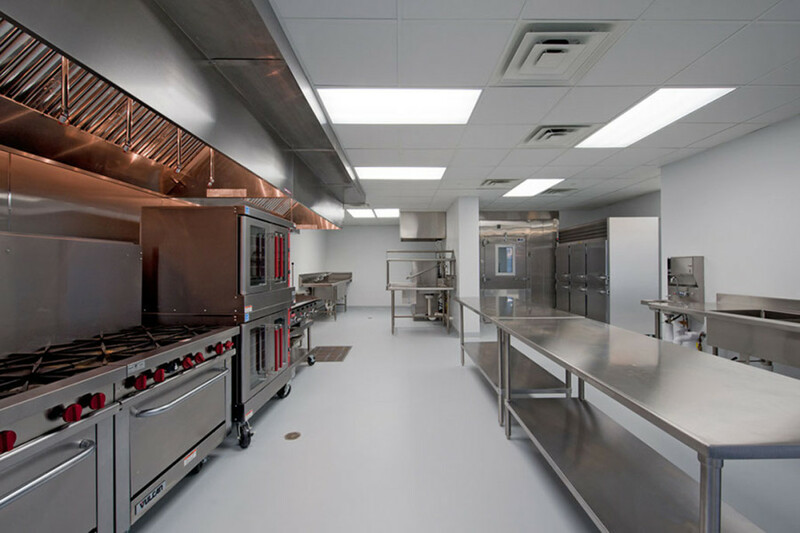 The kitchen was enlarged and upgraded, a new wet sprinkler system was installed throughout, new lights, and a lighting control panel was installed, a new audio/visual system was installed, a new electrical room/sprinkler room was constructed. 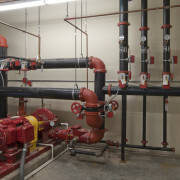 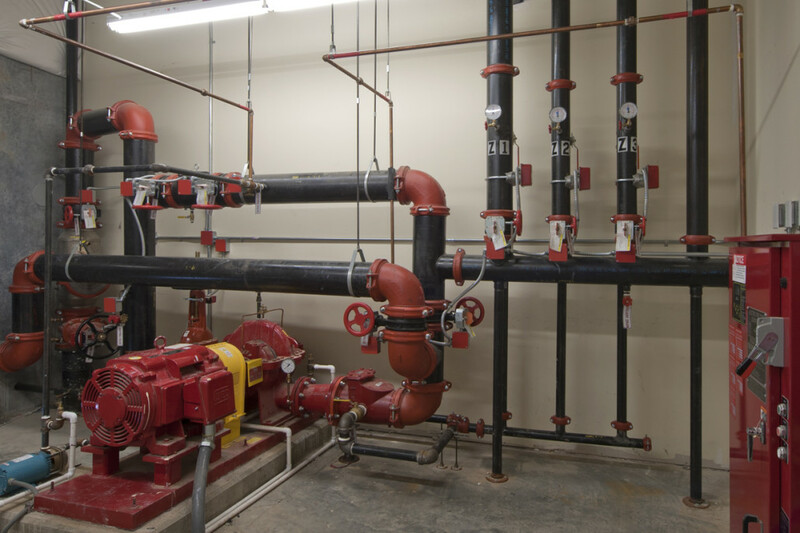 The project included the addition of a new fire main to feed the sprinkler system. 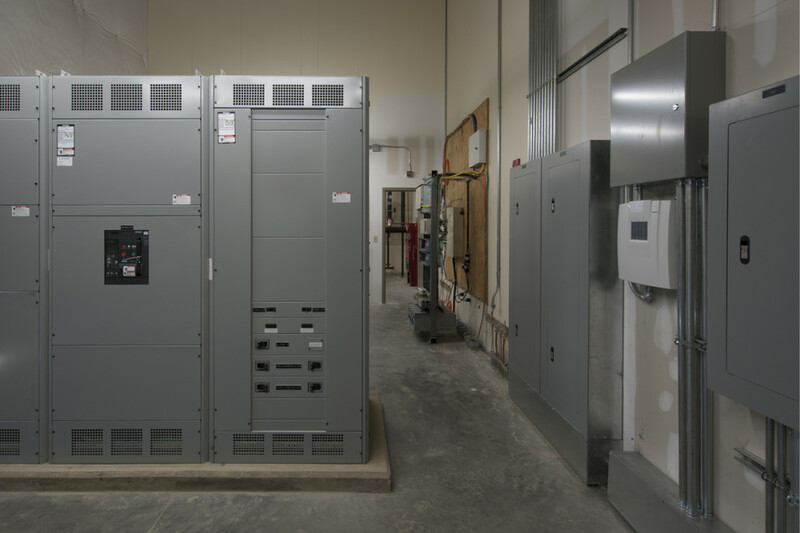 New switchgear was installed to allow us to re-feed the existing electrical from multiple electrical rooms, and to provide capacity for future expansion. 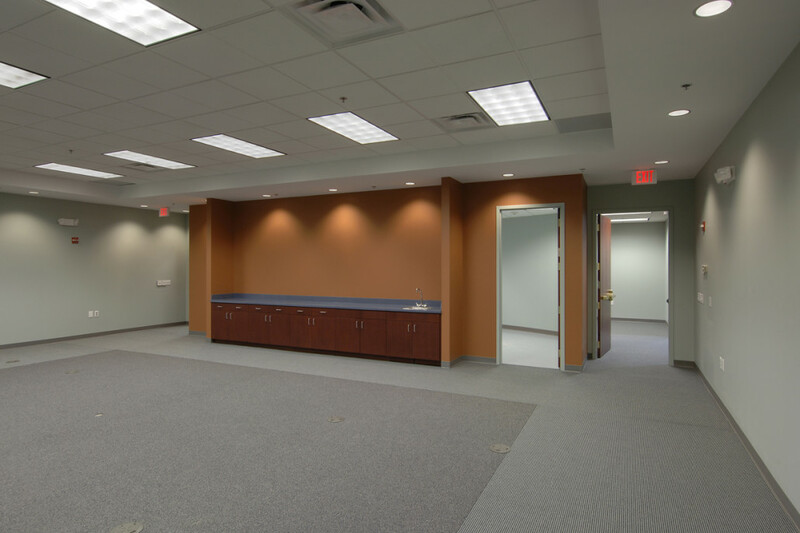 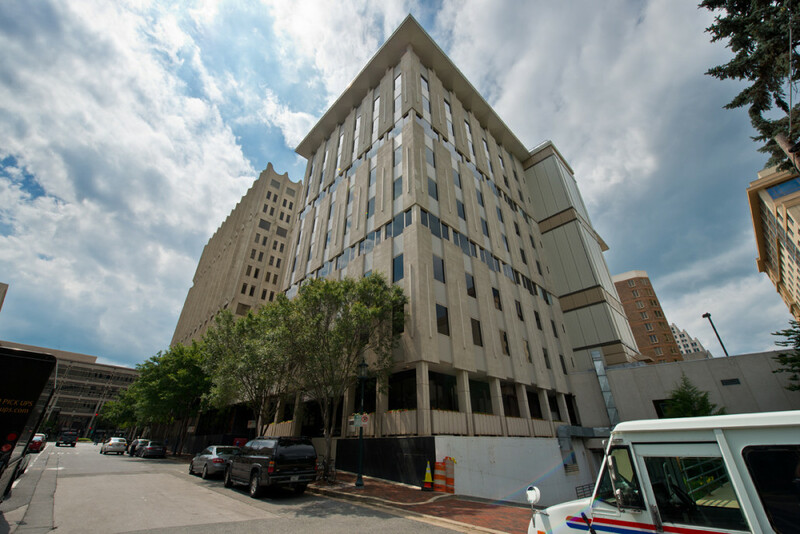 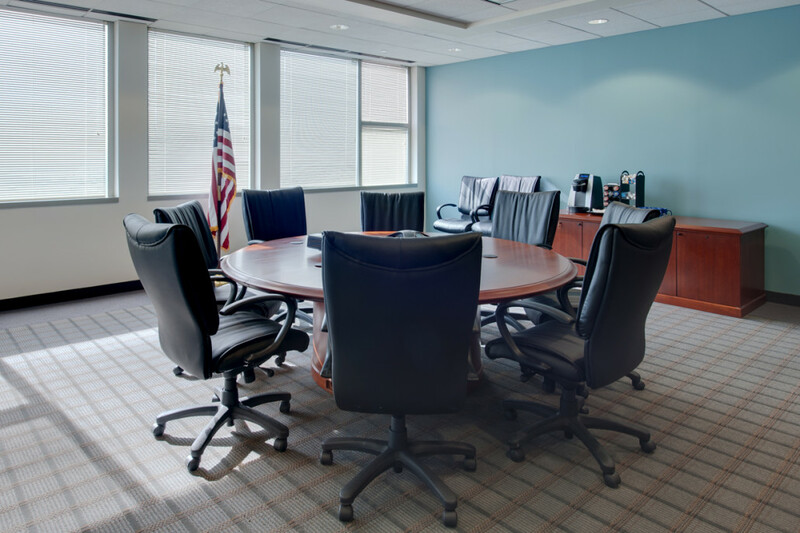 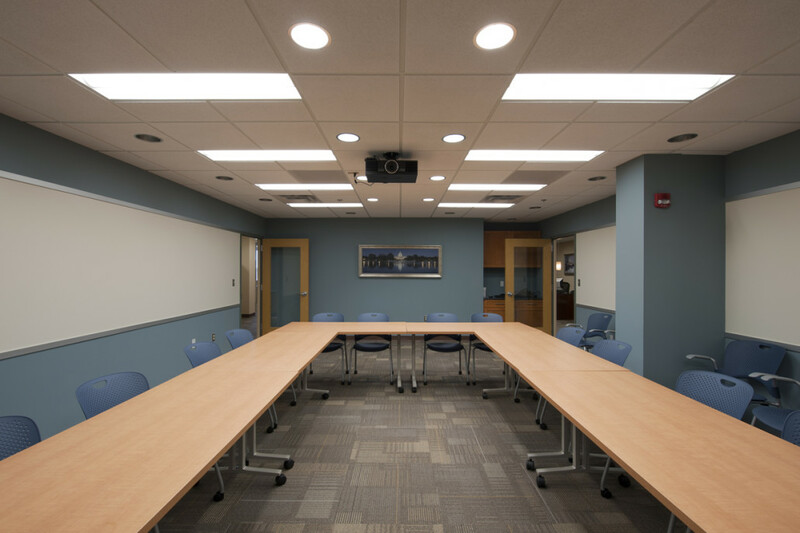 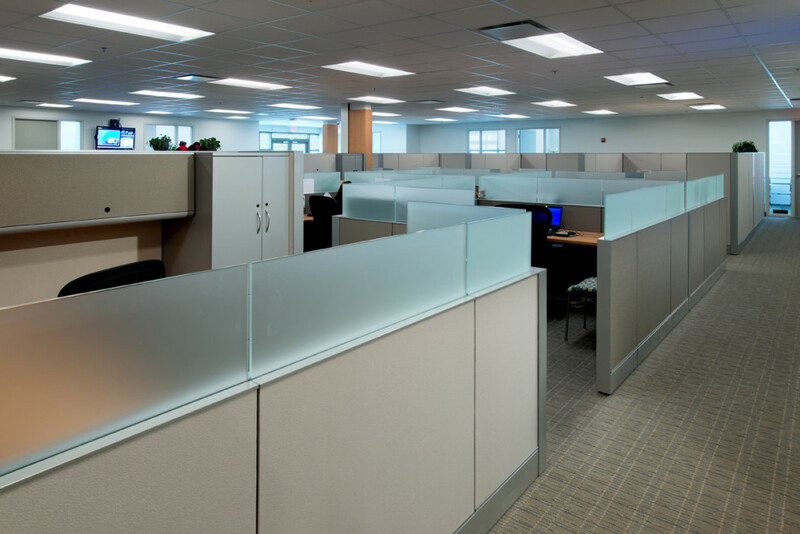 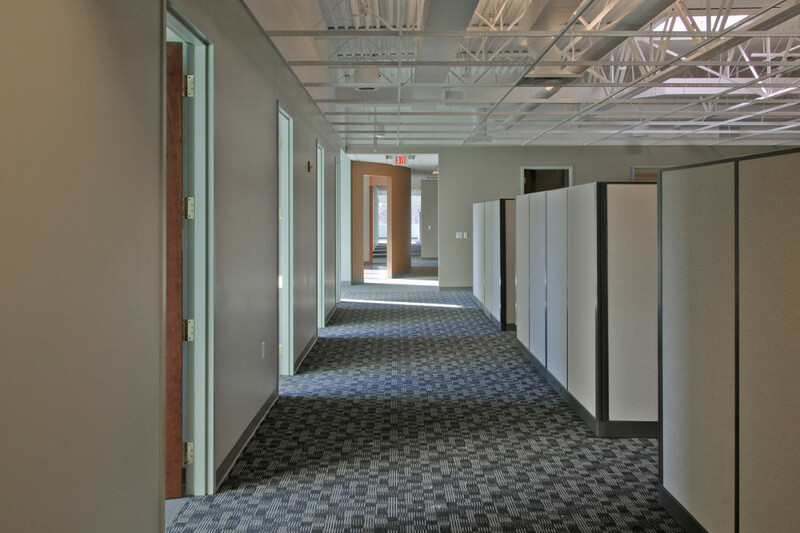 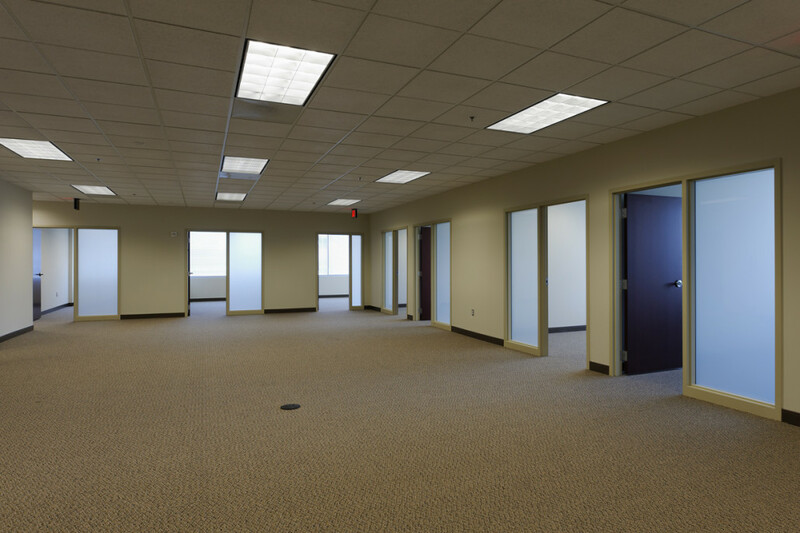 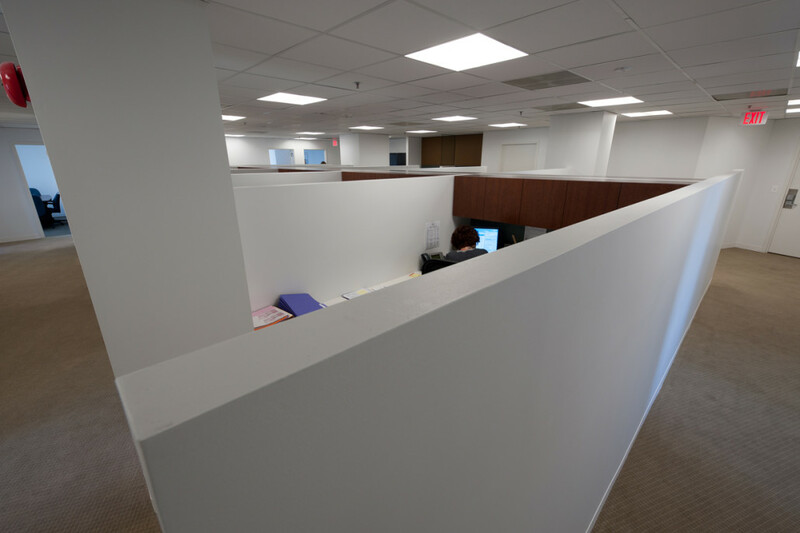 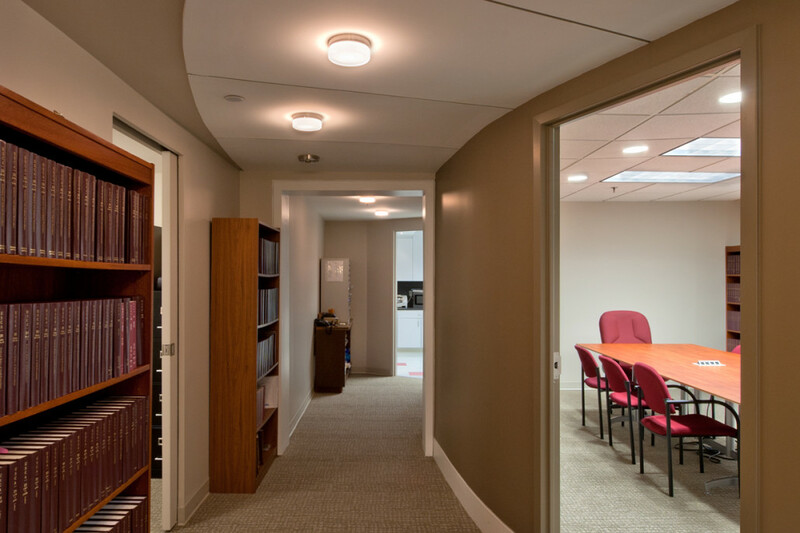 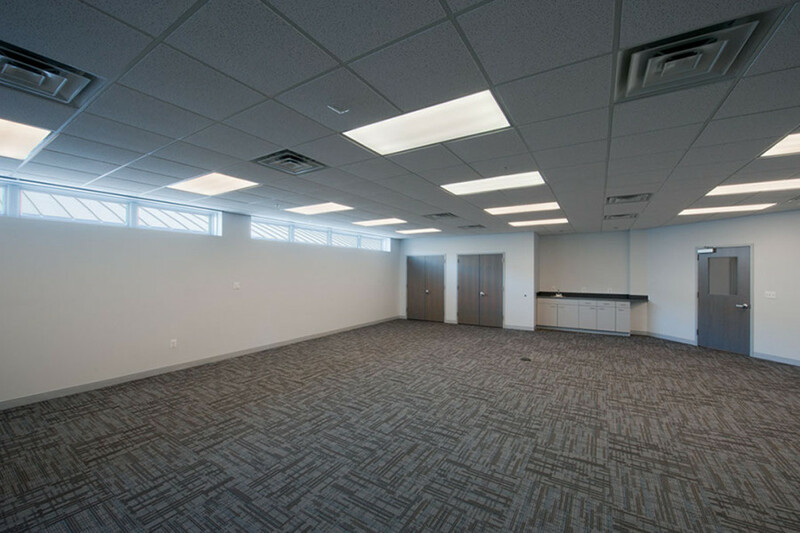 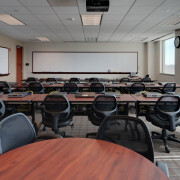 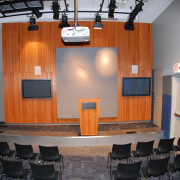 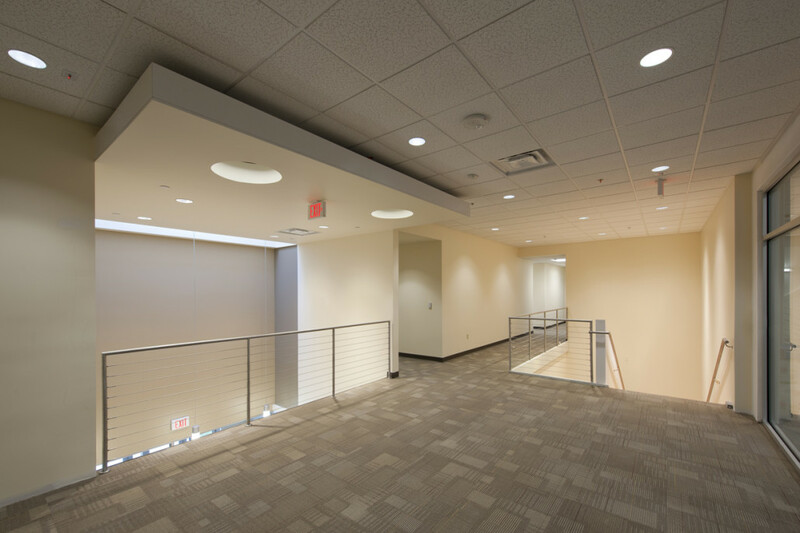 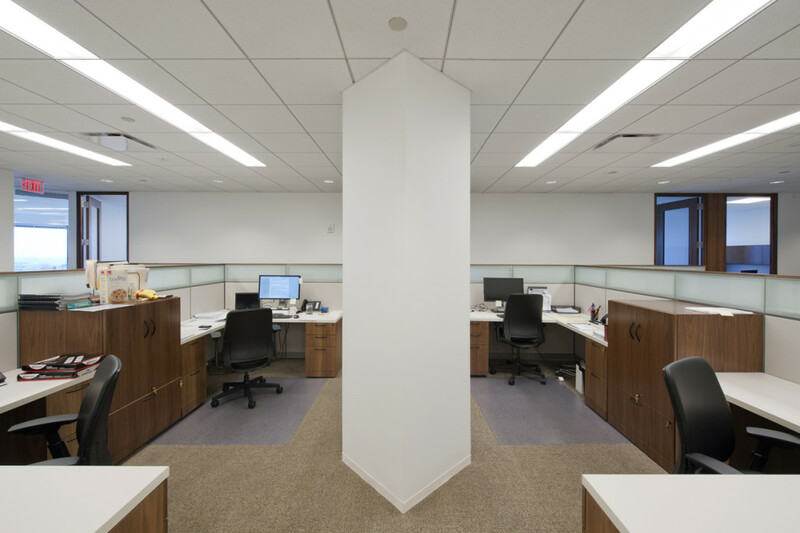 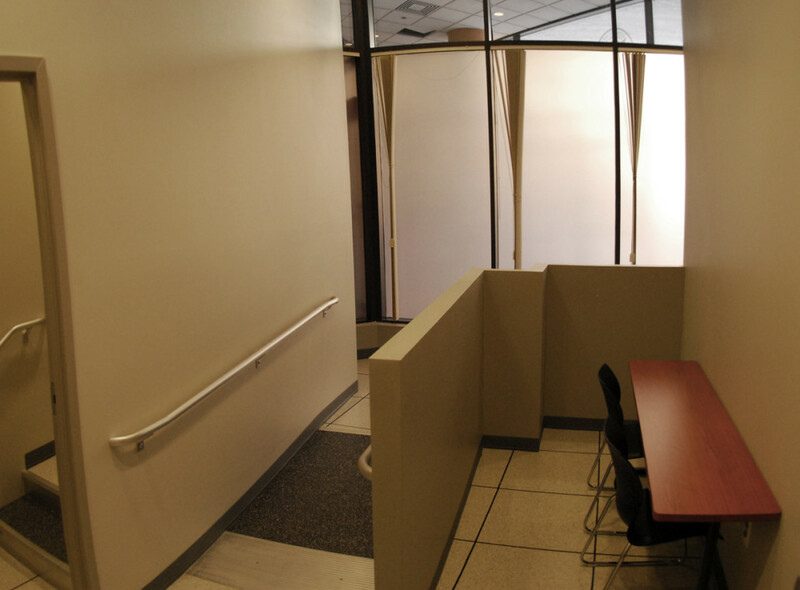 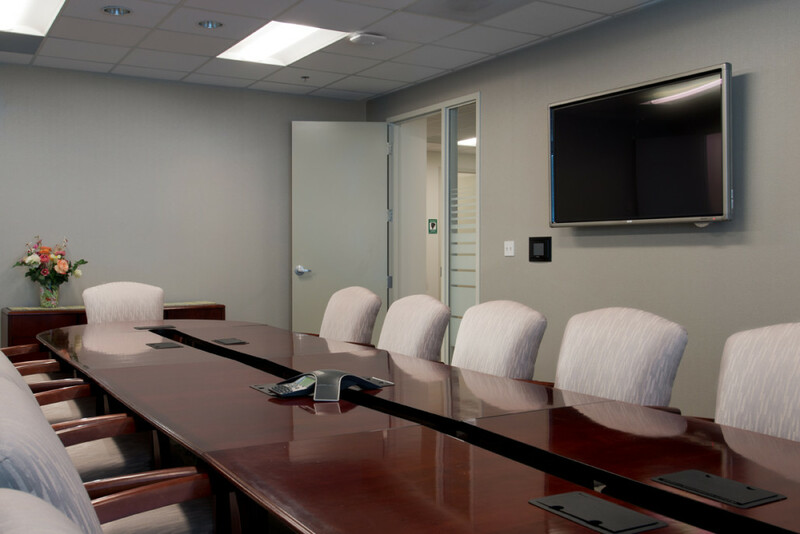 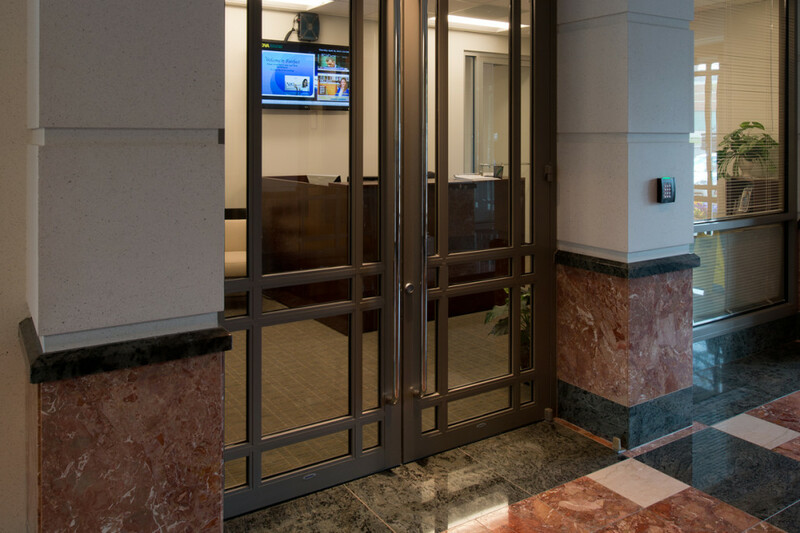 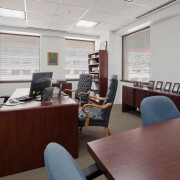 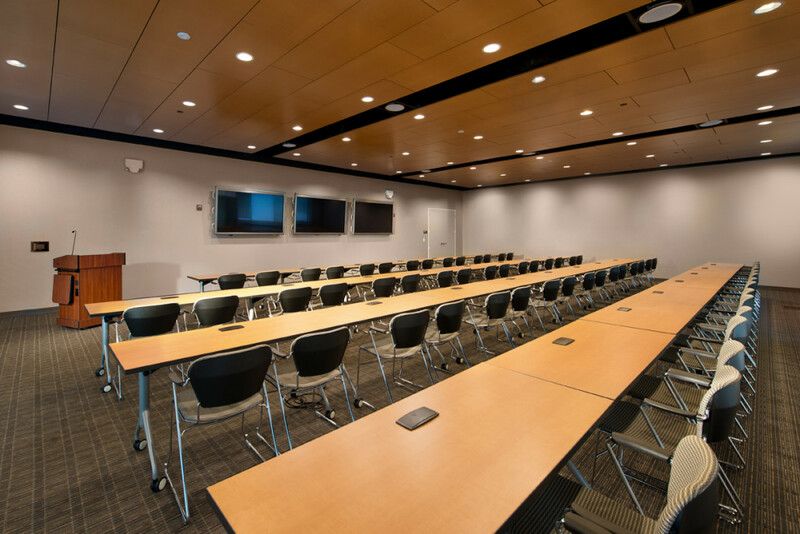 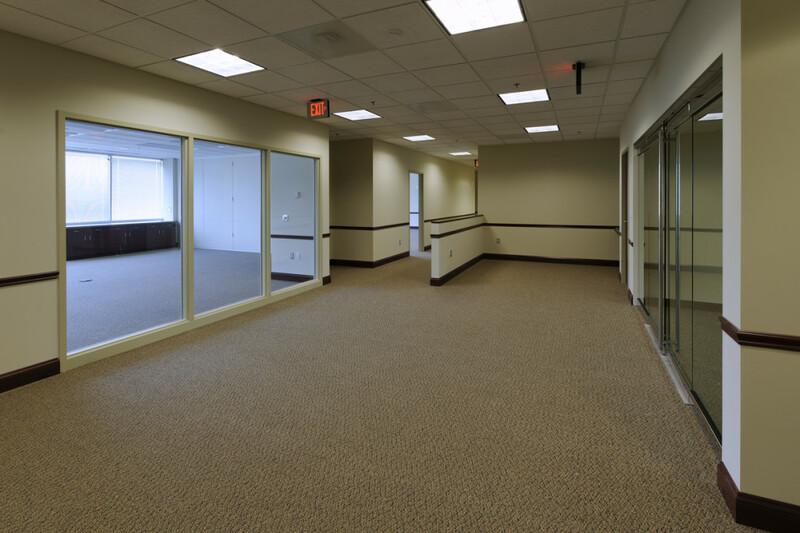 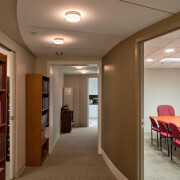 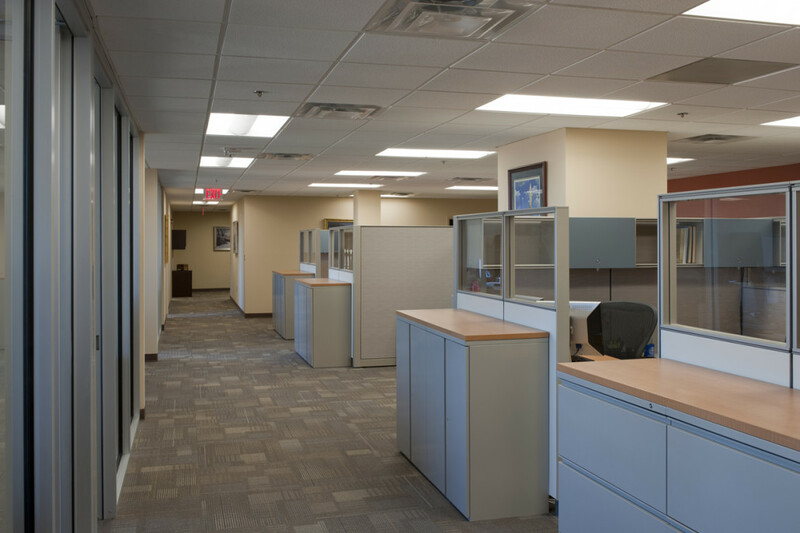 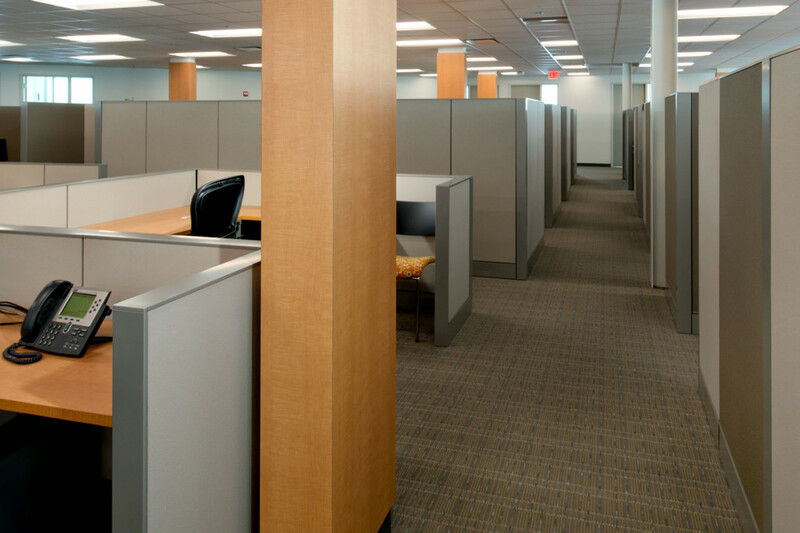 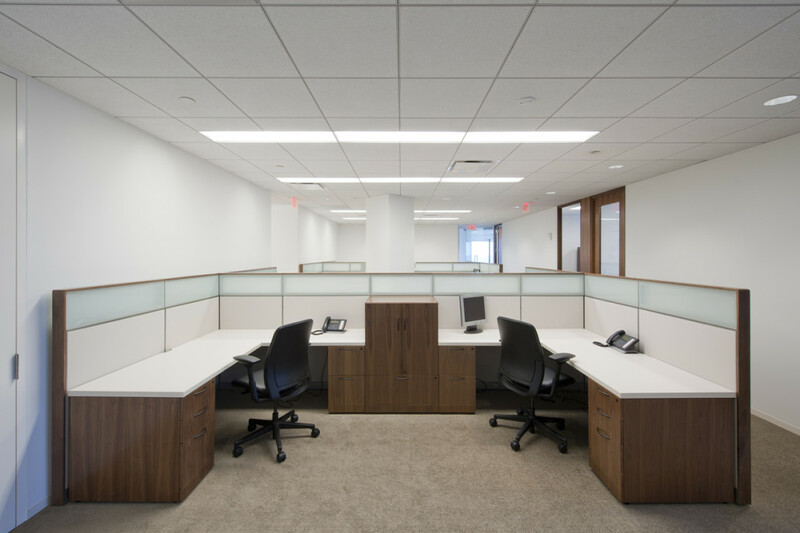 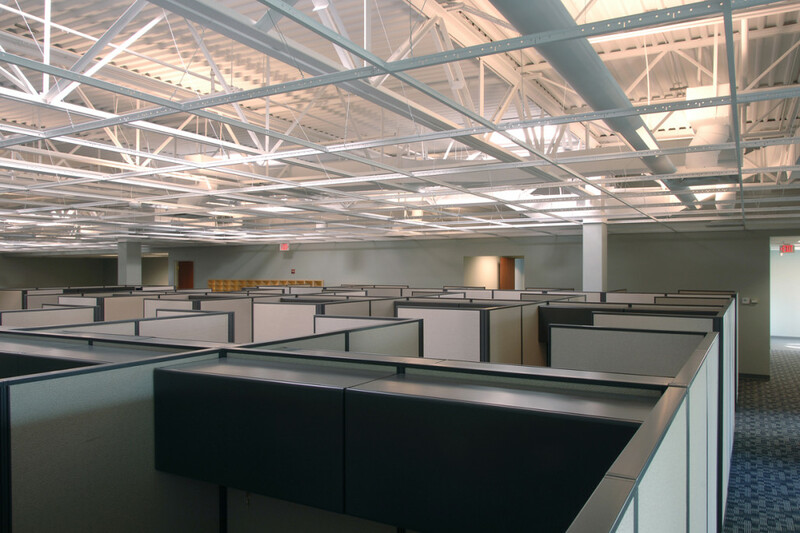 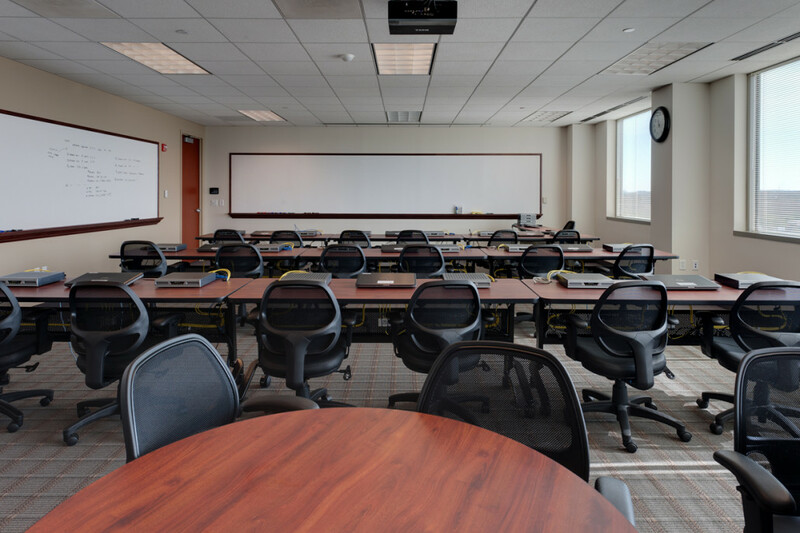 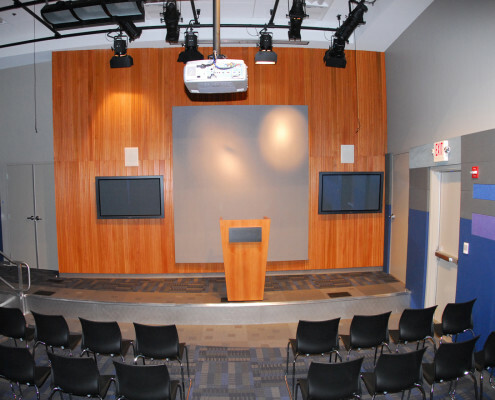 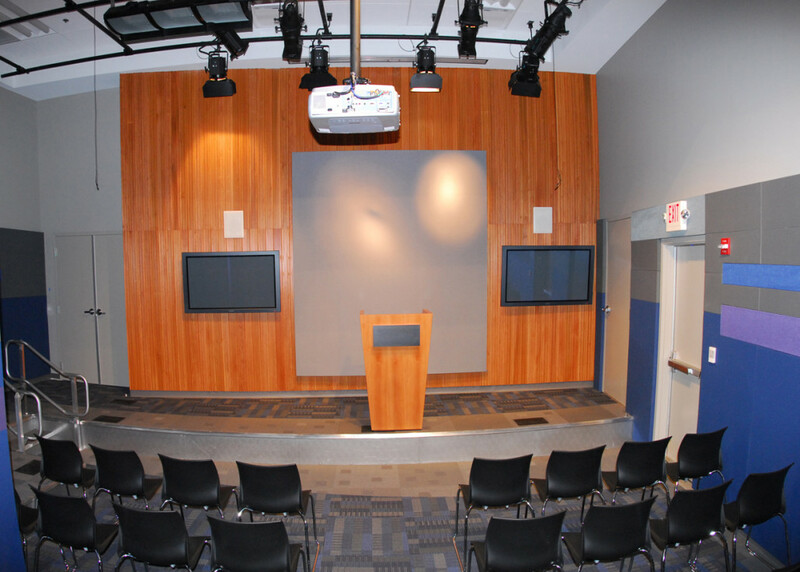 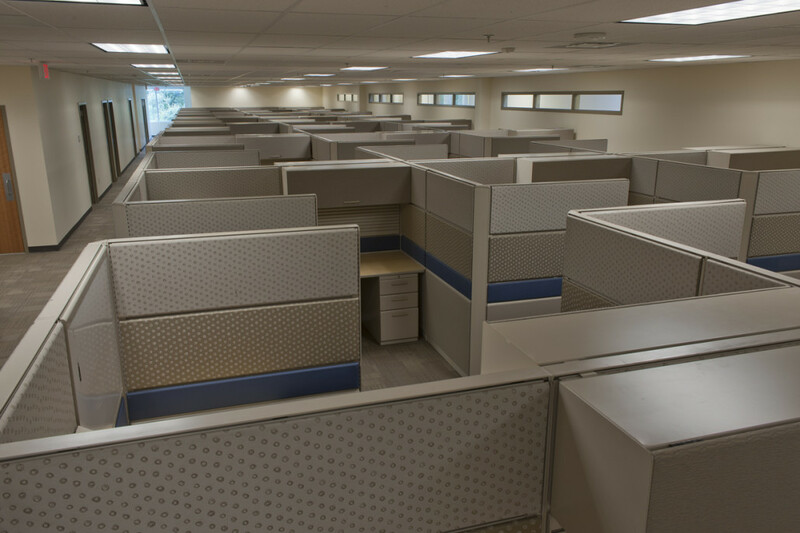 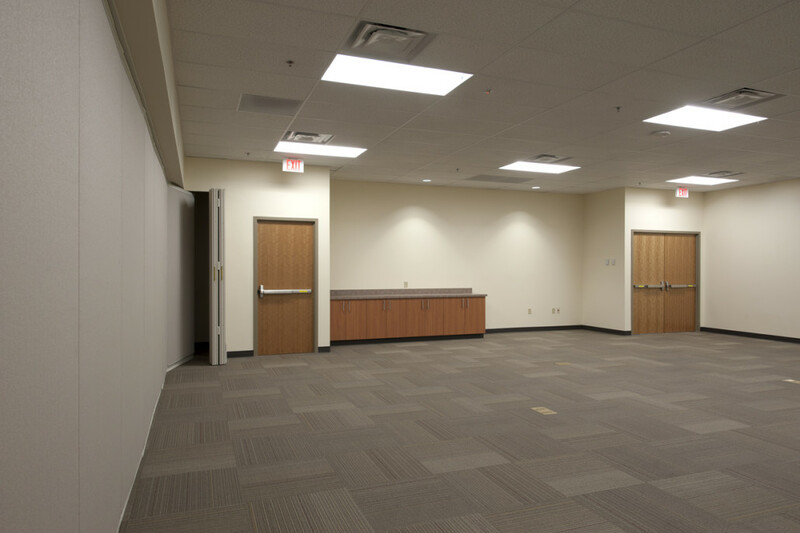 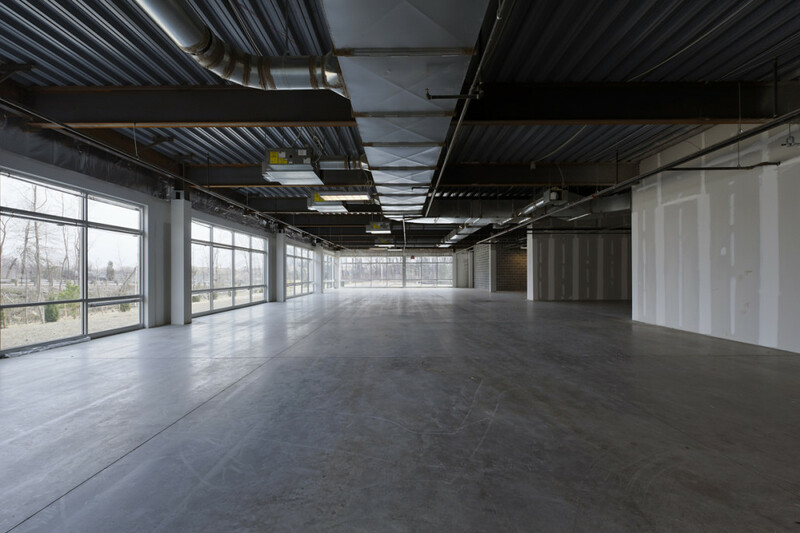 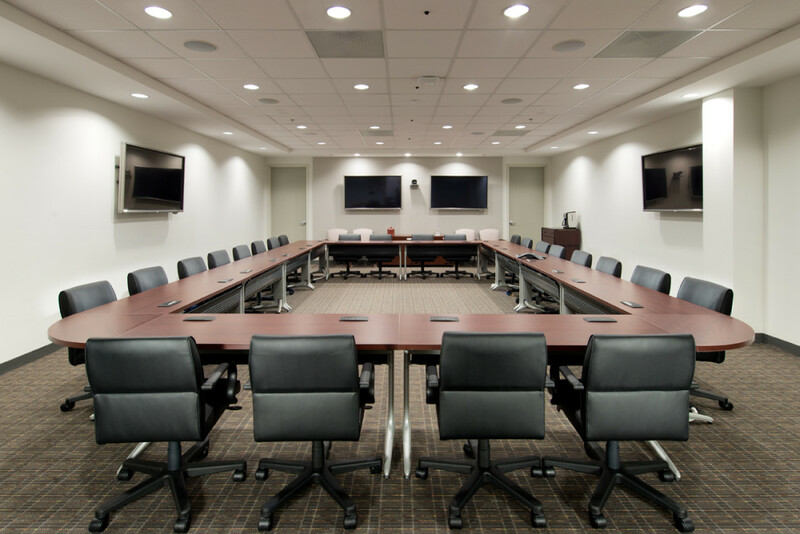 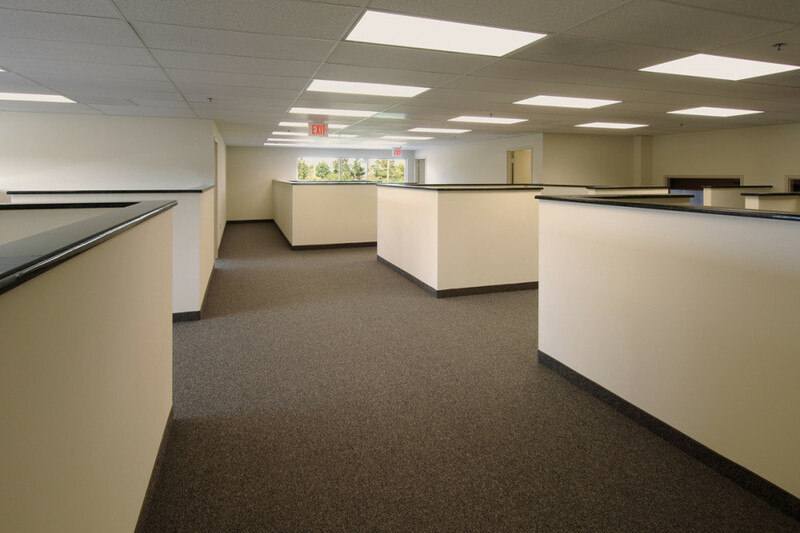 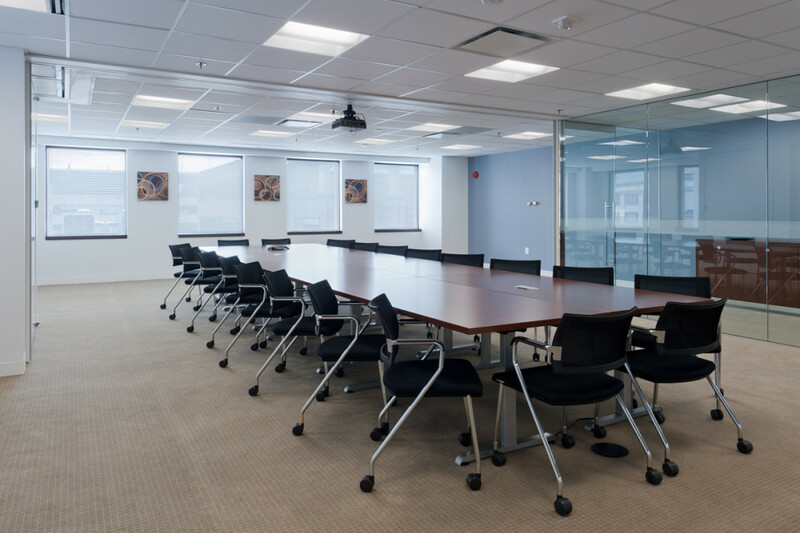 This Fema Press Room tenant interior project in Washington, D.C. included the installation of sound proofing systems, independent mechanical systems, and emergency power to provide a press room for FEMA in the event of national emergencies. 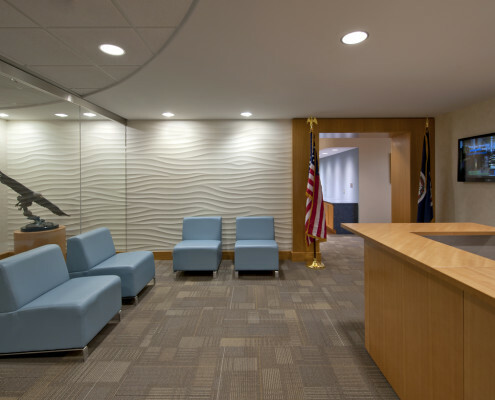 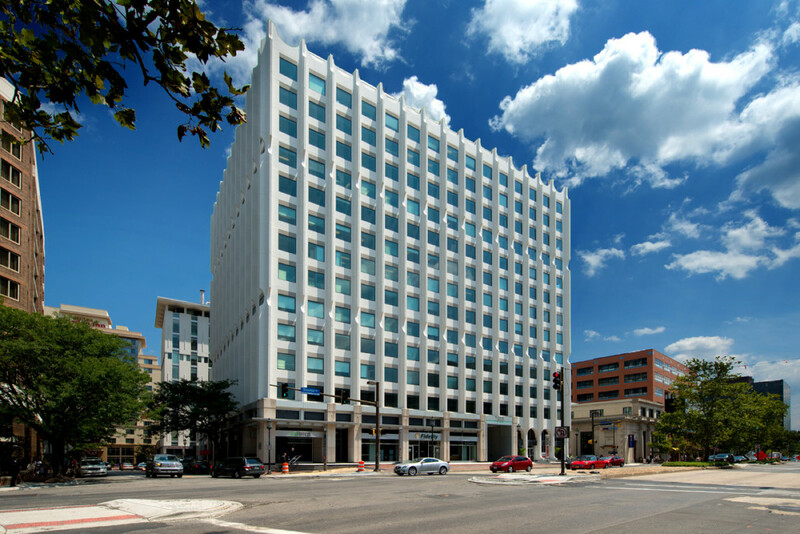 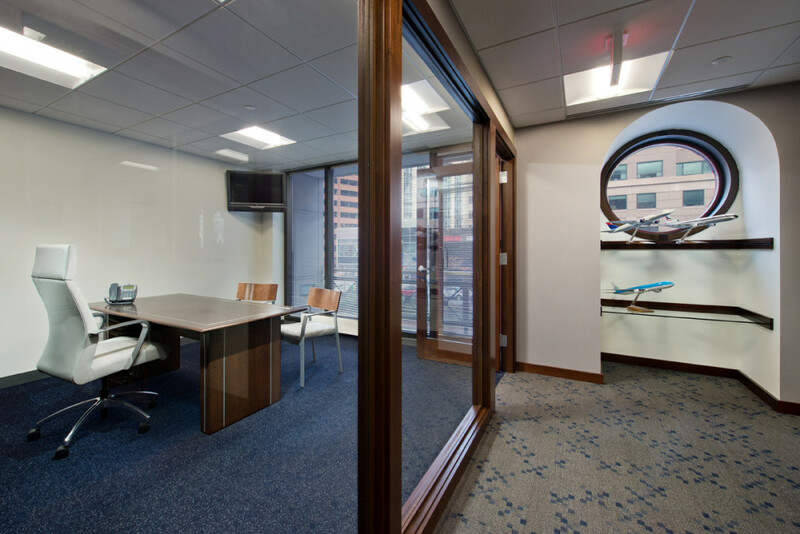 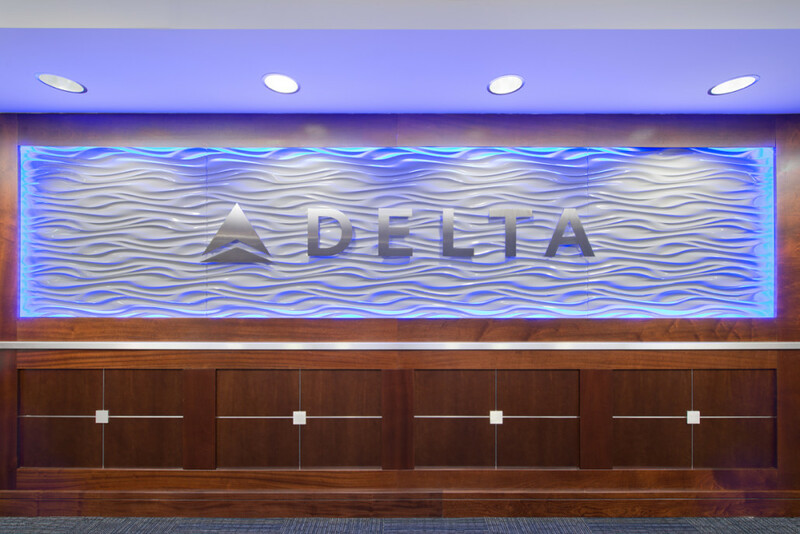 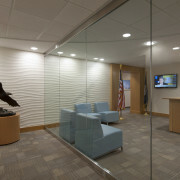 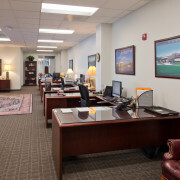 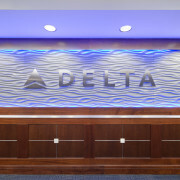 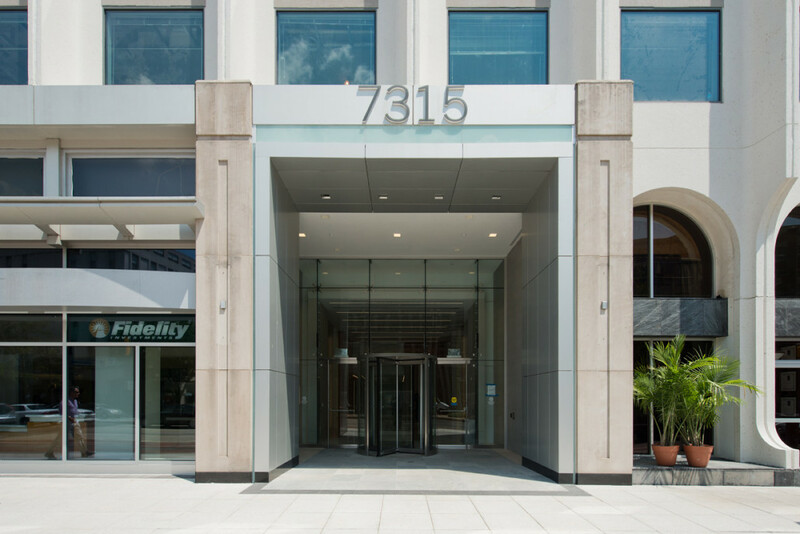 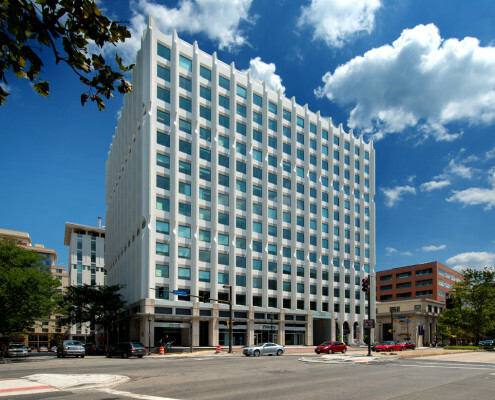 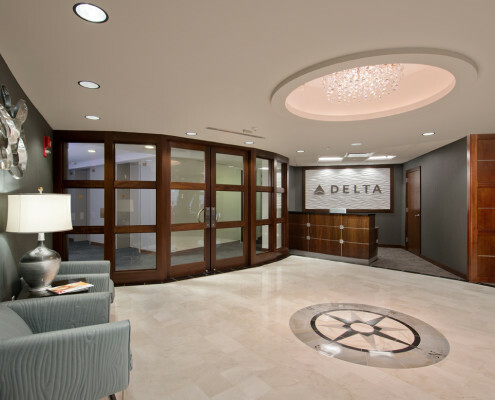 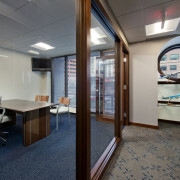 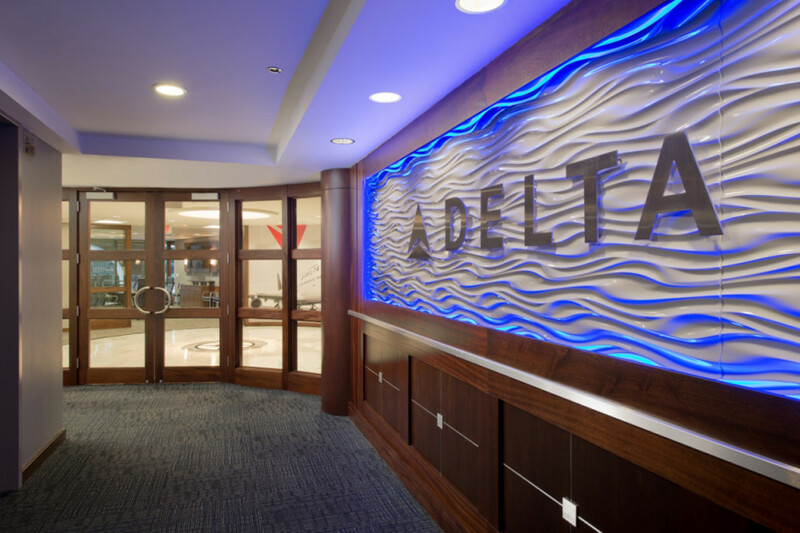 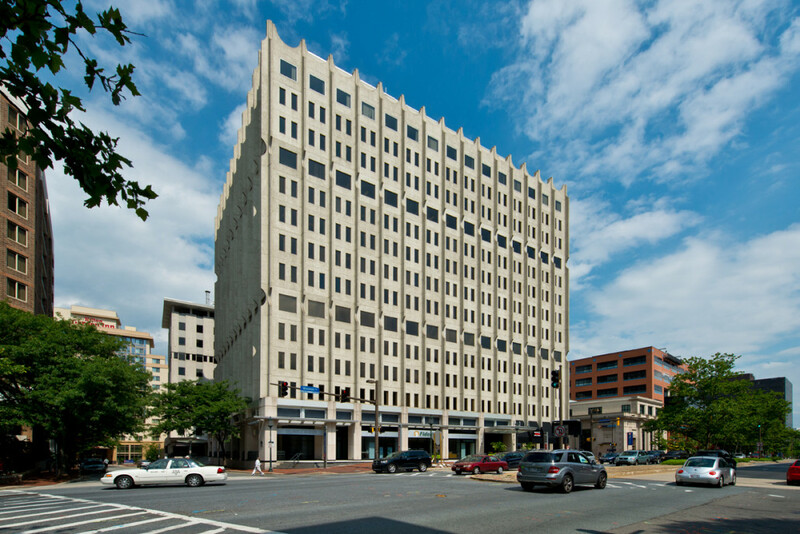 The New Delta Airlines Government affairs Office is a 4,600 sf space located on New York Avenue, Washington, DC. 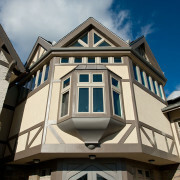 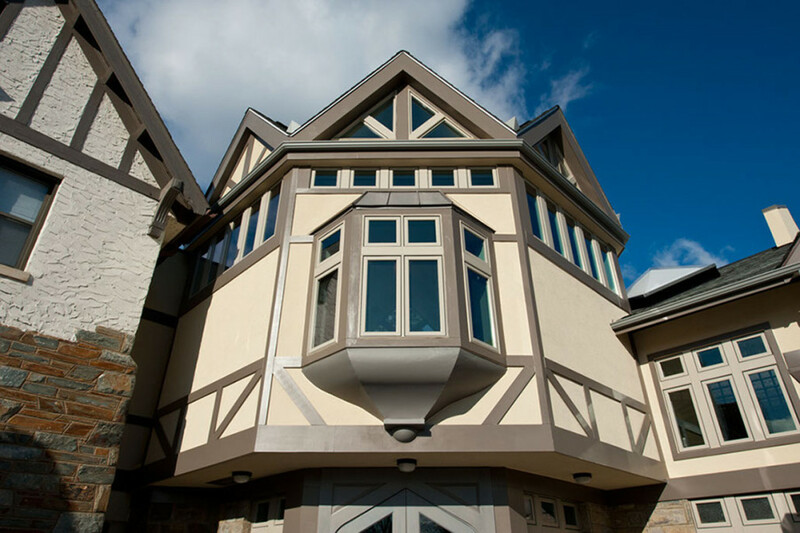 This space includes all custom fabricated mahogany casements and trim with interlam accent panels. 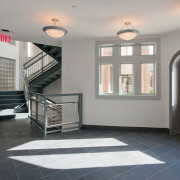 A Crystal Chandelier and marble tiled compass is located in the middle of the reception area. 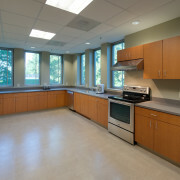 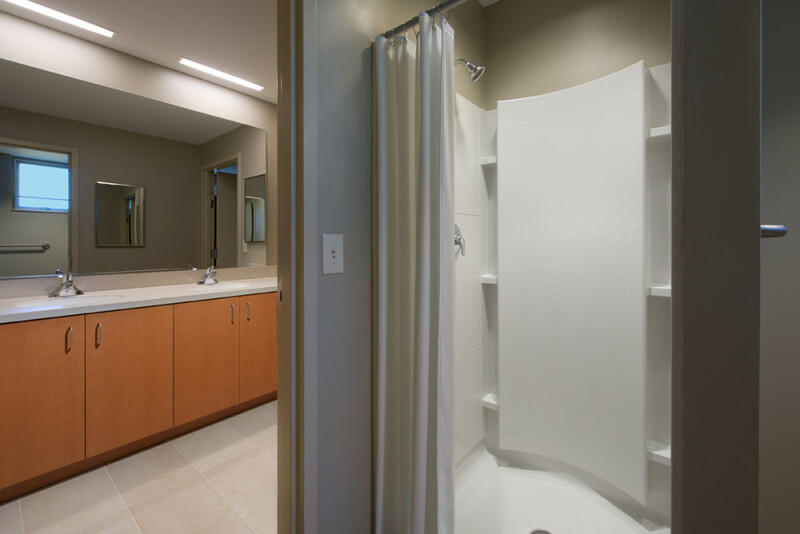 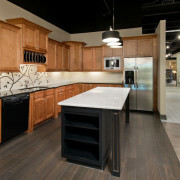 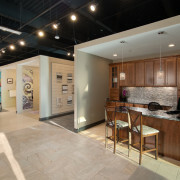 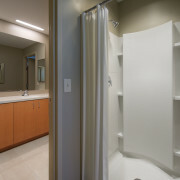 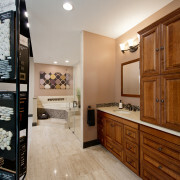 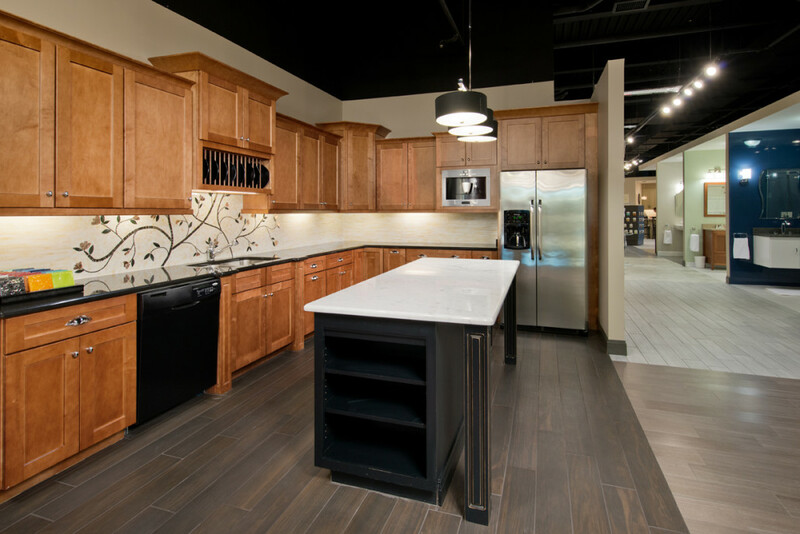 The pantry features stone floor tile, solid surface countertops and stainless steel appliances. 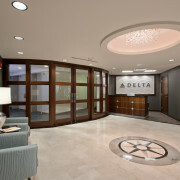 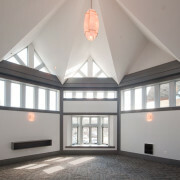 The main lobby was renovated to mimic the finishes inside the Delta Suite. 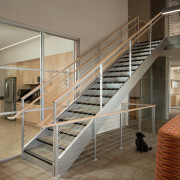 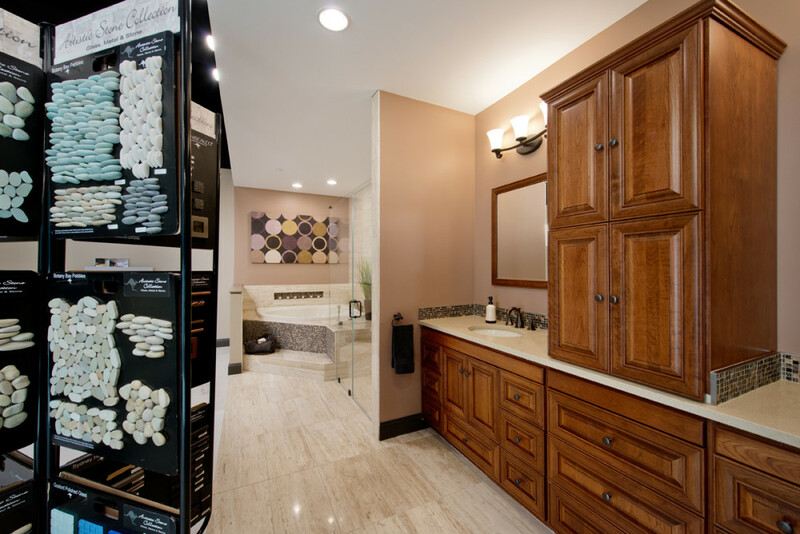 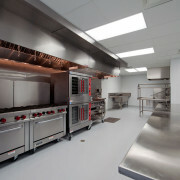 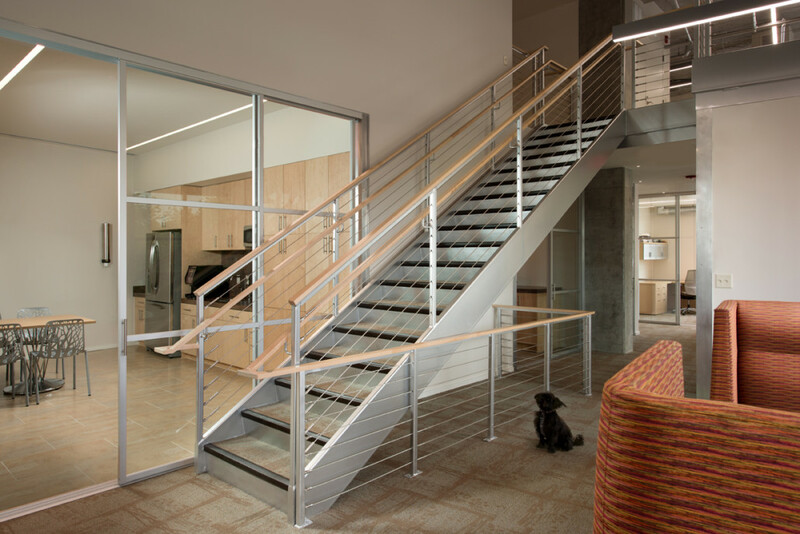 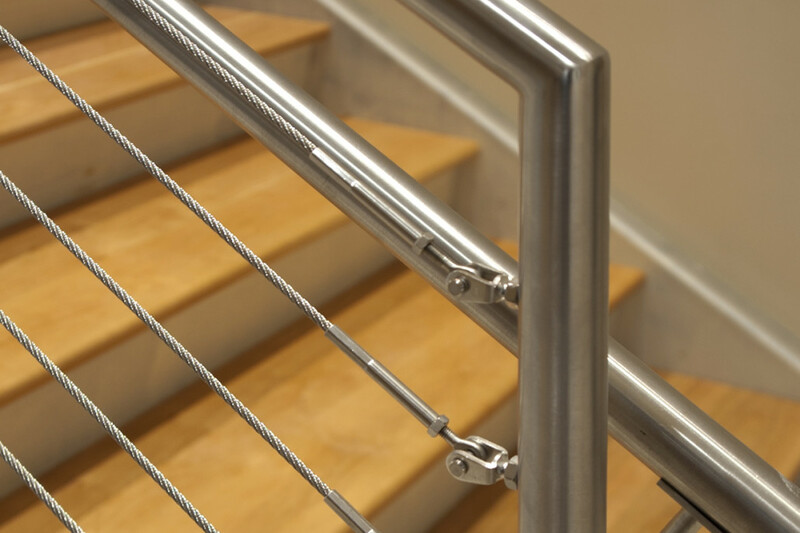 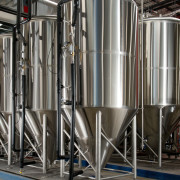 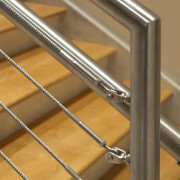 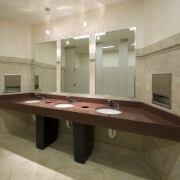 The use of mahogany and stainless steel accents convey a “First Class” message. 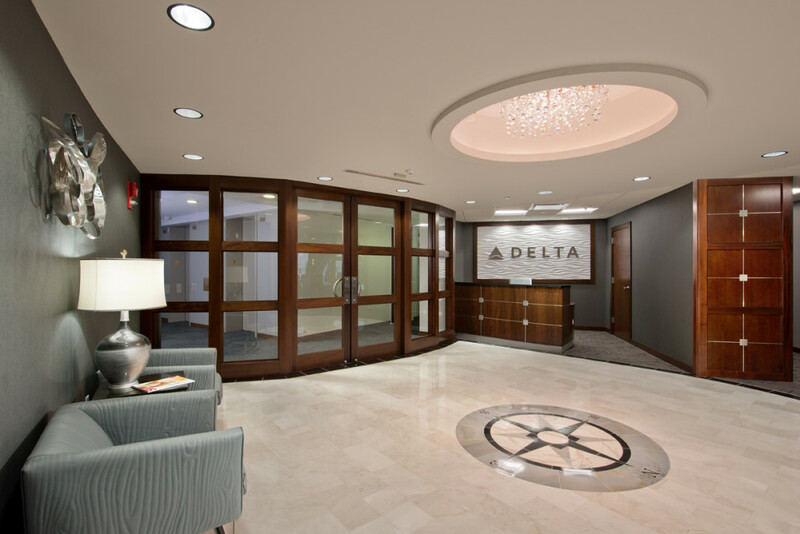 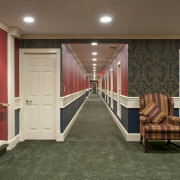 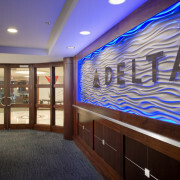 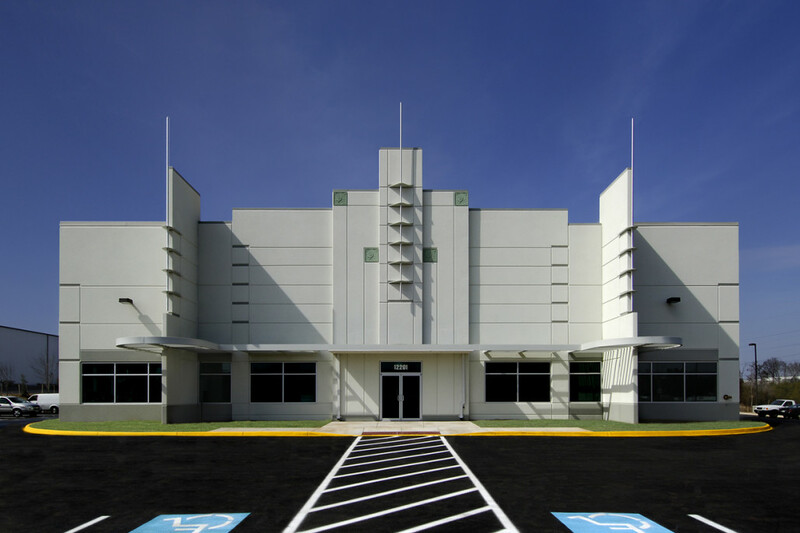 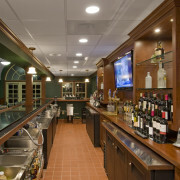 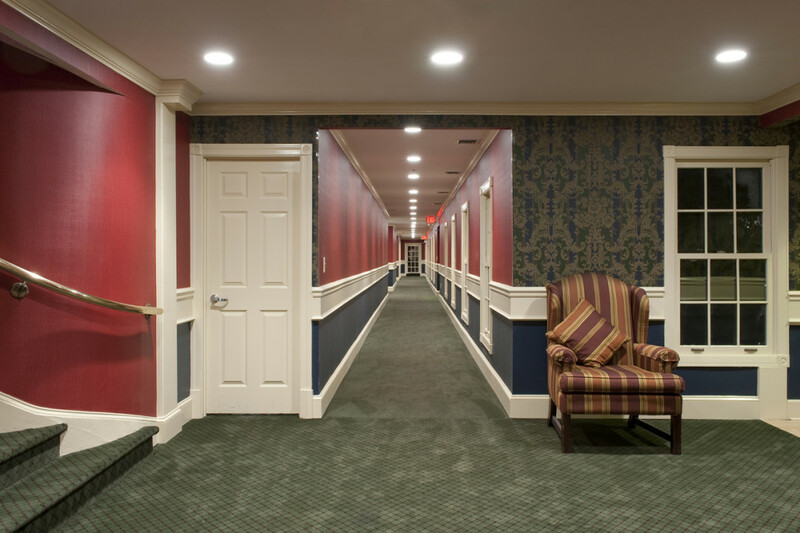 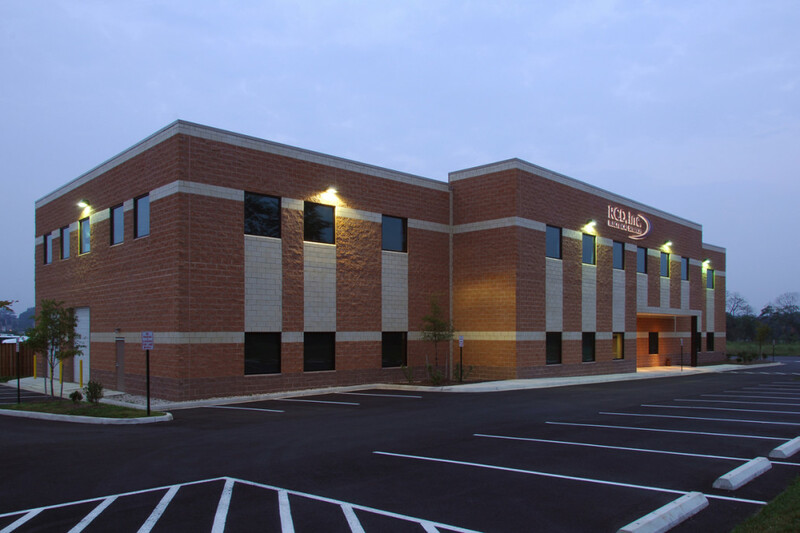 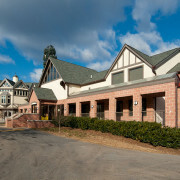 Owner: Delta Air Lines, Inc.
Crescent Hotels is a 9,300 SF tenant fit out in Fairfax City. 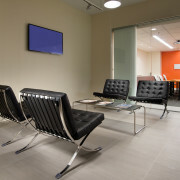 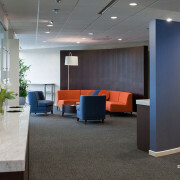 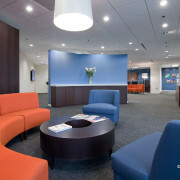 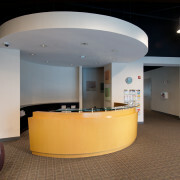 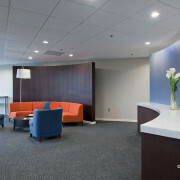 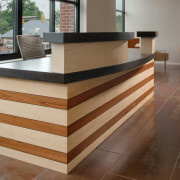 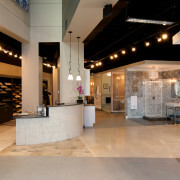 The space has a formal and bold reception area intended to emulate their hotel management services. 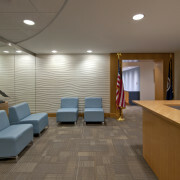 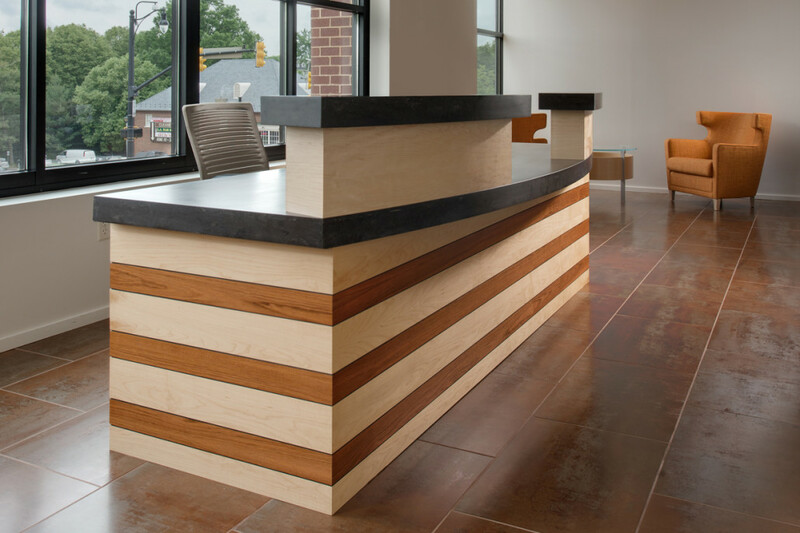 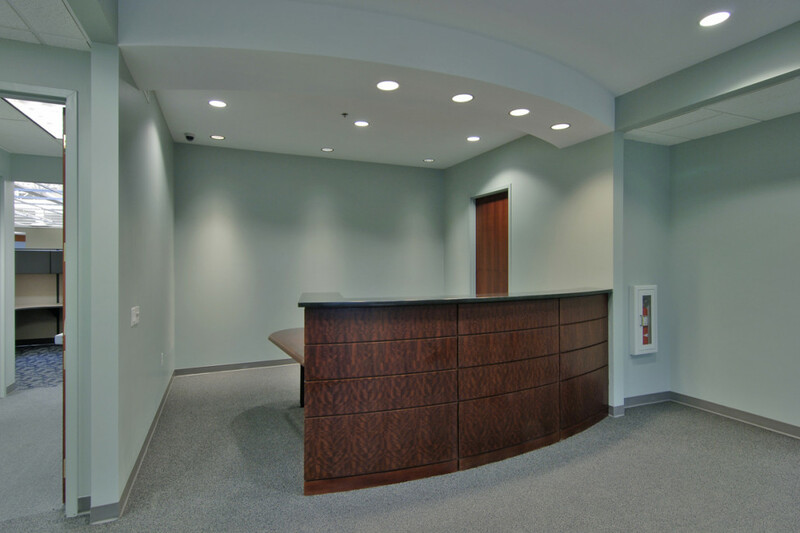 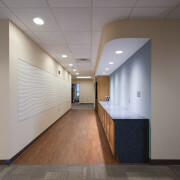 The radius partitions behind the reception desk stop short of the ceiling, and feature patterned and textured purple wall covering and Wenge wood veneer wall covering. 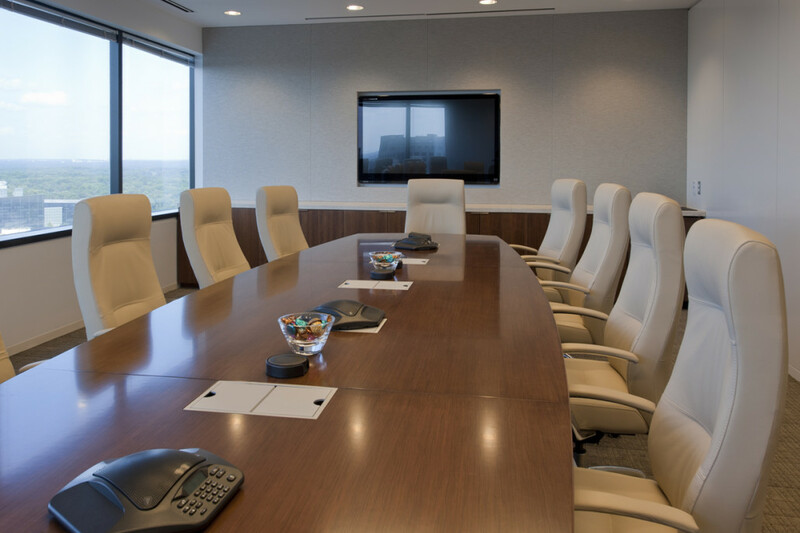 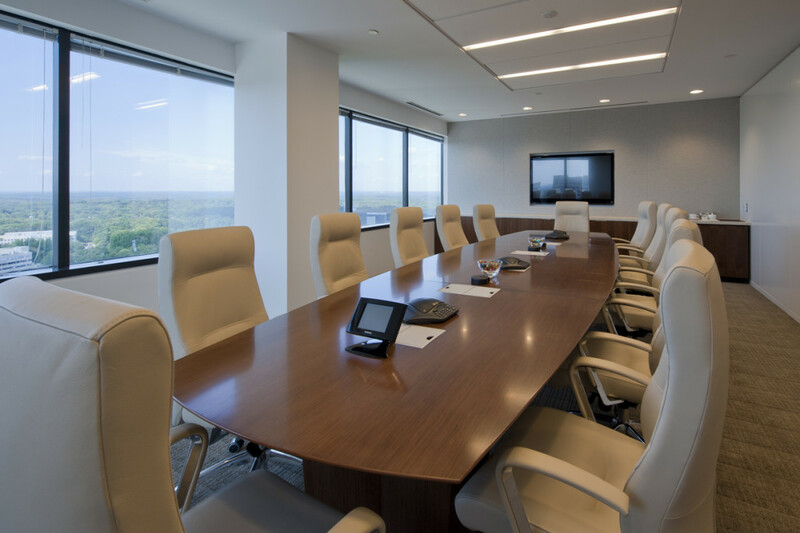 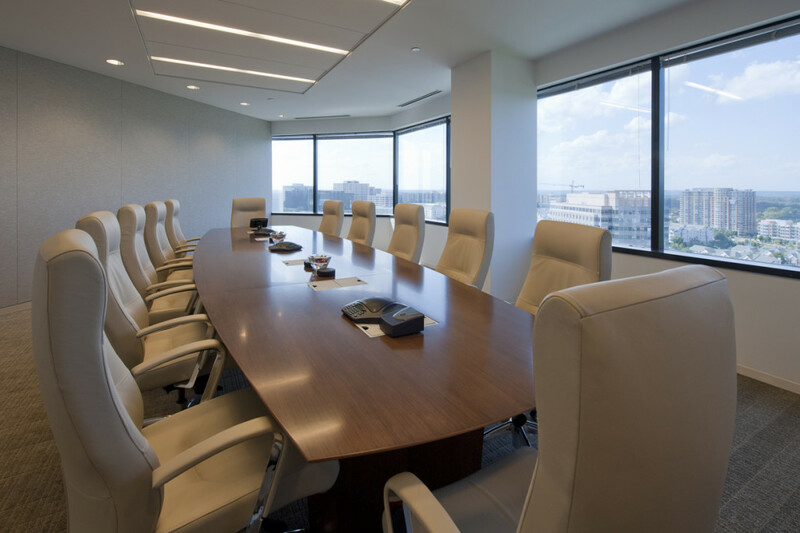 Another key feature is main conference room which shares with the reception area back to back Wenge wood credenzas bisected by a full height glass partition, and flanked with professional photographs displayed by a Décor Cable system. 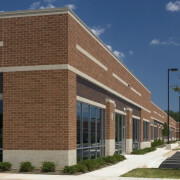 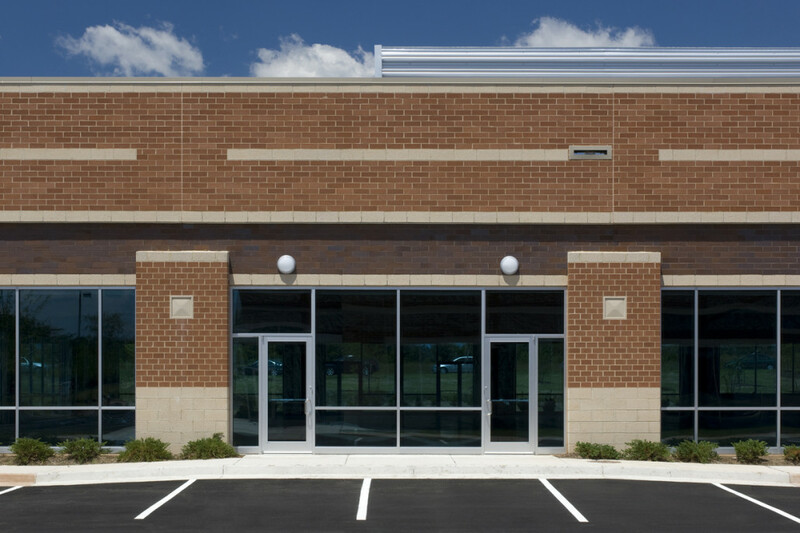 These three single story masonry flex industrial buildings were constructed on a Corporate Campus 12 acre site. 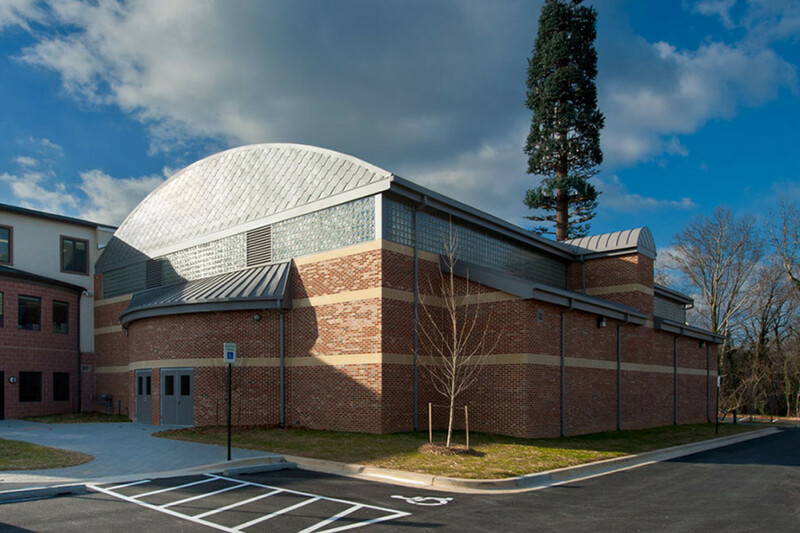 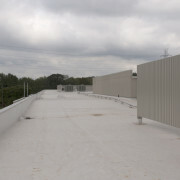 The rear loaded, 24’ clear masonry buildings included finned aluminum sunscreens and extensive roof screening. 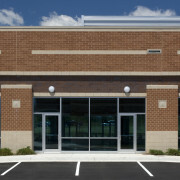 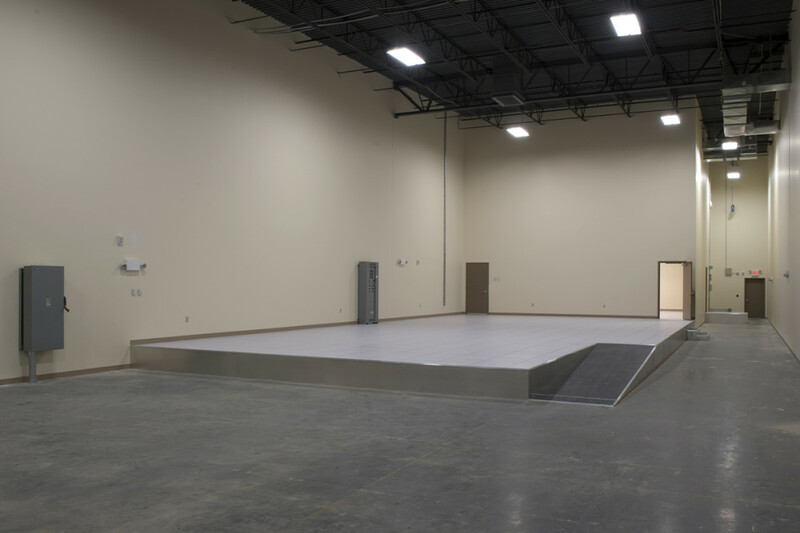 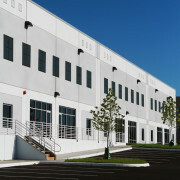 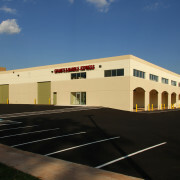 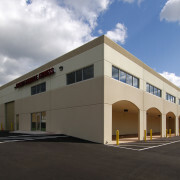 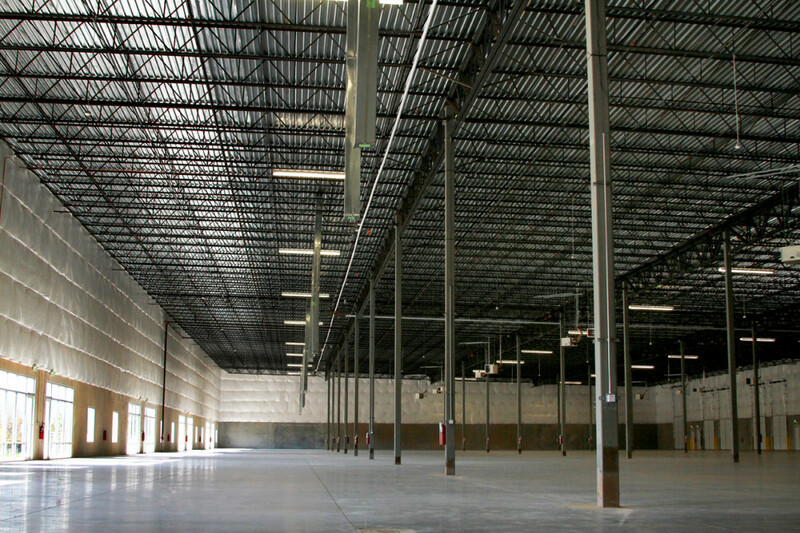 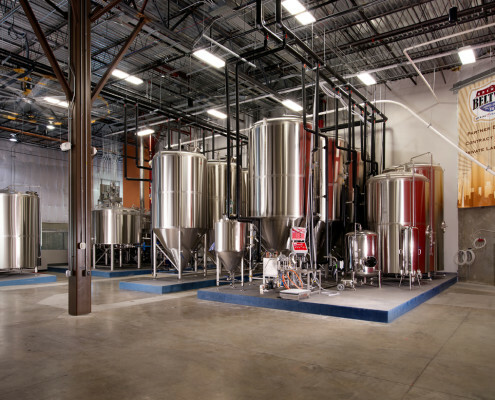 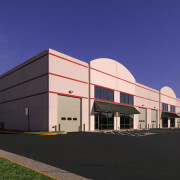 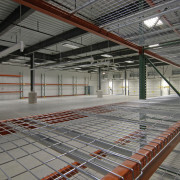 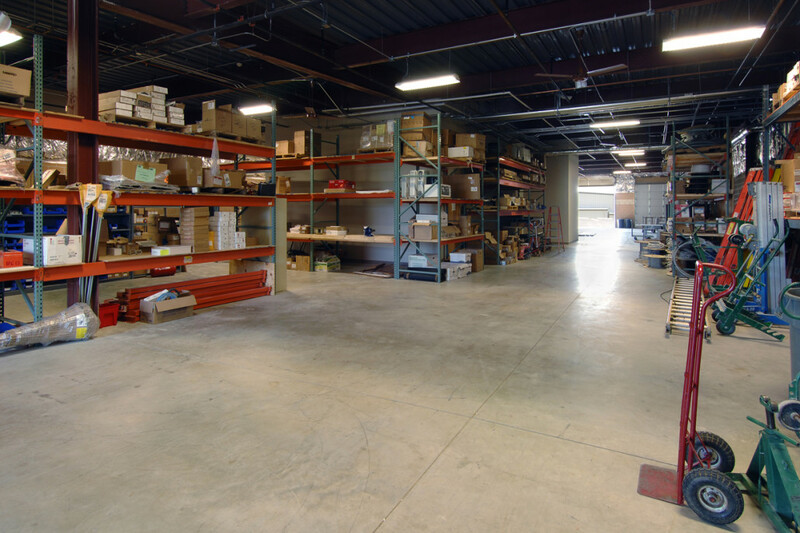 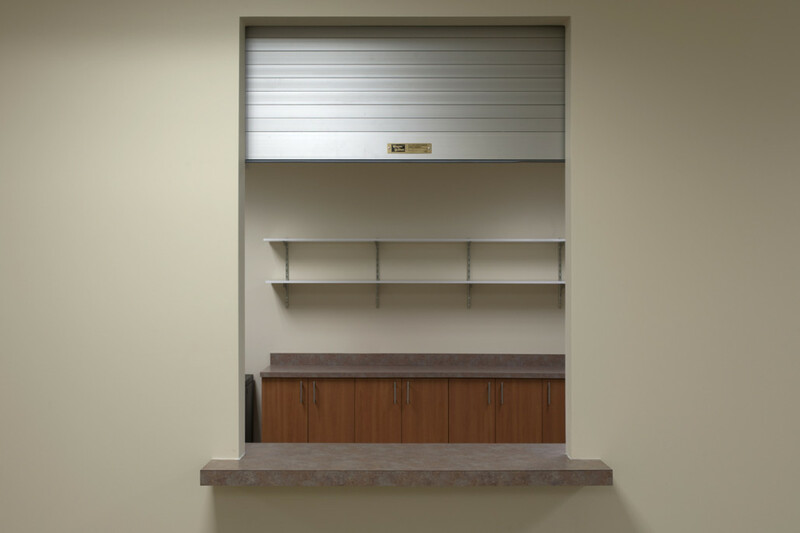 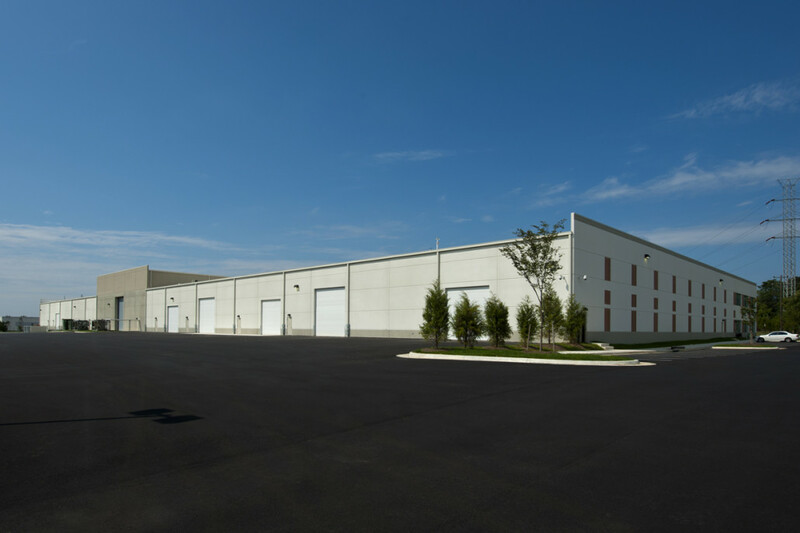 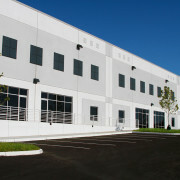 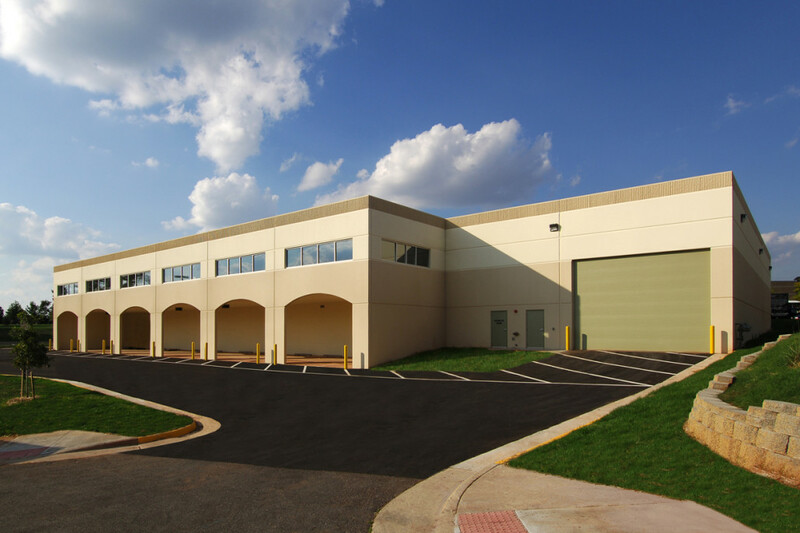 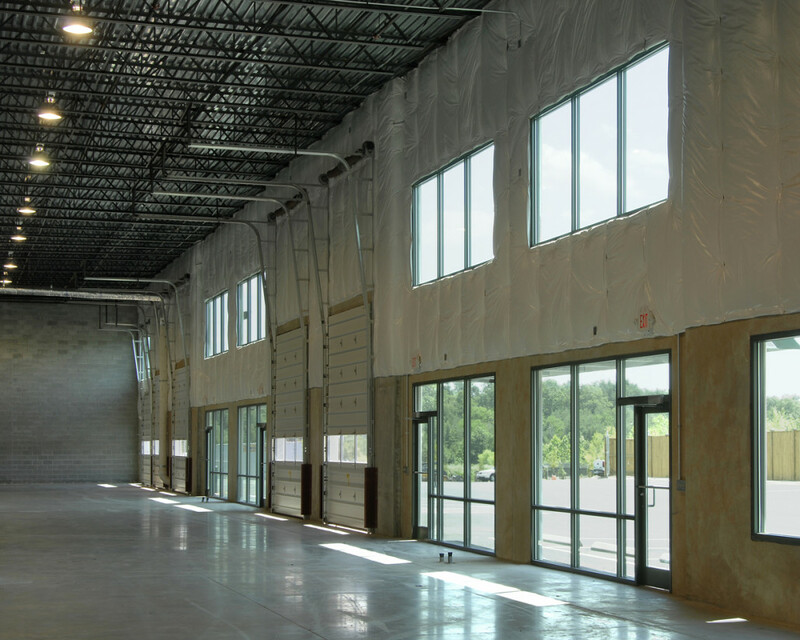 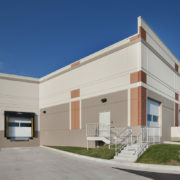 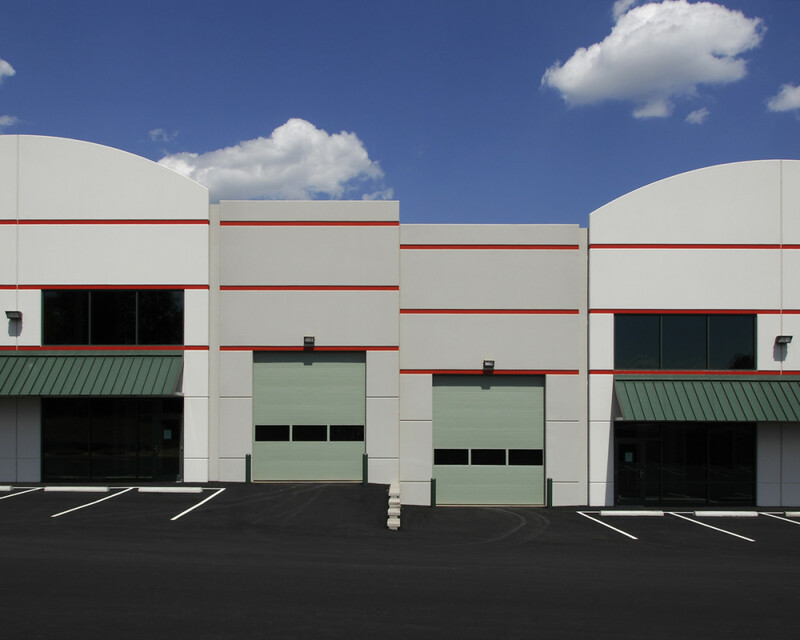 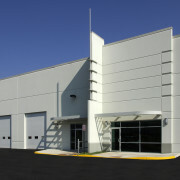 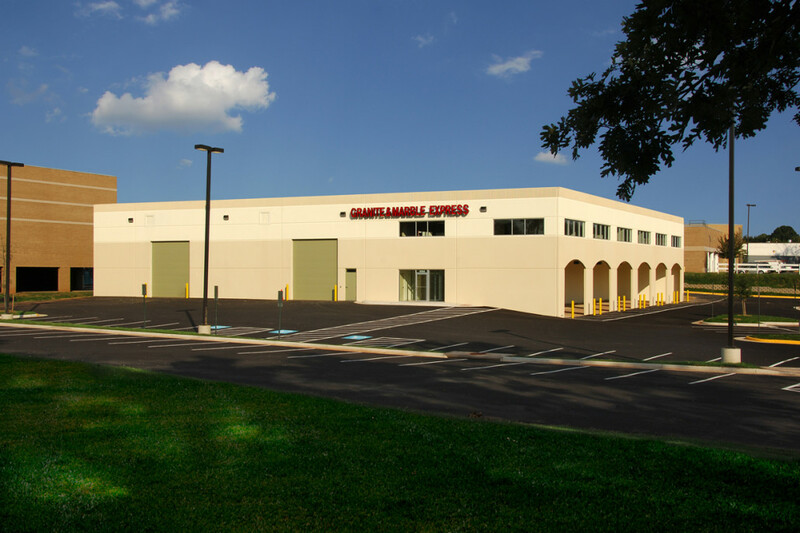 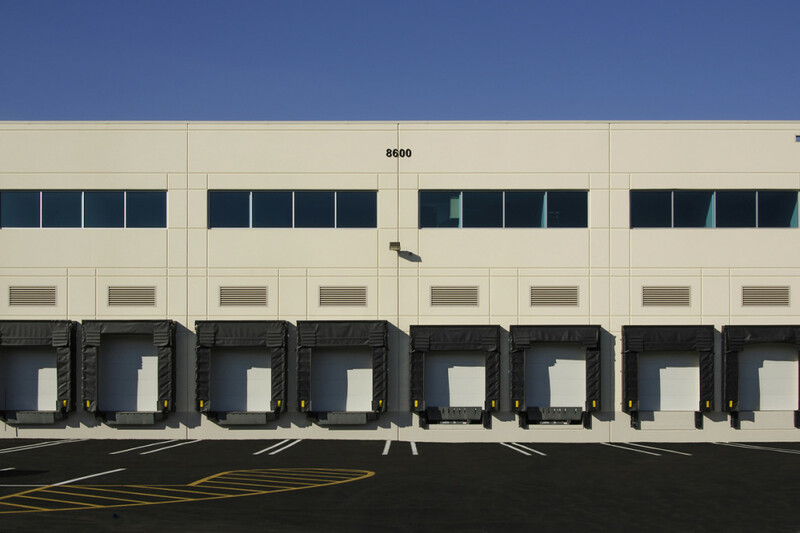 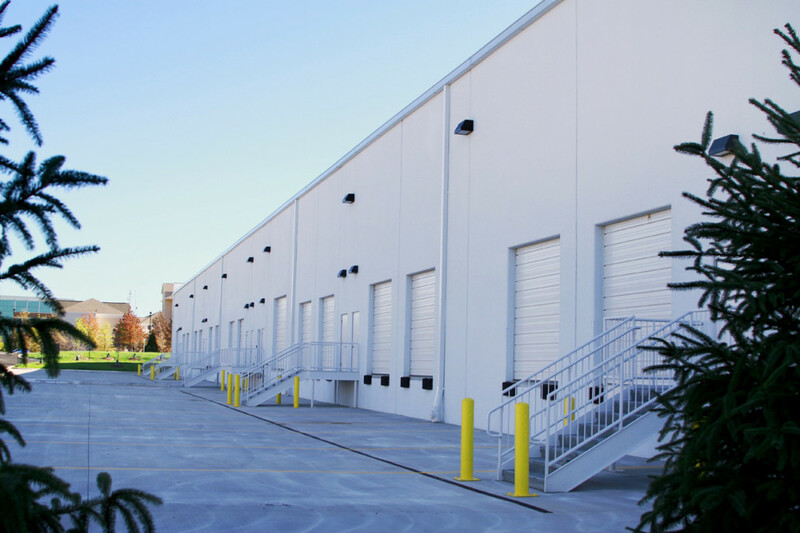 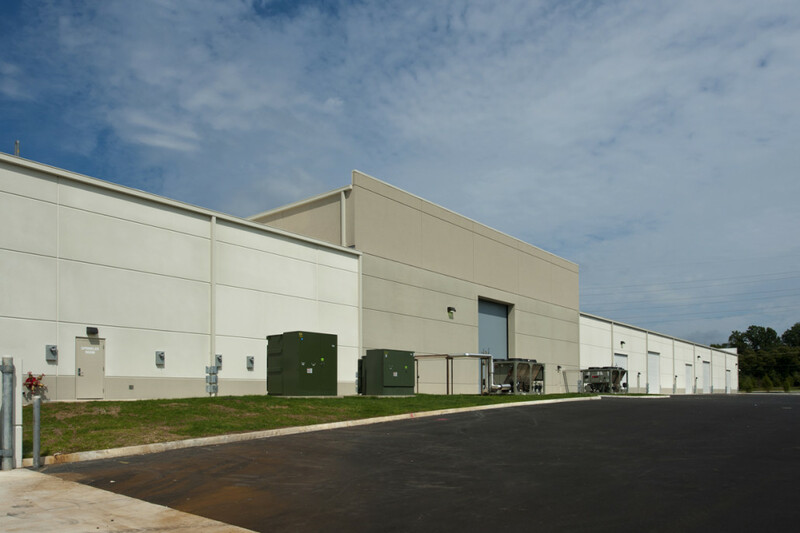 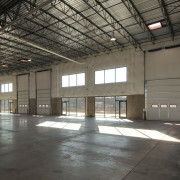 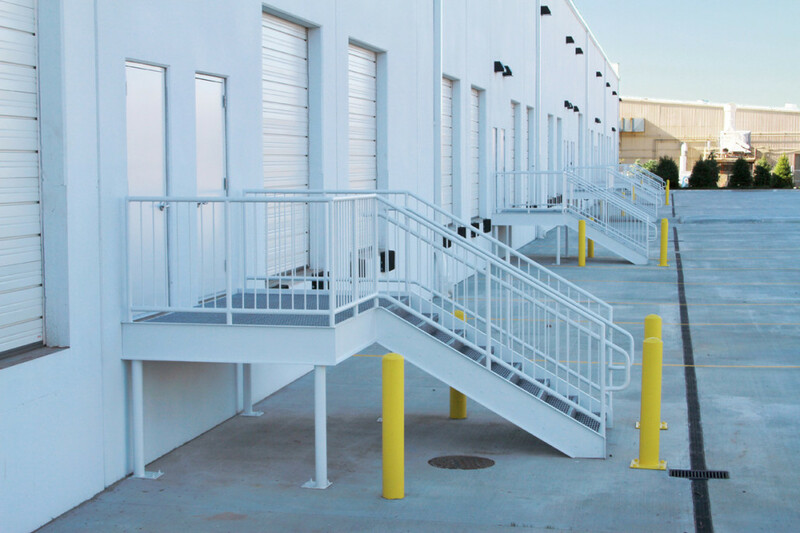 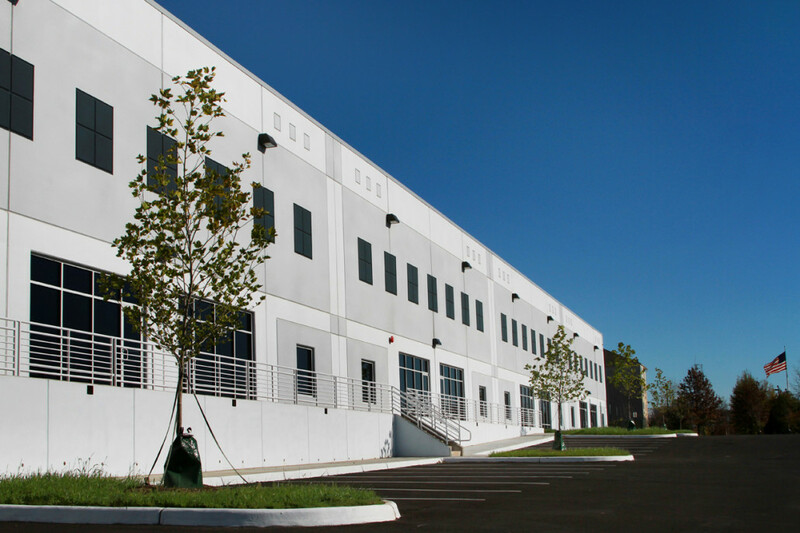 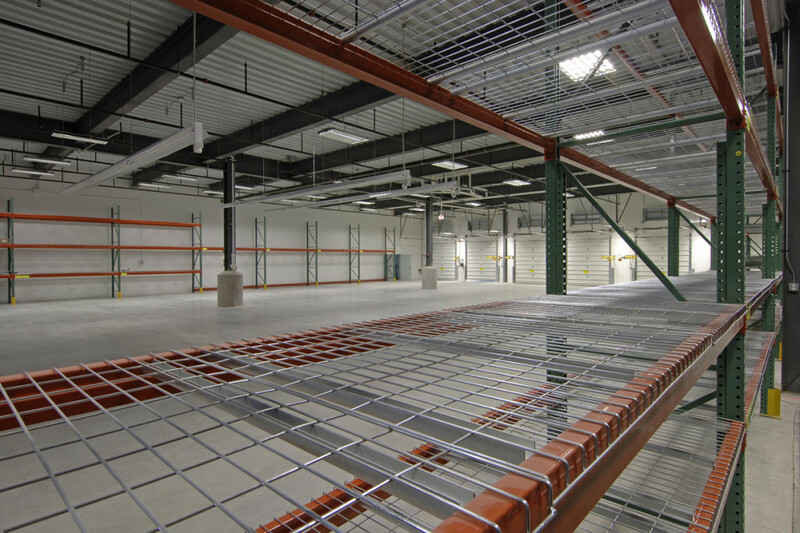 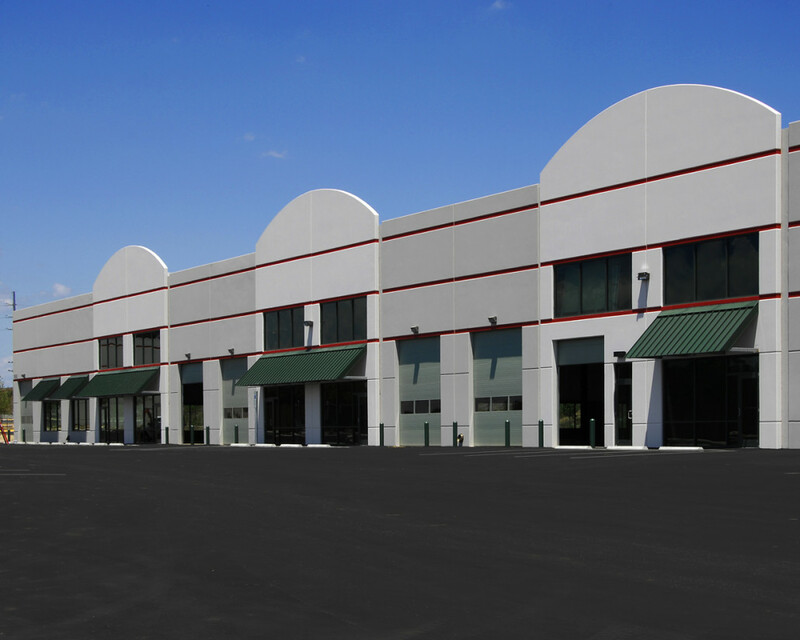 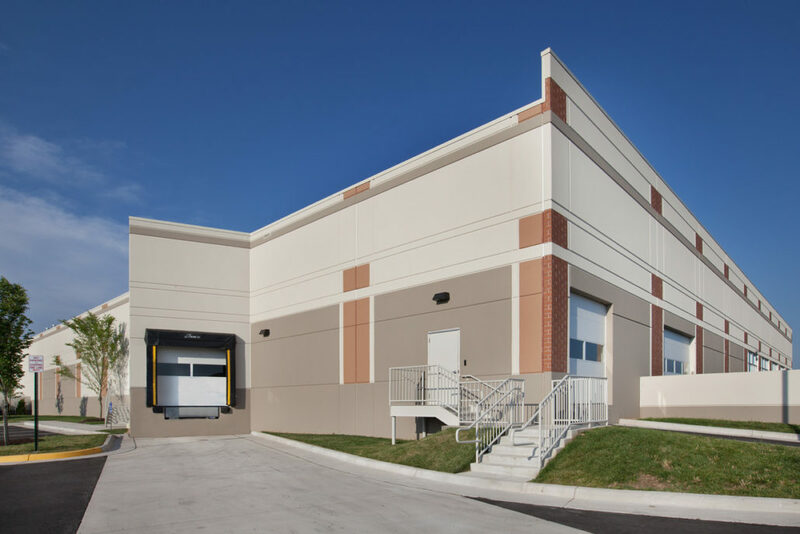 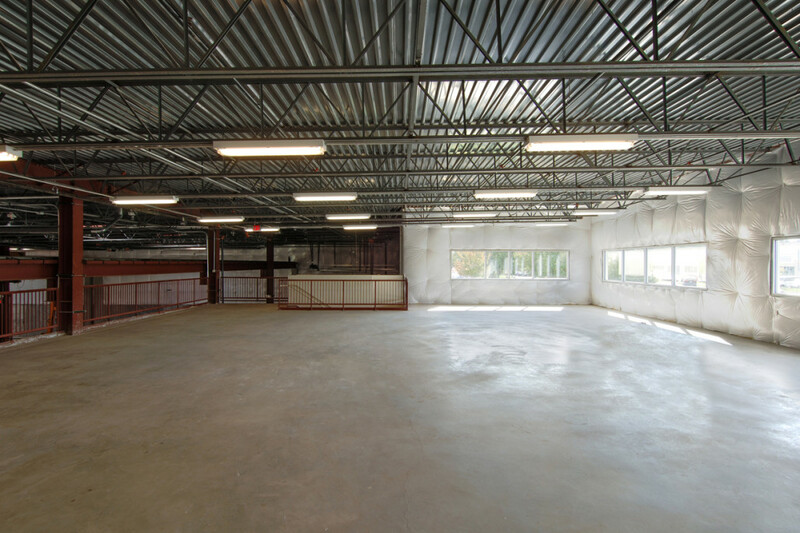 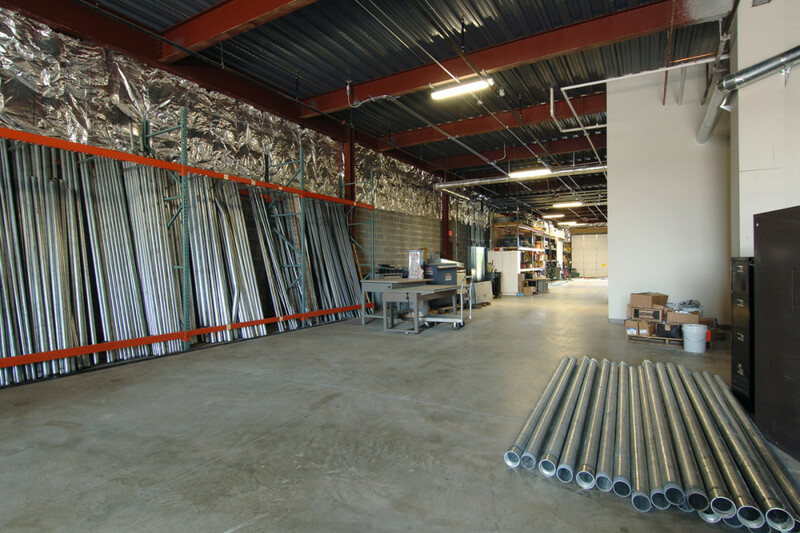 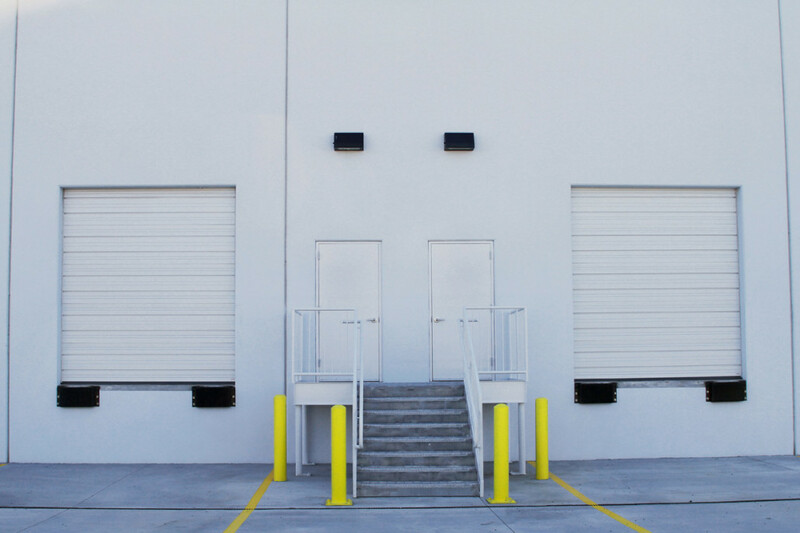 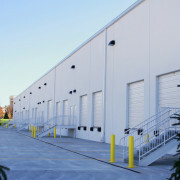 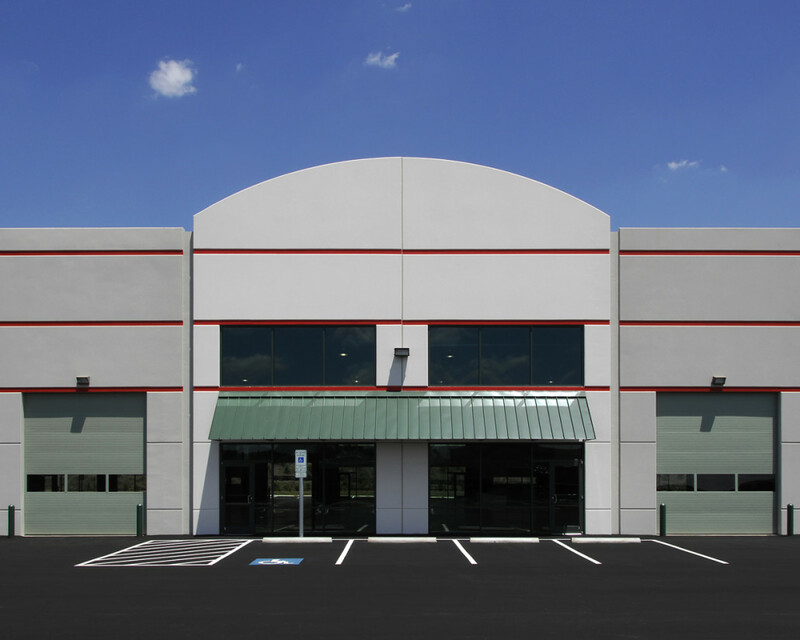 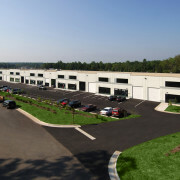 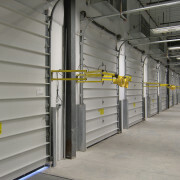 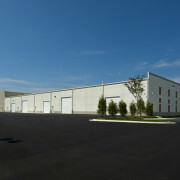 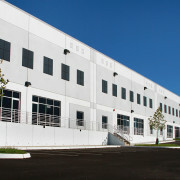 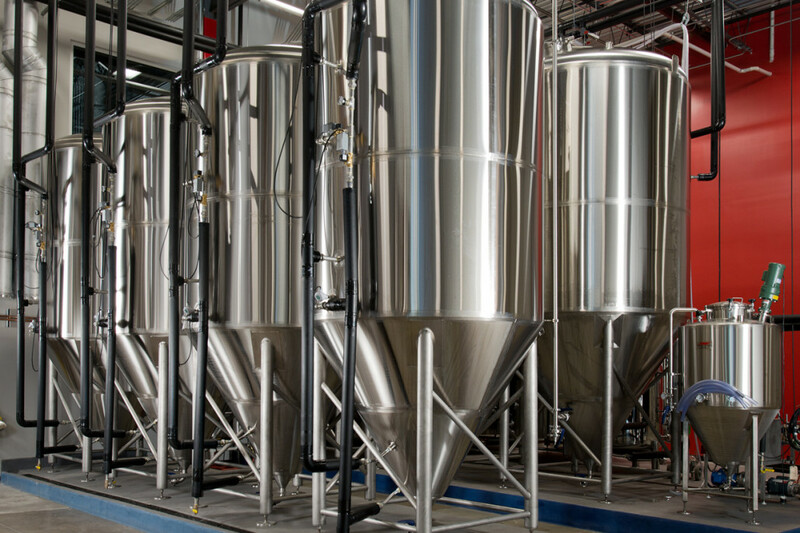 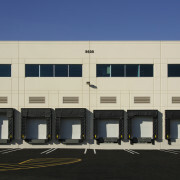 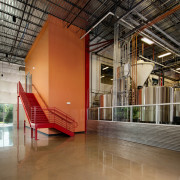 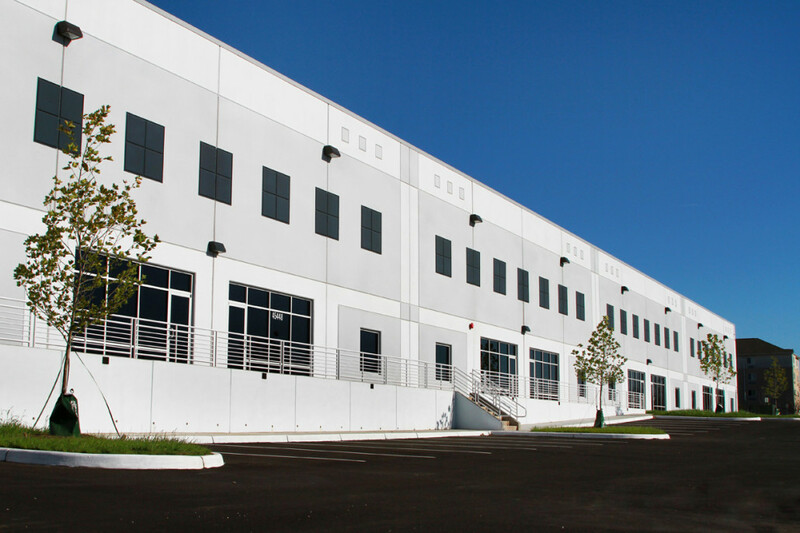 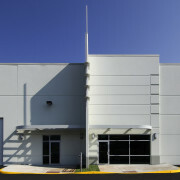 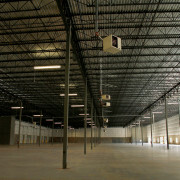 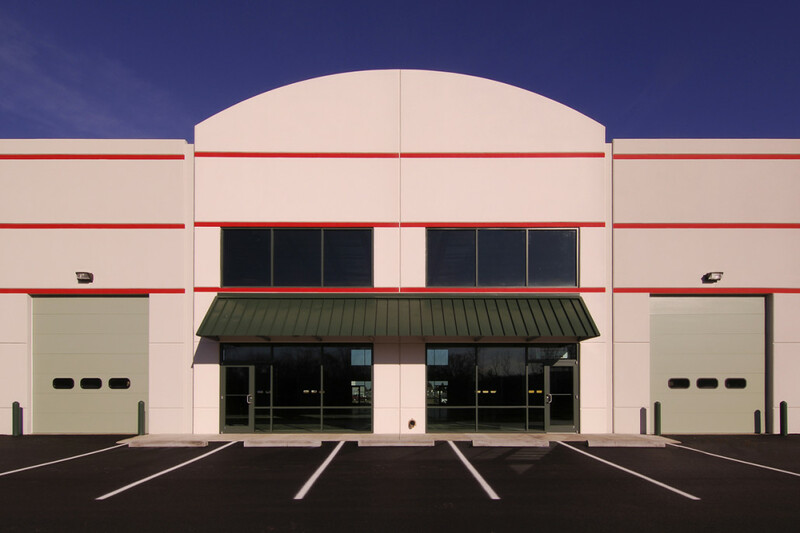 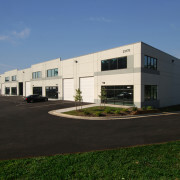 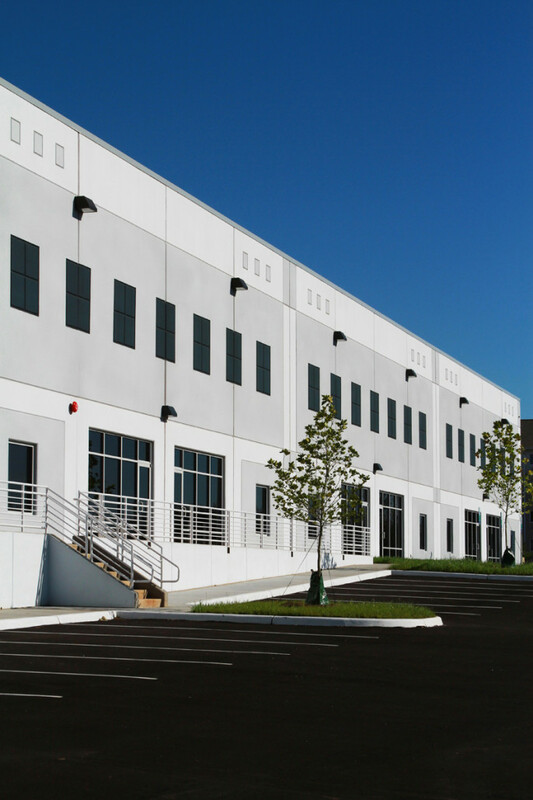 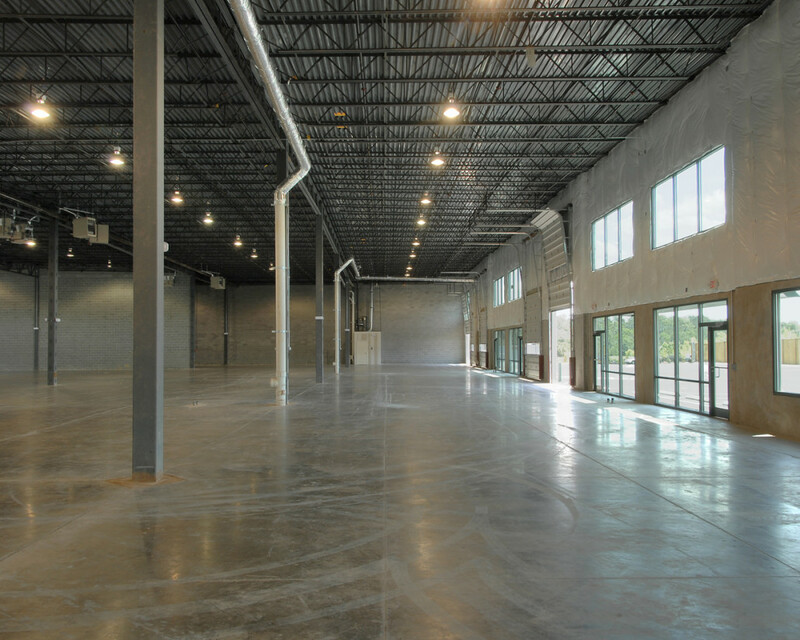 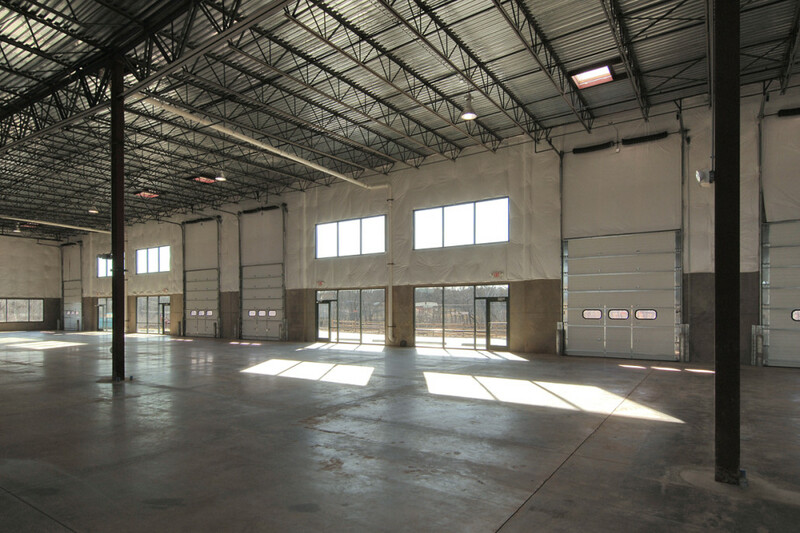 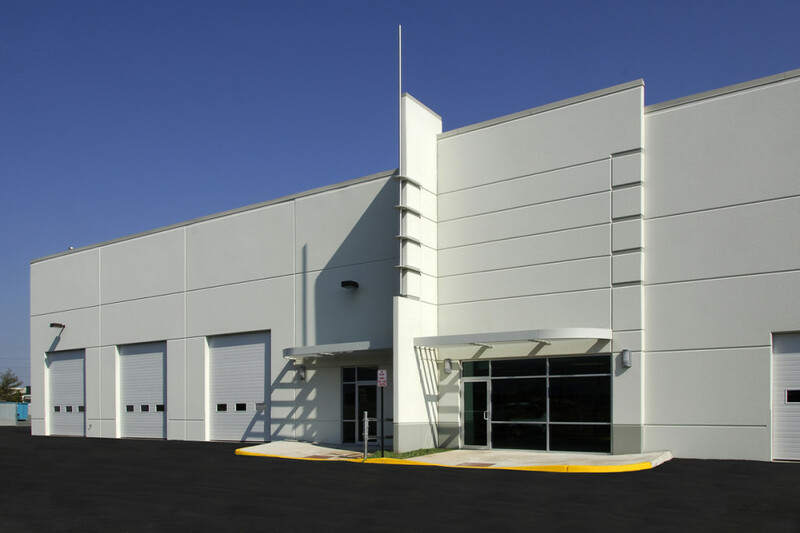 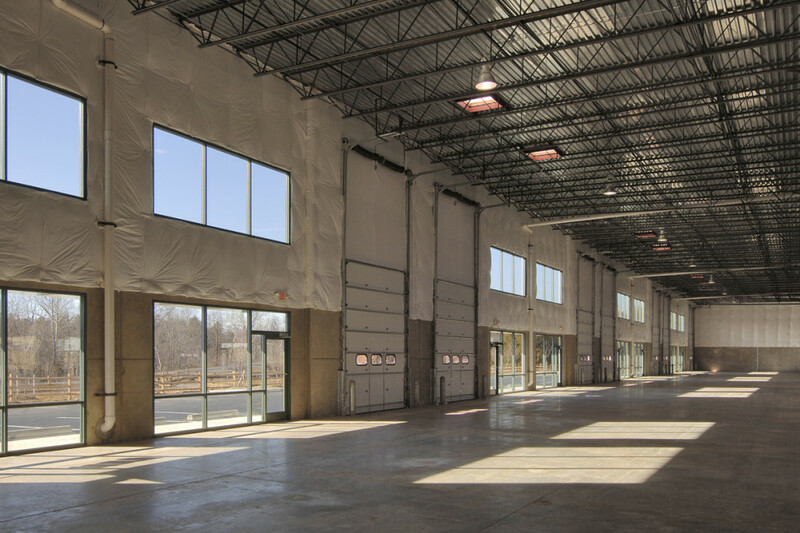 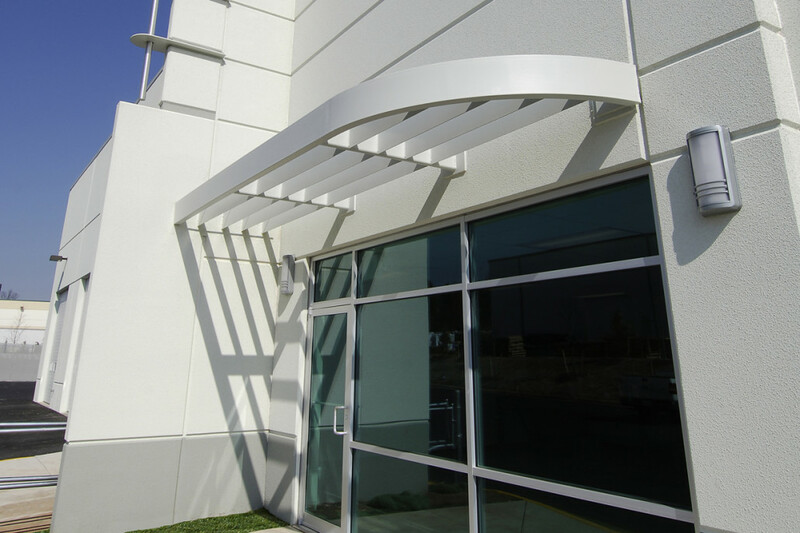 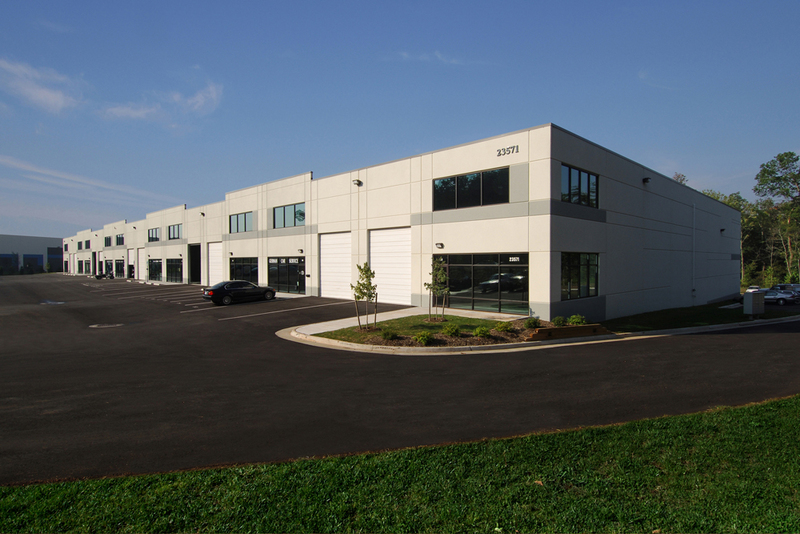 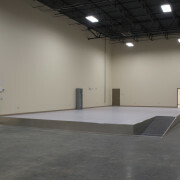 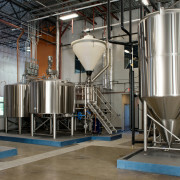 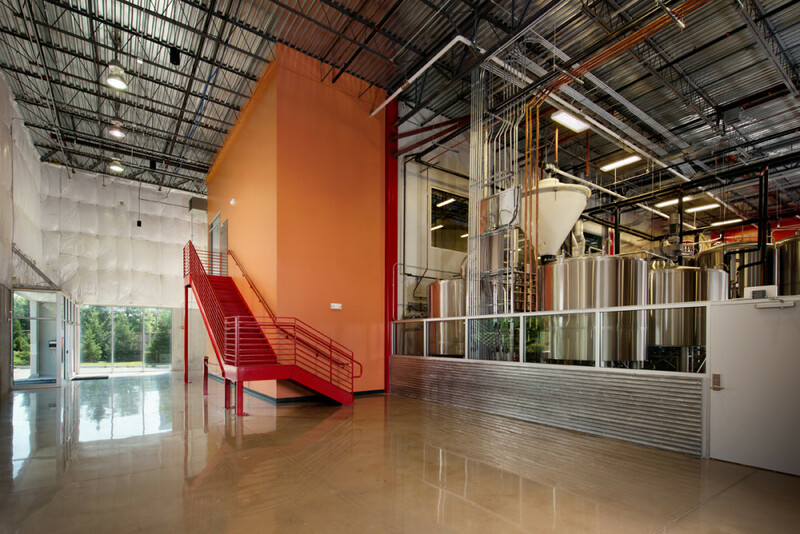 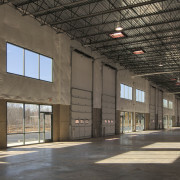 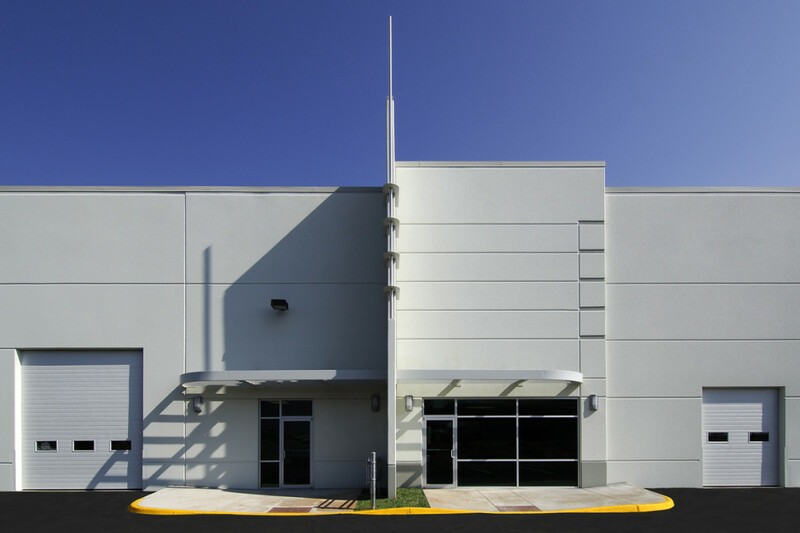 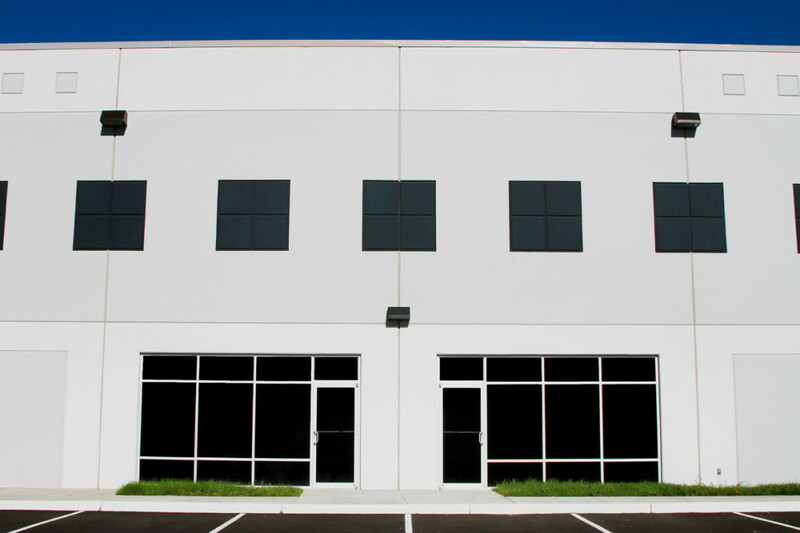 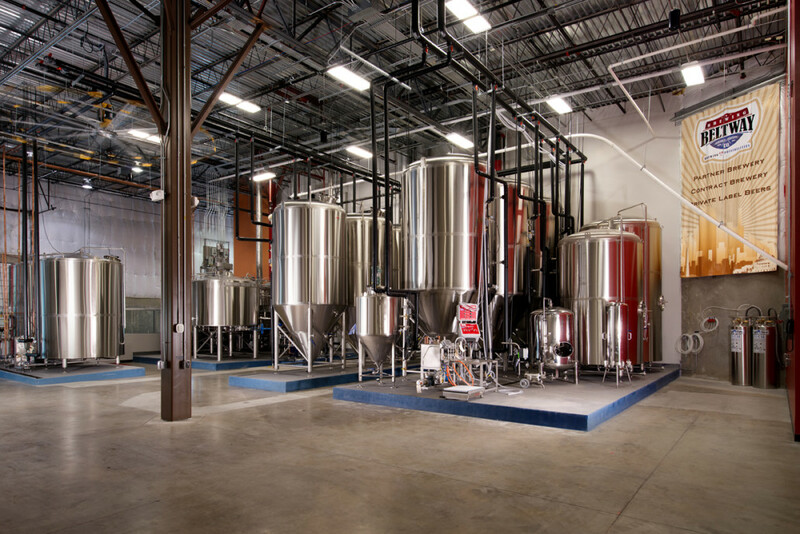 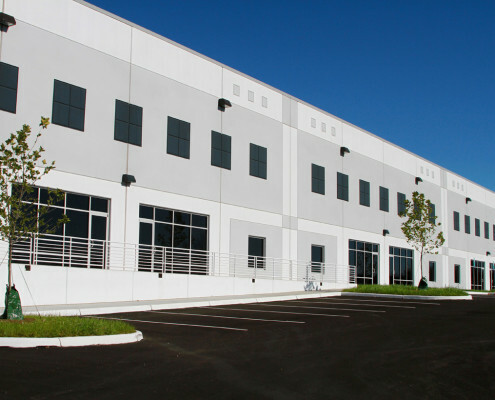 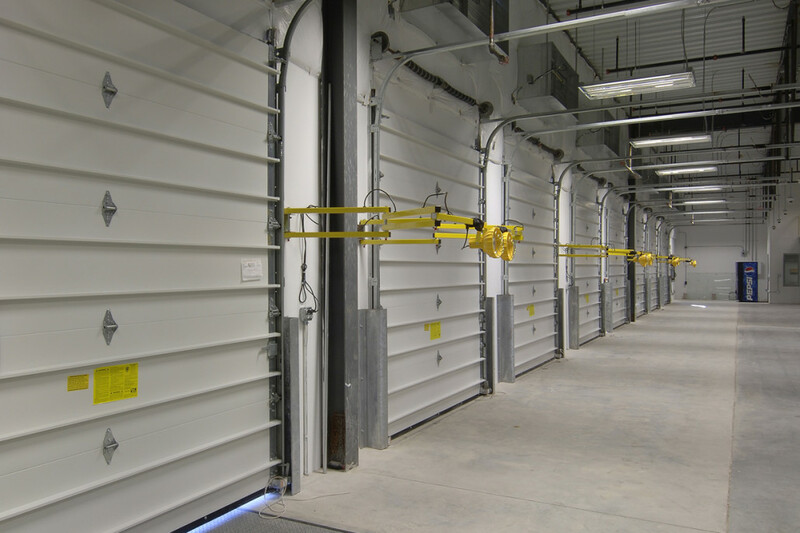 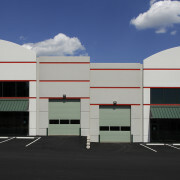 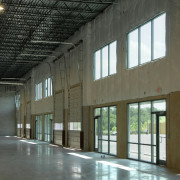 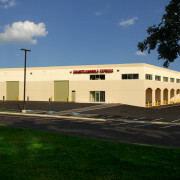 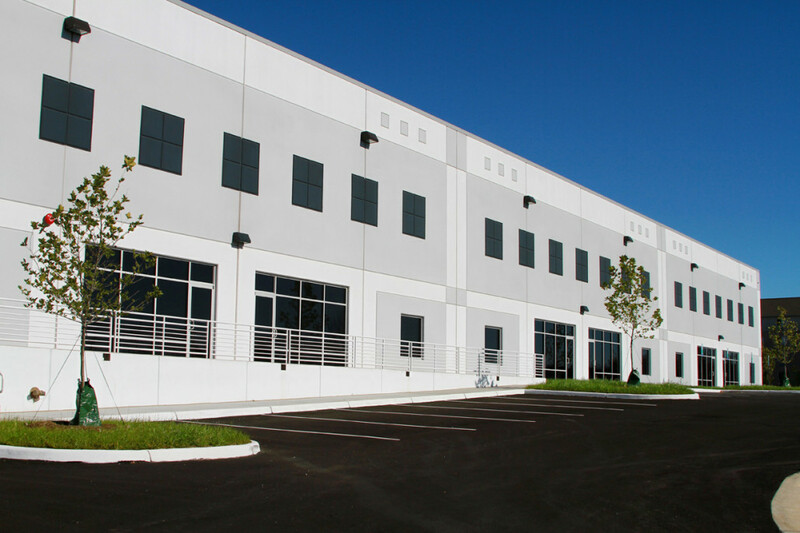 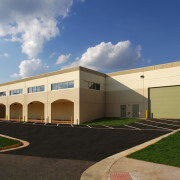 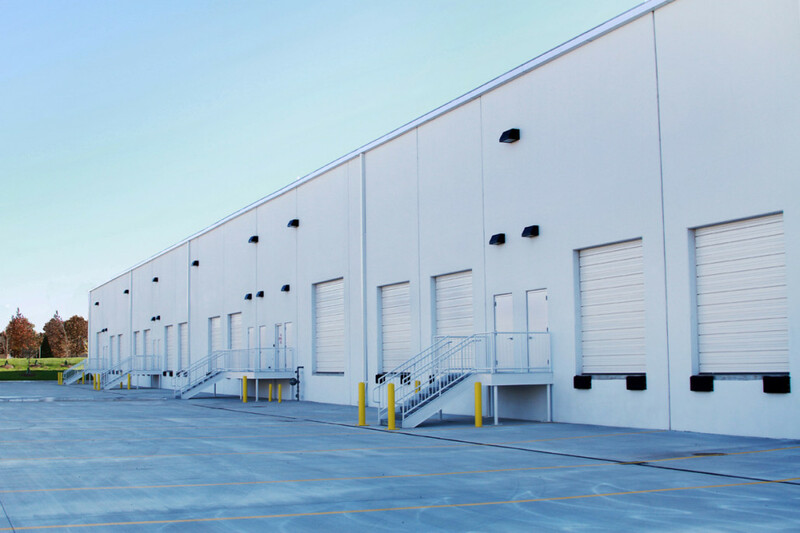 This Contractor’s Storage project was a design build, flex industrial warehouse building. 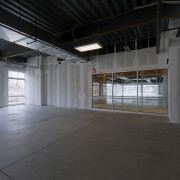 The 24’ clear tilt up building was a rear loaded multi-tenant layout on a site adjacent to flood plain. 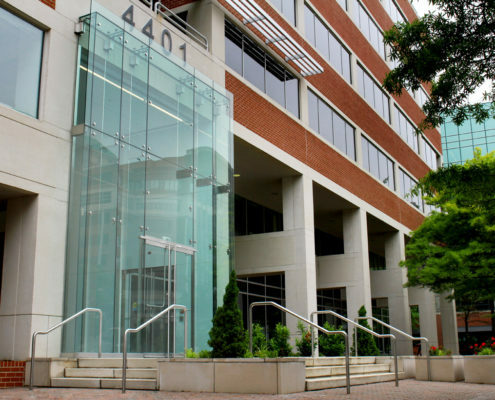 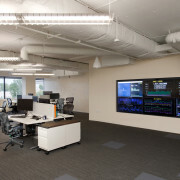 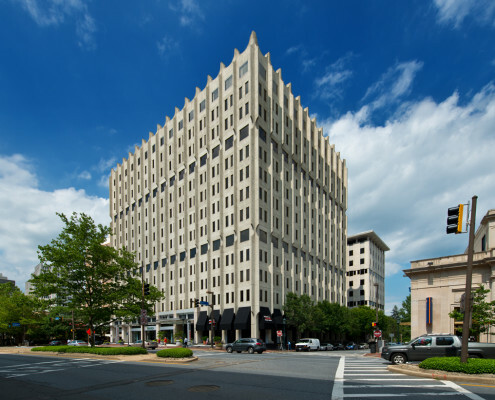 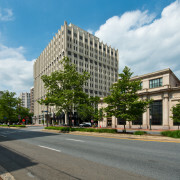 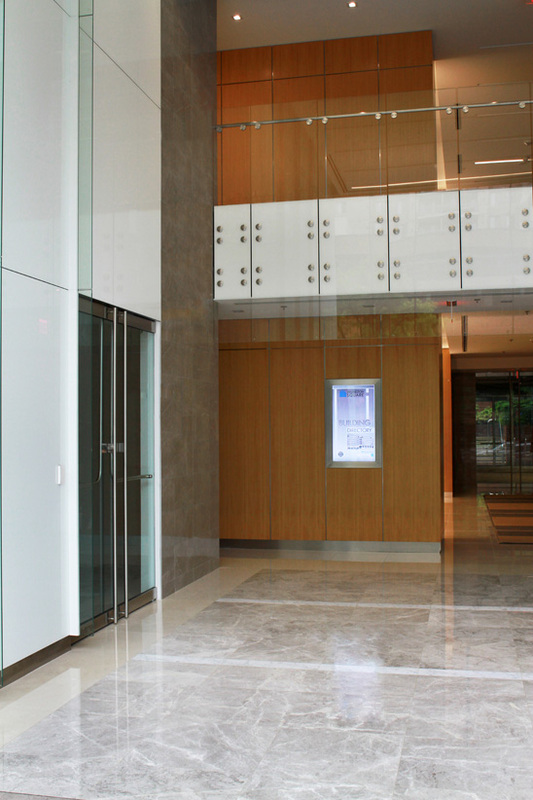 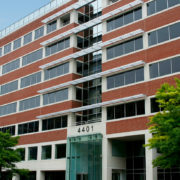 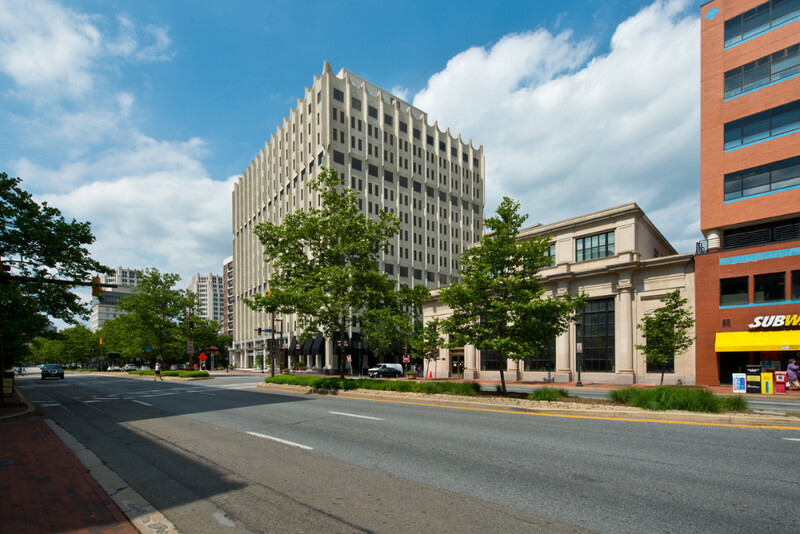 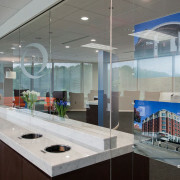 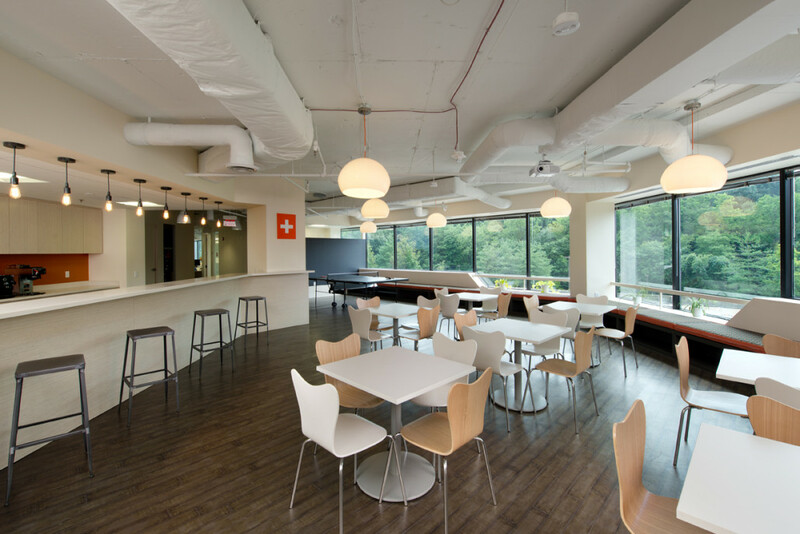 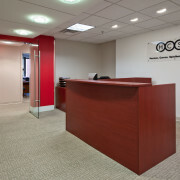 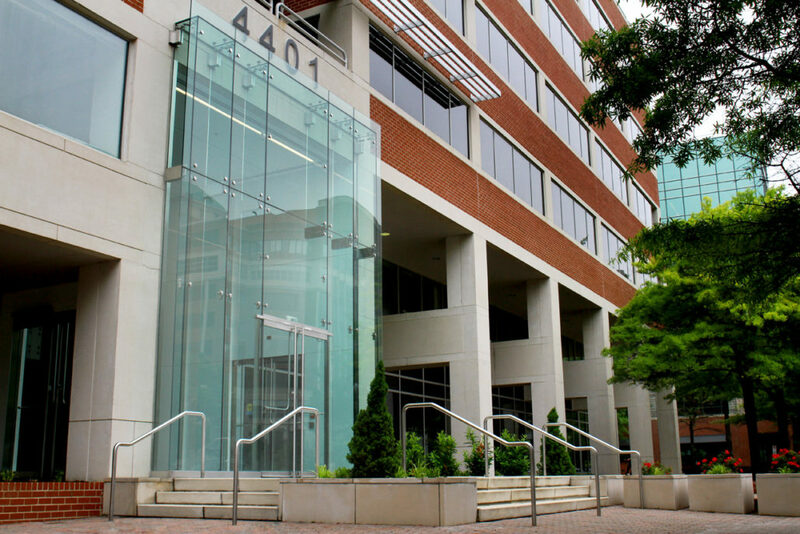 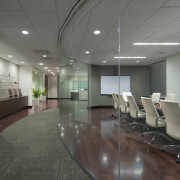 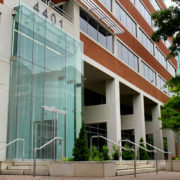 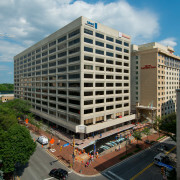 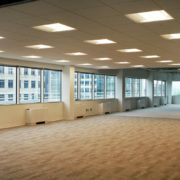 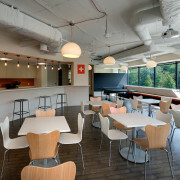 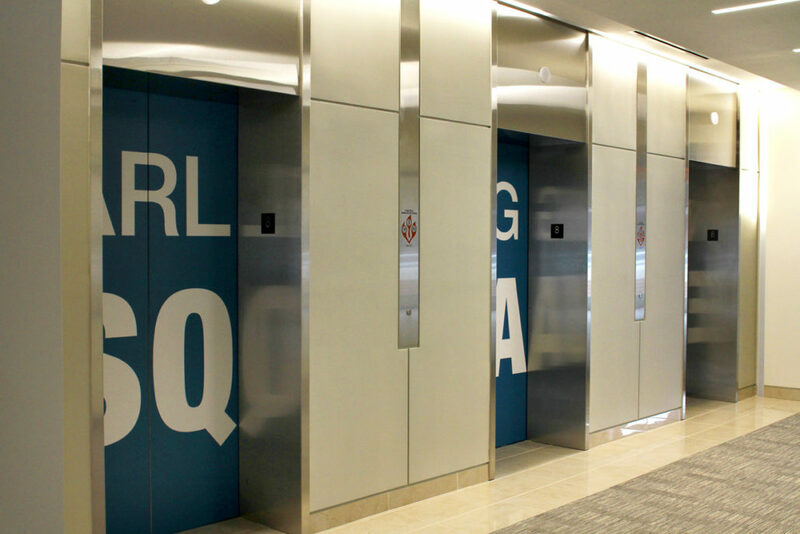 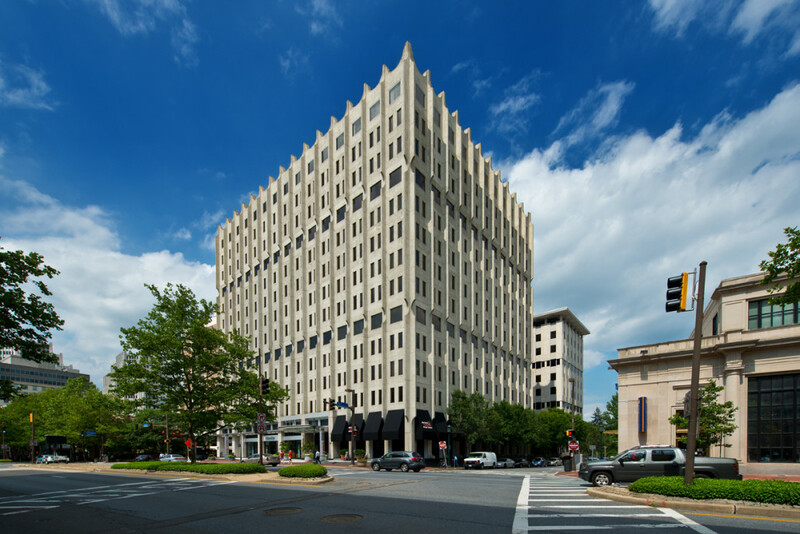 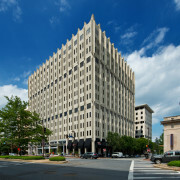 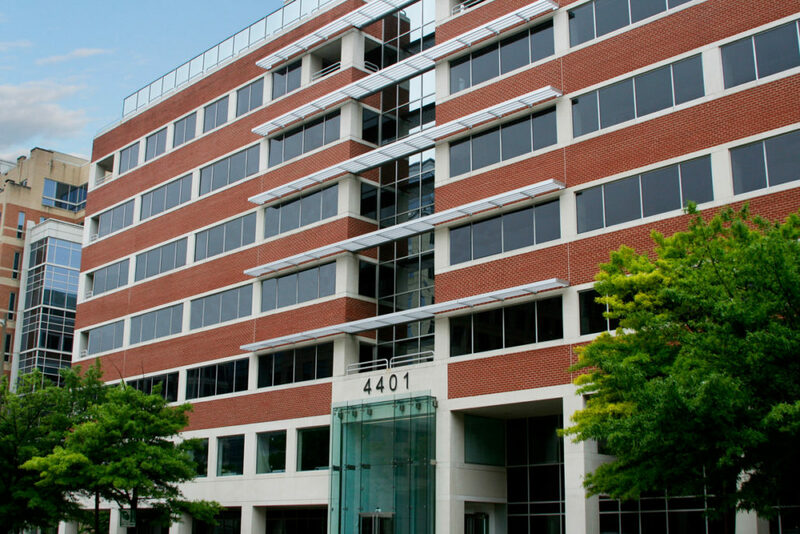 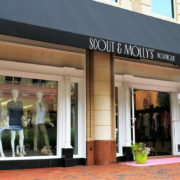 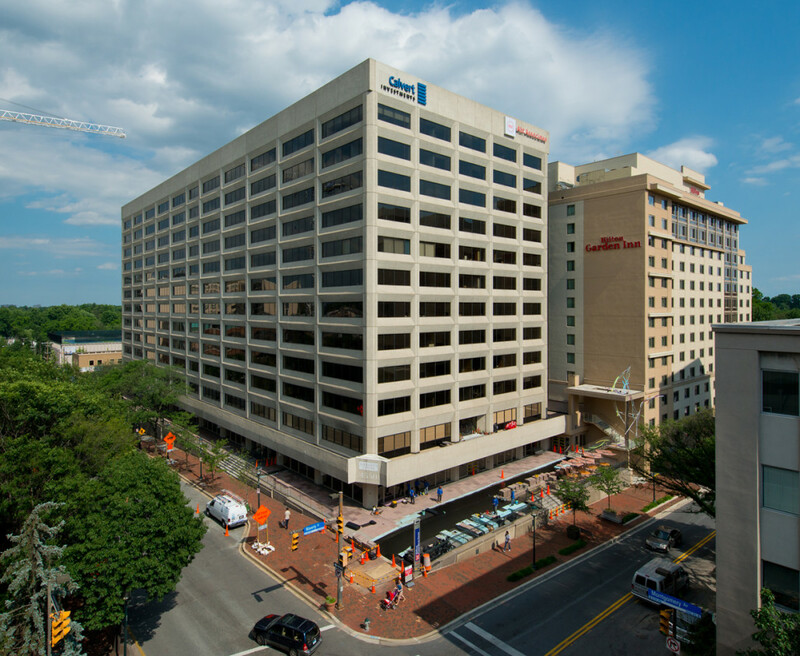 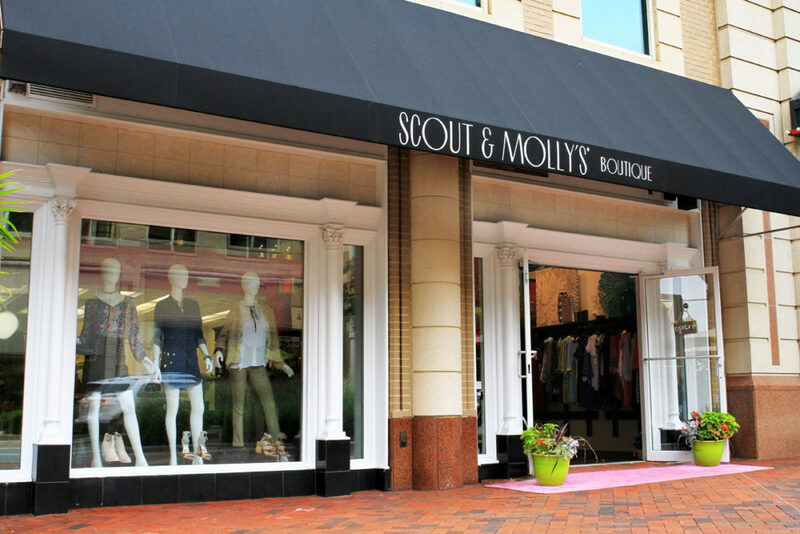 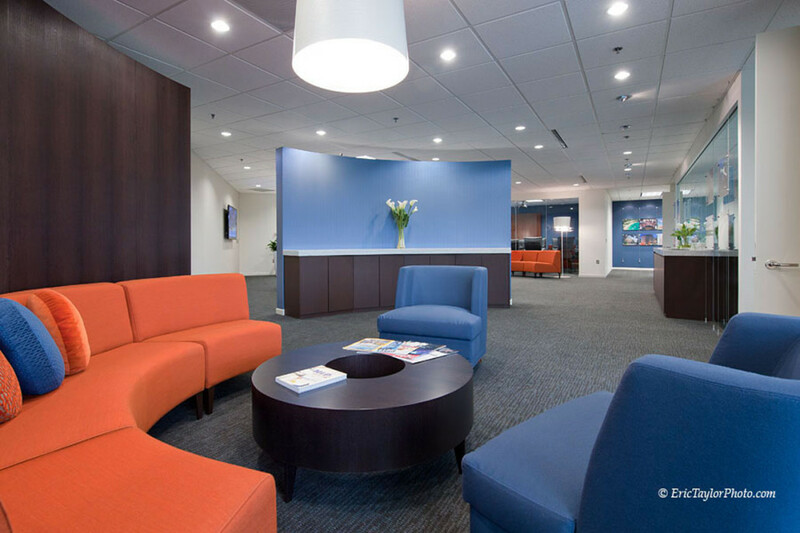 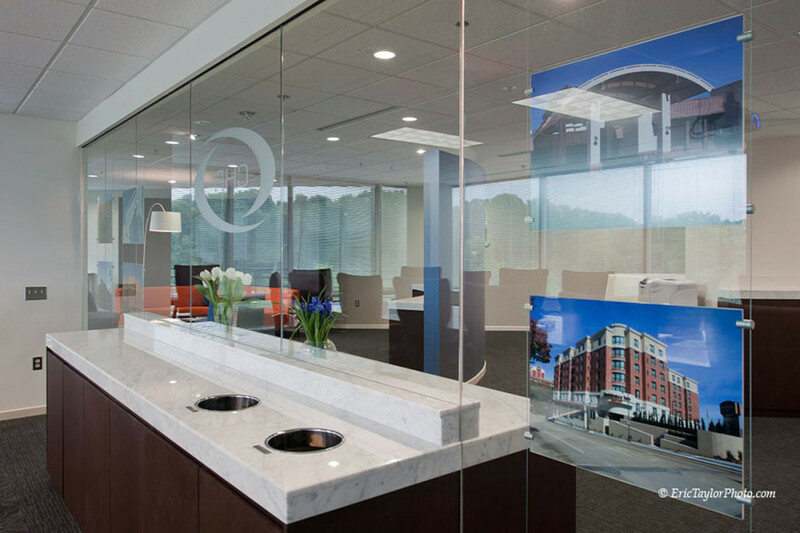 Contact Solutions is a 22,000 SF tenant fit out in Reston Town Center. 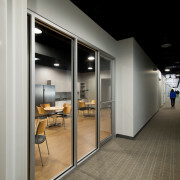 The space is designed to be open with extensive glass wall partitions, doors and side lights. 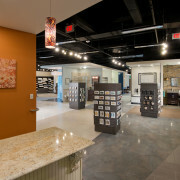 Glass floating shelves are incorporated into a glass tile trophy display area. 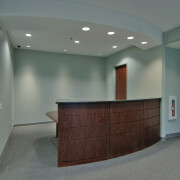 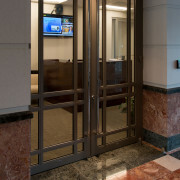 The office doors are walnut with custom fabricated walnut frames both of which are custom finished to match the wood flooring. 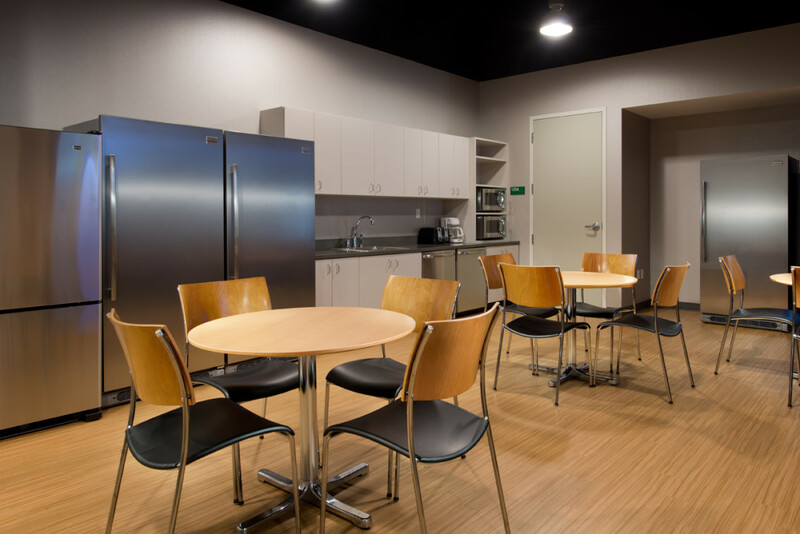 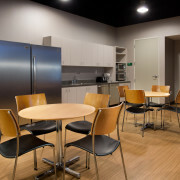 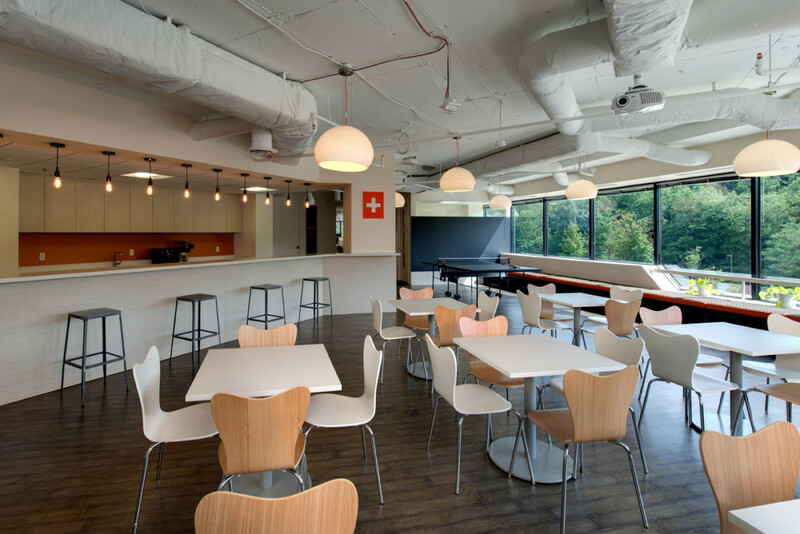 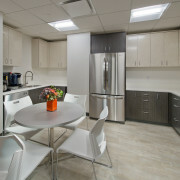 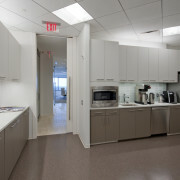 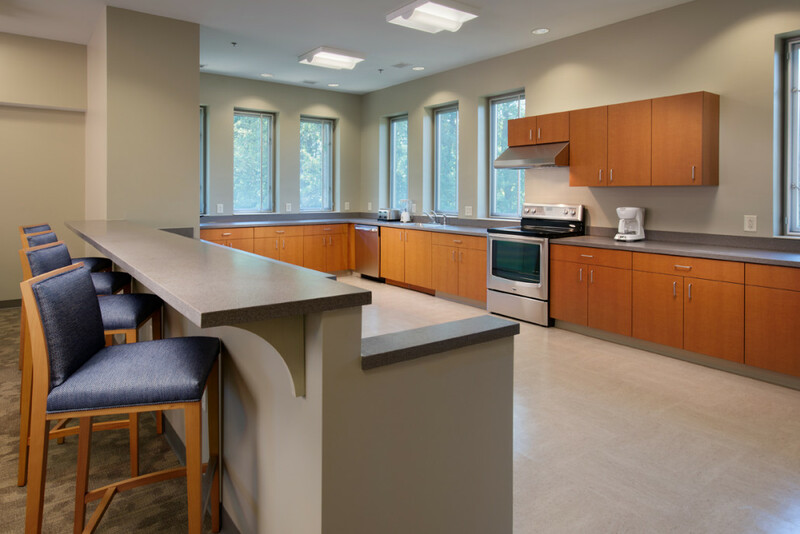 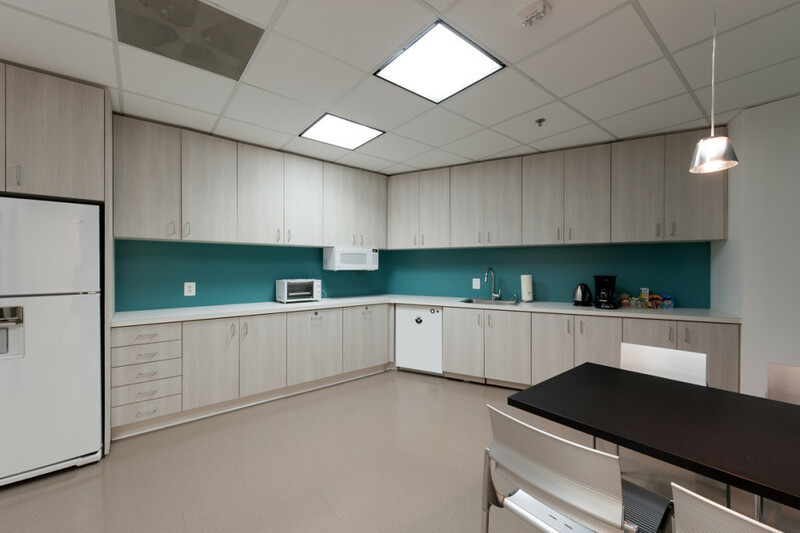 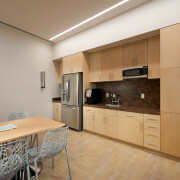 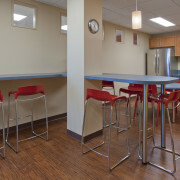 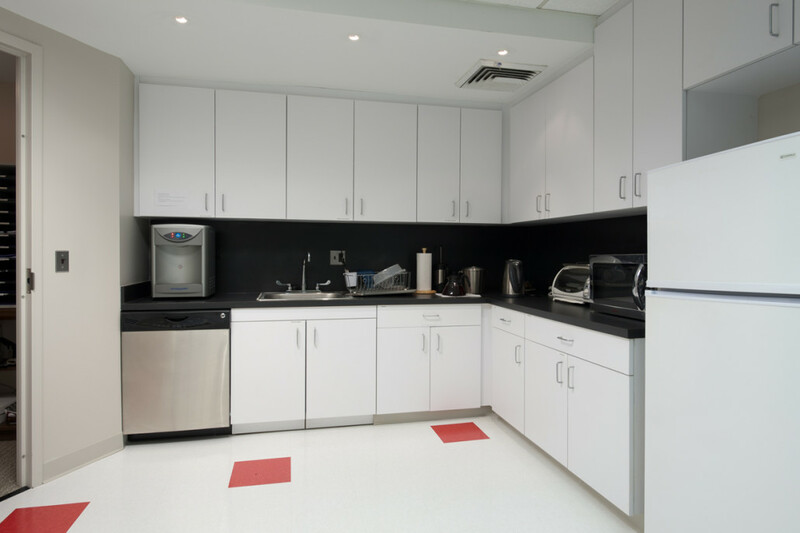 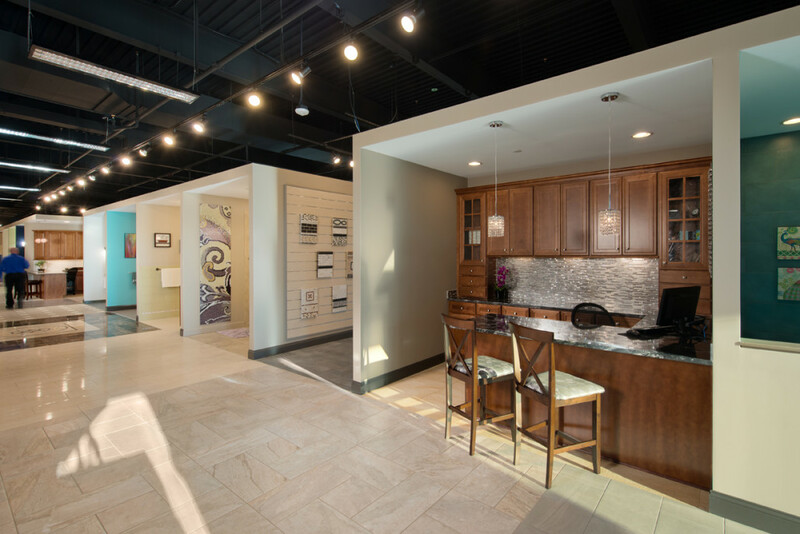 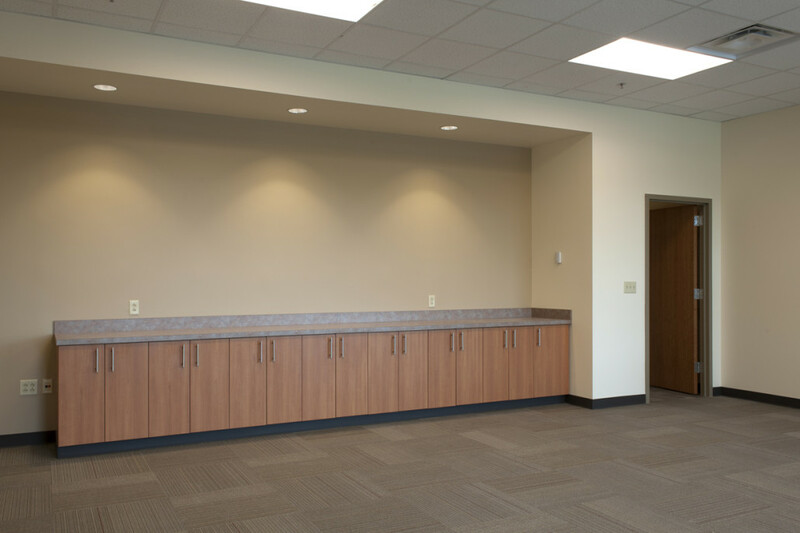 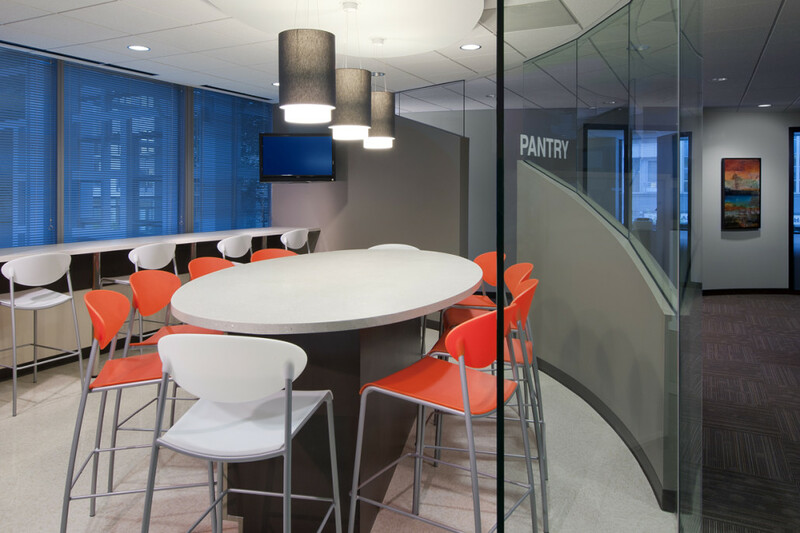 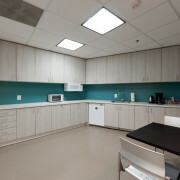 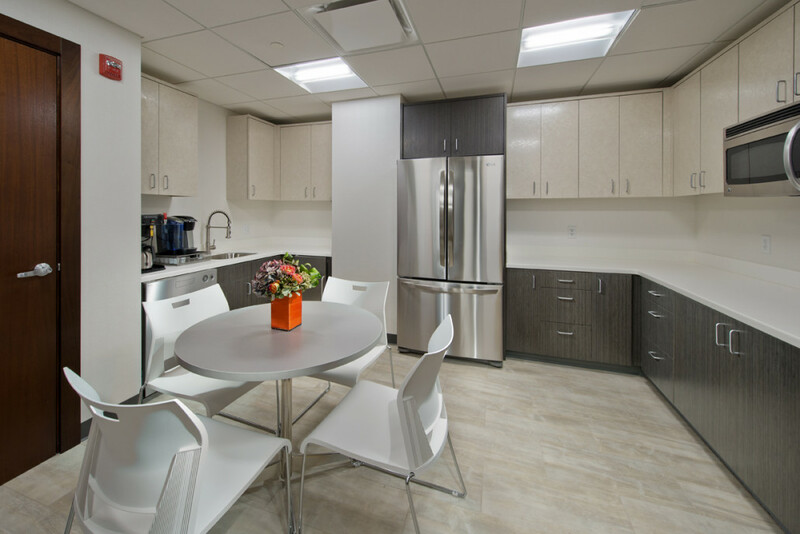 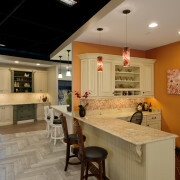 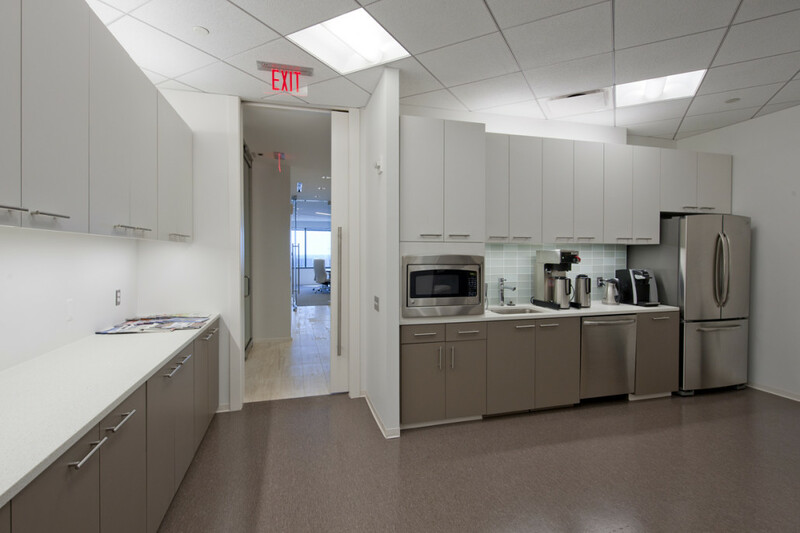 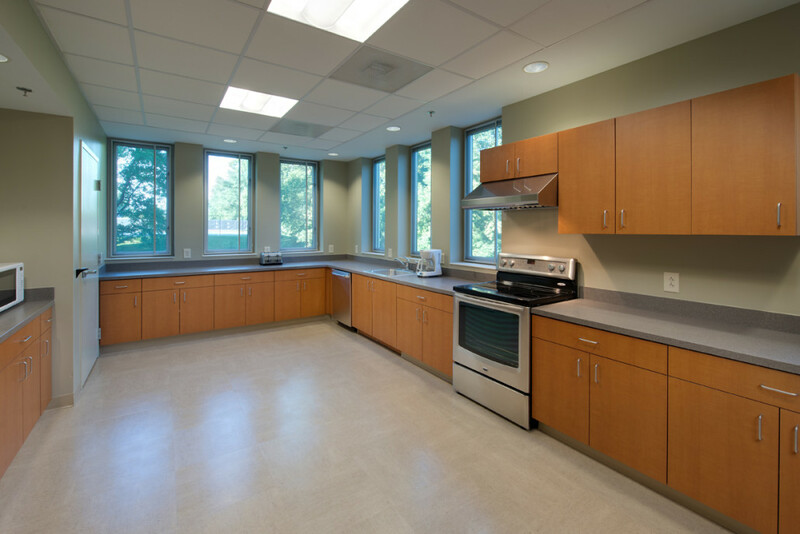 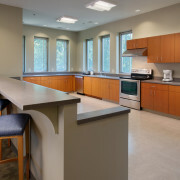 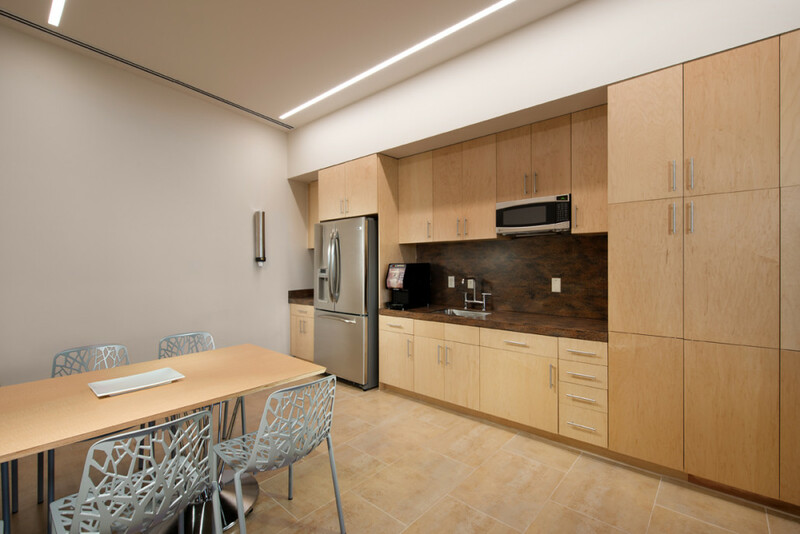 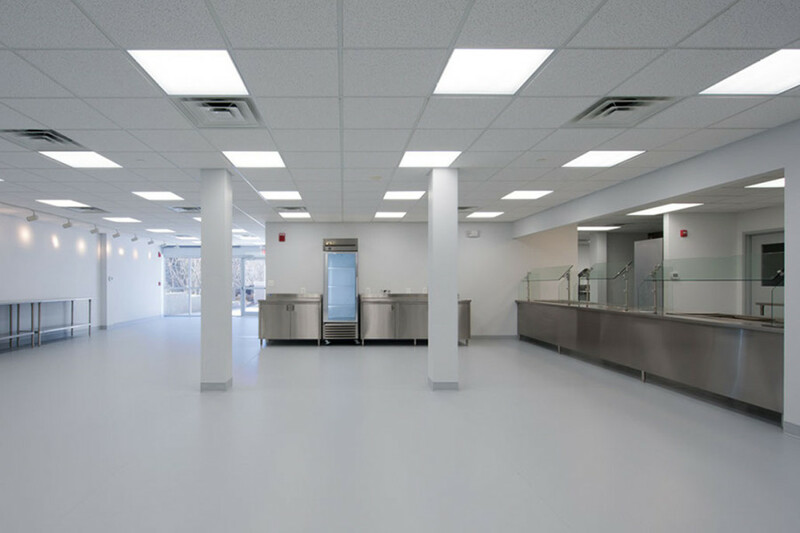 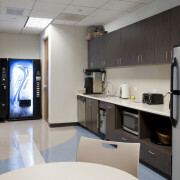 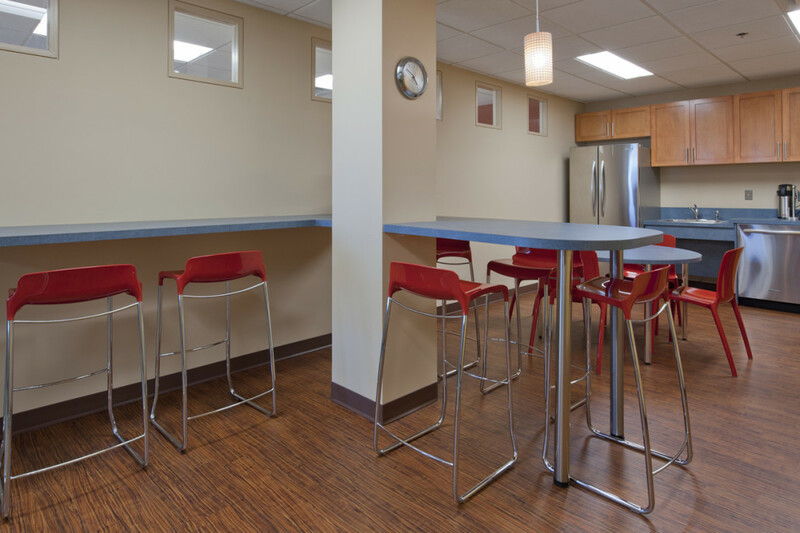 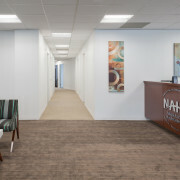 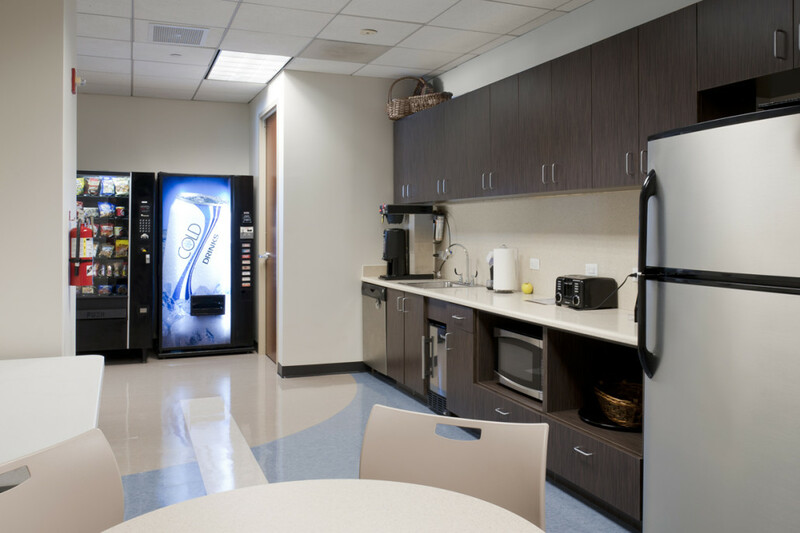 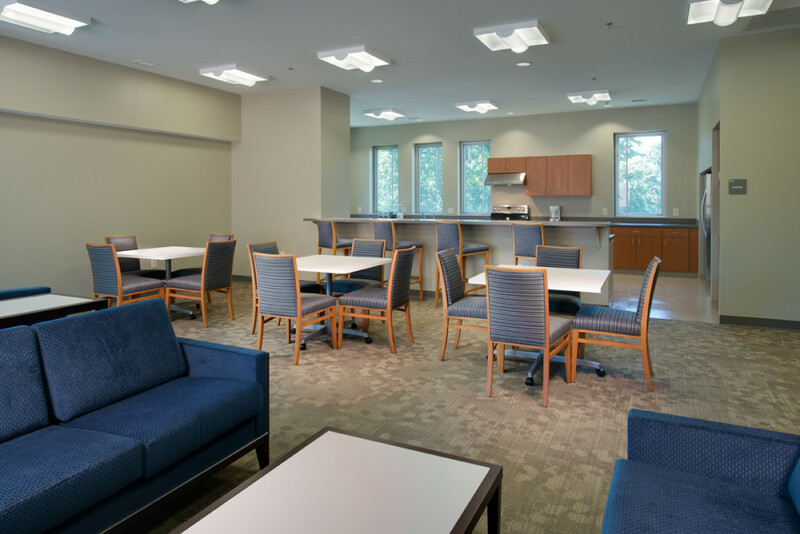 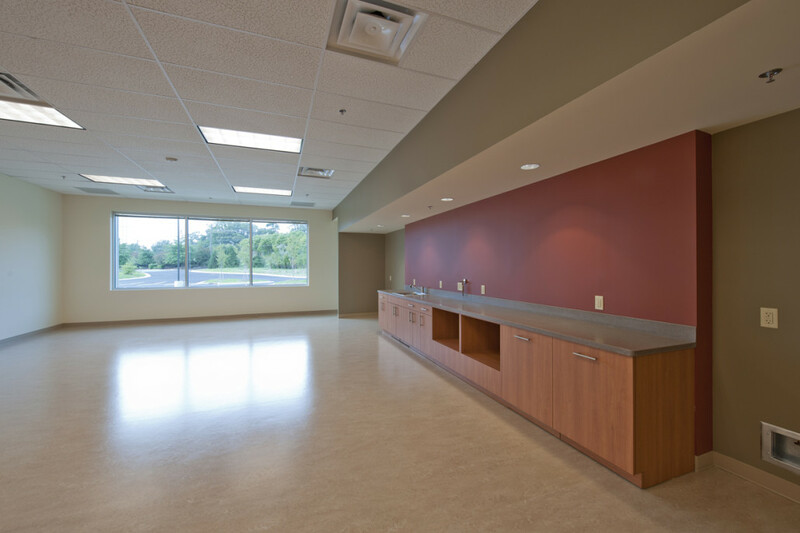 The break room is a light airy space with solid surface counters, stainless steel appliances and a ceiling cloud featuring decorative pendant light fixtures. 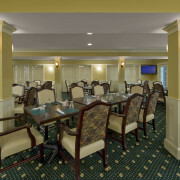 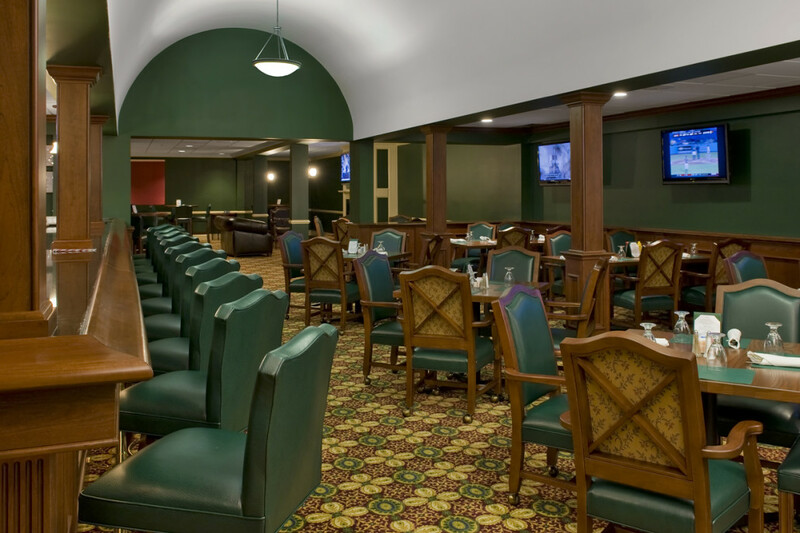 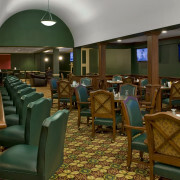 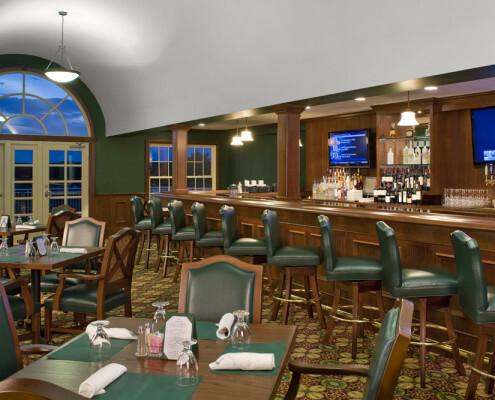 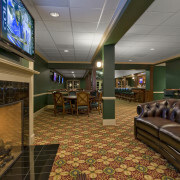 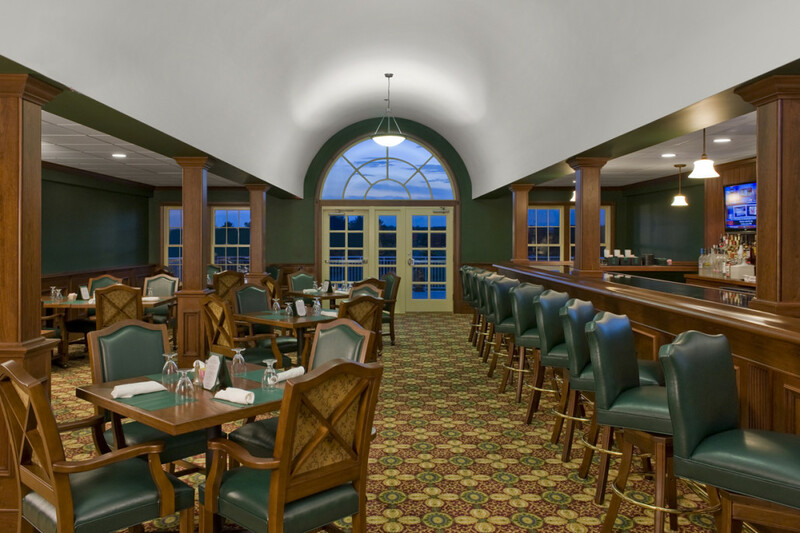 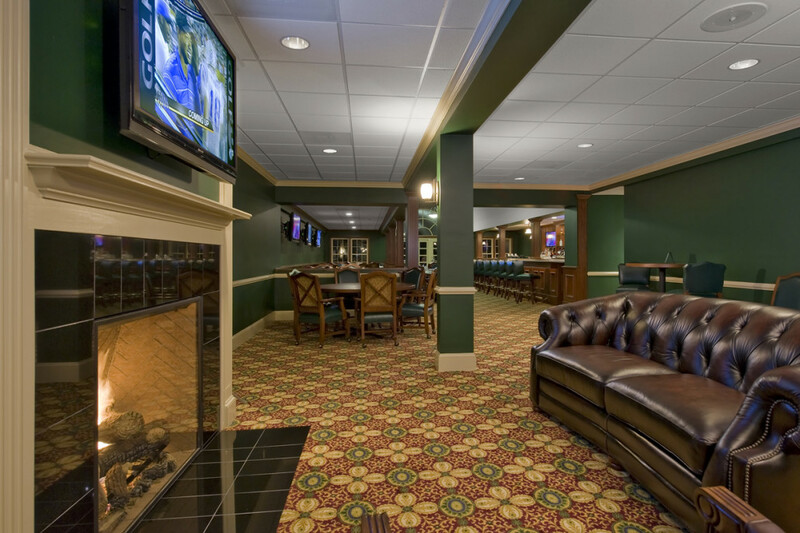 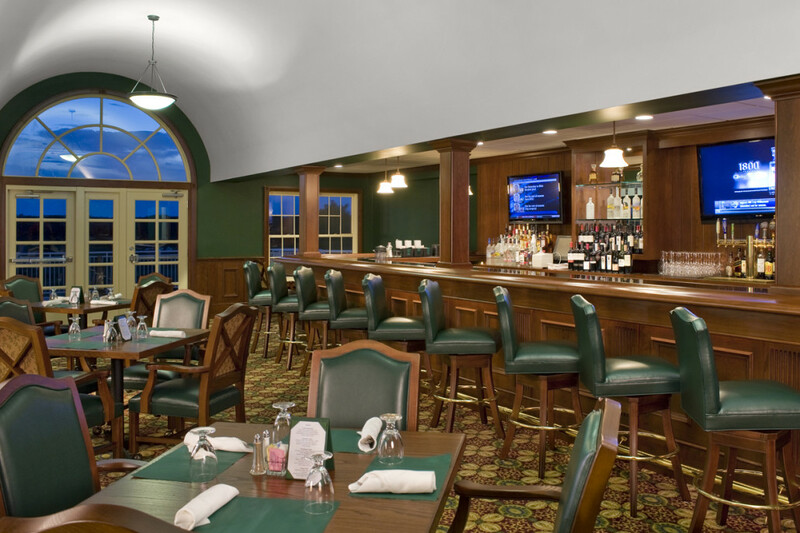 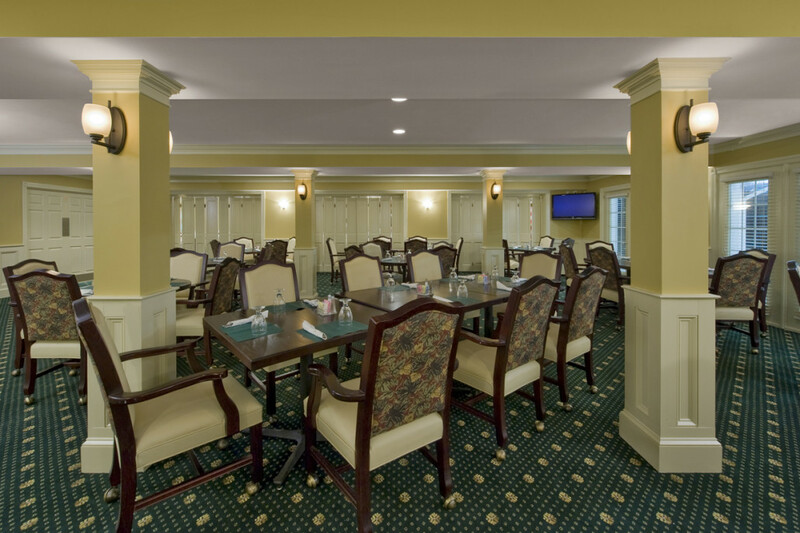 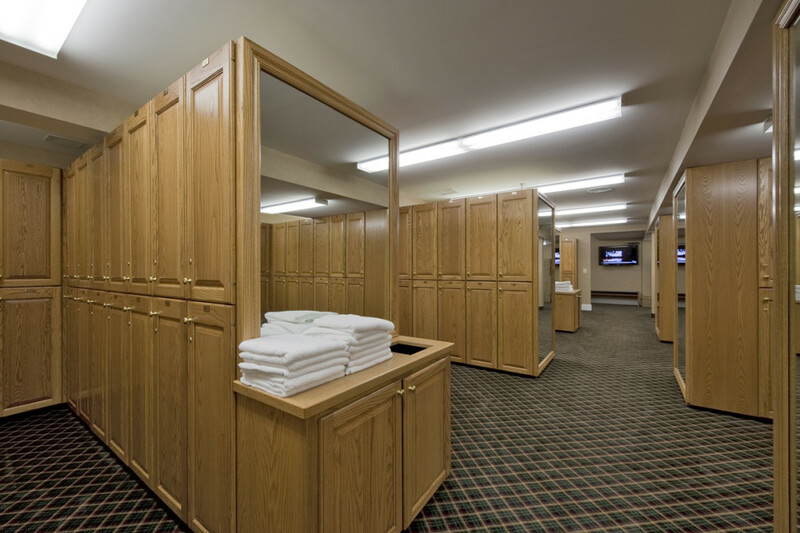 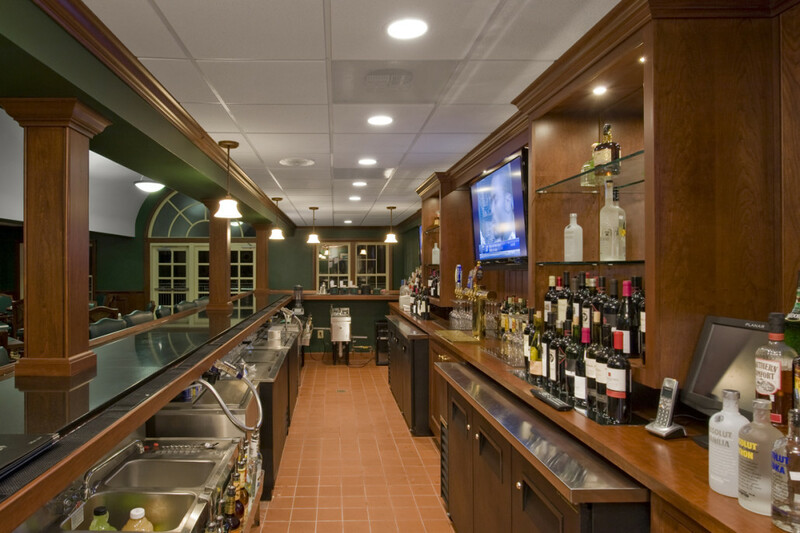 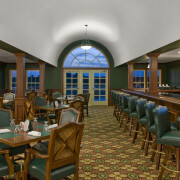 Chantilly National Golf & Country Club constituted a complete remodel of the Clubhouse including food service areas, dining facilities, 19th hole bar, locker rooms, administrative offices and common areas. 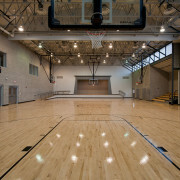 The work was completed in three phases allowing the club to continue in full operation during construction. 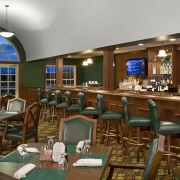 The 19th hole bar shown in the upper right corner above was a dairy Barn hayloft prior to construction. 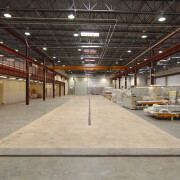 Structural Engineer: Structural Concepts, Inc.
B.M. 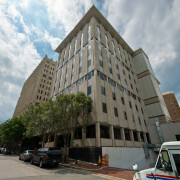 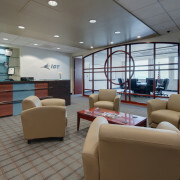 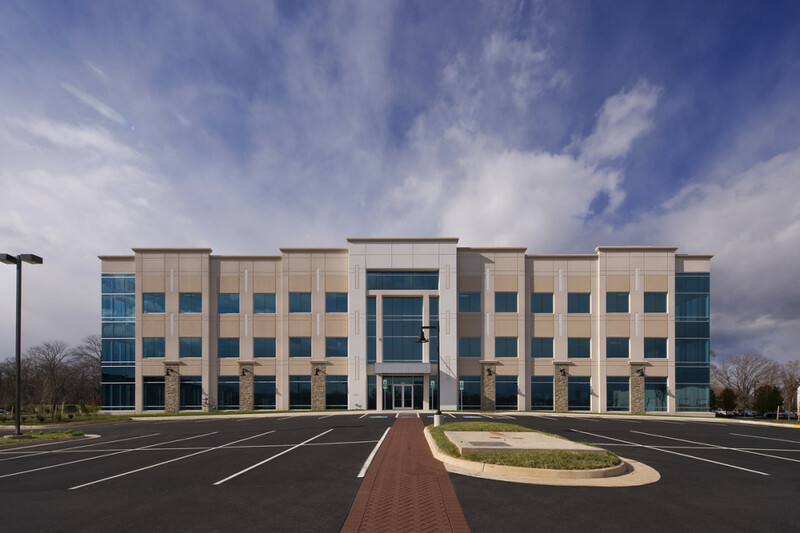 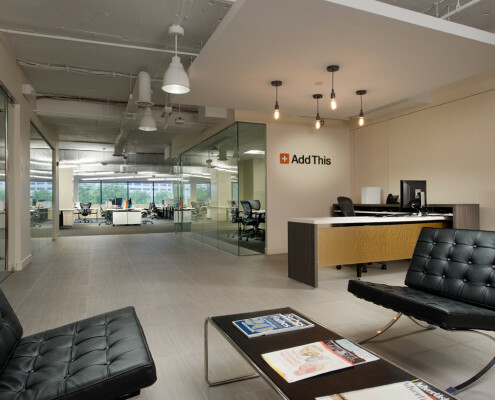 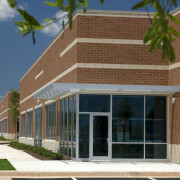 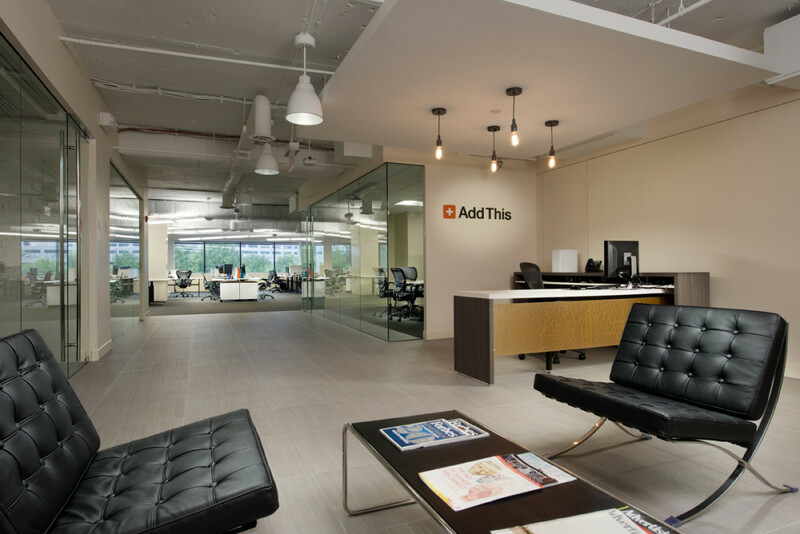 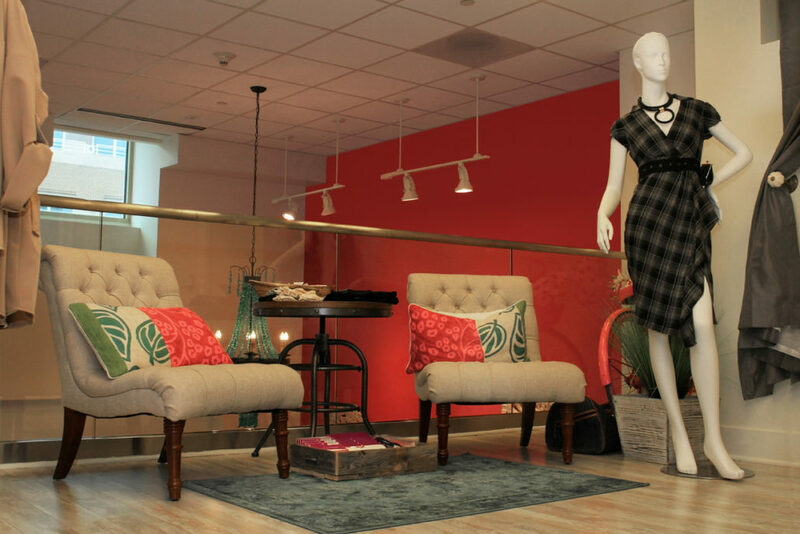 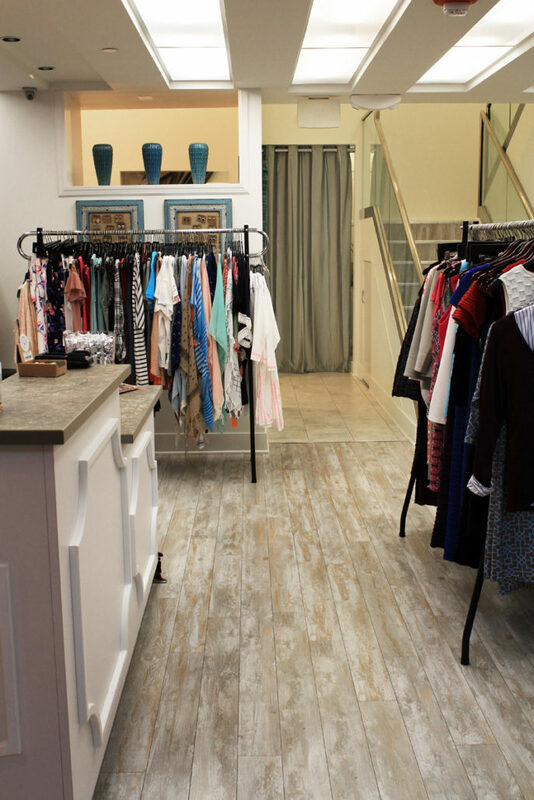 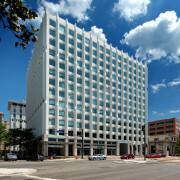 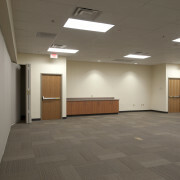 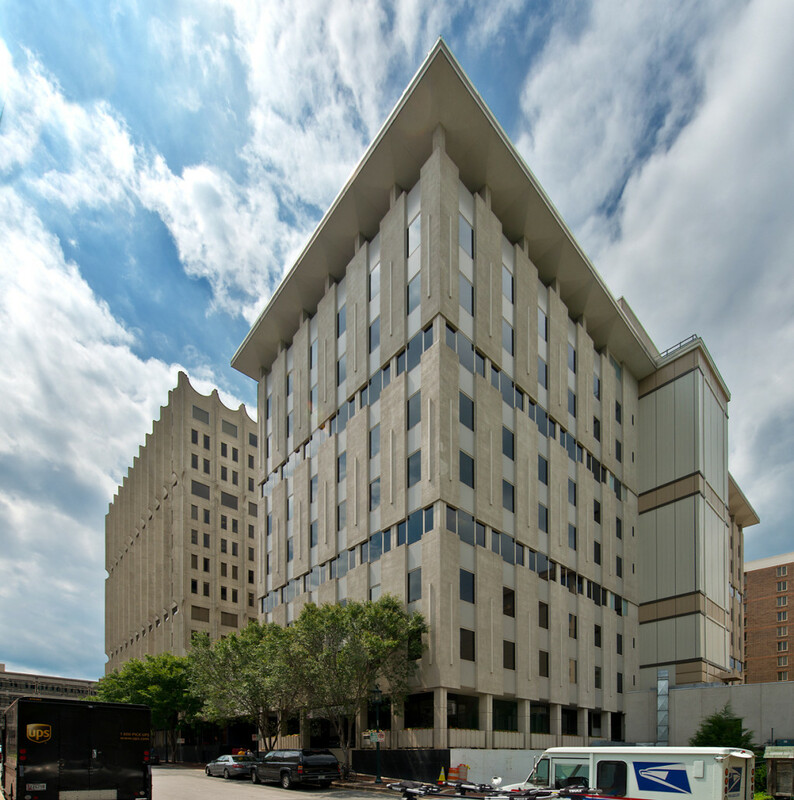 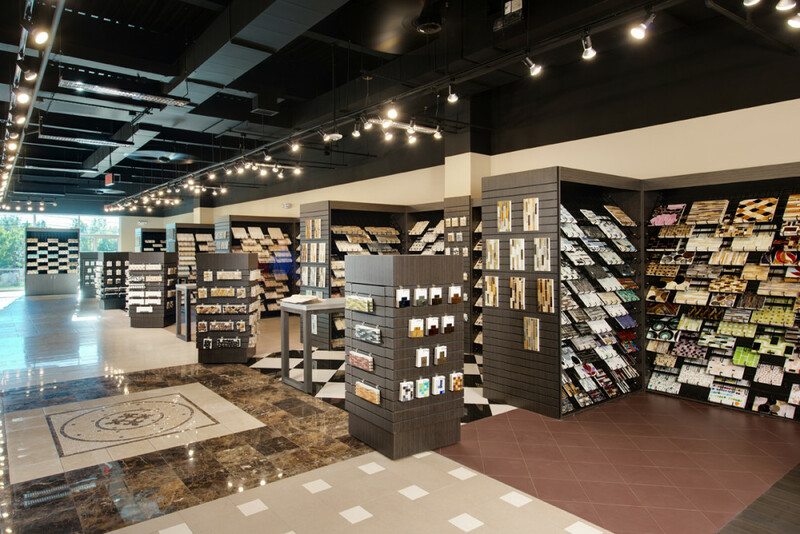 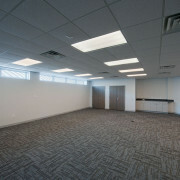 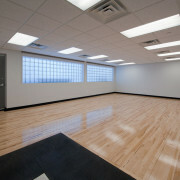 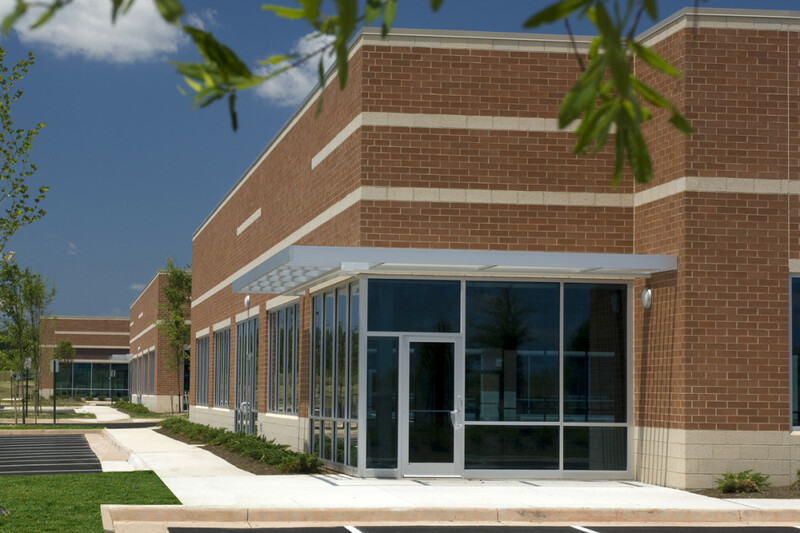 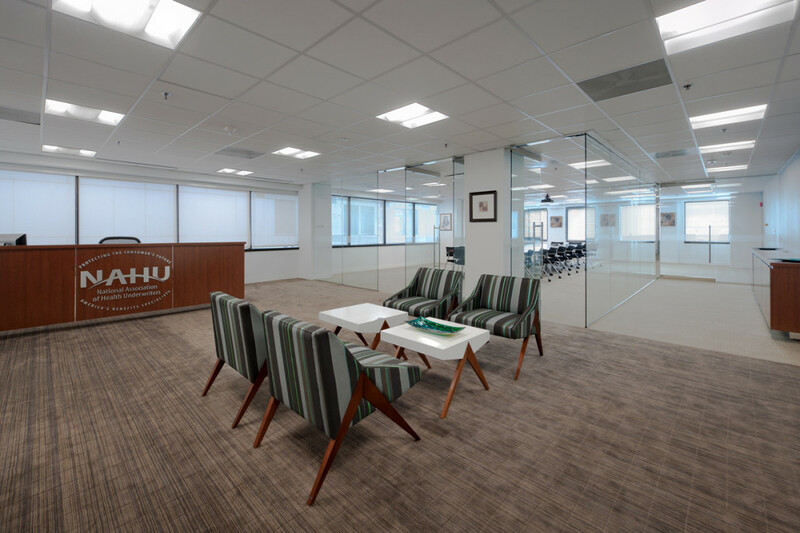 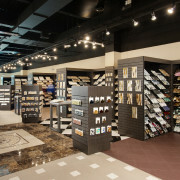 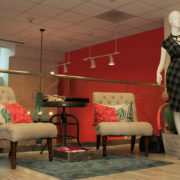 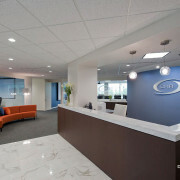 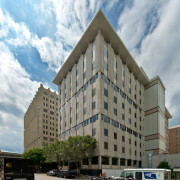 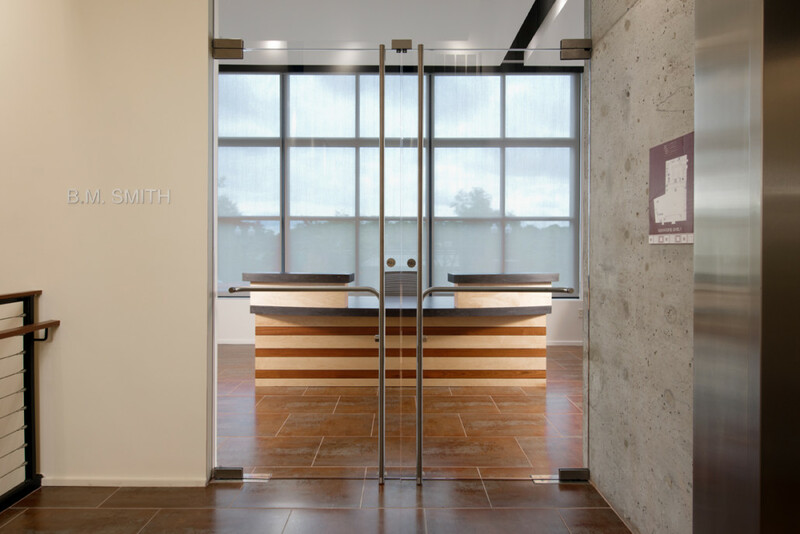 Smith is a 5,700 SF tenant fit out in Arlington. 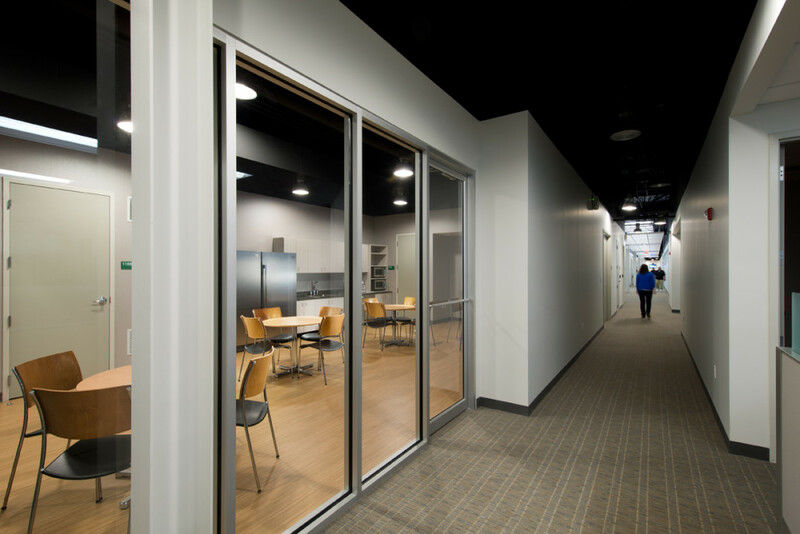 The offices are laid out around the perimeter of the space and have custom fabricated aluminum and glass sliding doors from Germany. 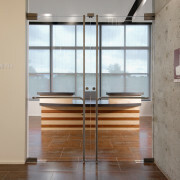 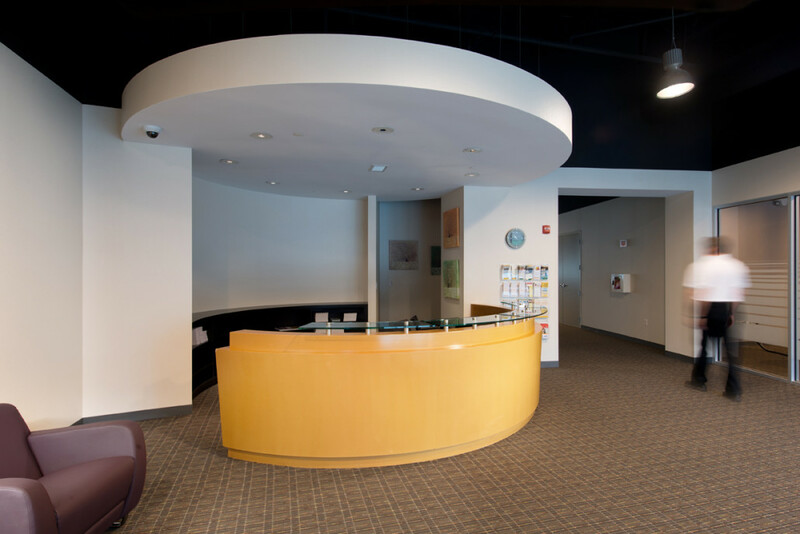 The front suite entry opens directly to a custom fabricated reception desk and the centrally located reception area/lounge has exposed 24’ ceilings with silver painted duct, and the lighting throughout is decorative linear LED pendants. 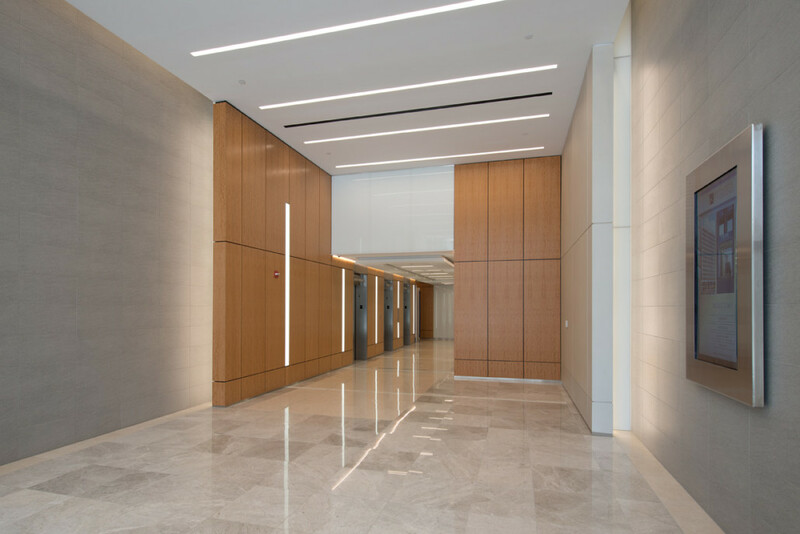 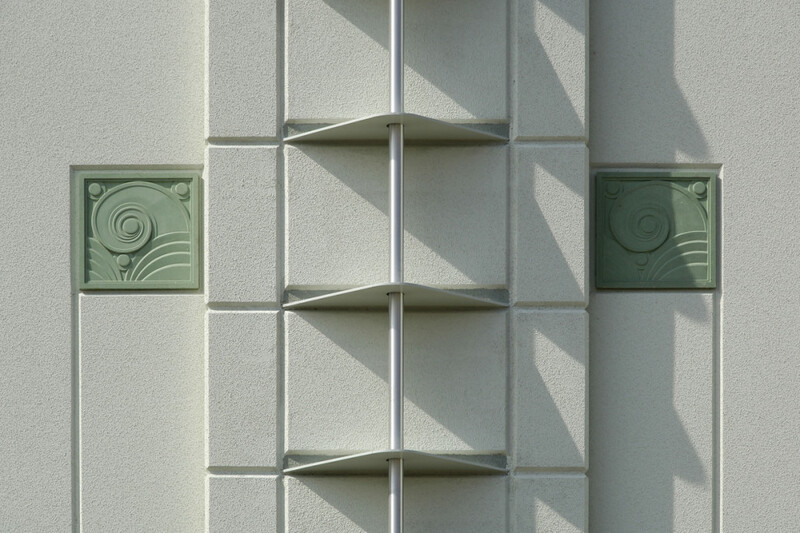 The façade renovations at Air Rights West included the removal of almost 1,000 windows, and cutting of the precast for the installation of 500 new larger windows, and recoating of the exterior precast panels with a Granyte finish. 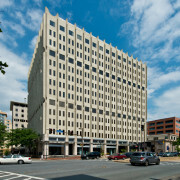 Replacement of all the windows and recoating of the precast was also performed on the East Tower. 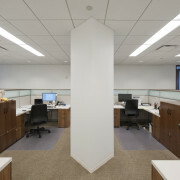 All work for the Air Rights Facade was performed off hours in occupied spaces. 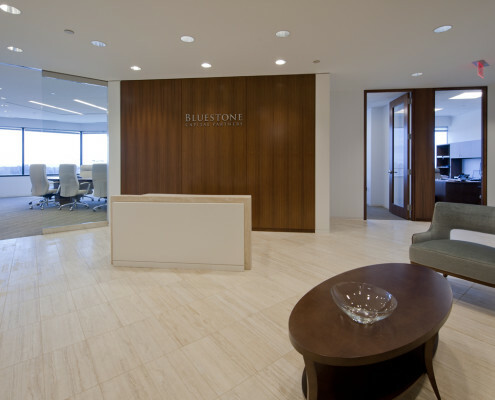 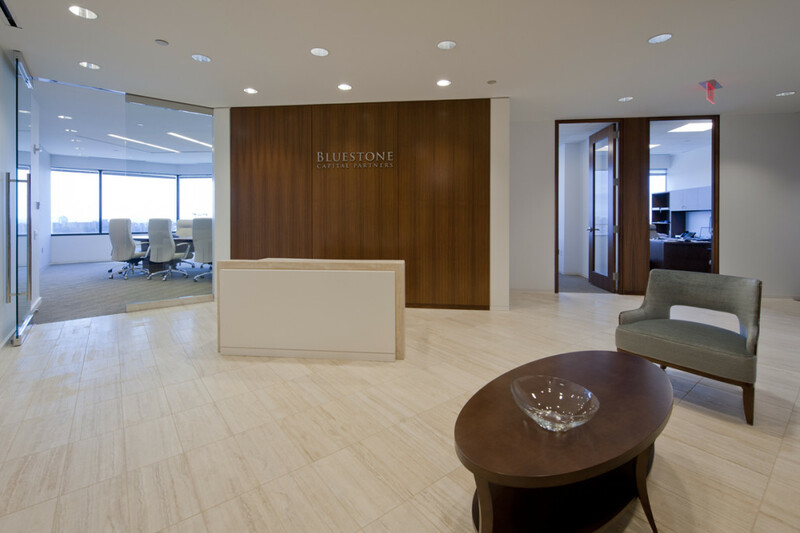 Bluestone Capital Partners is a boutique investment banking firm delivering financial advice throughout the every phase of company development. 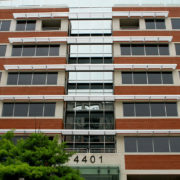 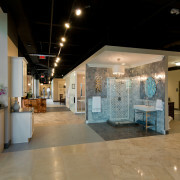 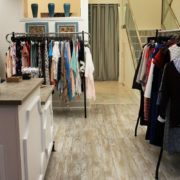 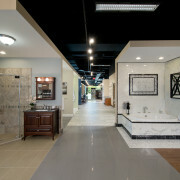 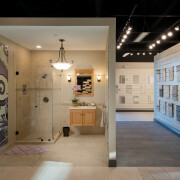 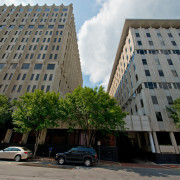 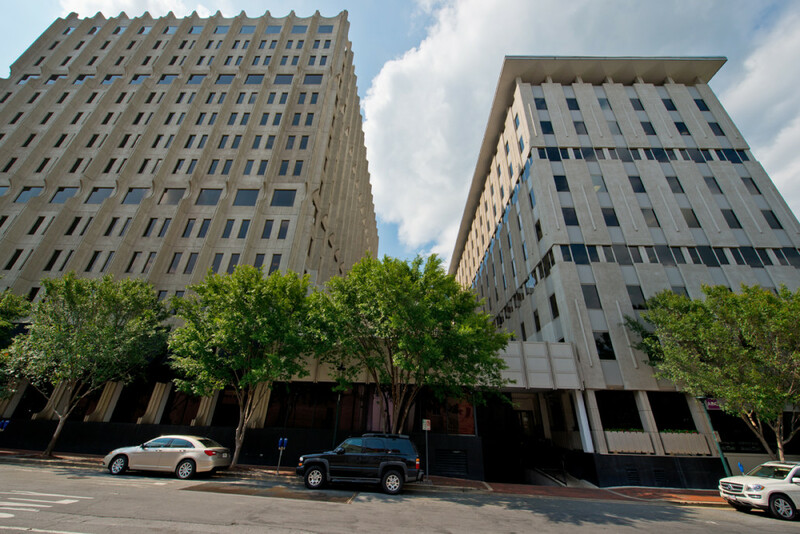 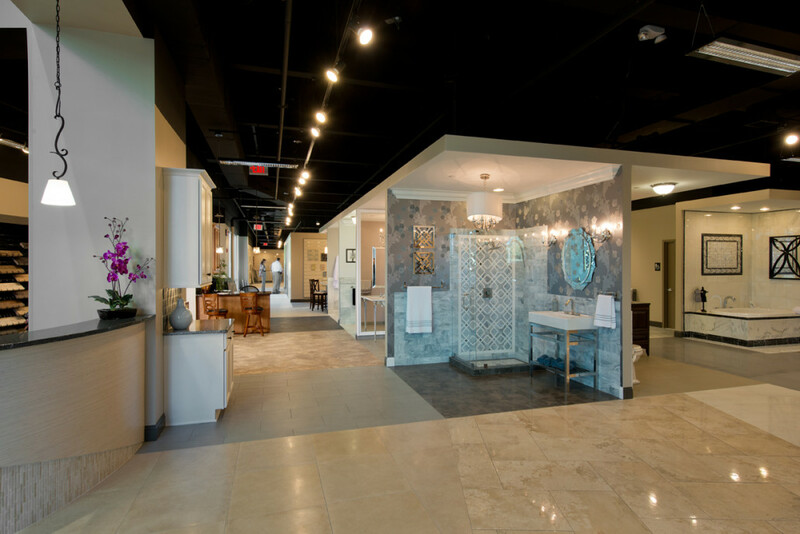 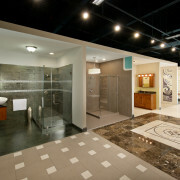 Located in the heart of Tyson’s Corner, the 4,500 S.F. 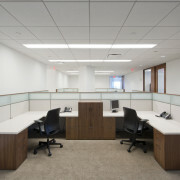 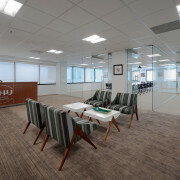 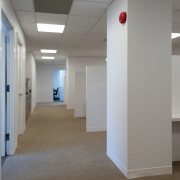 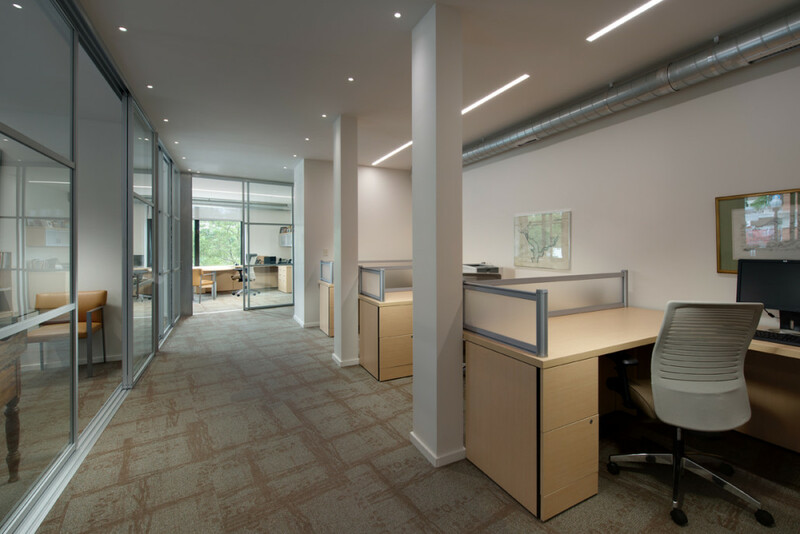 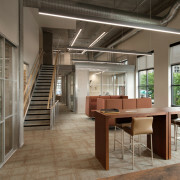 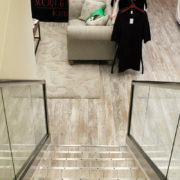 tenant fit-out incorporates clean, stone finishes and walnut wood elements, creating a unique and welcoming environment. 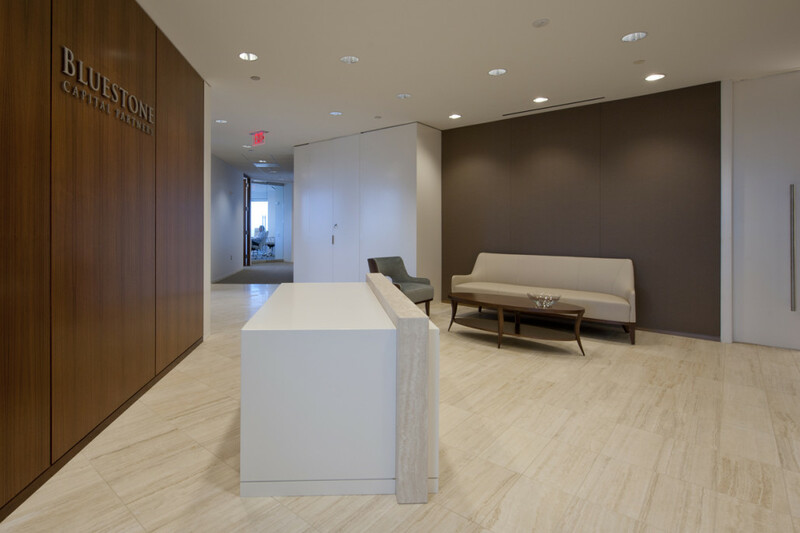 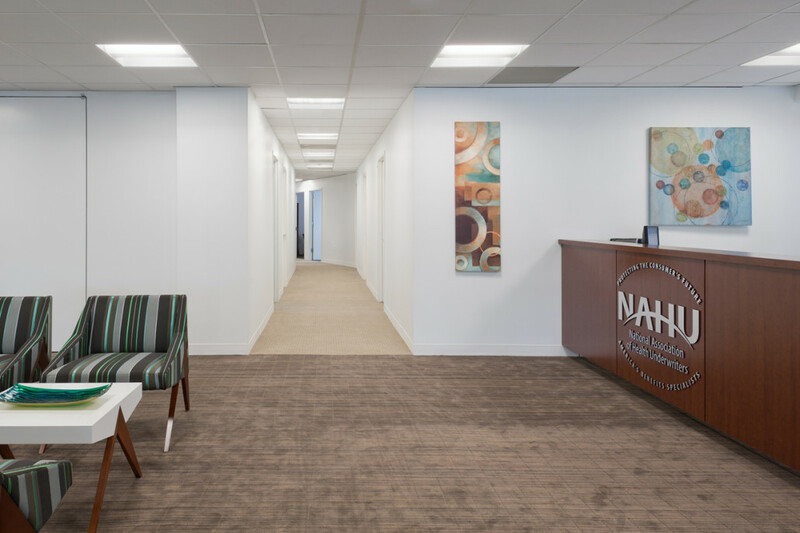 The marble reception area tile matches the credenza tops throughout the space with fabric panels and opaque finishes completing the package. 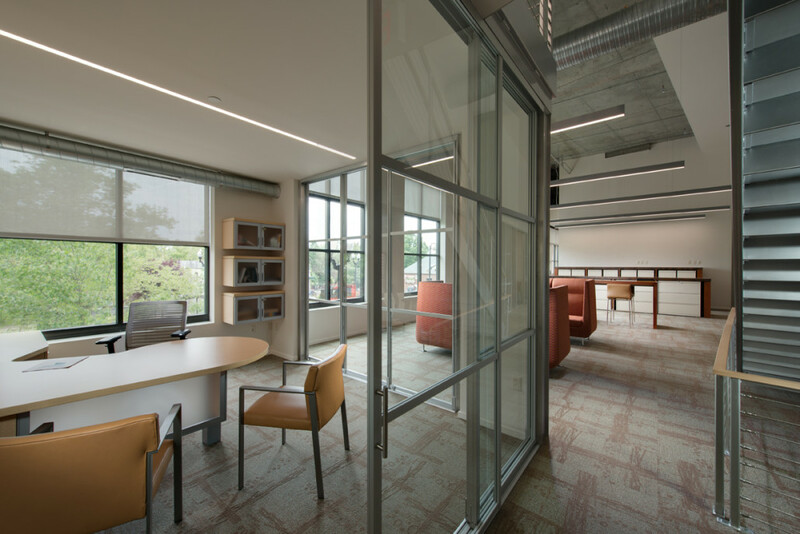 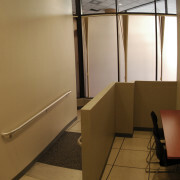 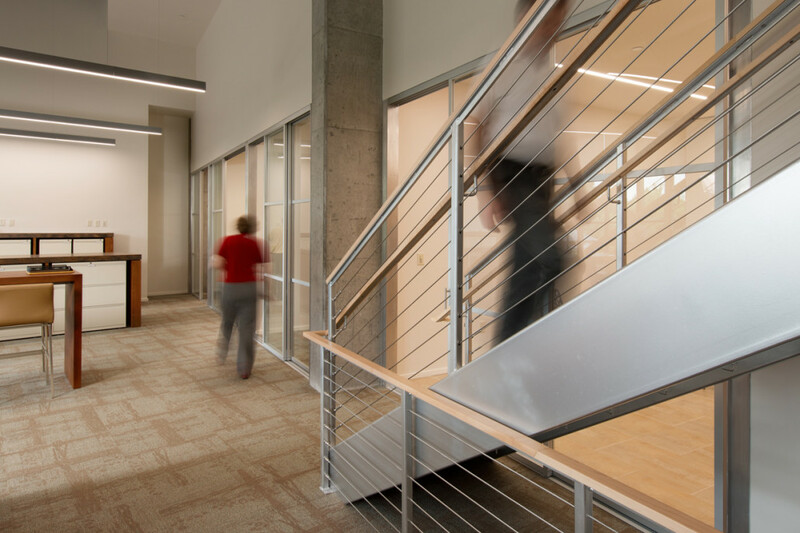 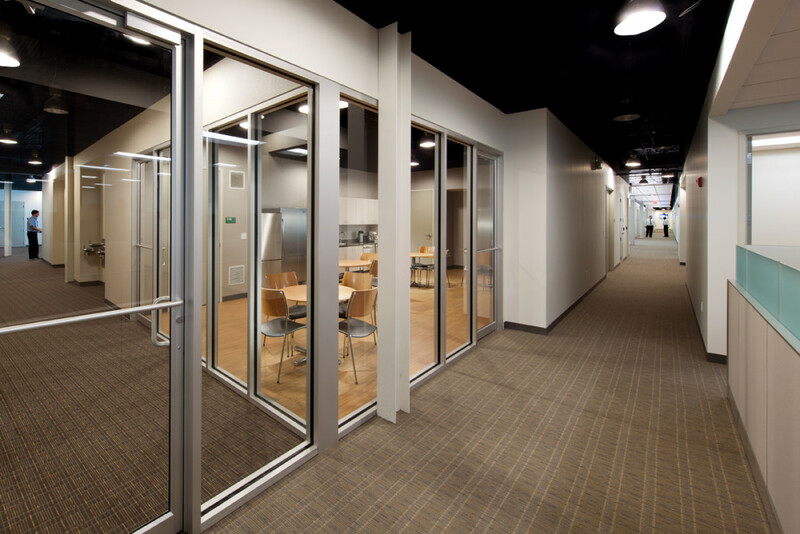 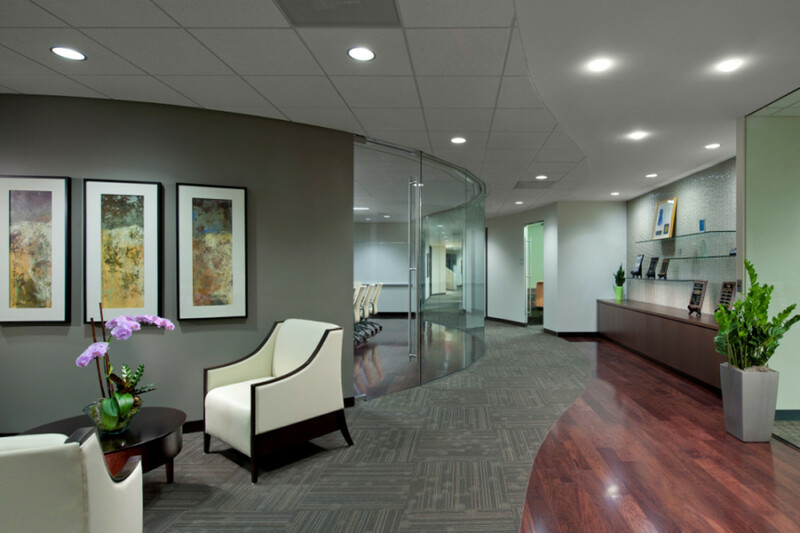 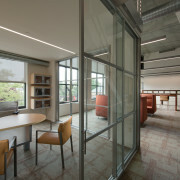 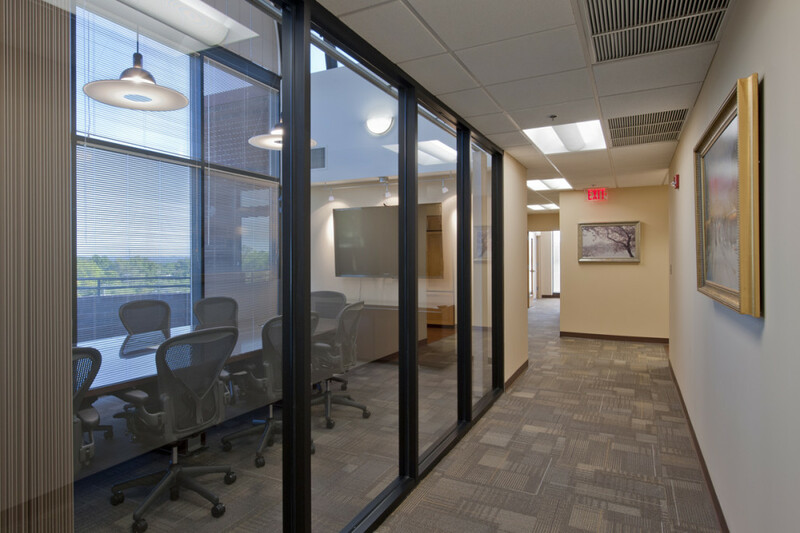 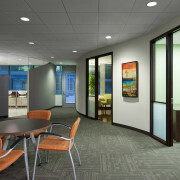 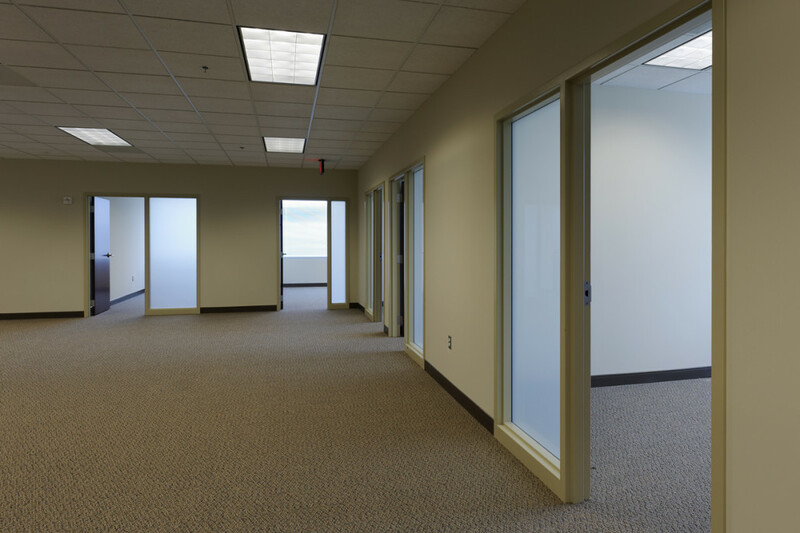 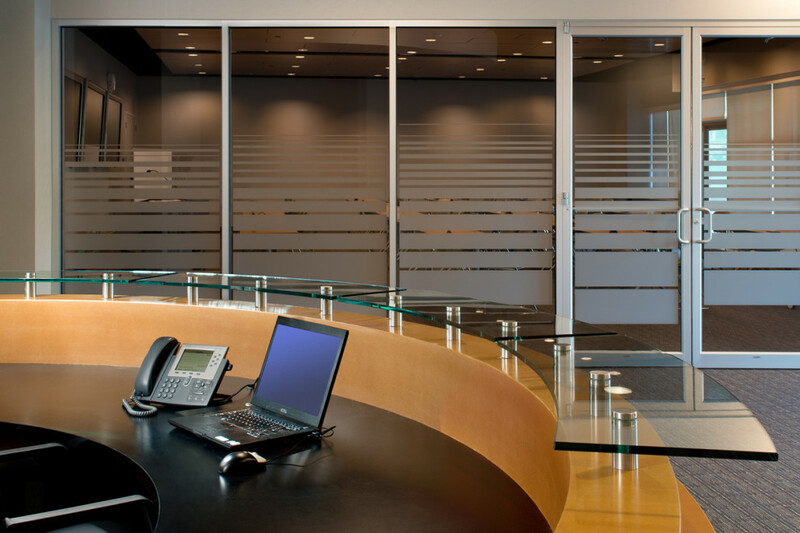 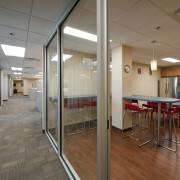 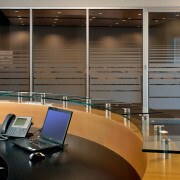 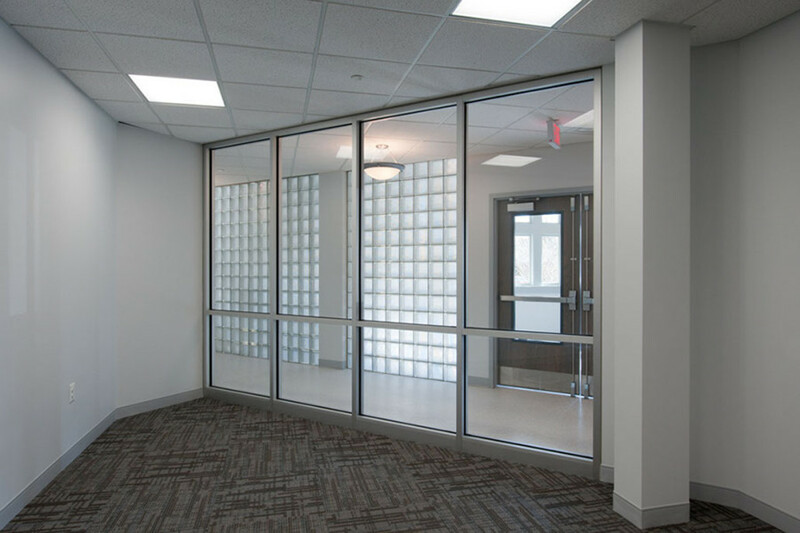 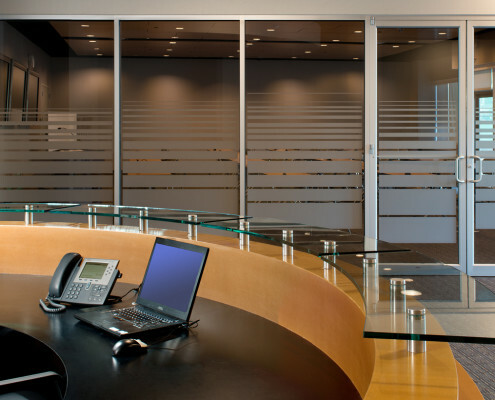 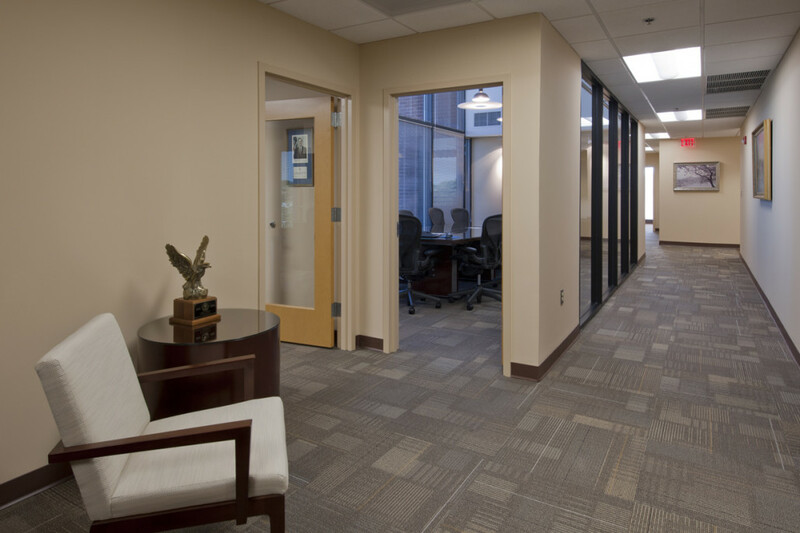 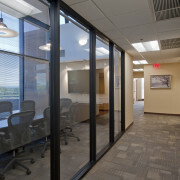 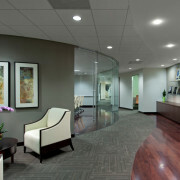 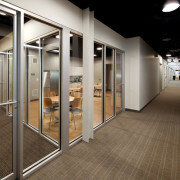 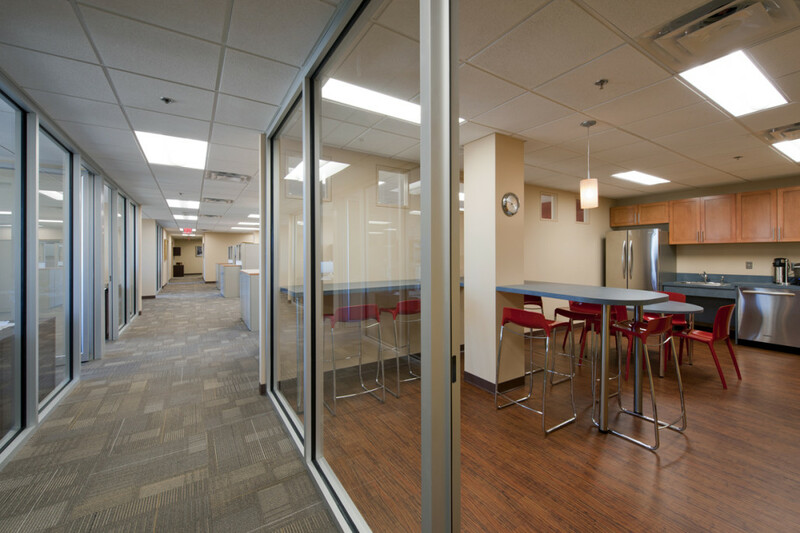 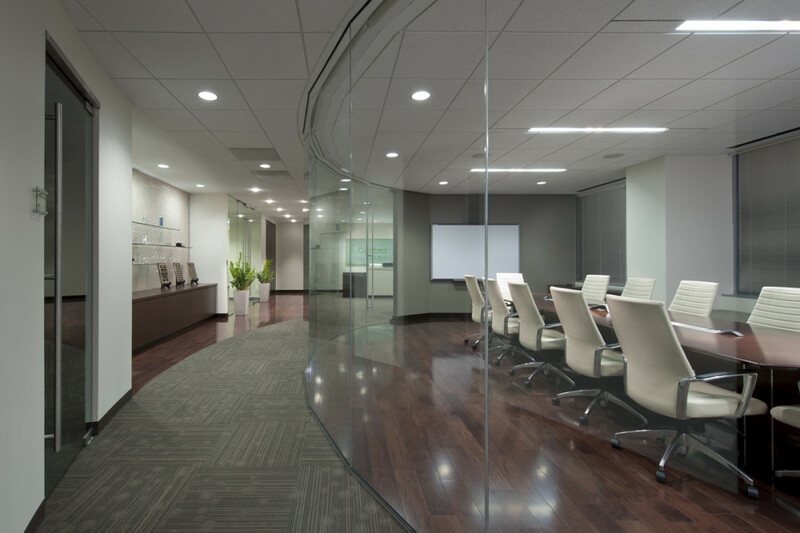 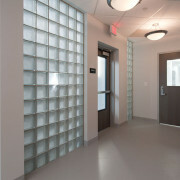 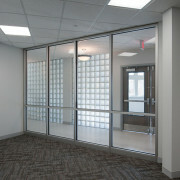 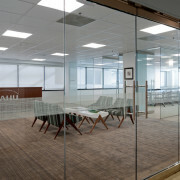 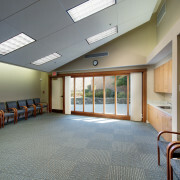 Full height glass partitions and doors were used to maximize natural light create an open feel.